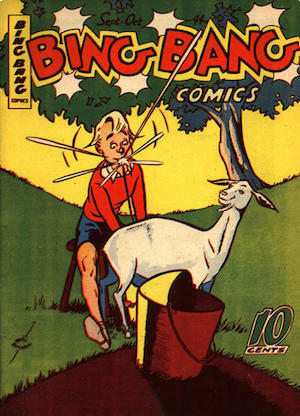 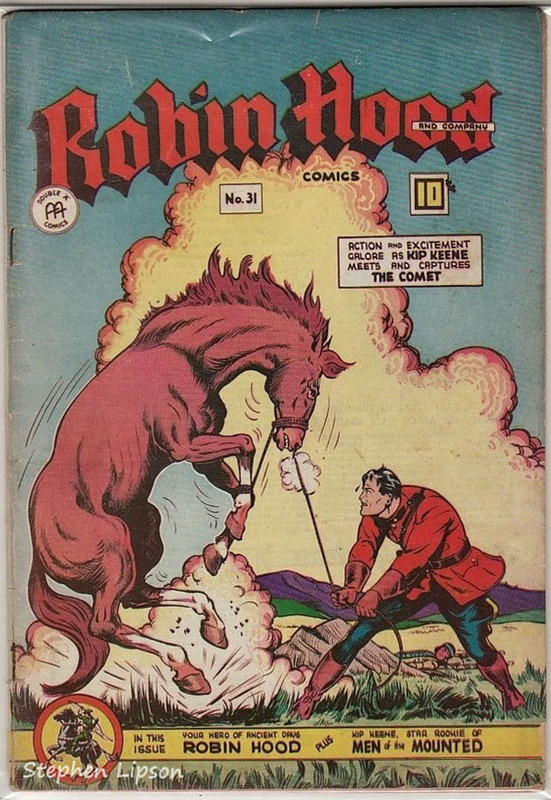 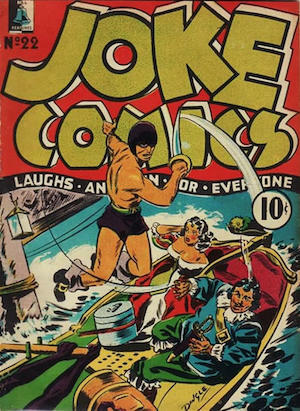 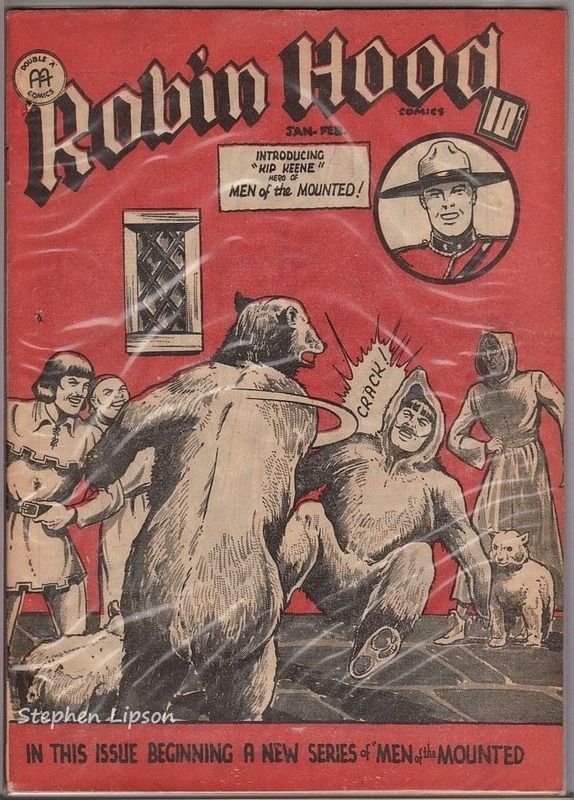 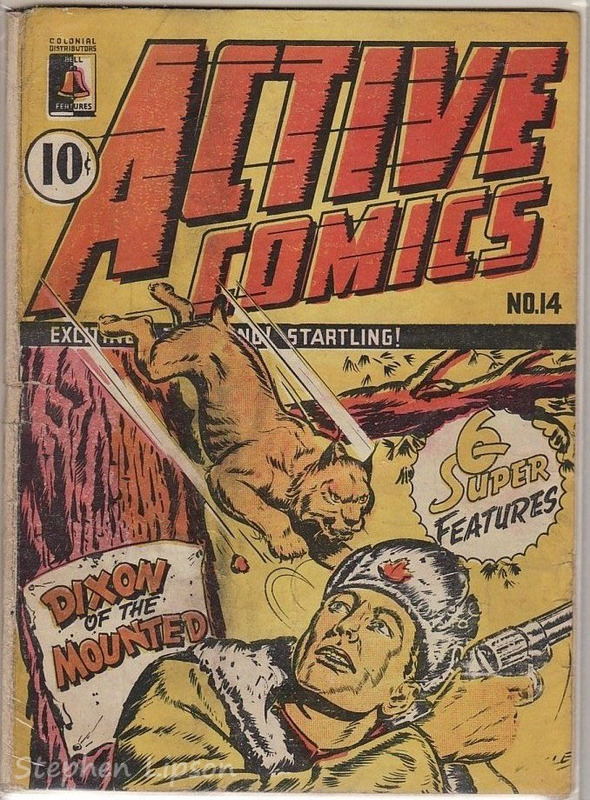 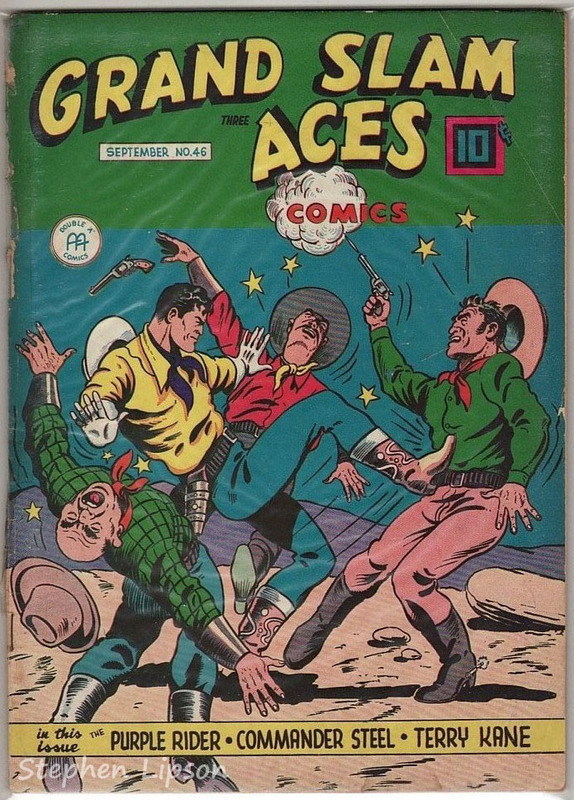 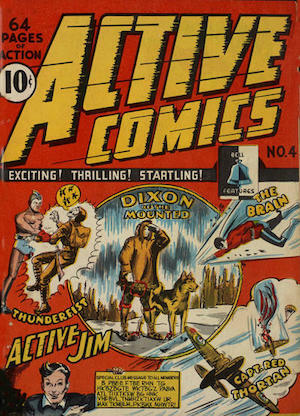 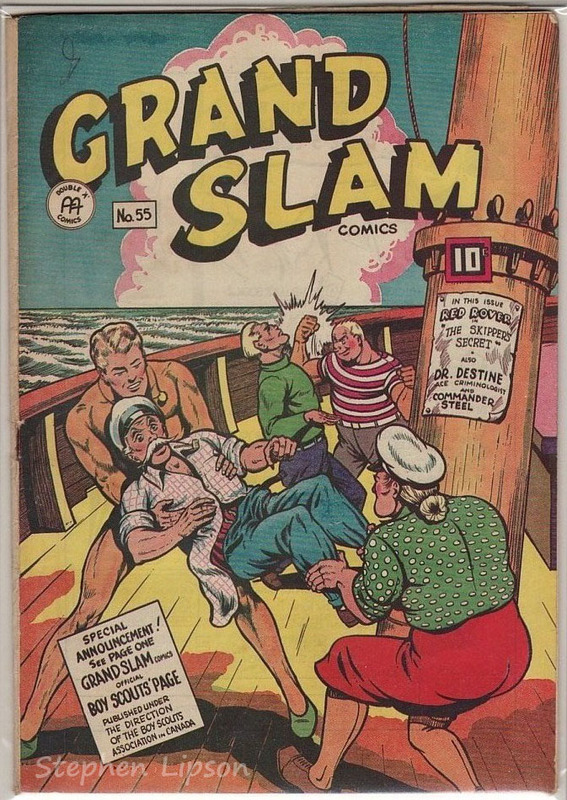 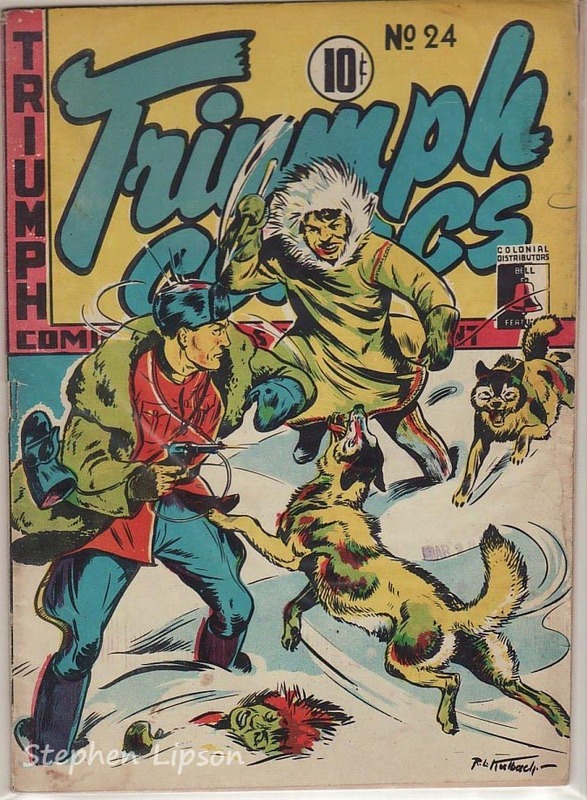 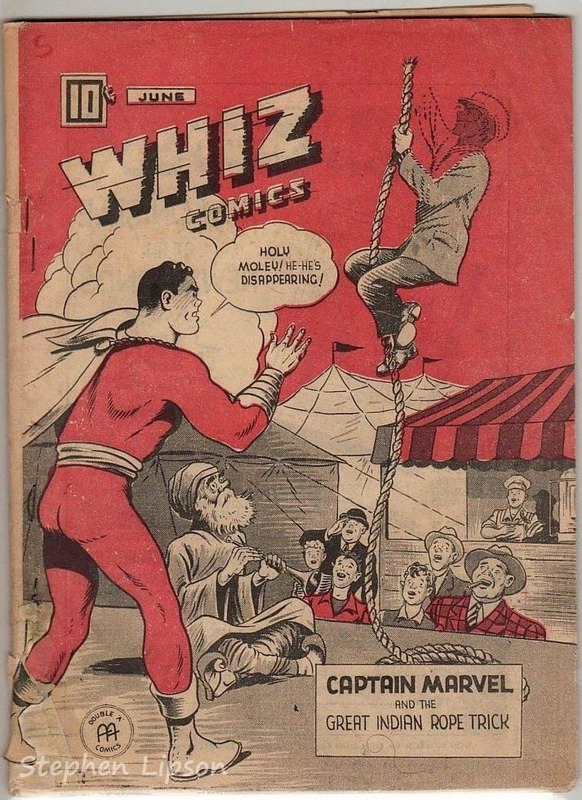 Not many people are aware that Canada published their own comics during the Golden Age. 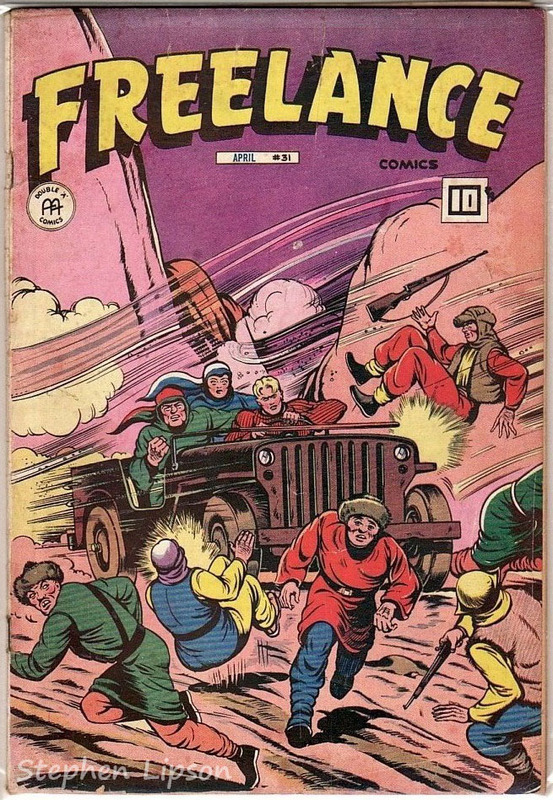 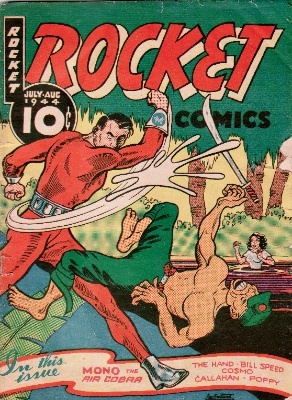 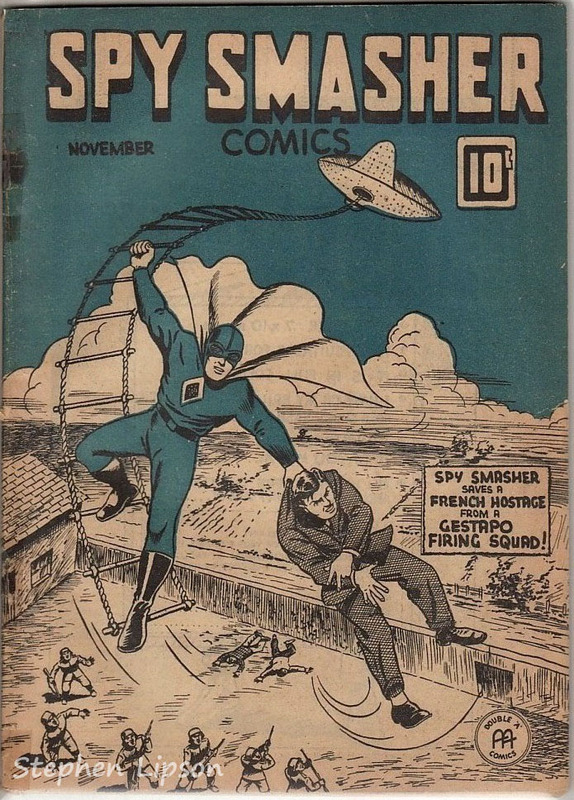 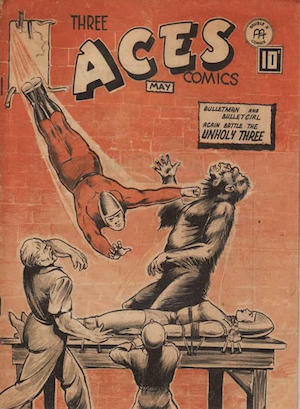 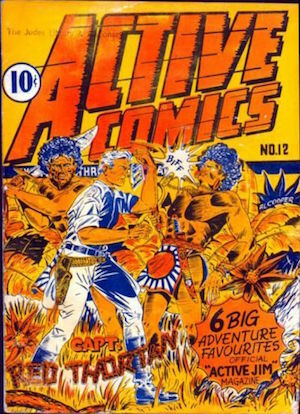 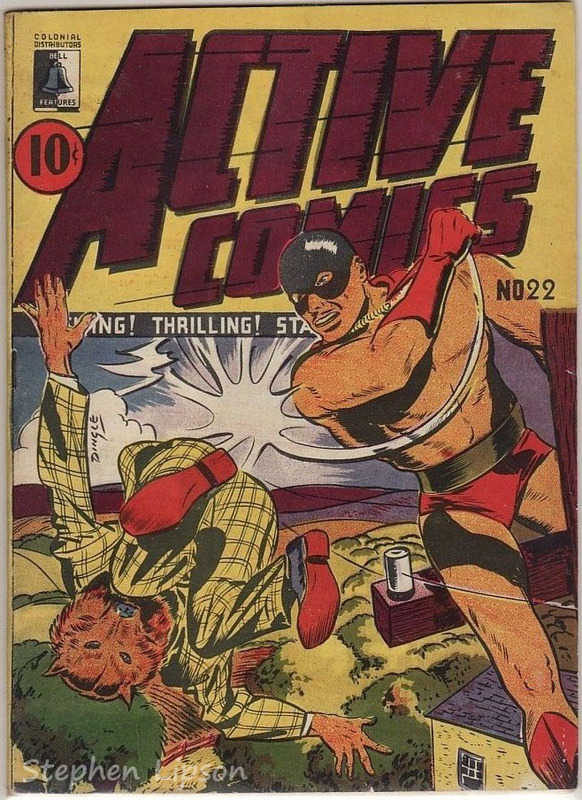 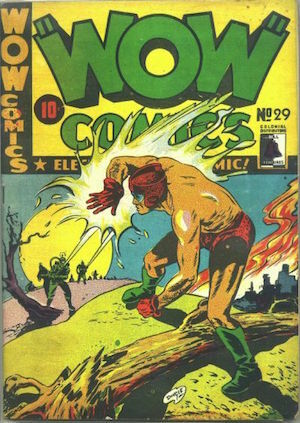 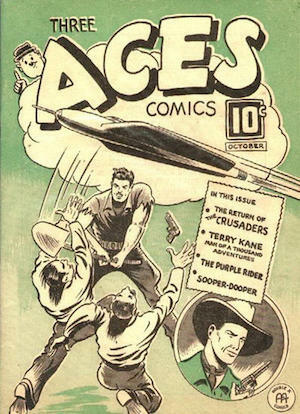 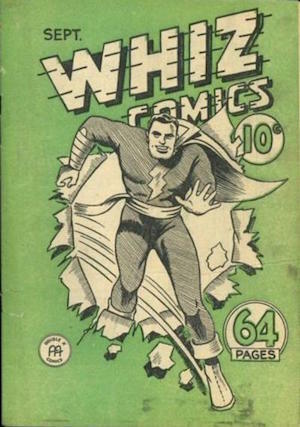 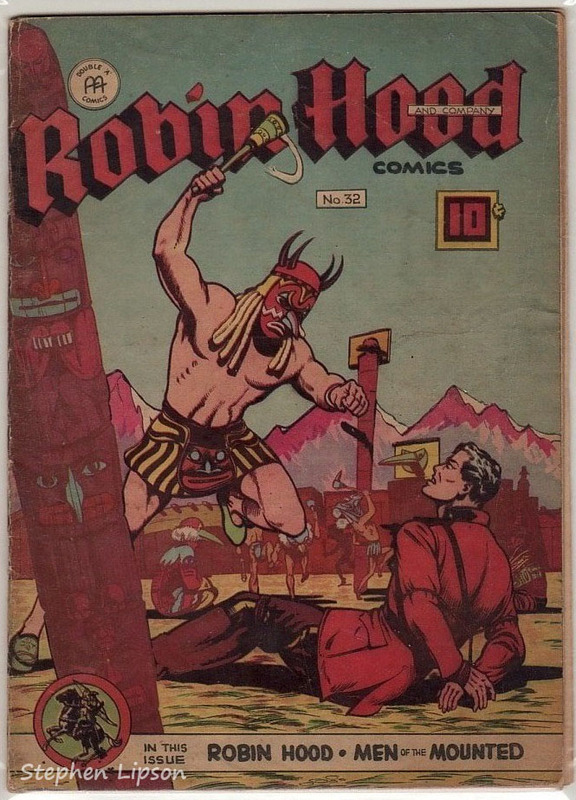 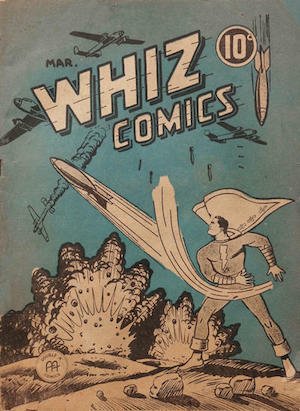 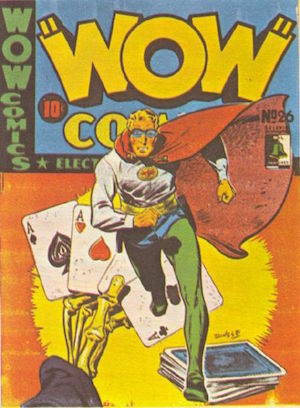 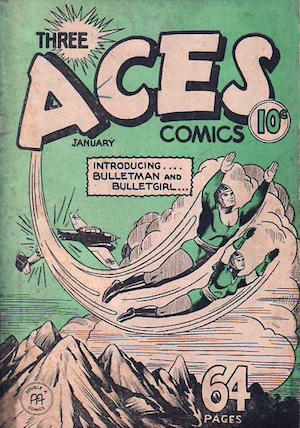 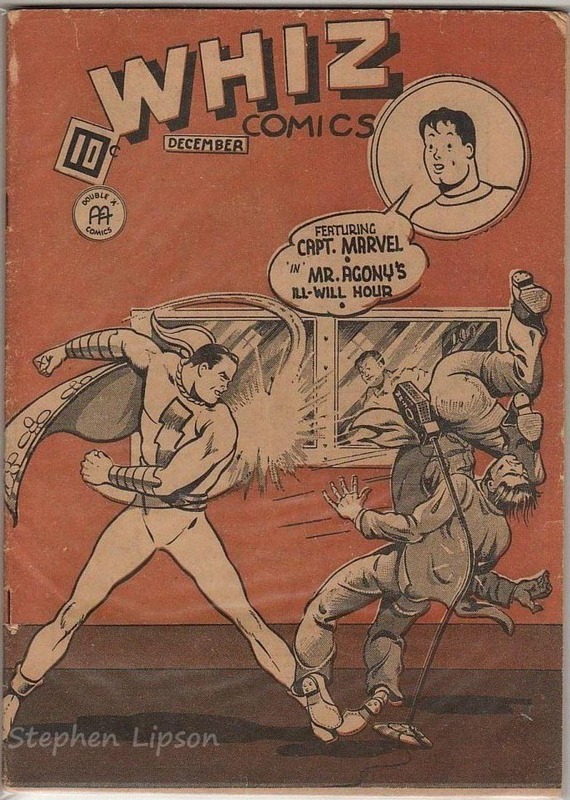 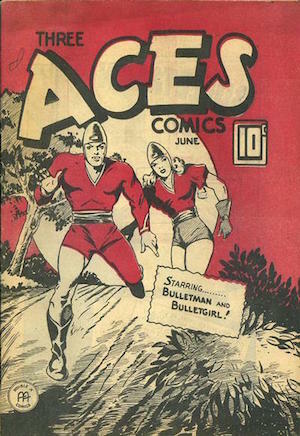 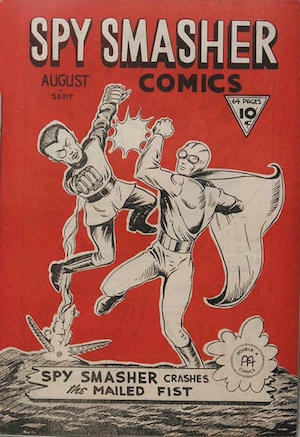 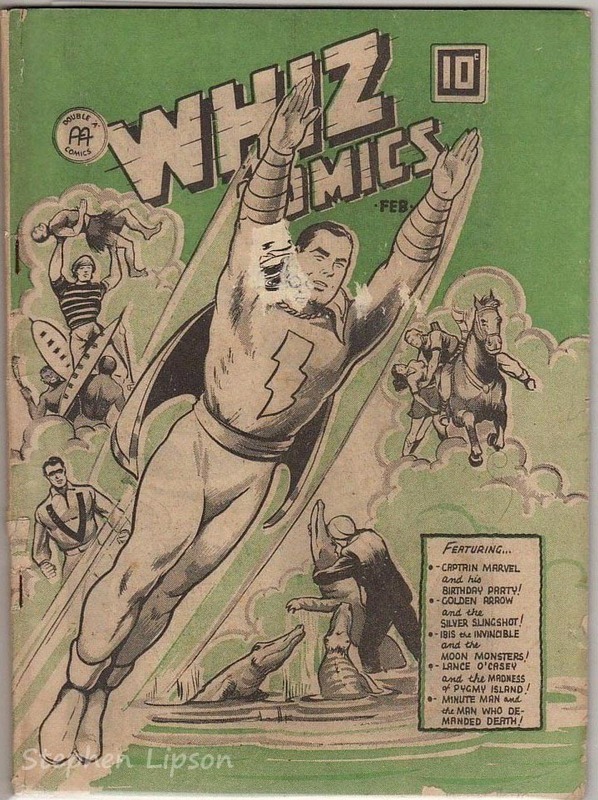 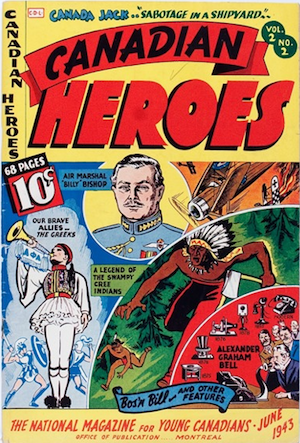 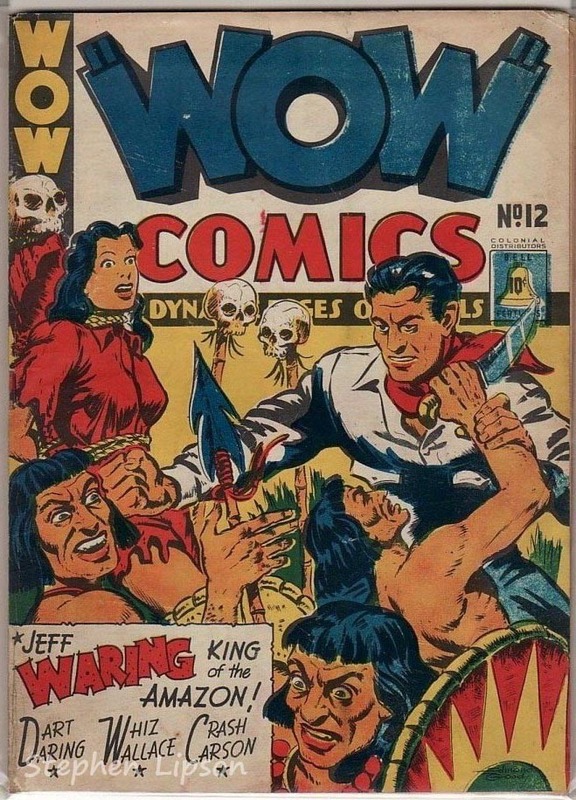 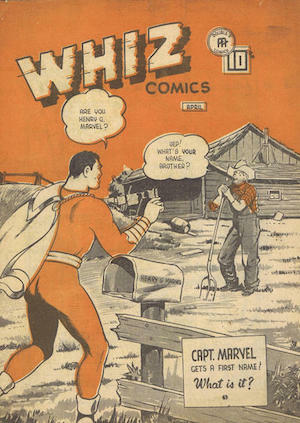 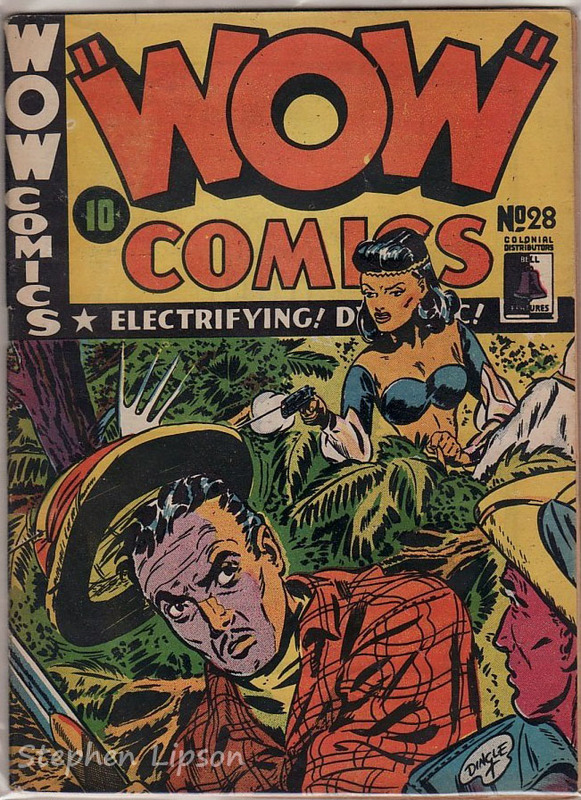 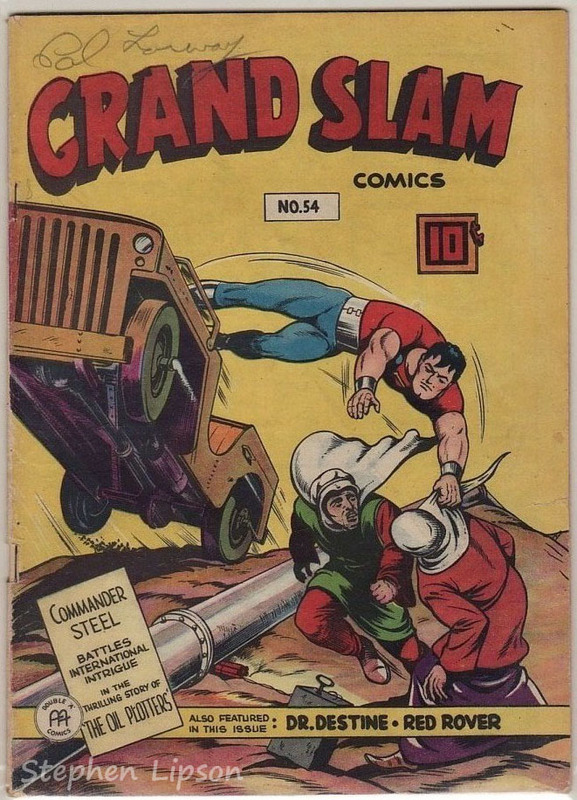 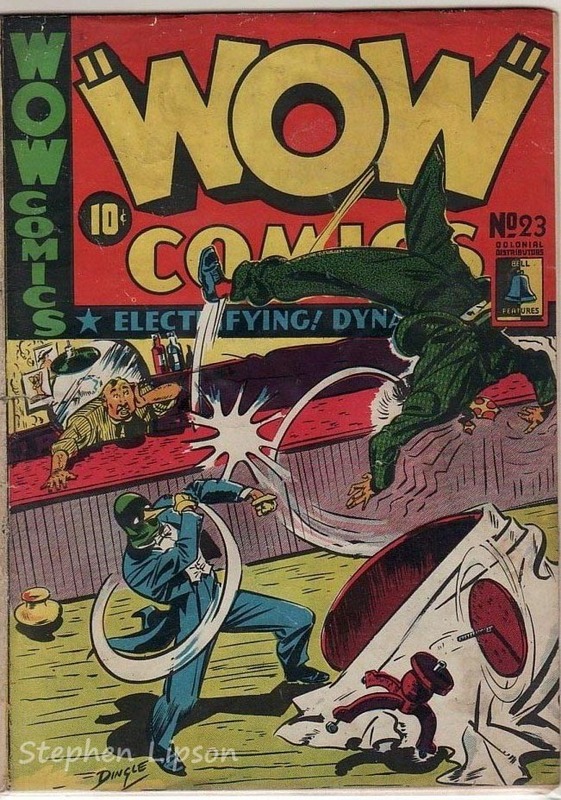 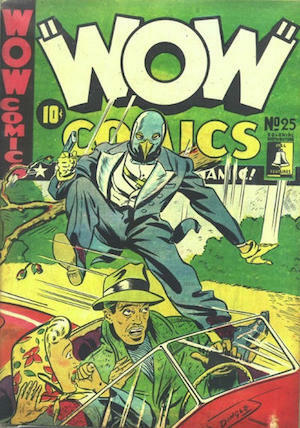 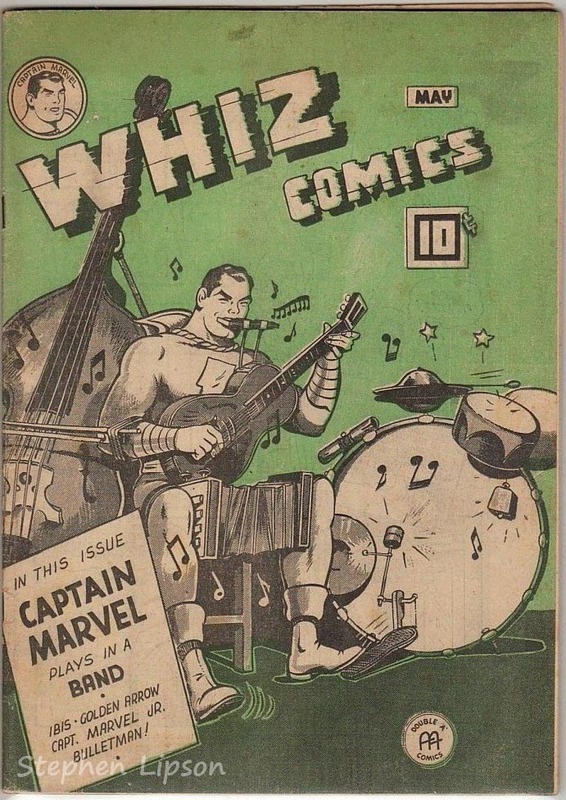 These wartime era comics hosted a stable of superheroes that where both analogous and indigenous to Canada. 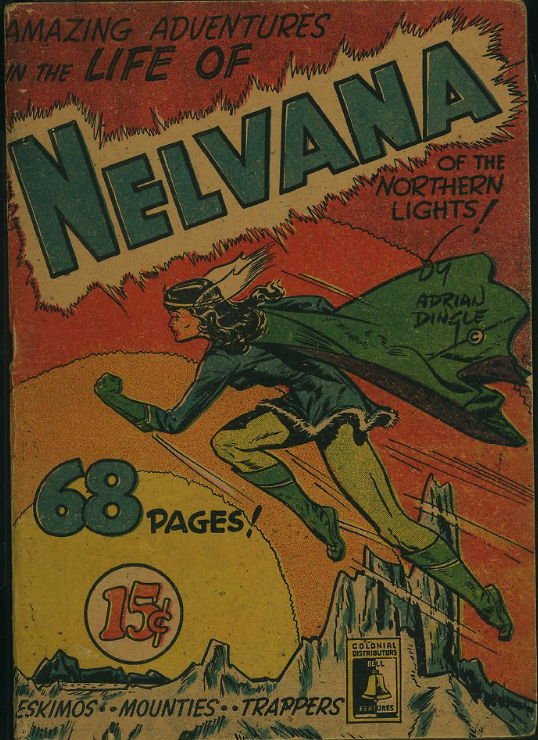 Such iconic heroes as Nelvana of the Northern Lights and her brethren spoke to Canada’s role on both the Home front and smashing the Axis abroad. 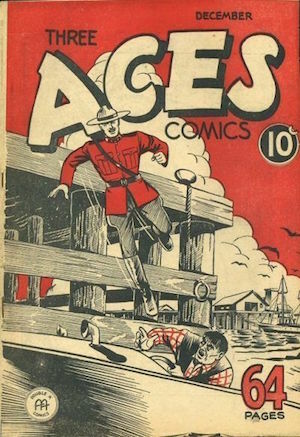 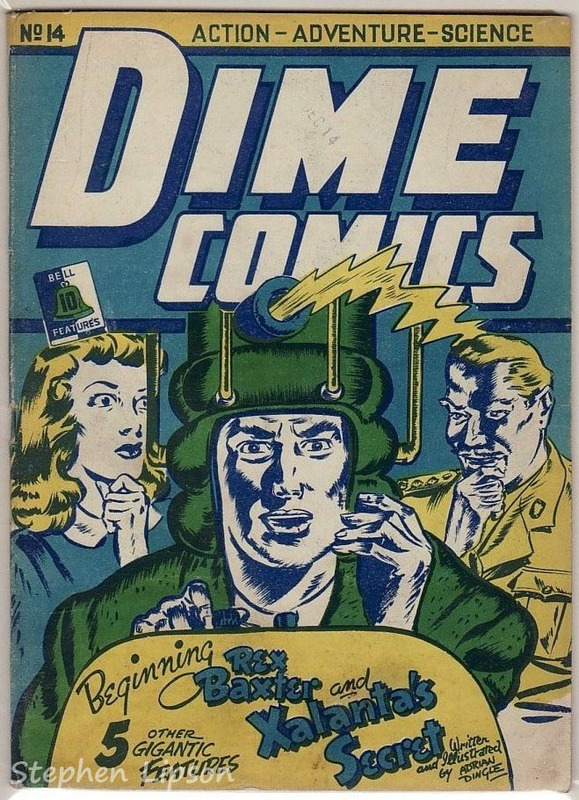 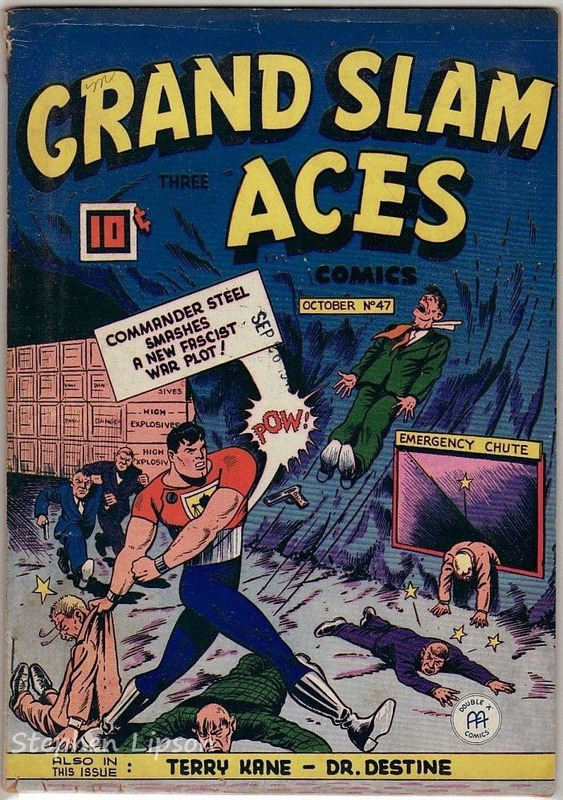 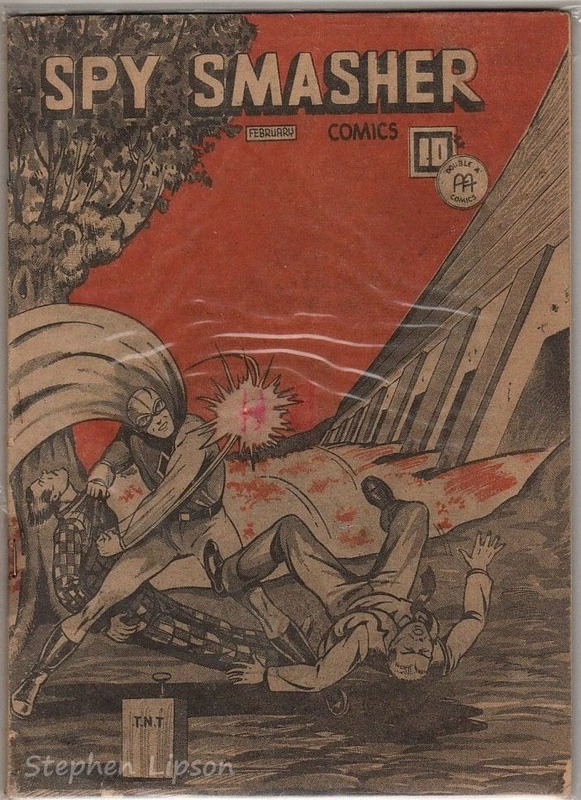 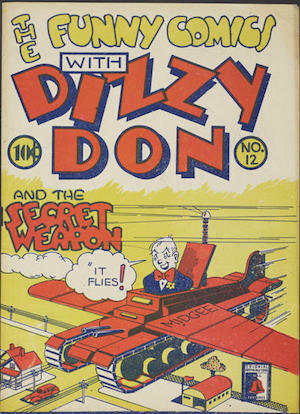 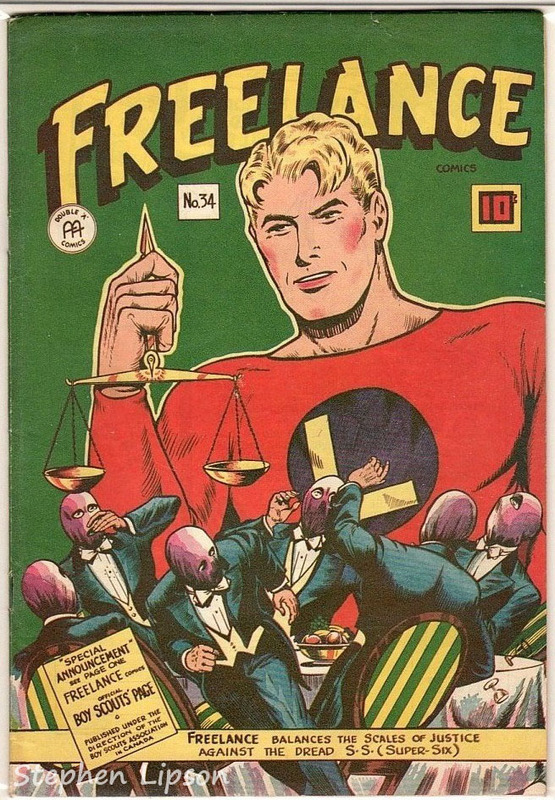 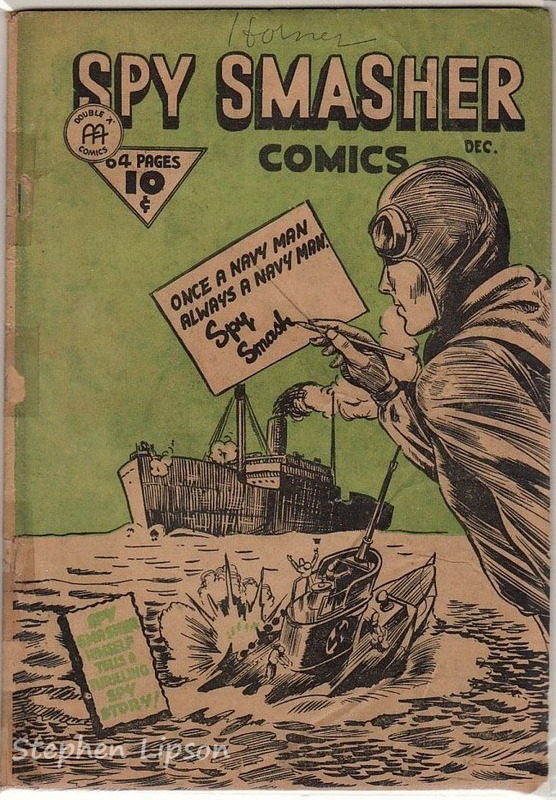 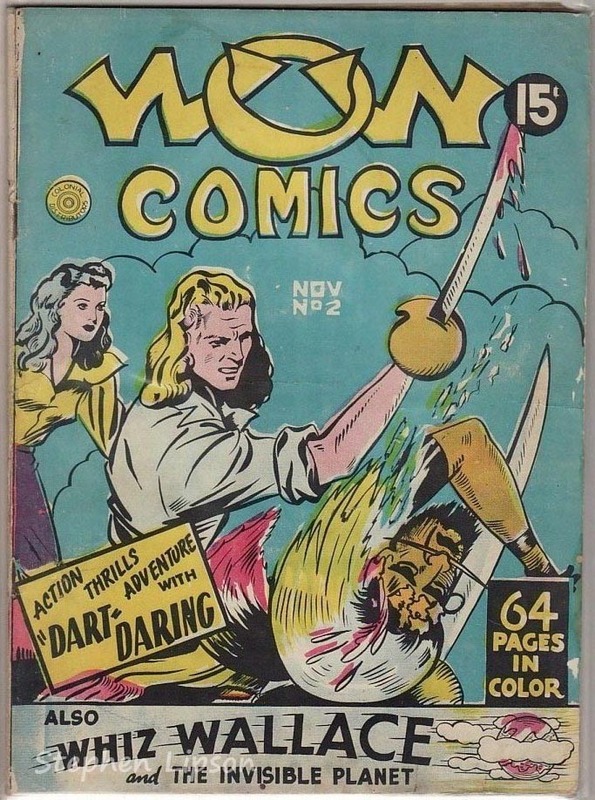 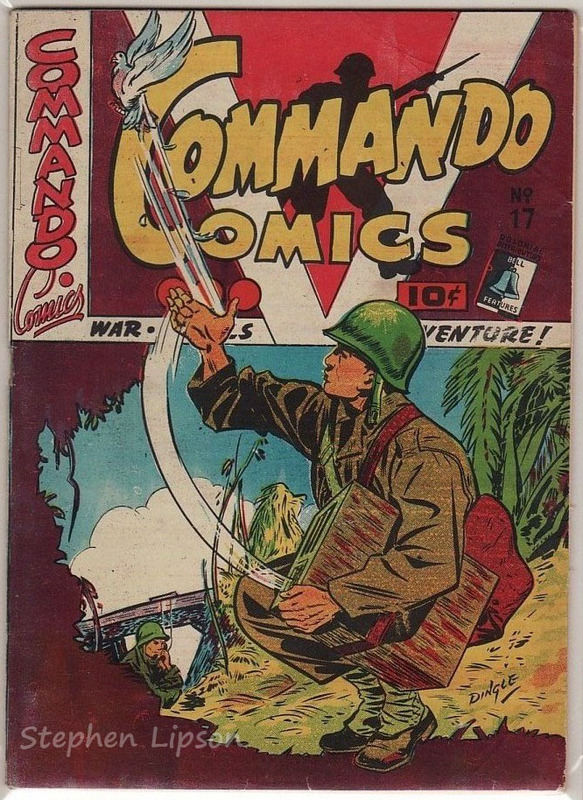 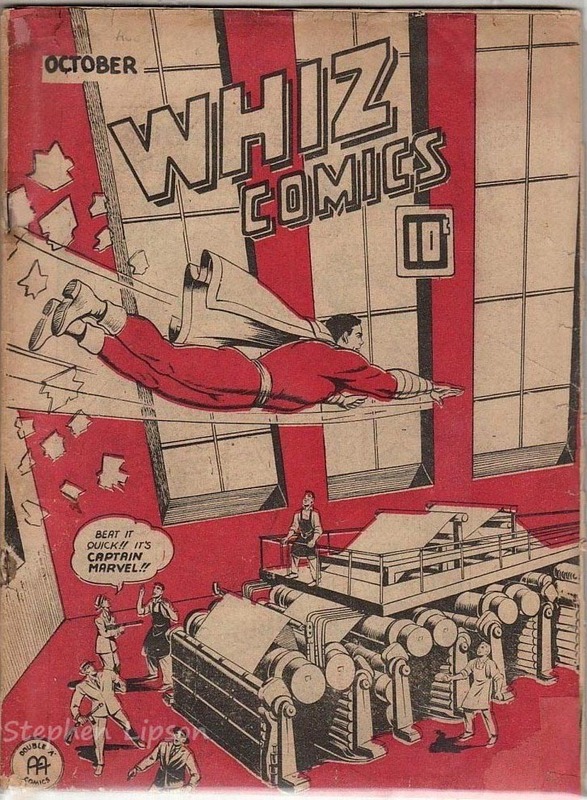 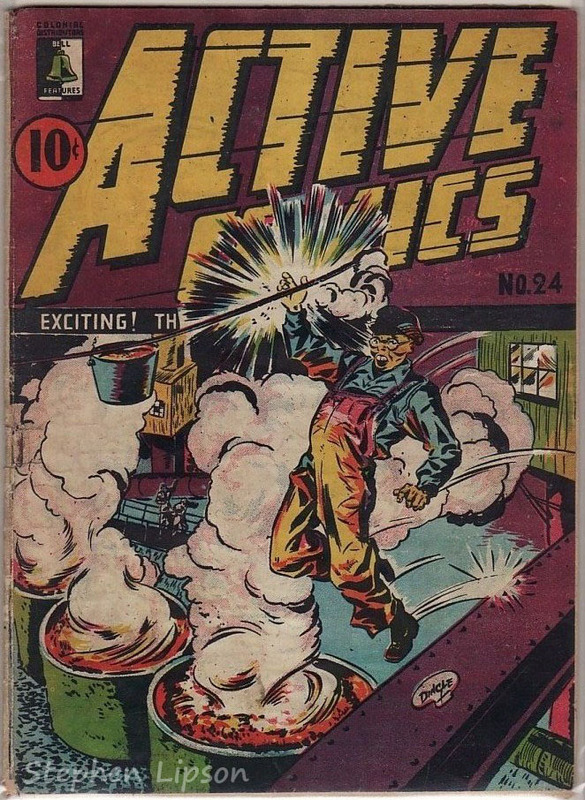 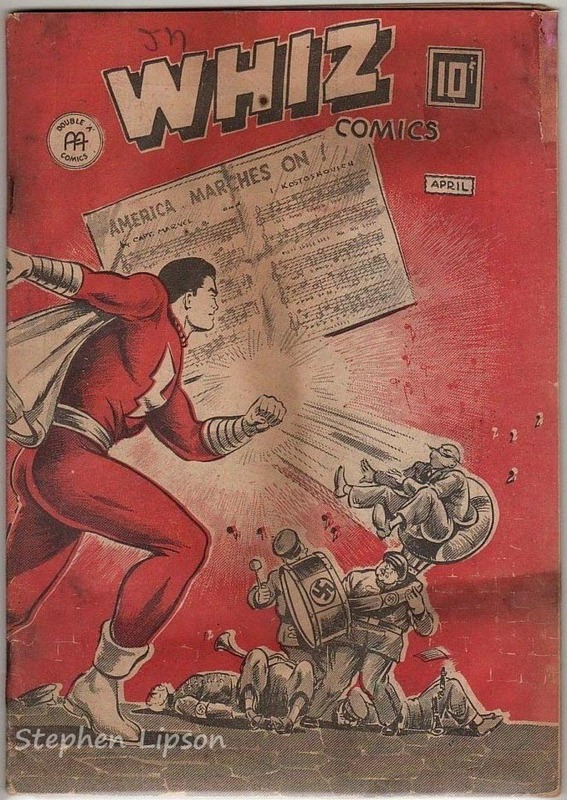 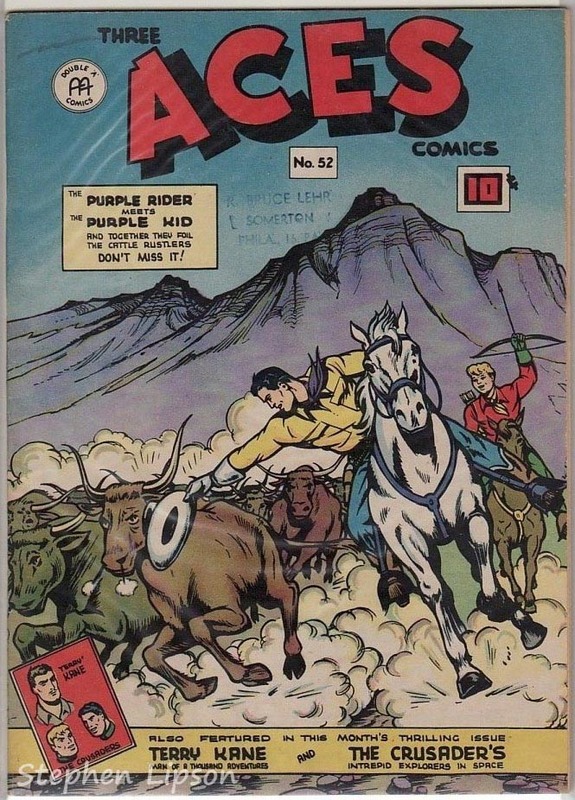 These comics were published primarily from 1941-1946, as a result of the implementation of the War Exchange Conservation Act (WECA), wherein non-essential items were prohibited for import into Canada, including pulp literature. 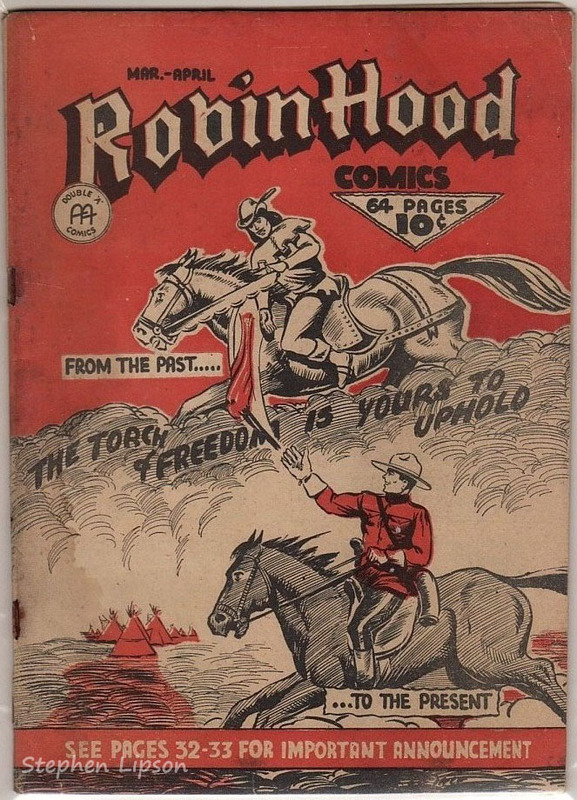 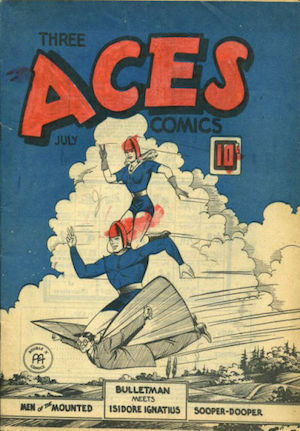 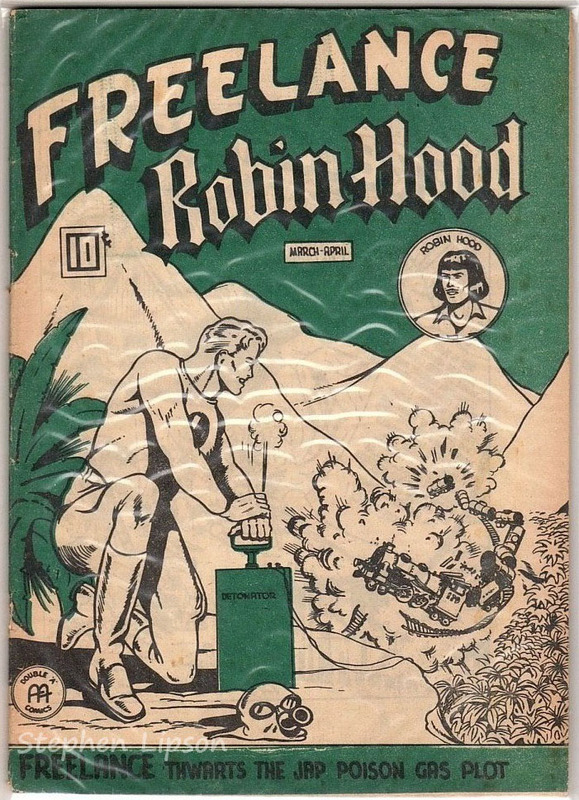 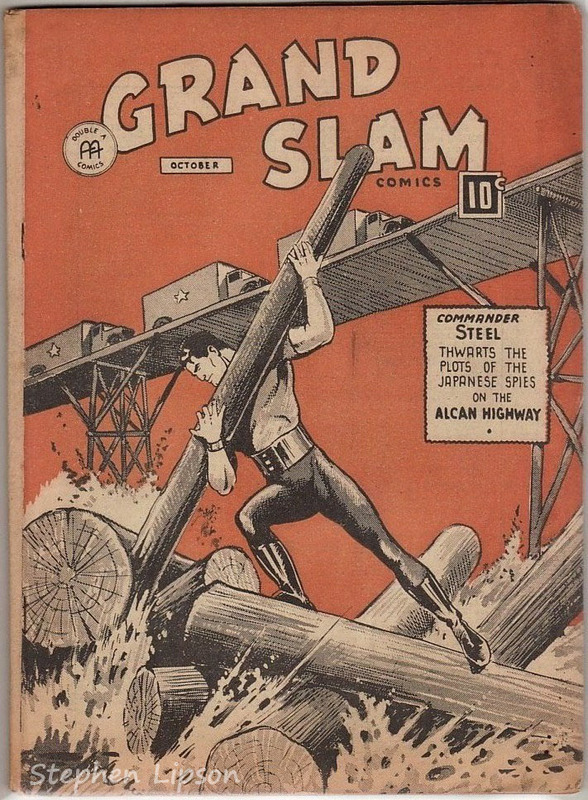 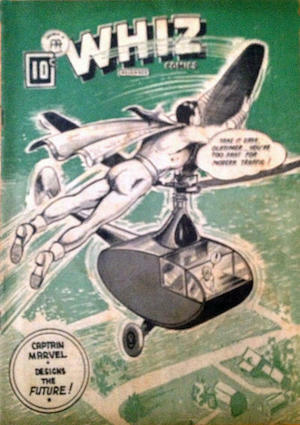 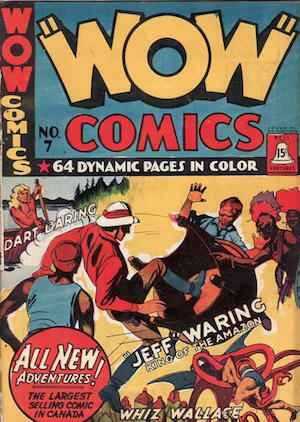 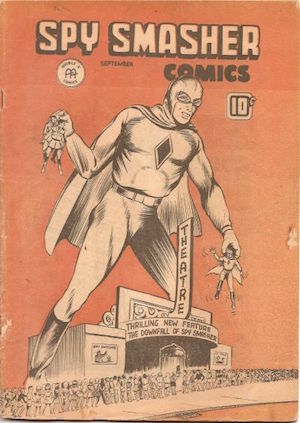 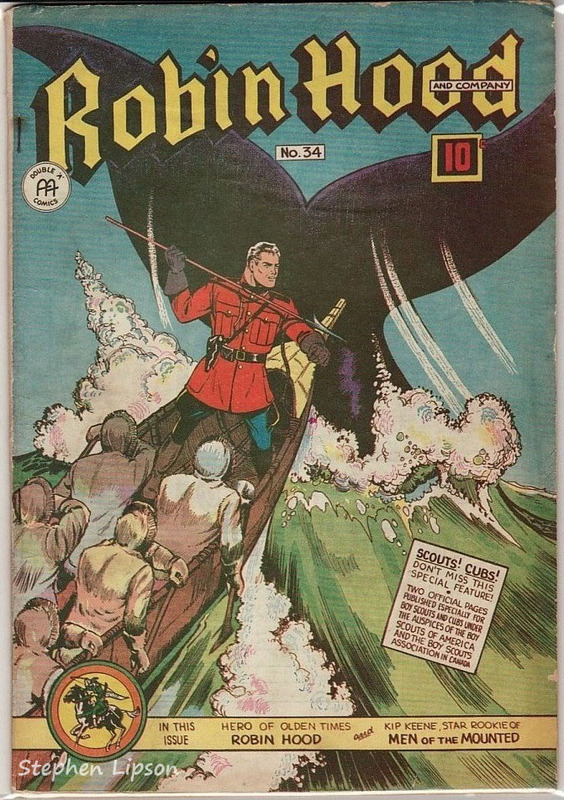 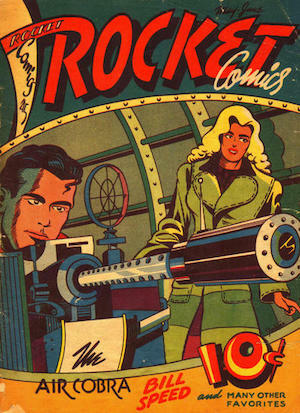 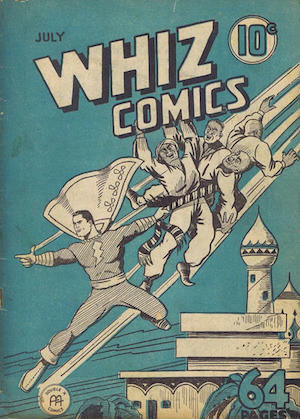 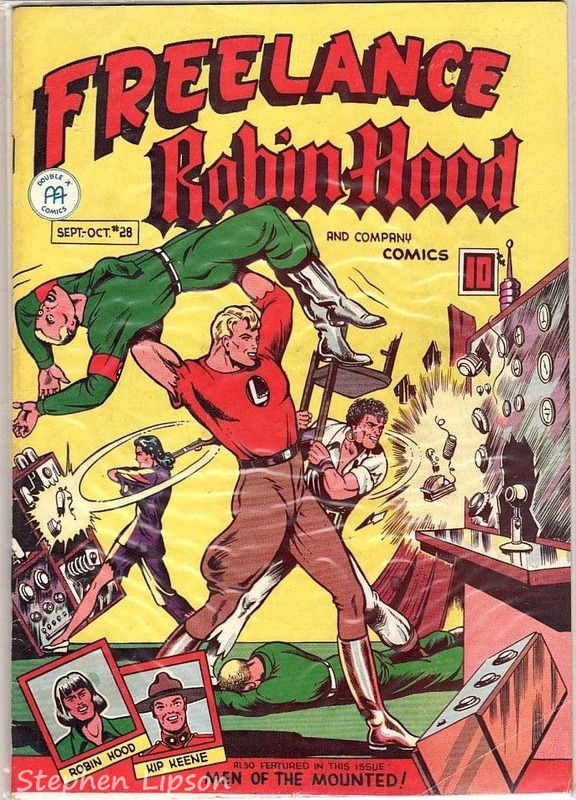 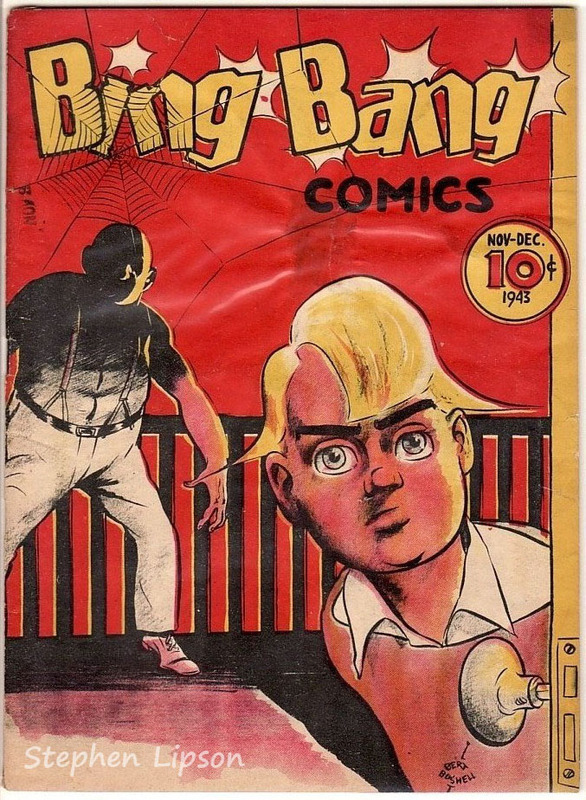 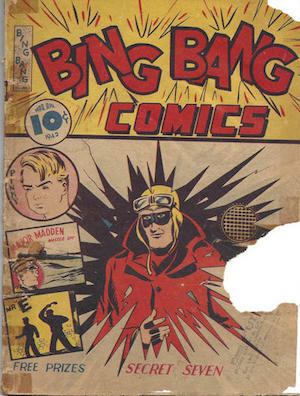 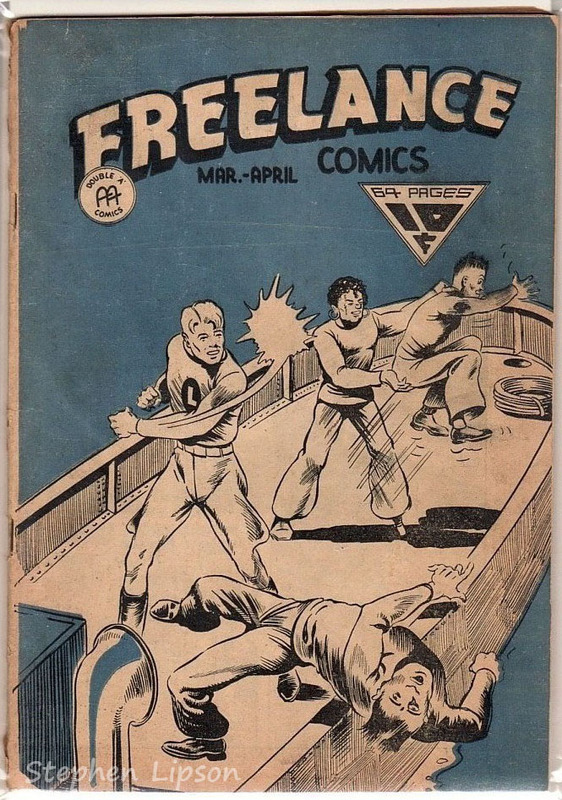 As a result, Canada started its own fledgling comic book industry. 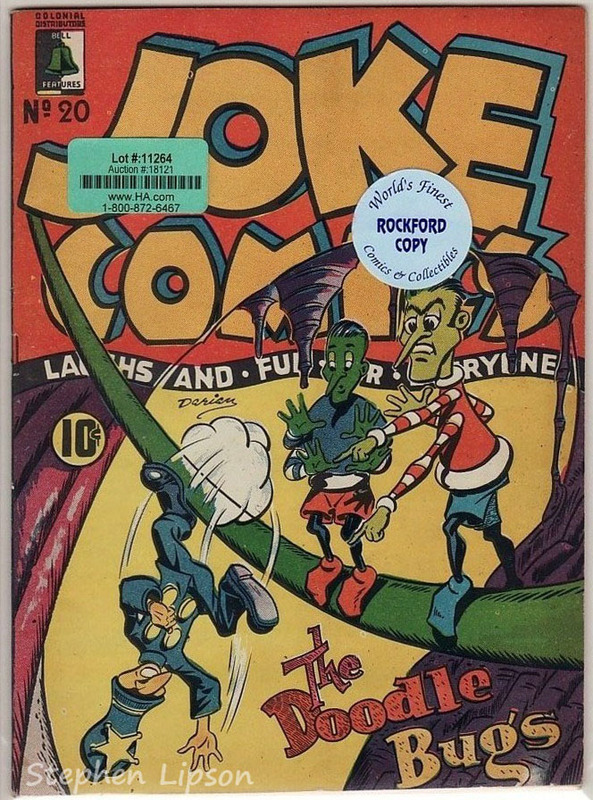 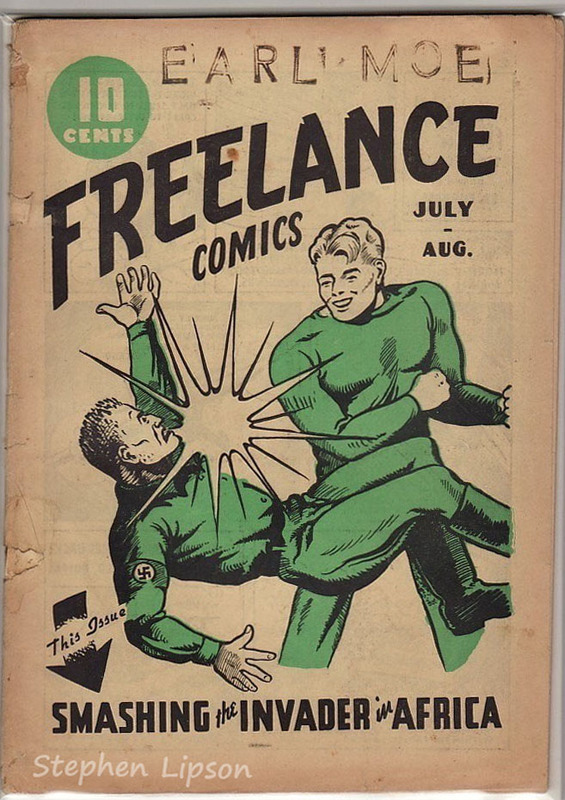 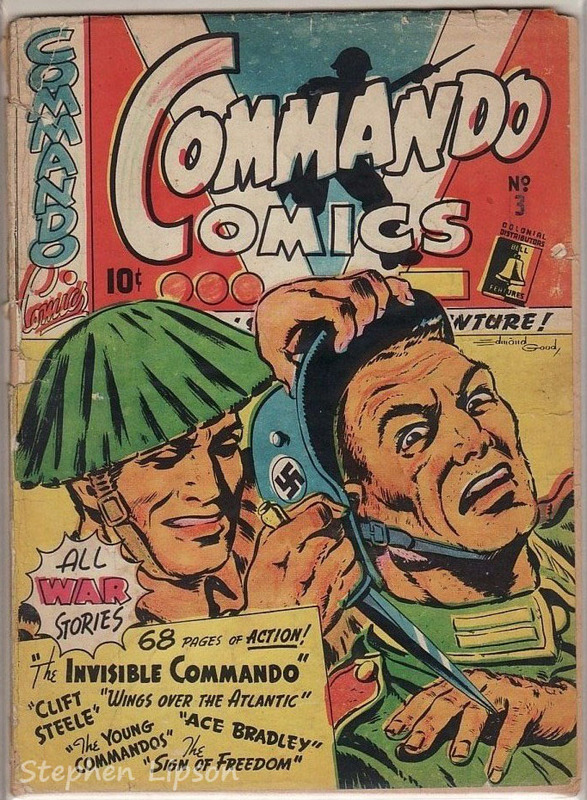 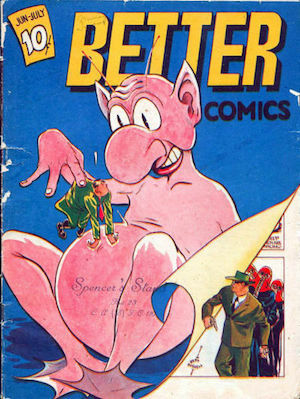 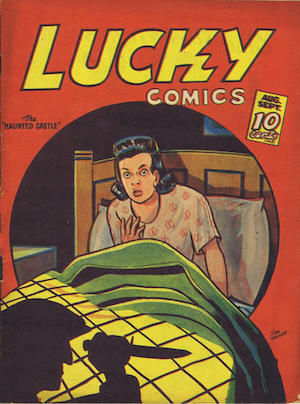 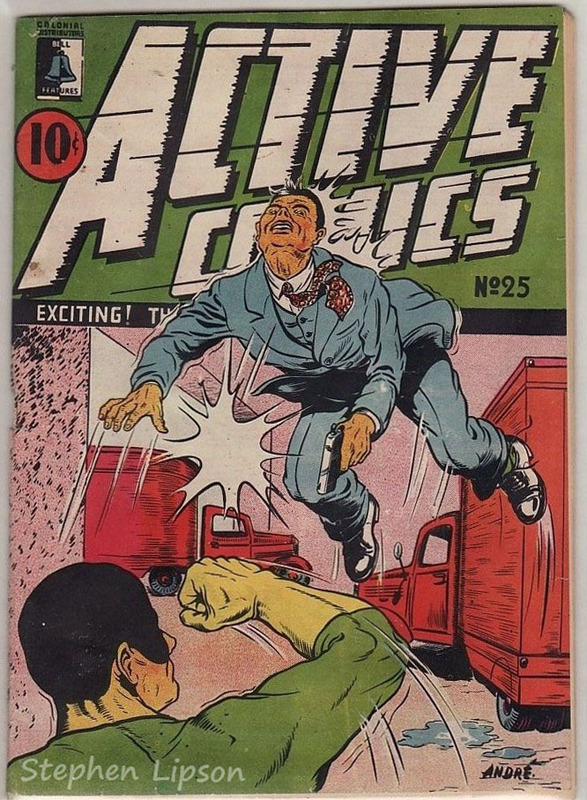 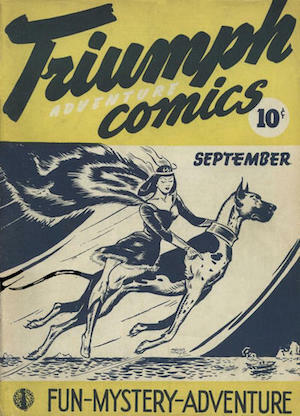 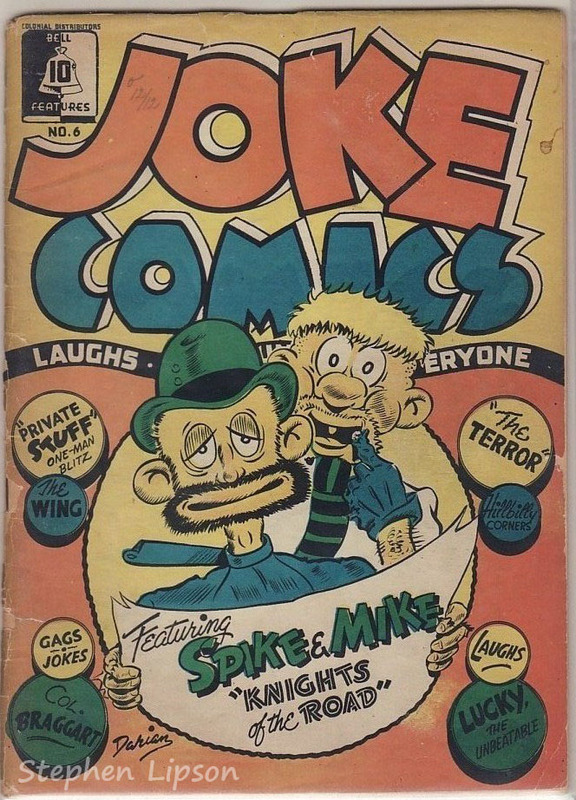 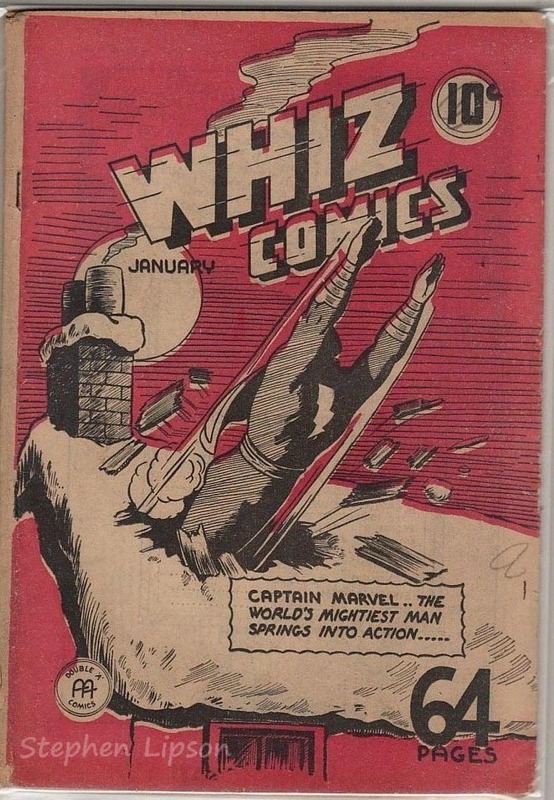 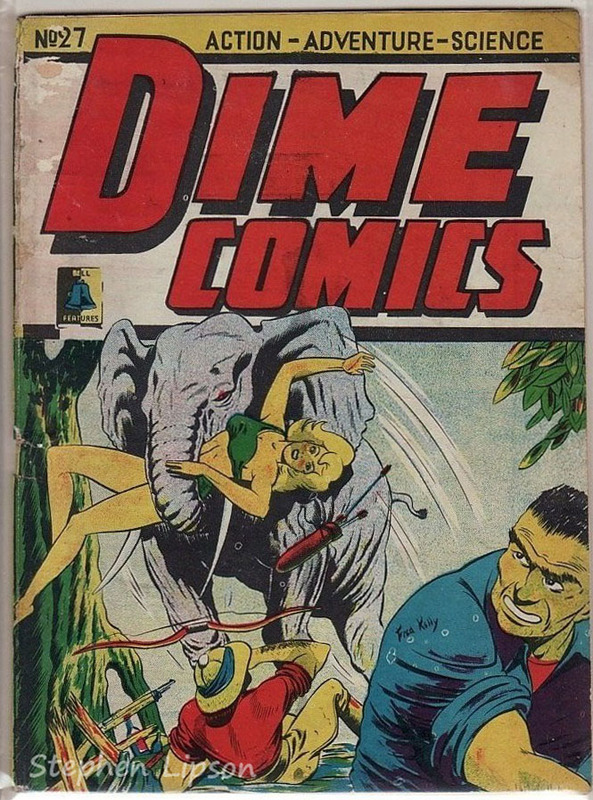 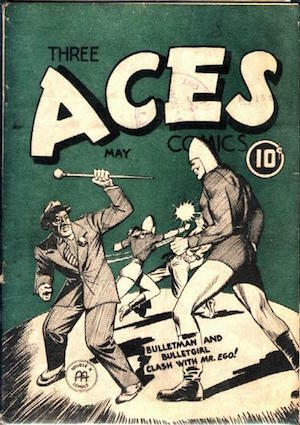 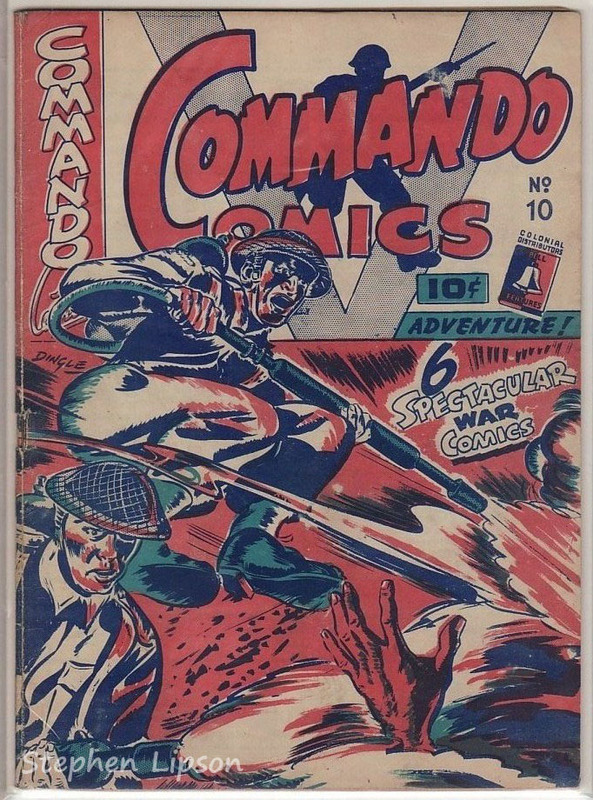 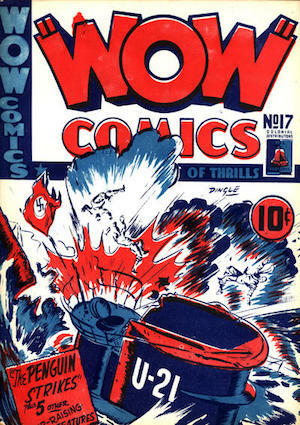 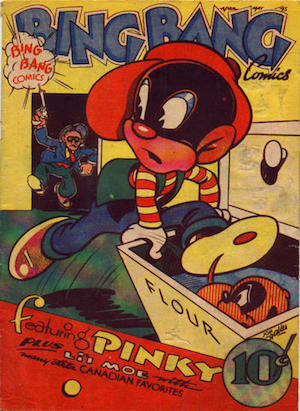 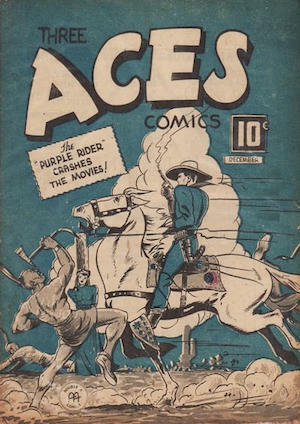 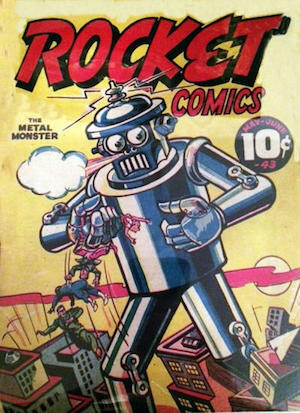 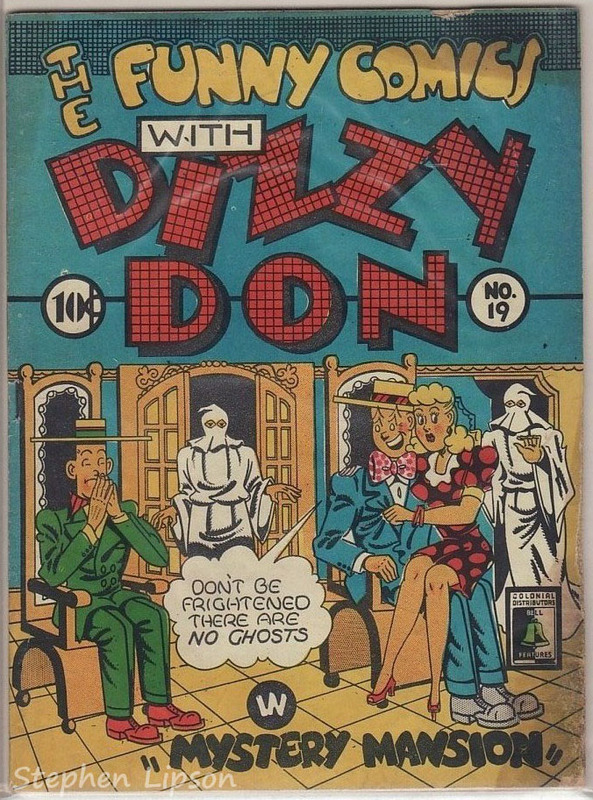 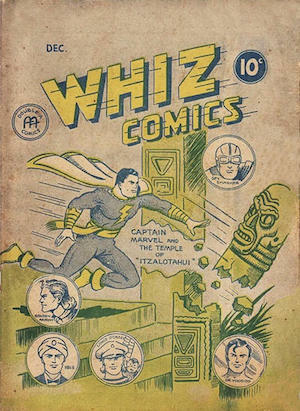 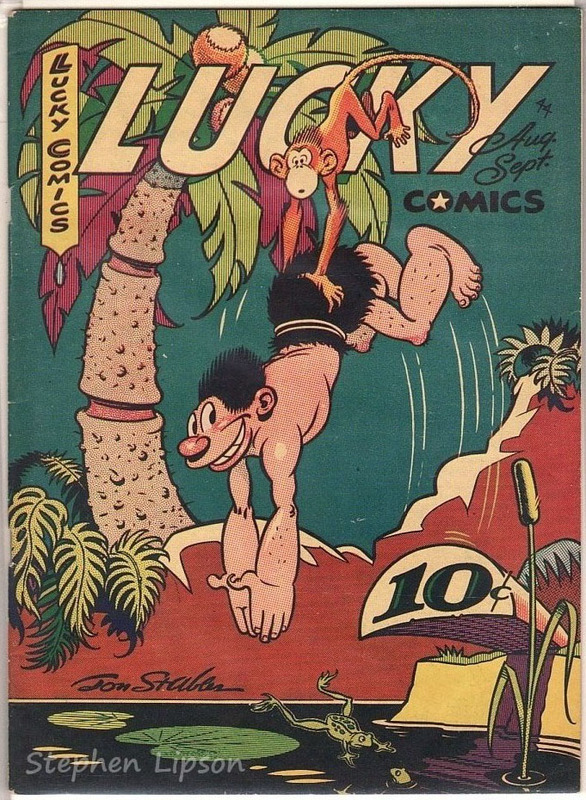 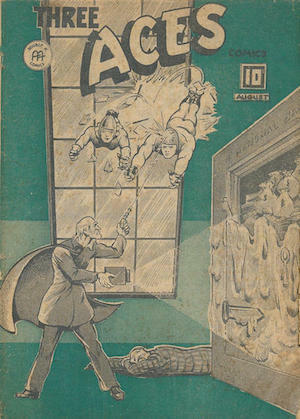 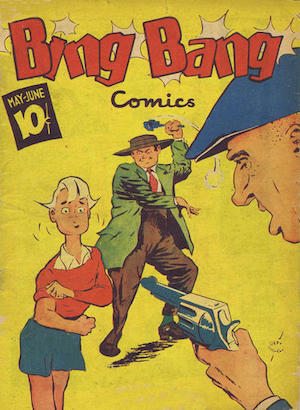 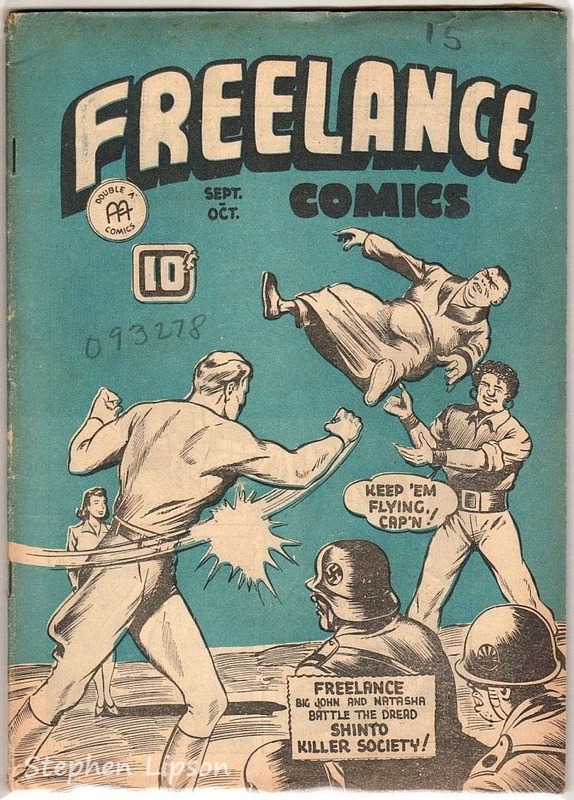 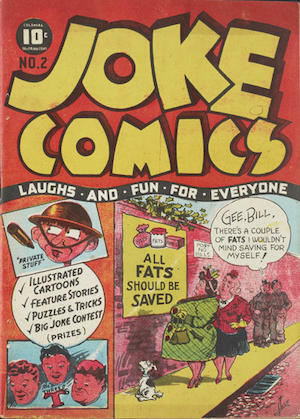 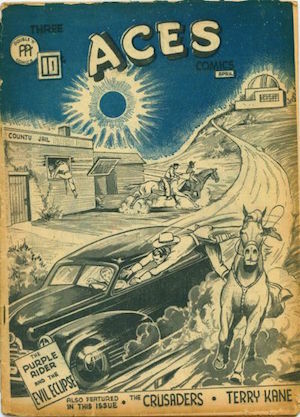 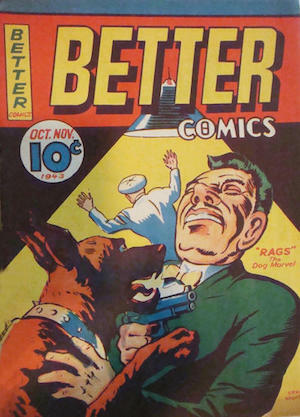 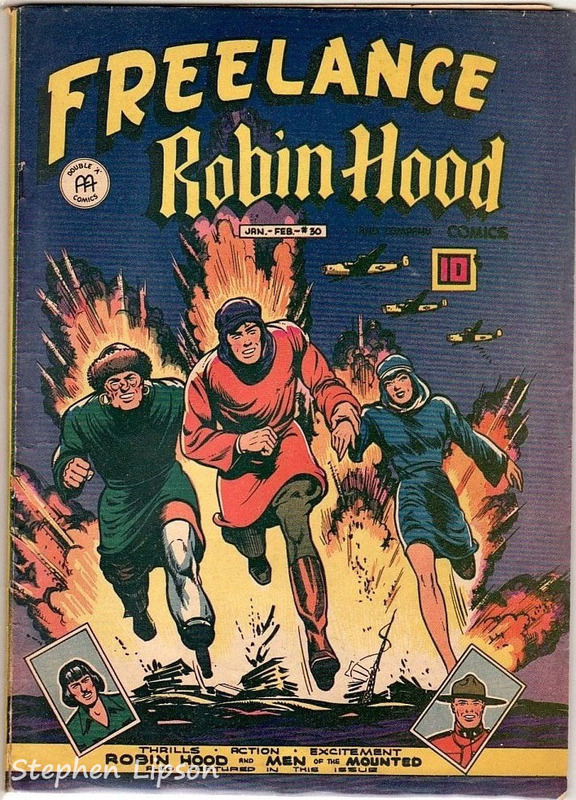 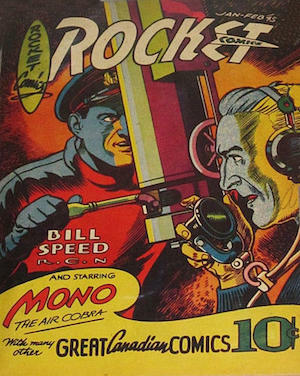 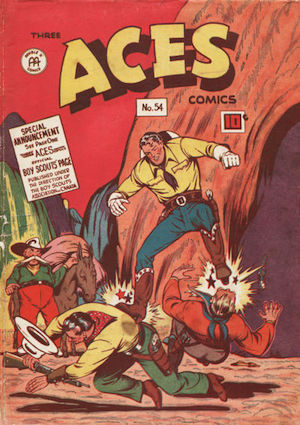 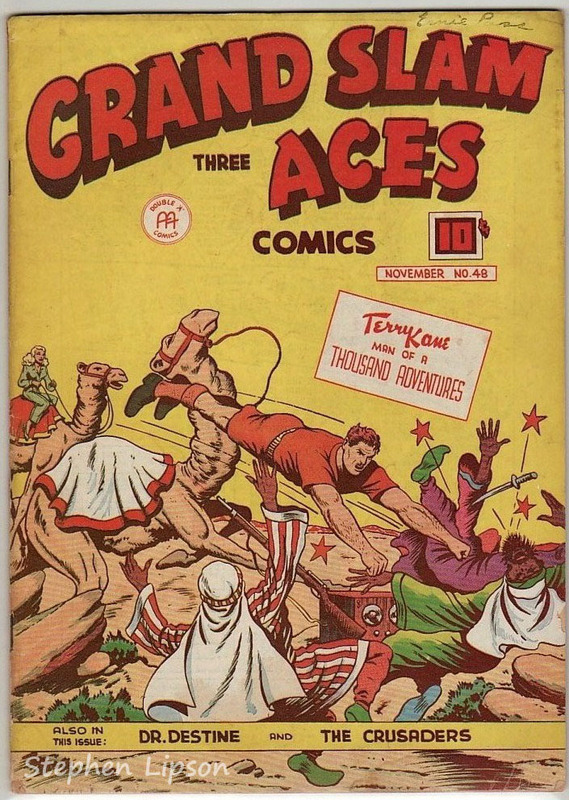 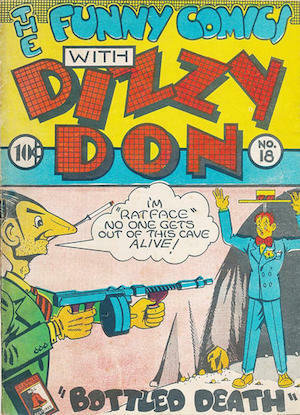 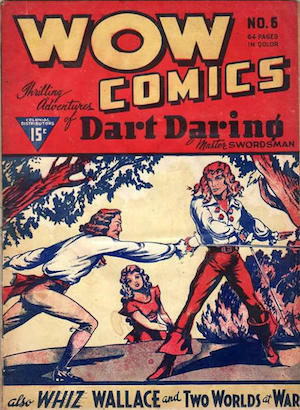 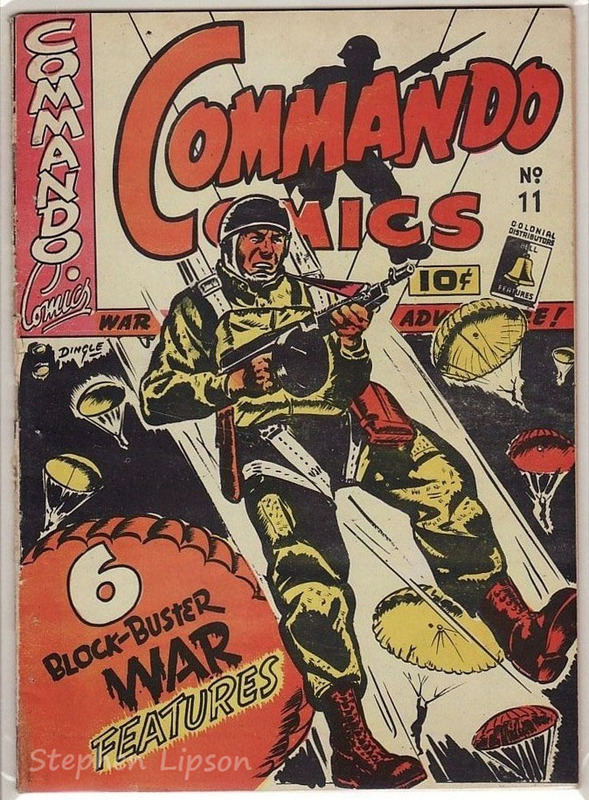 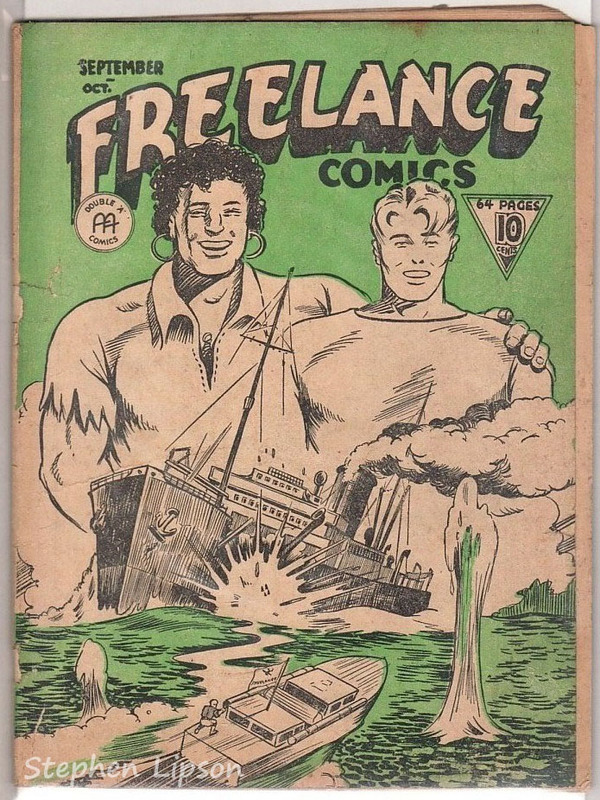 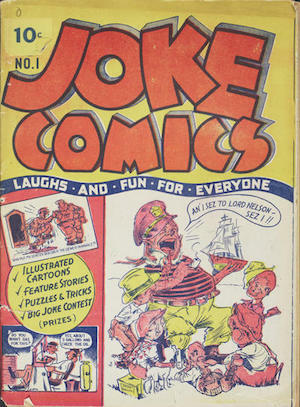 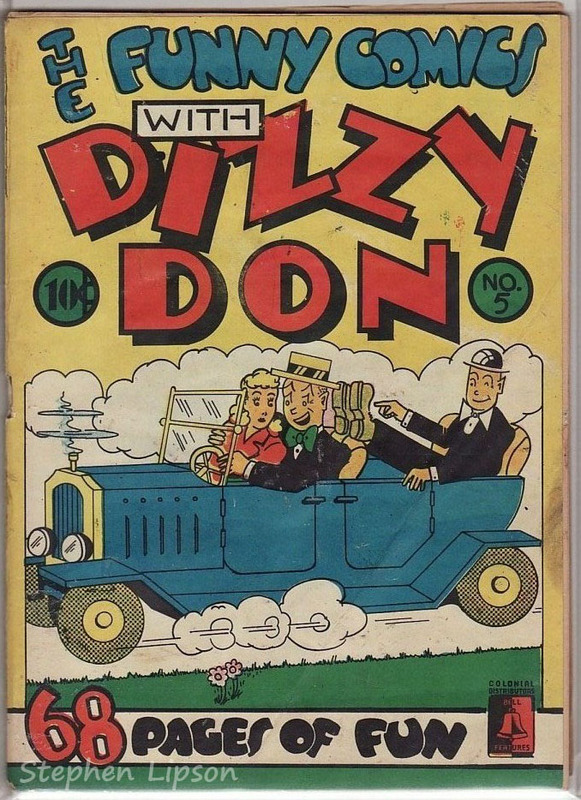 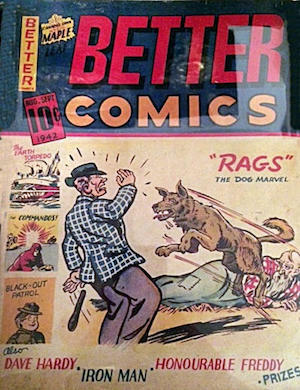 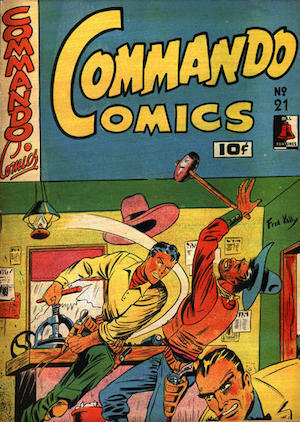 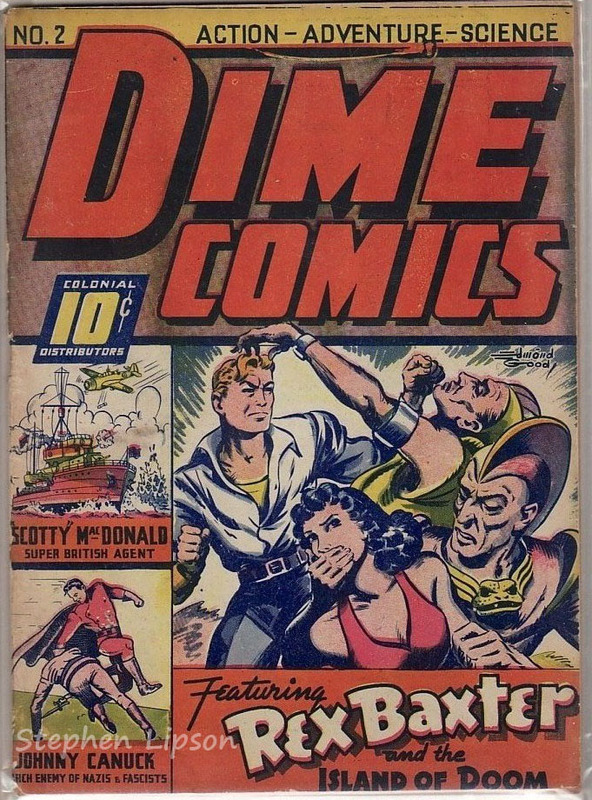 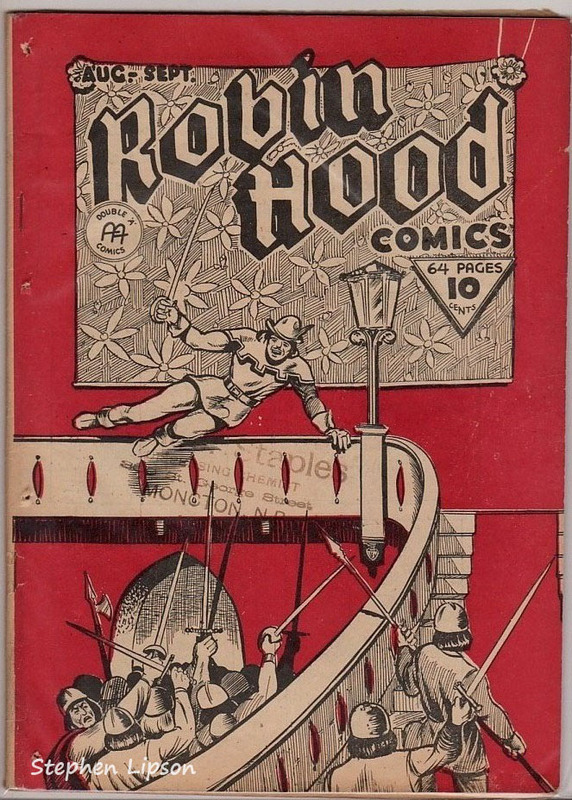 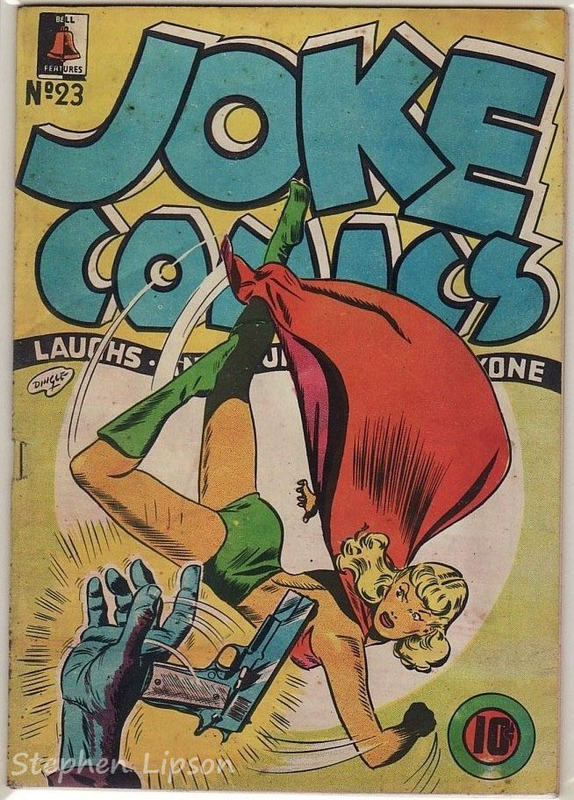 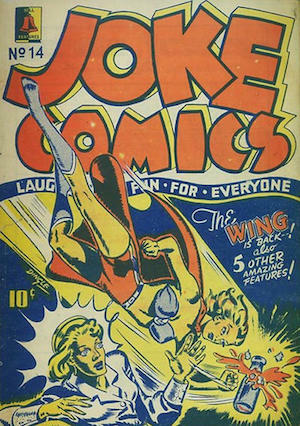 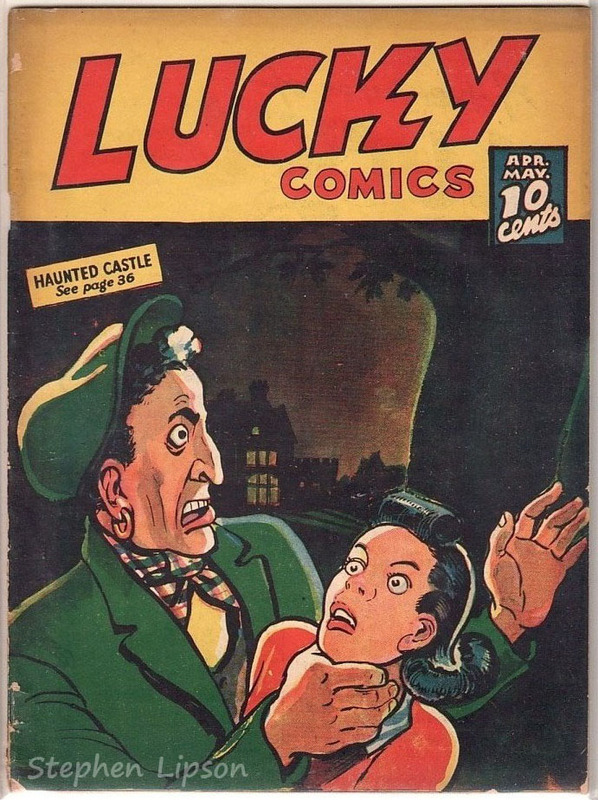 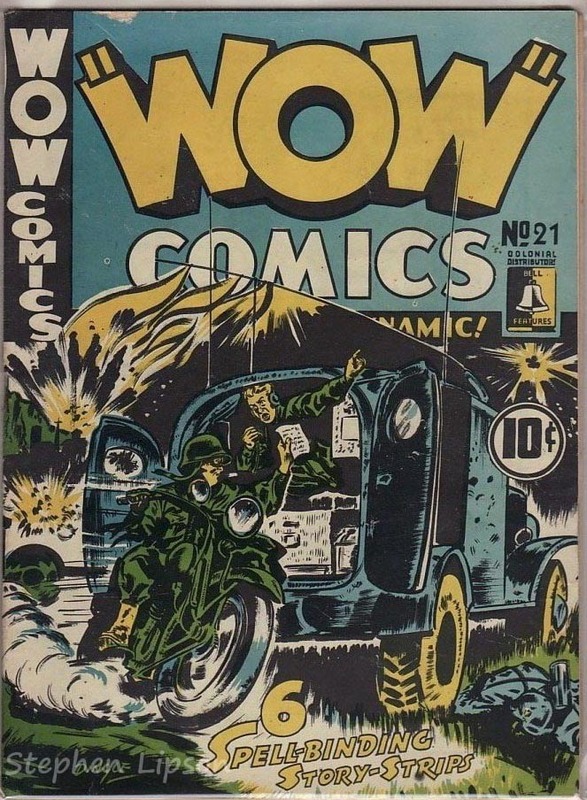 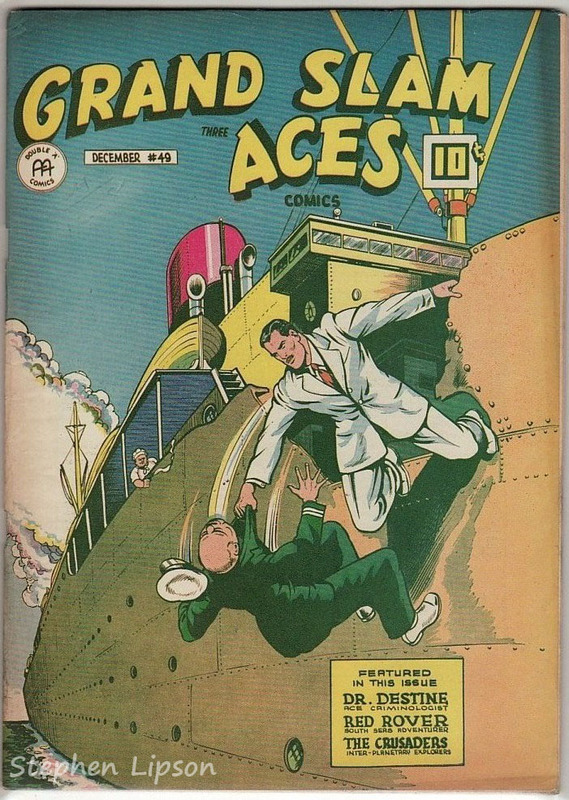 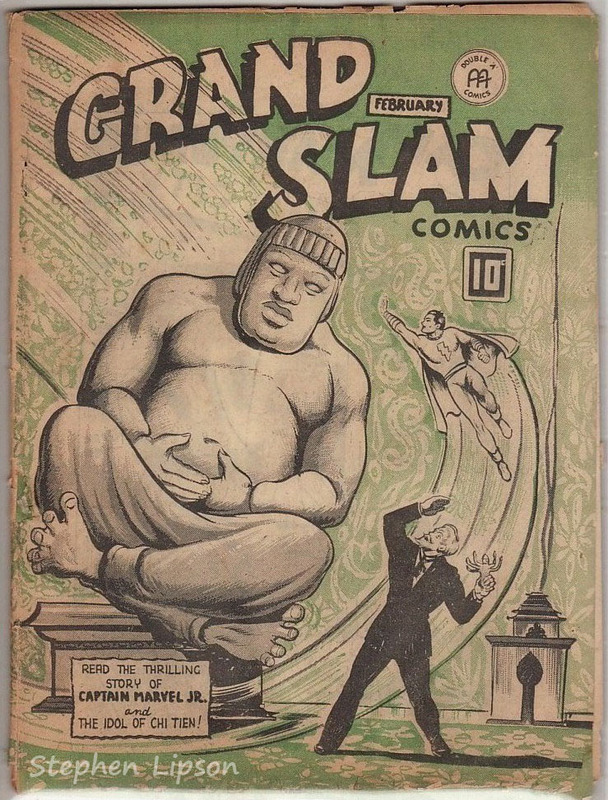 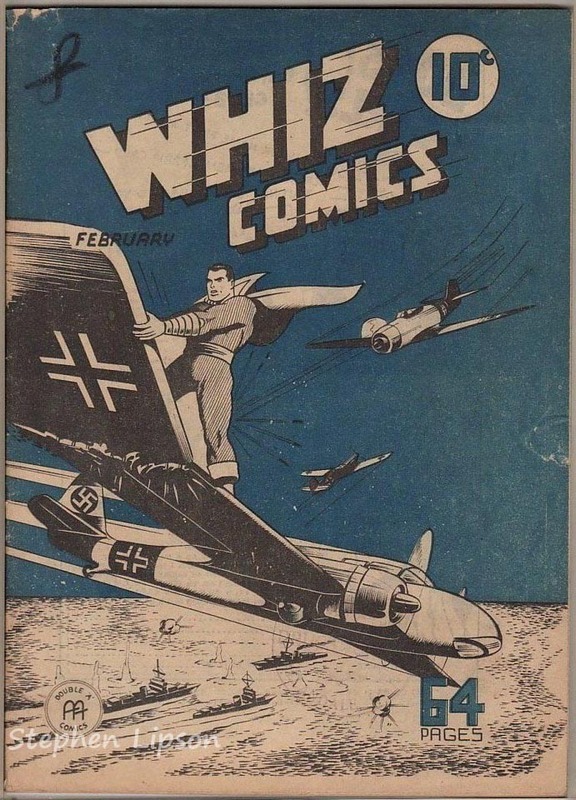 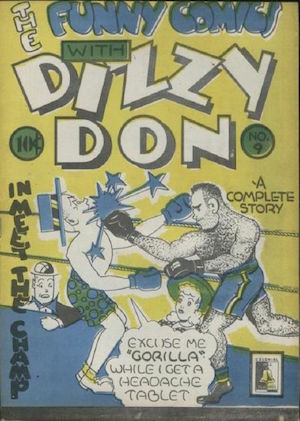 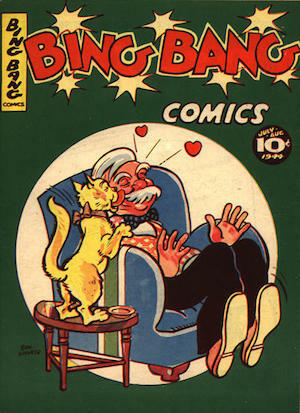 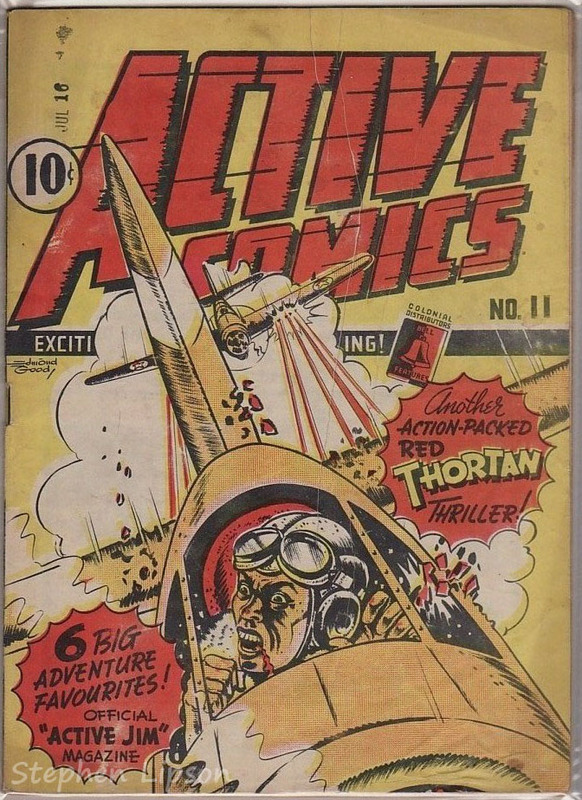 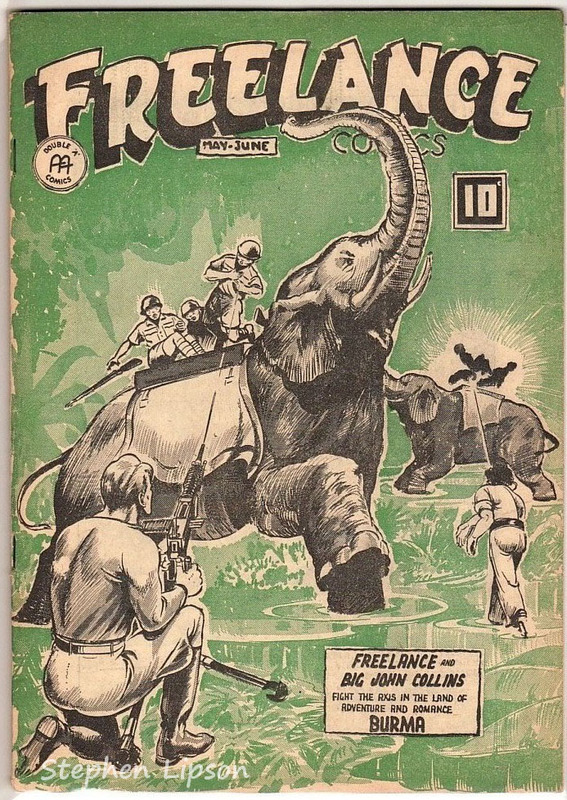 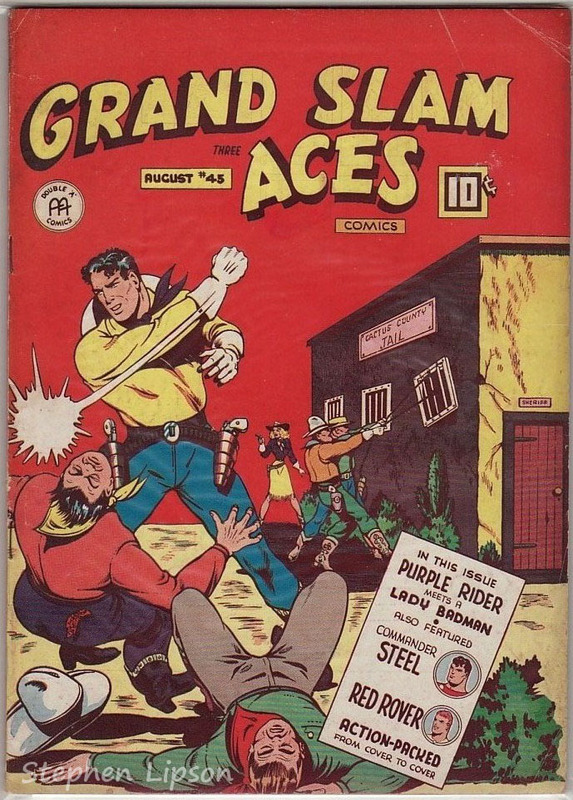 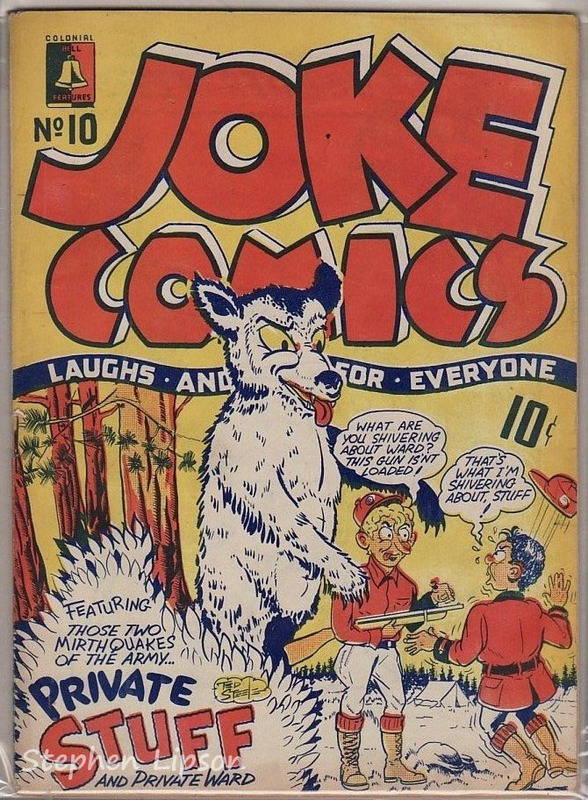 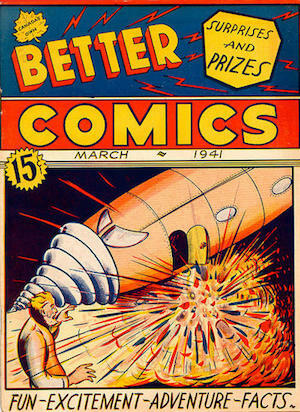 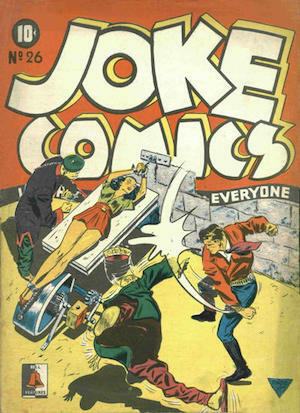 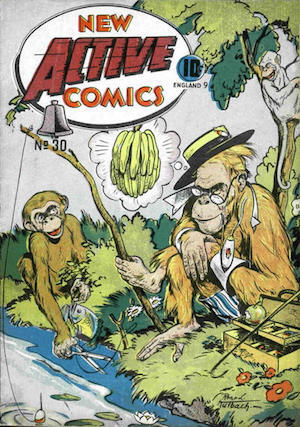 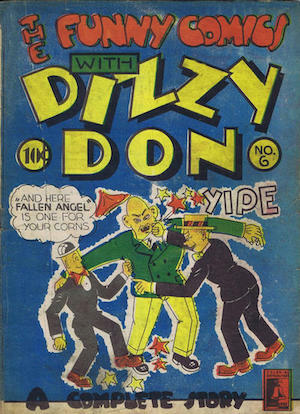 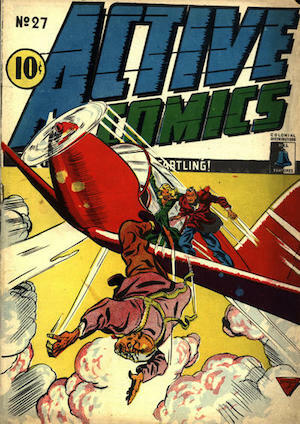 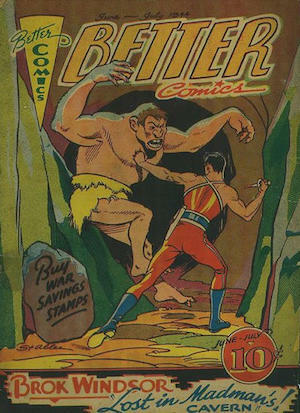 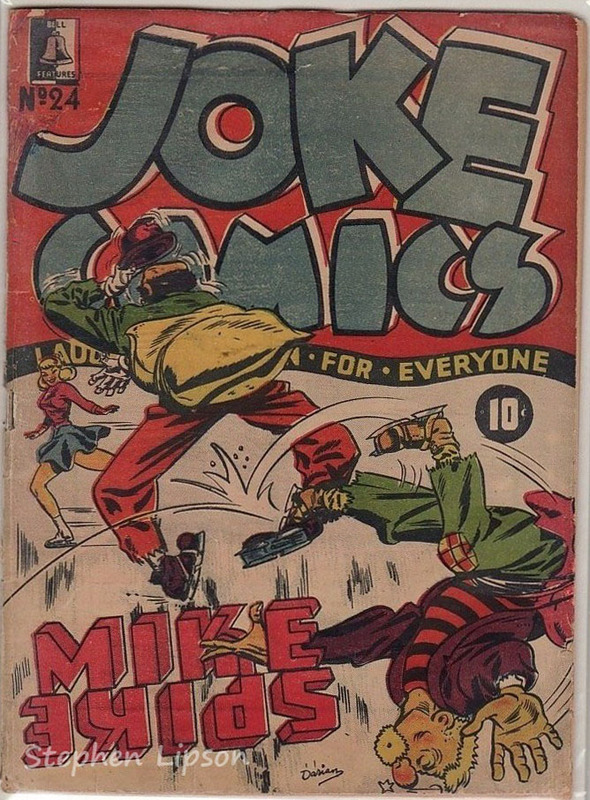 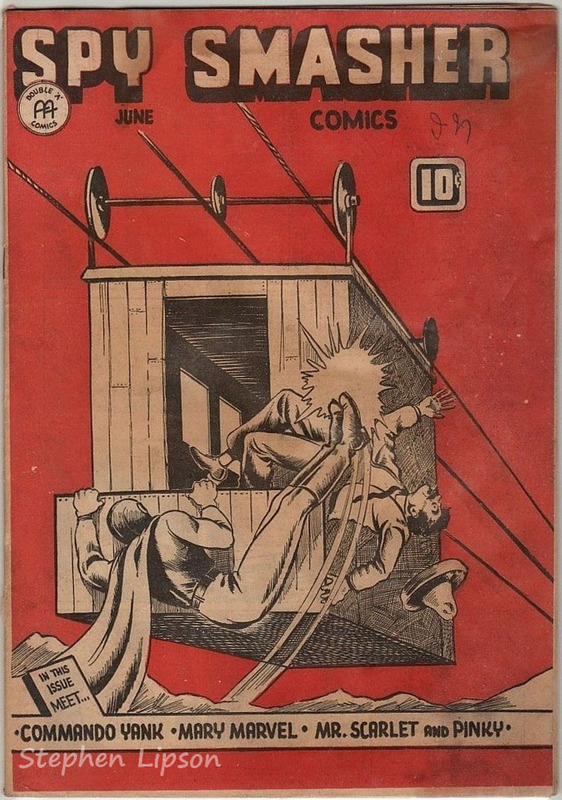 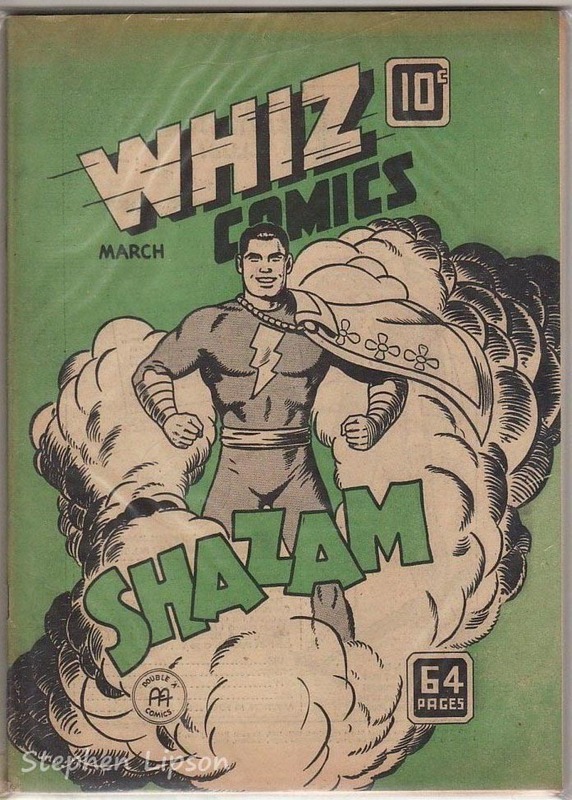 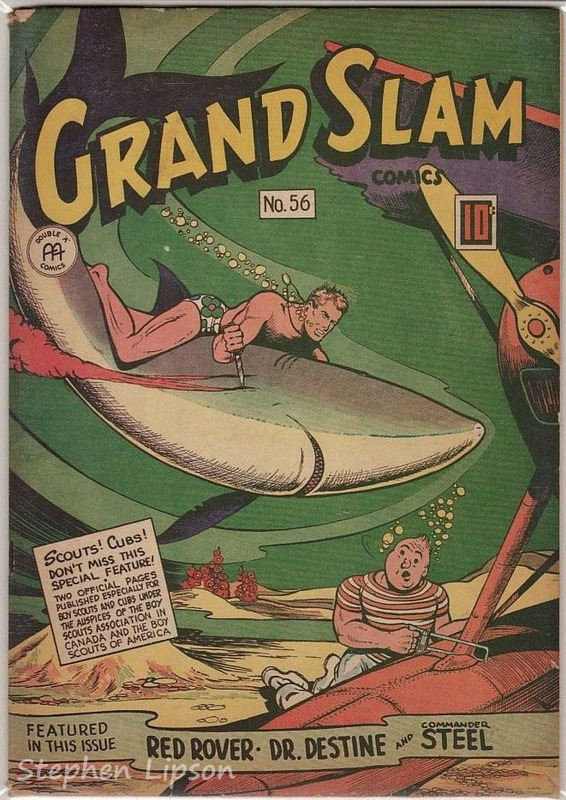 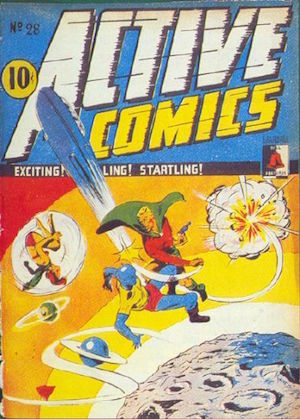 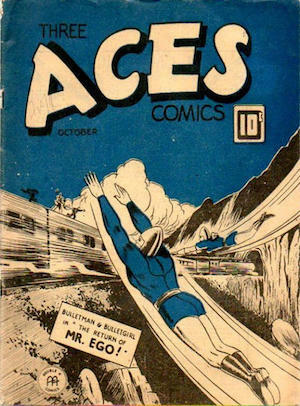 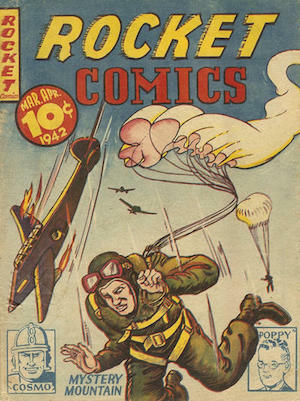 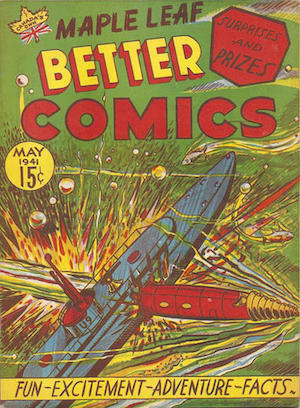 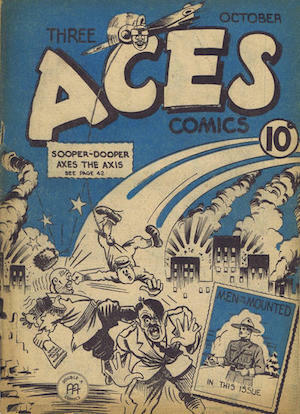 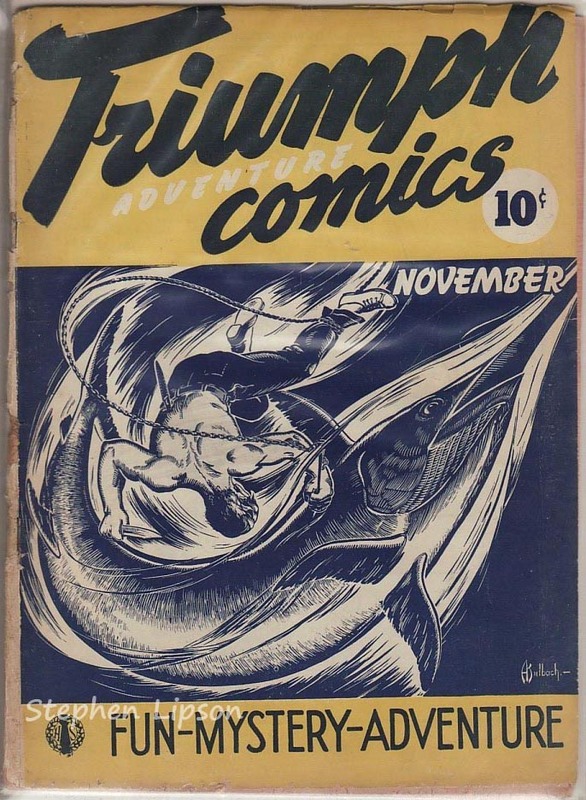 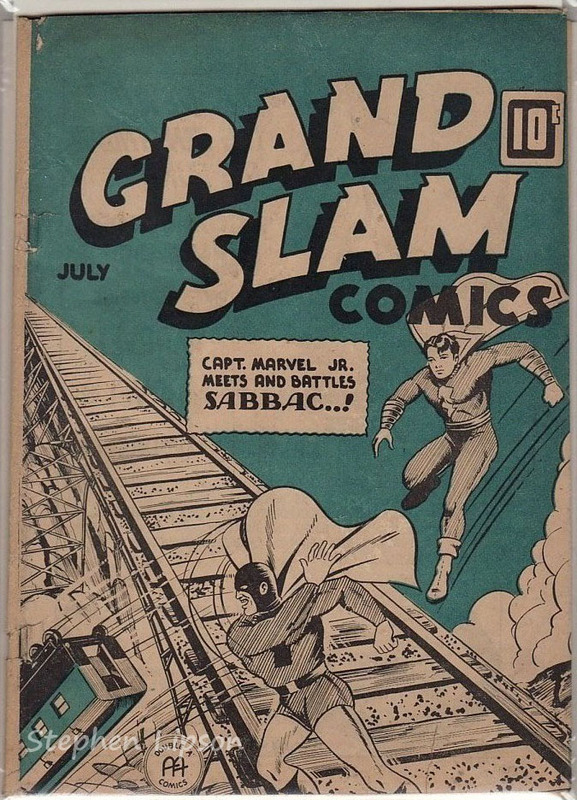 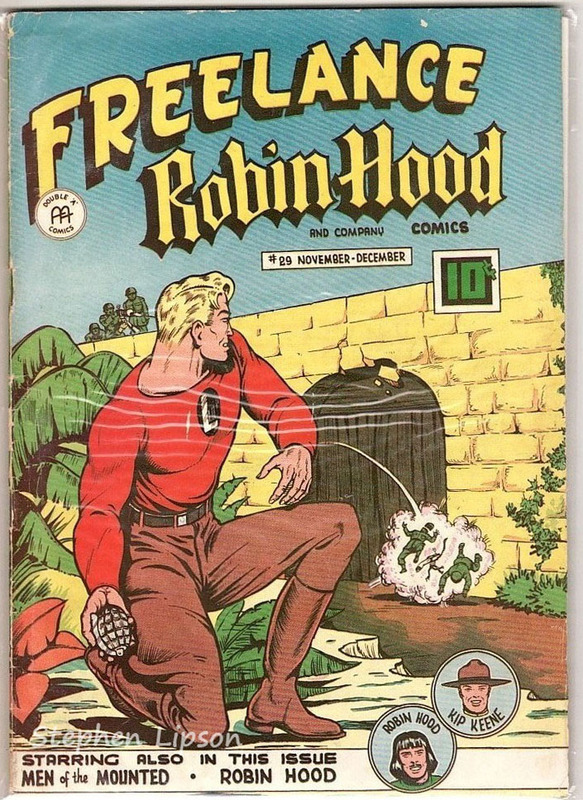 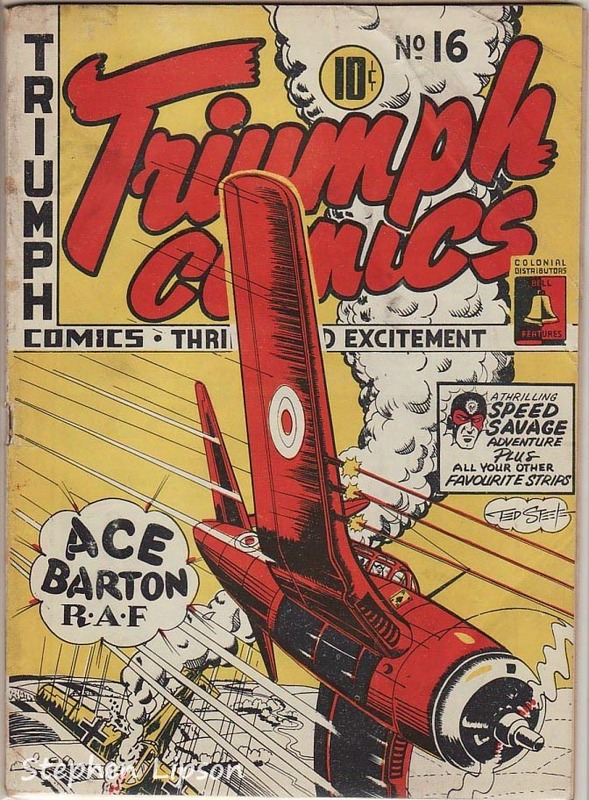 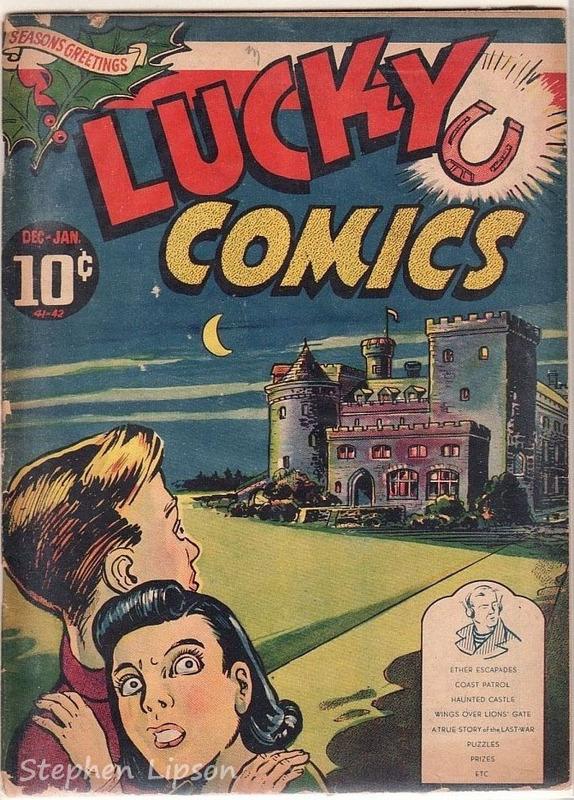 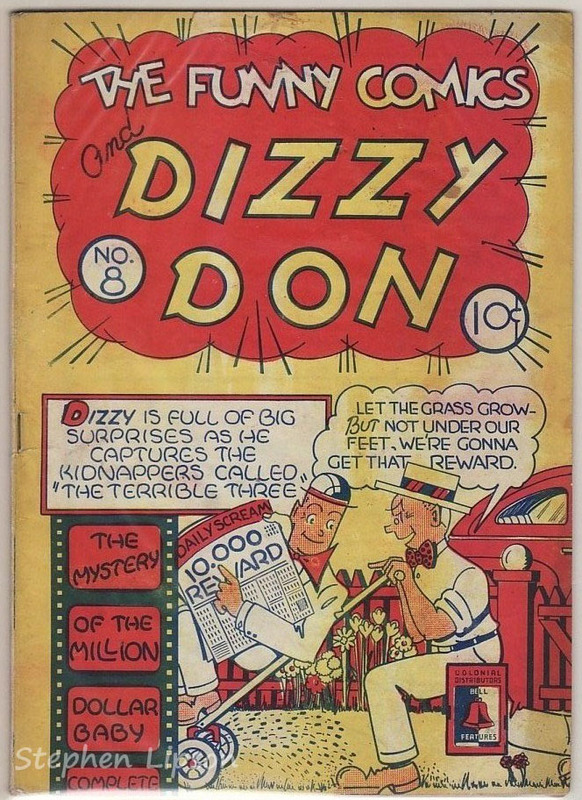 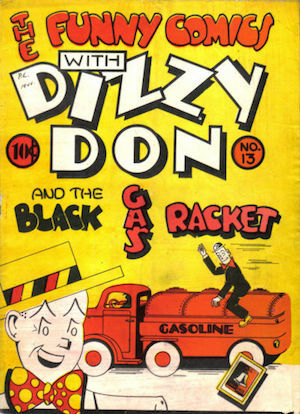 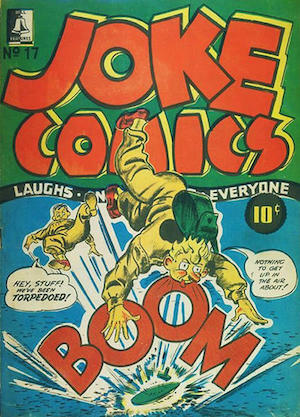 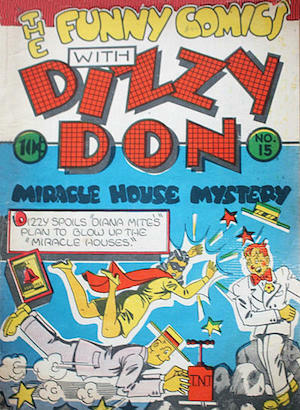 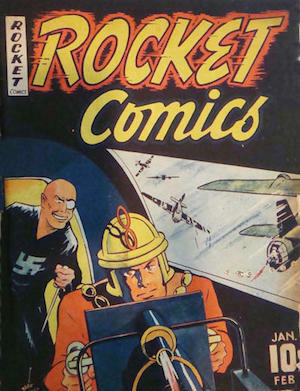 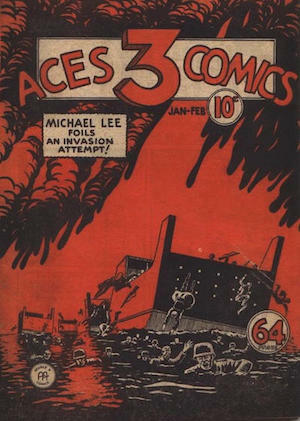 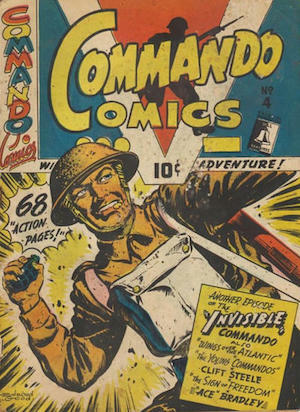 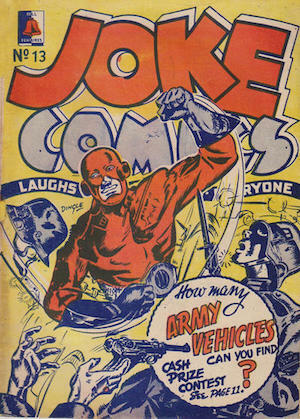 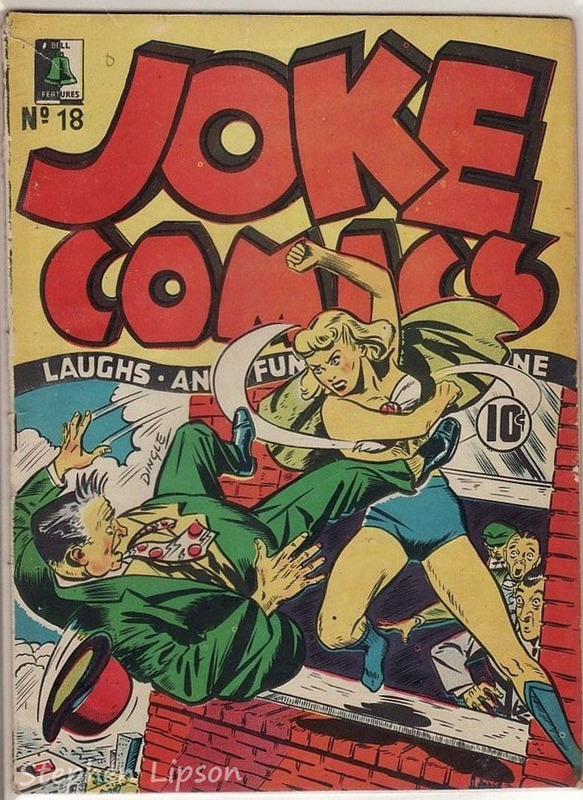 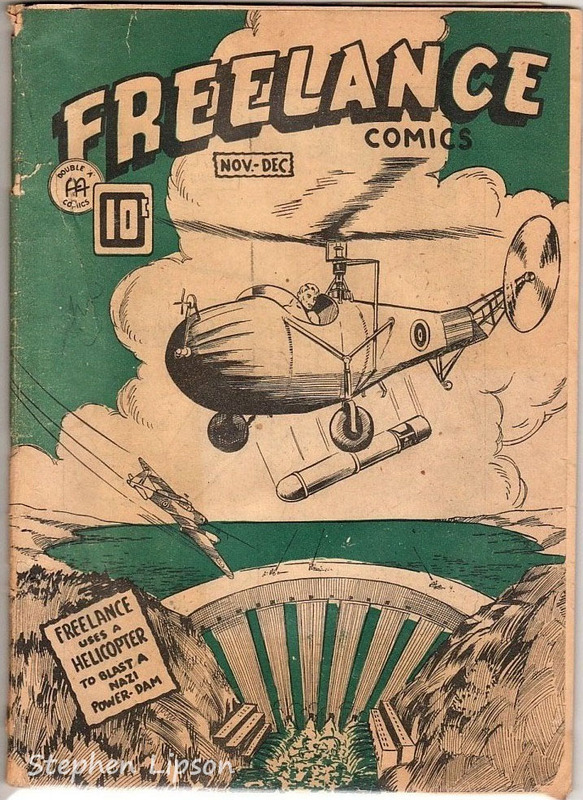 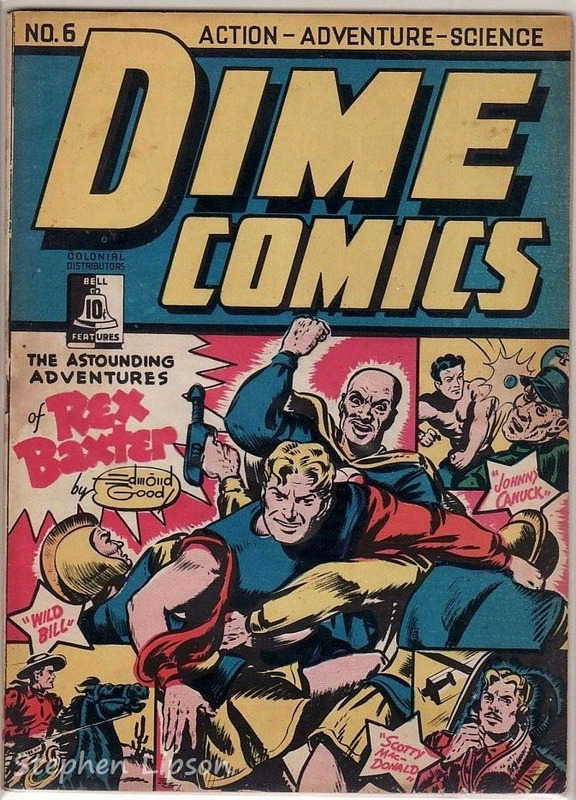 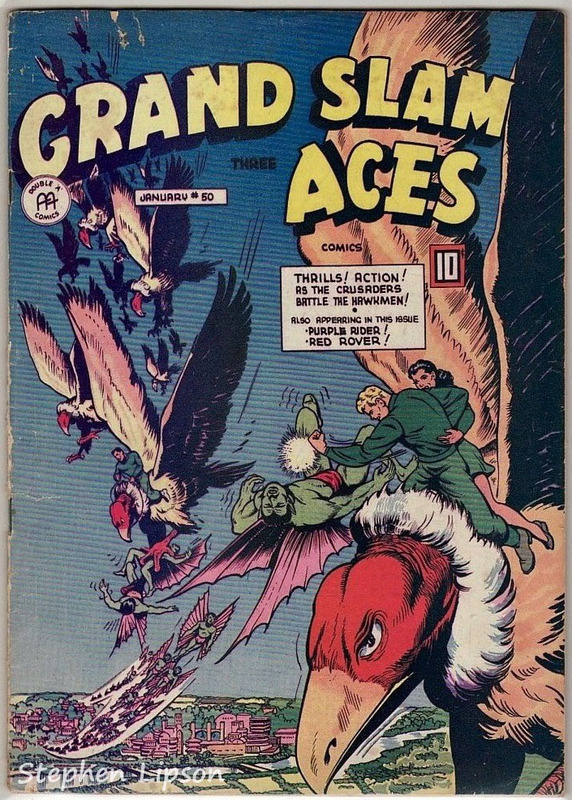 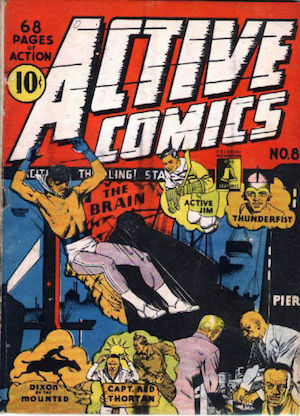 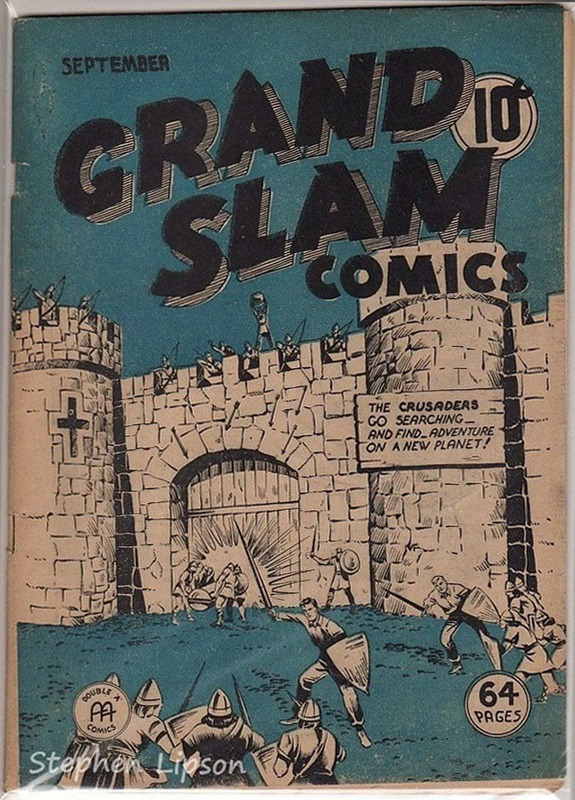 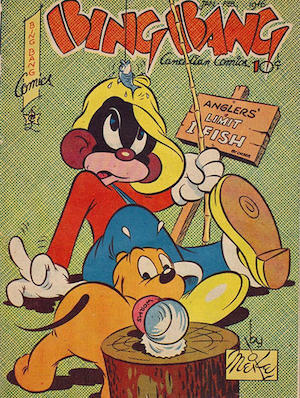 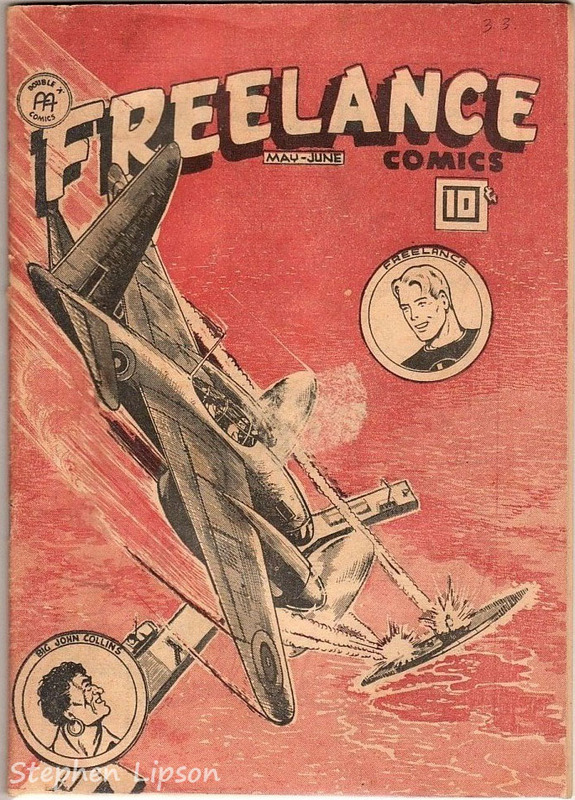 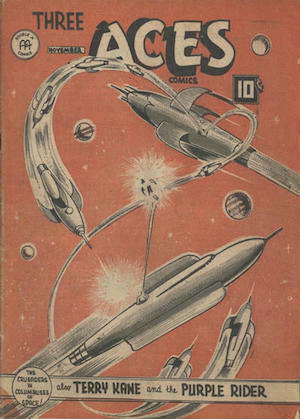 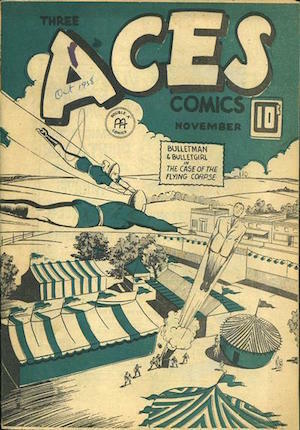 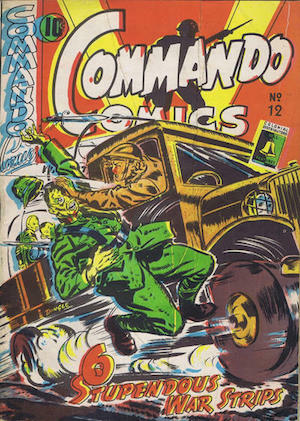 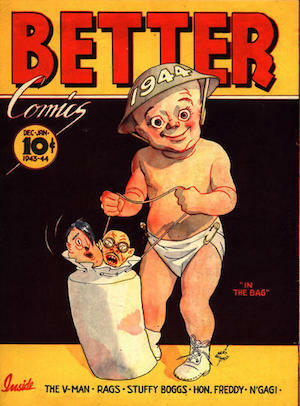 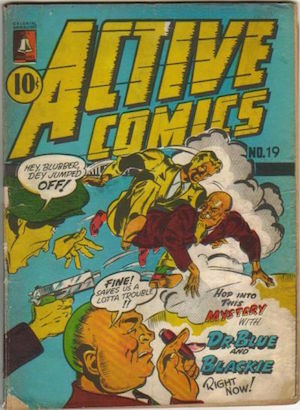 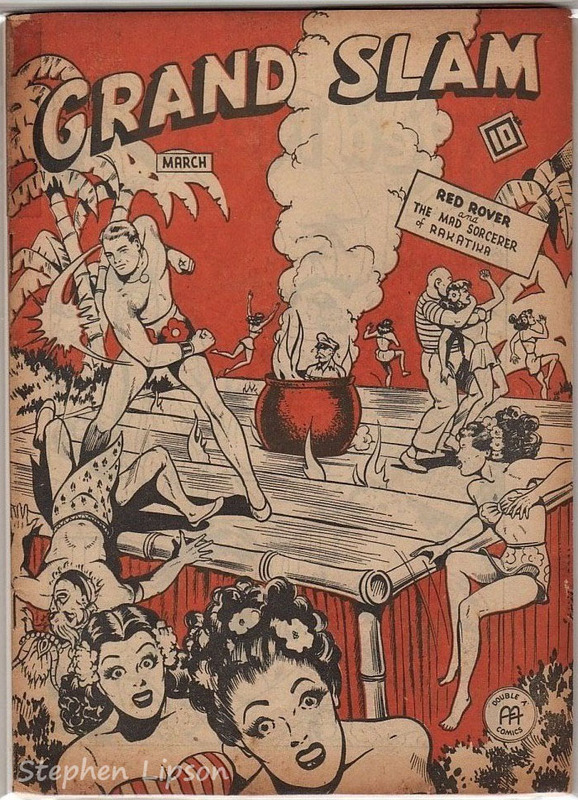 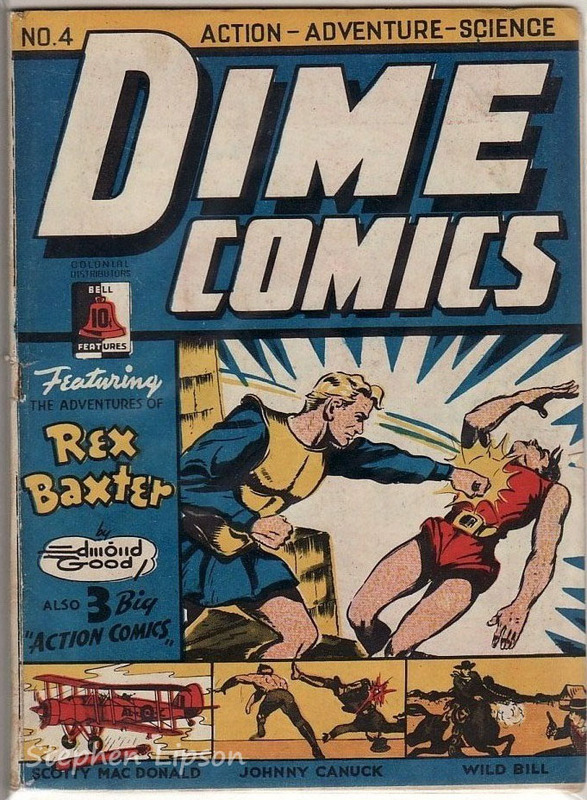 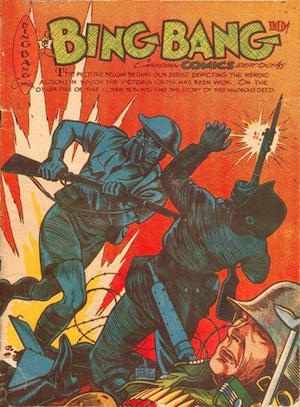 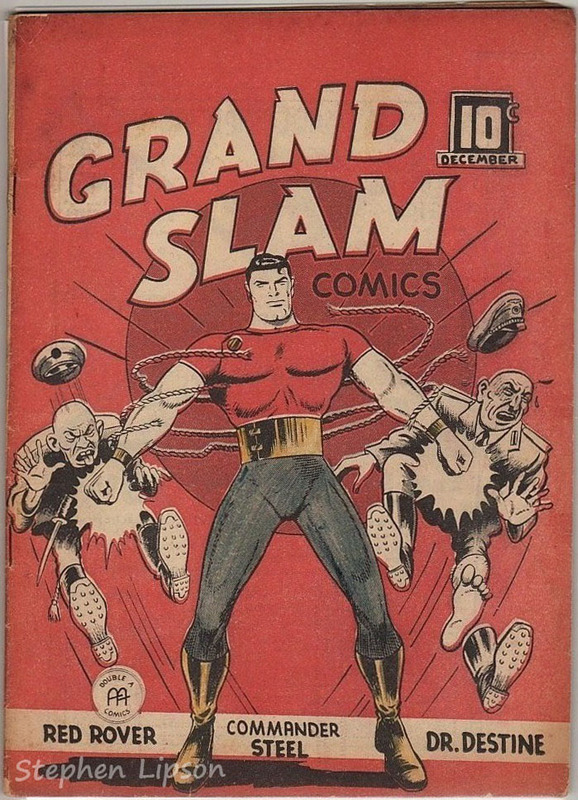 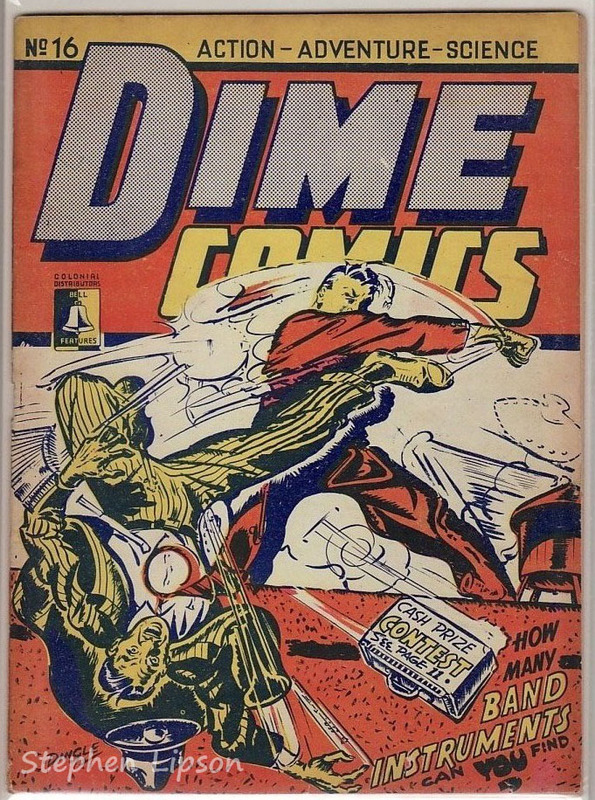 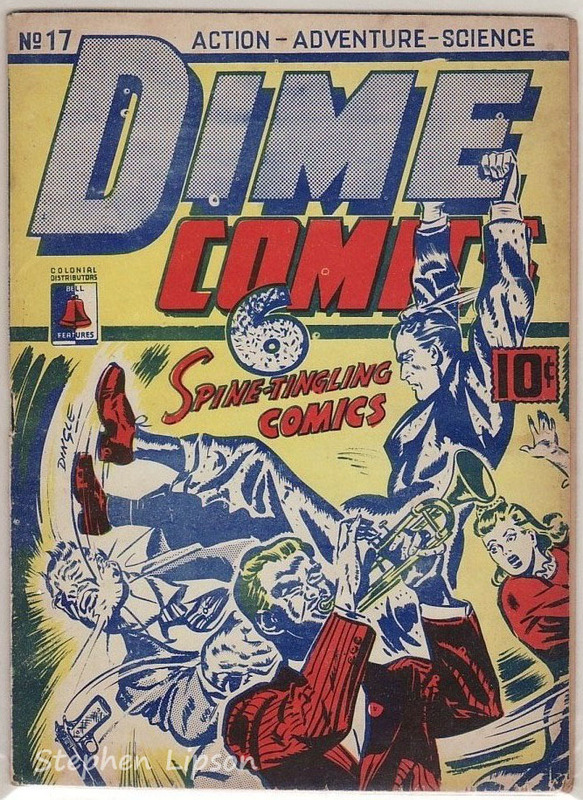 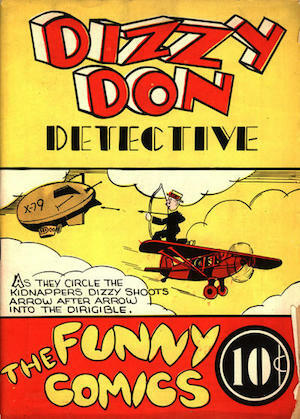 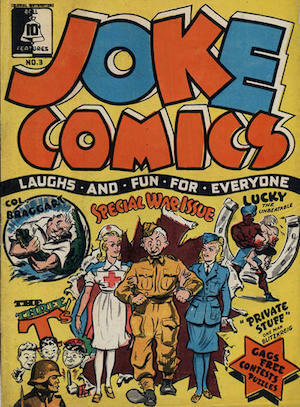 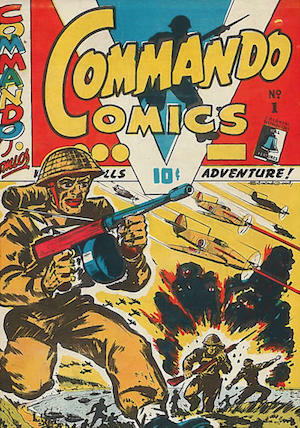 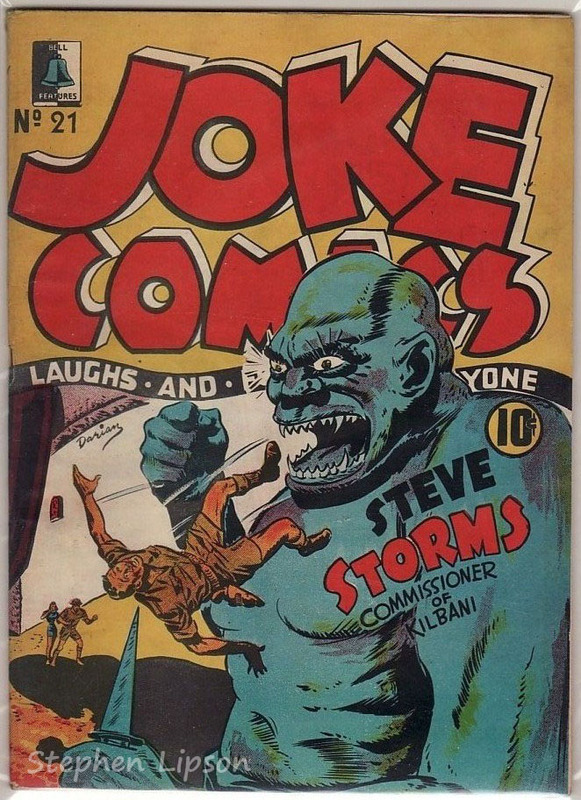 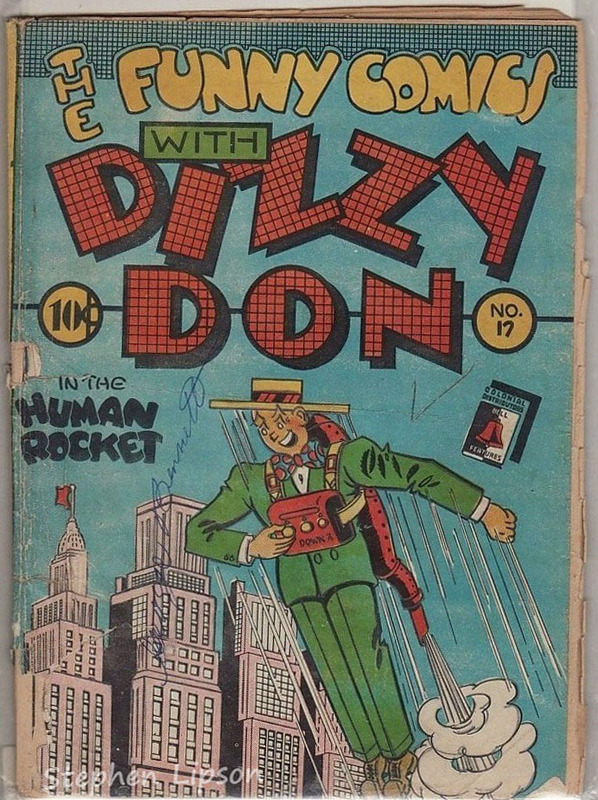 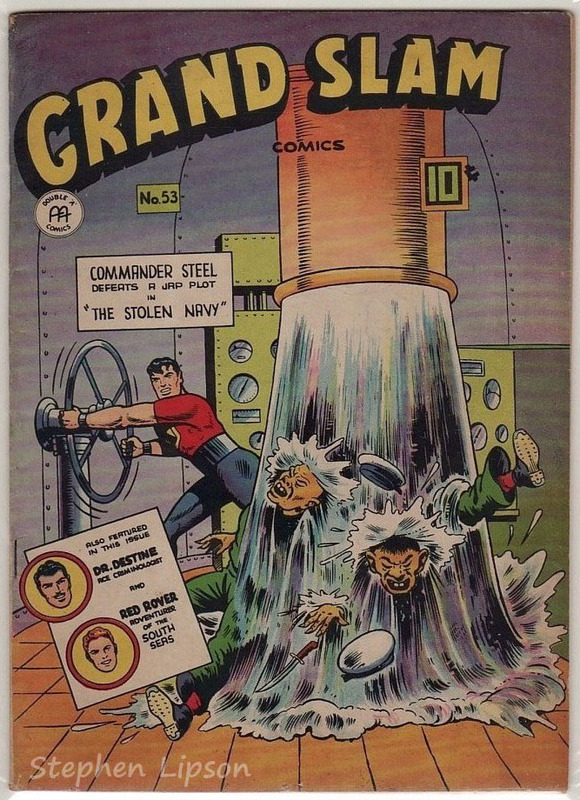 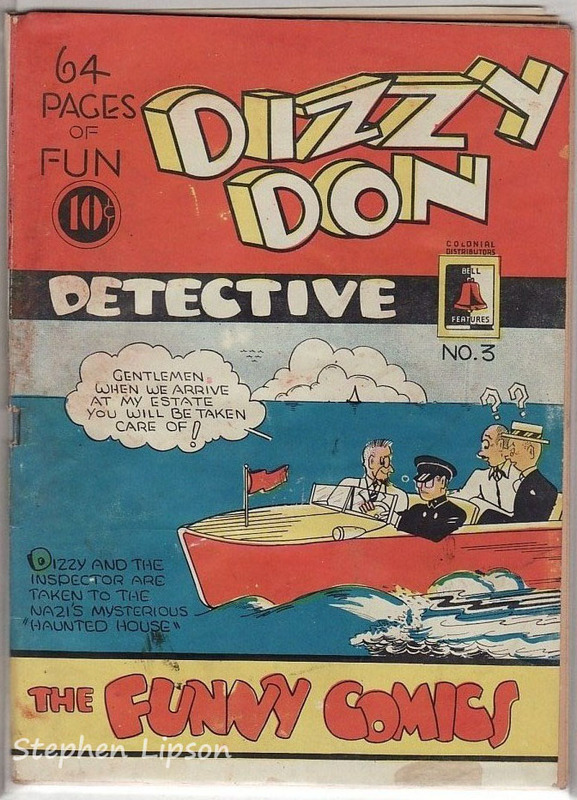 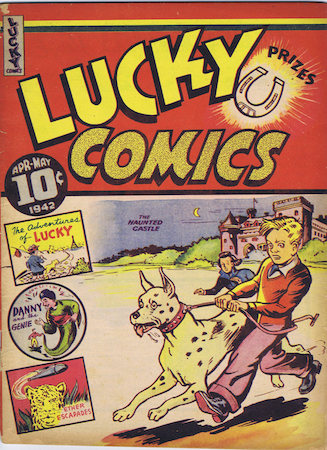 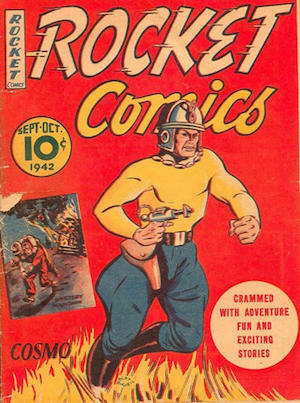 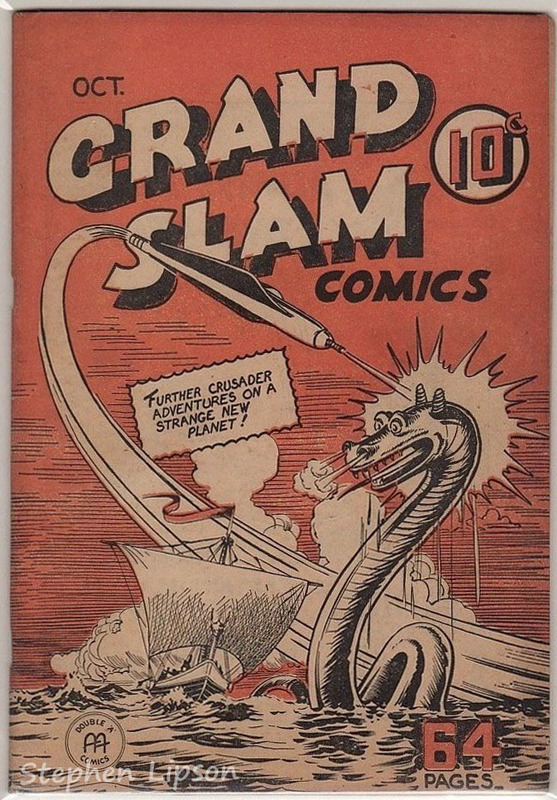 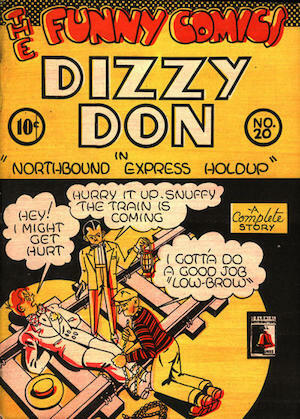 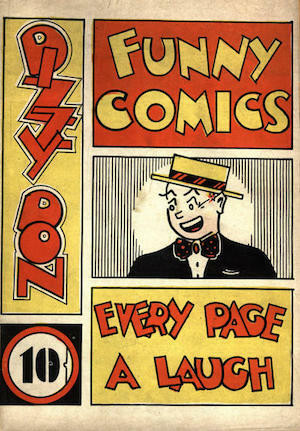 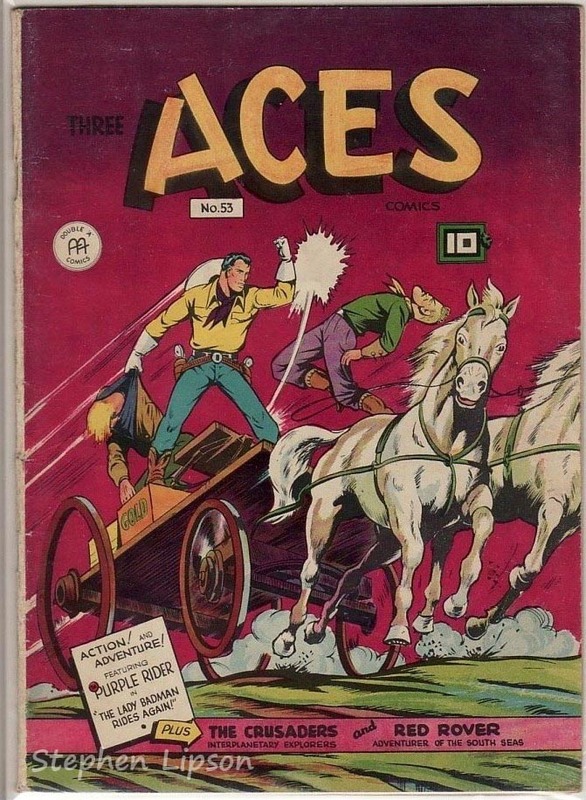 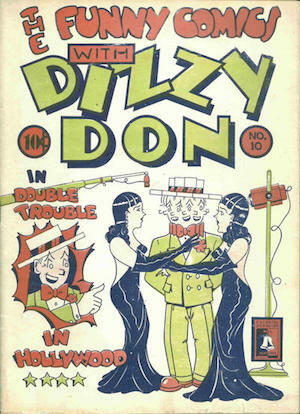 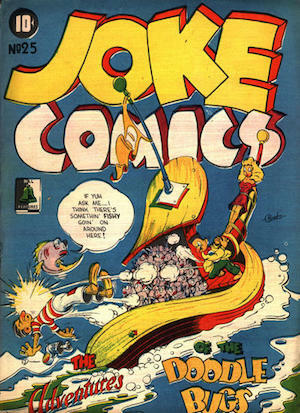 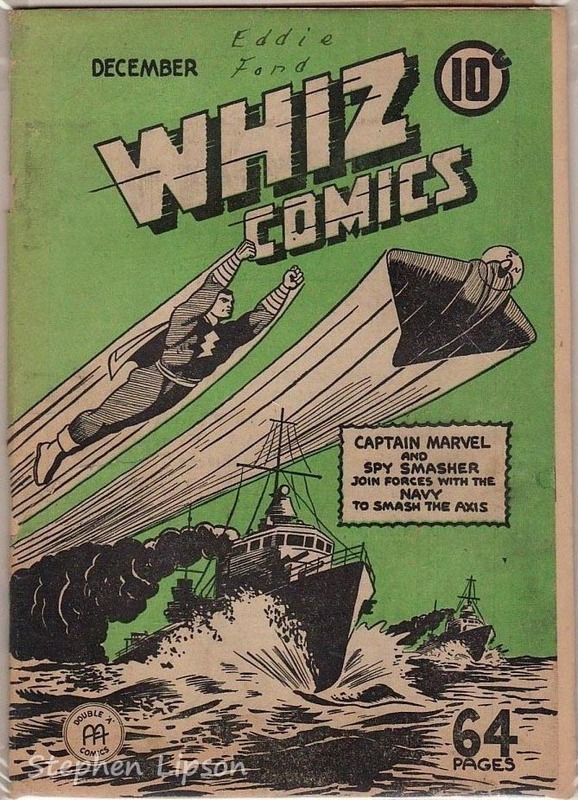 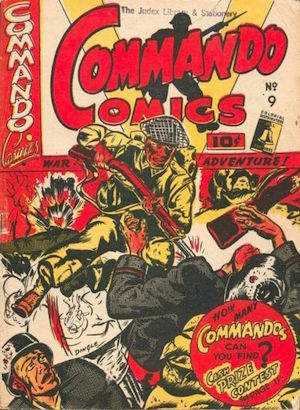 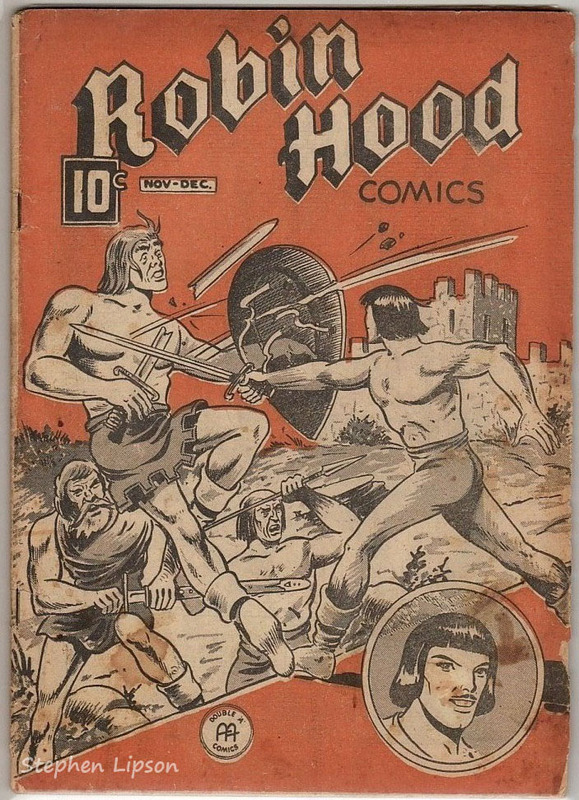 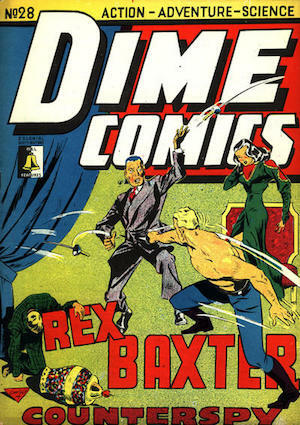 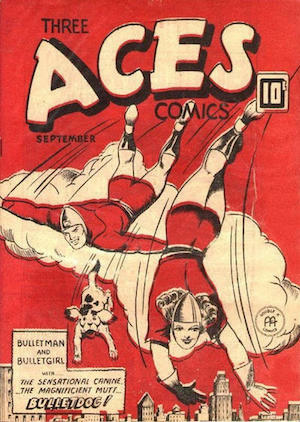 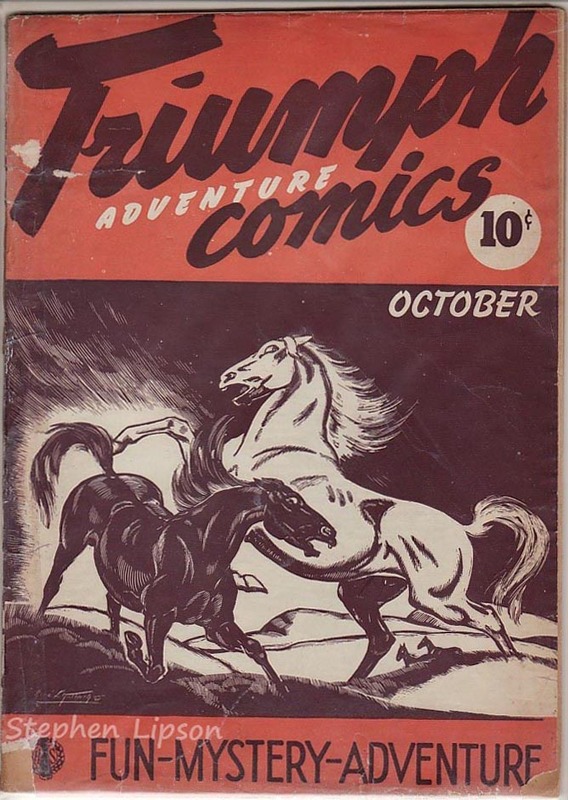 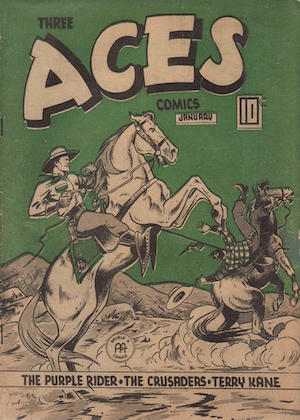 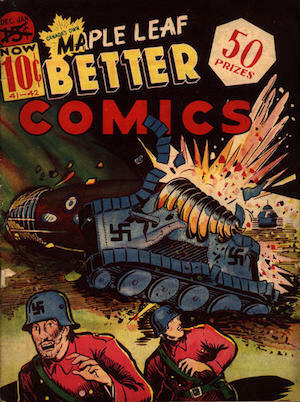 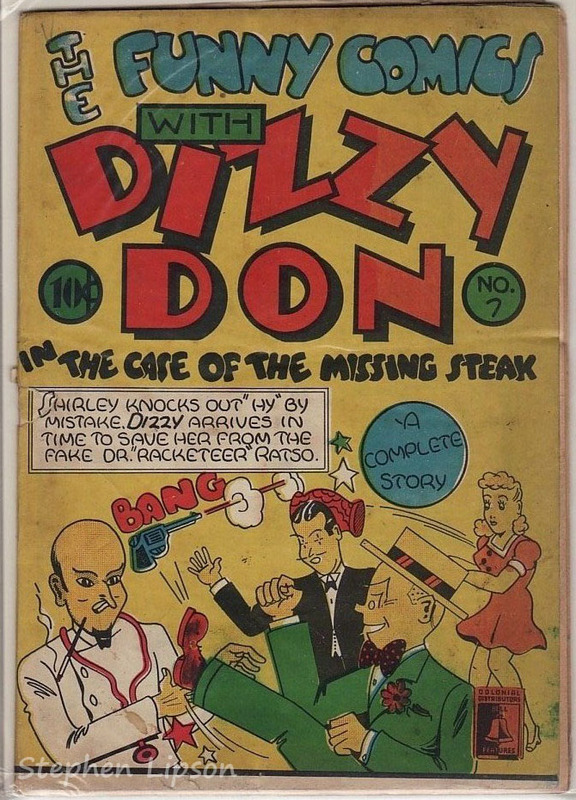 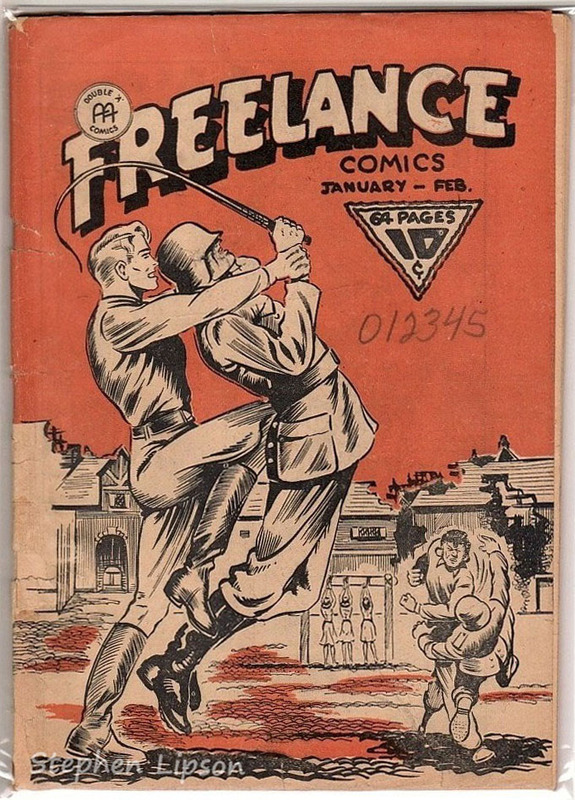 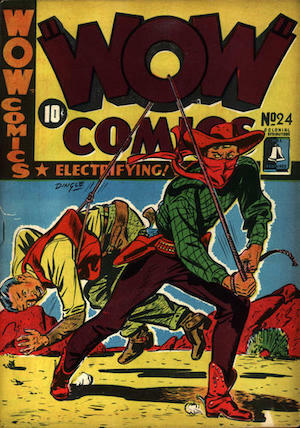 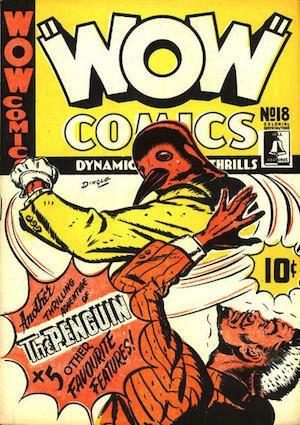 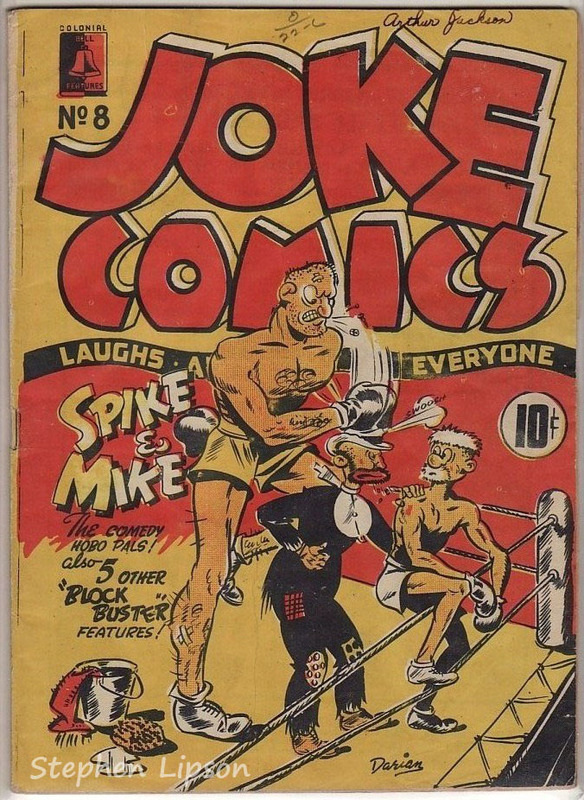 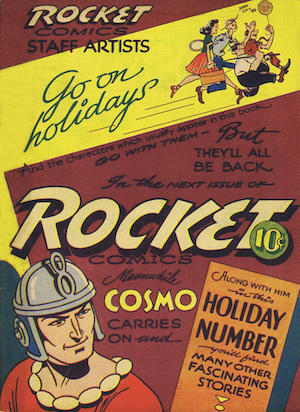 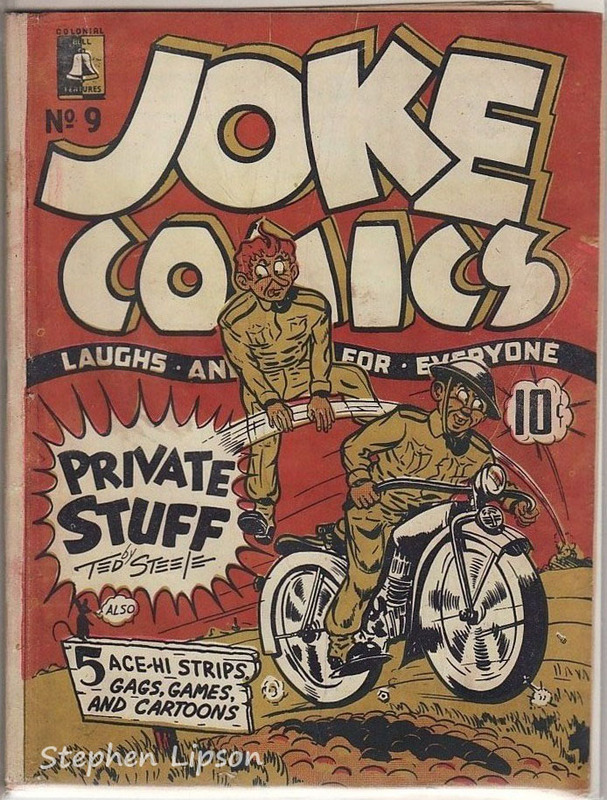 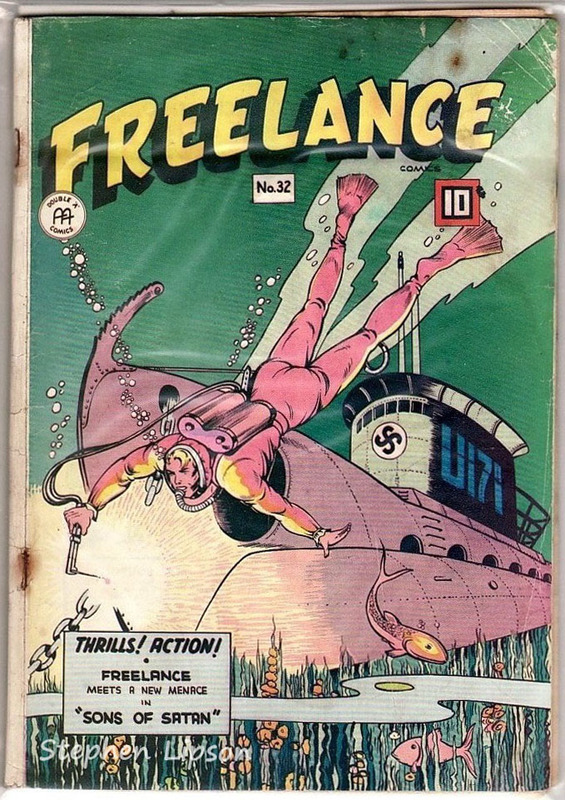 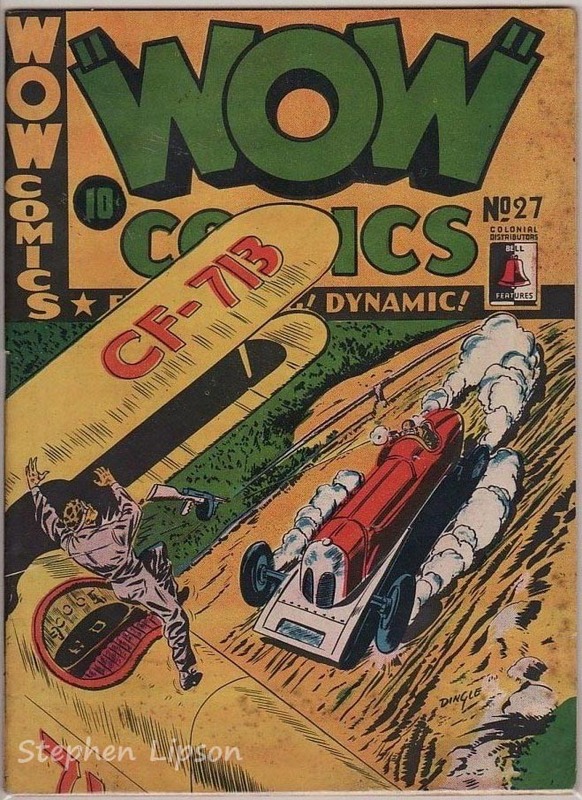 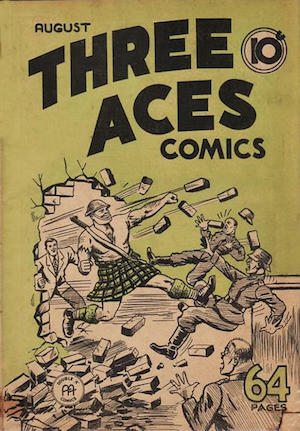 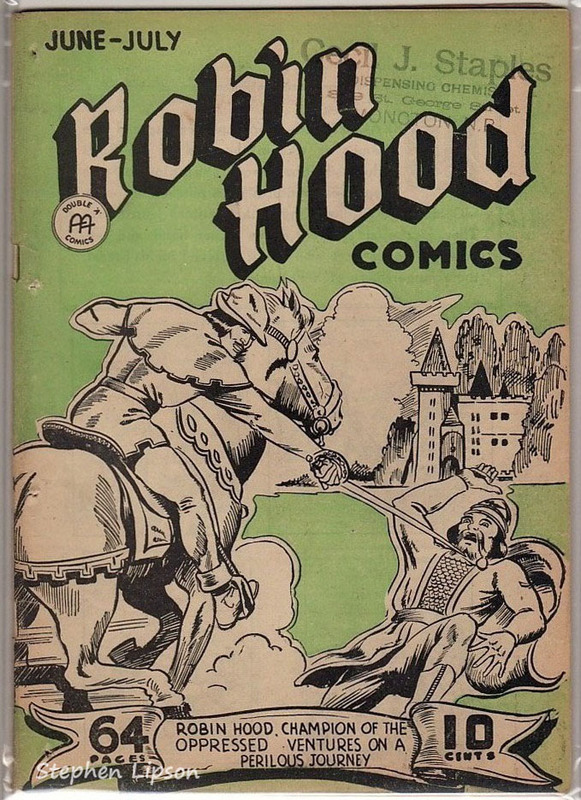 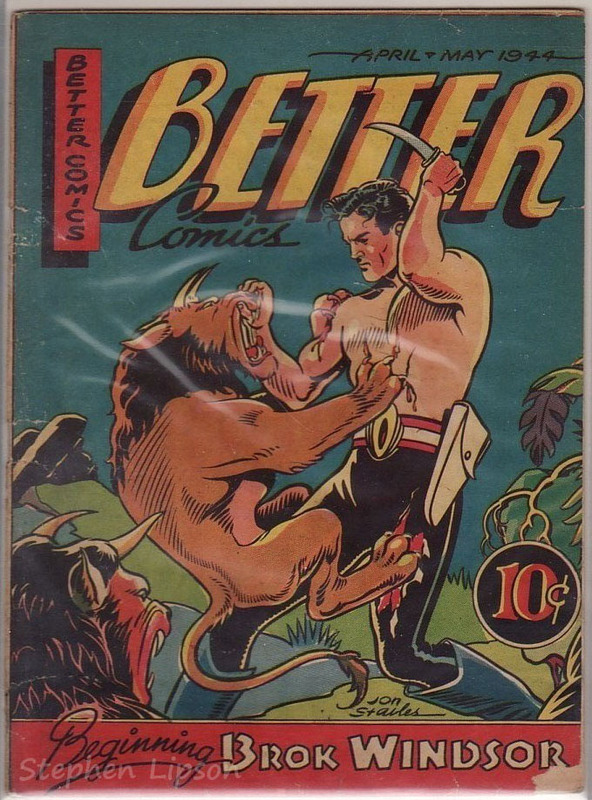 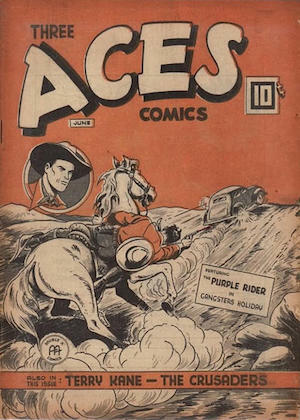 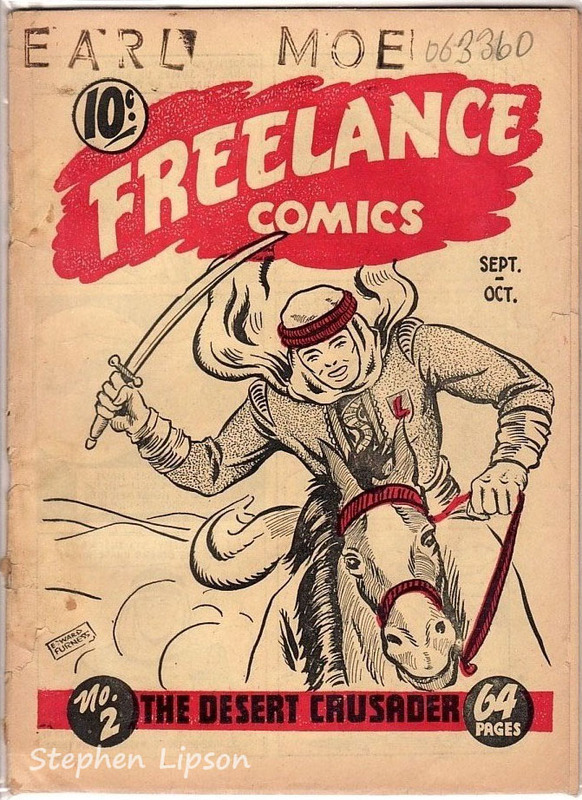 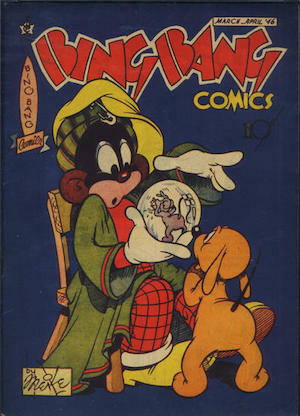 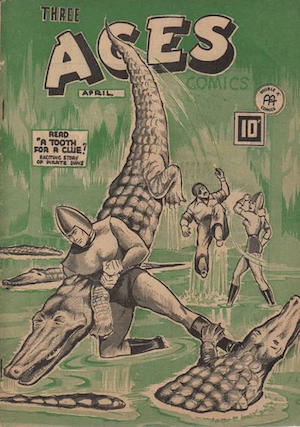 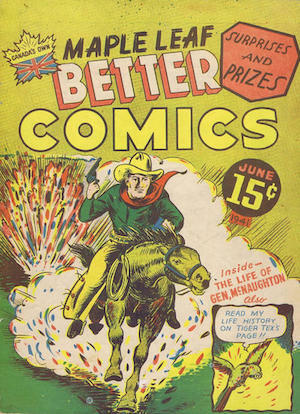 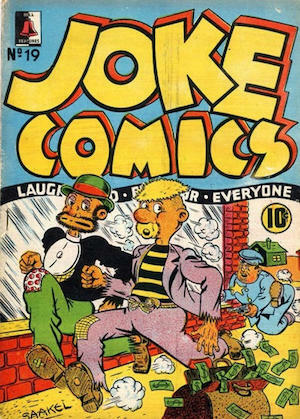 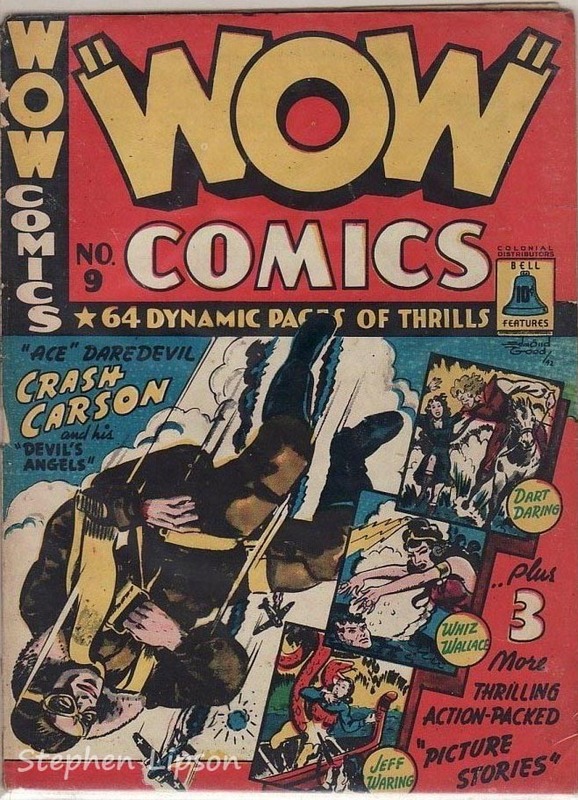 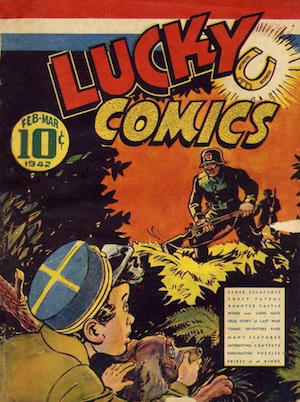 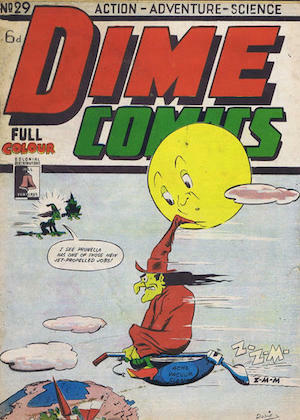 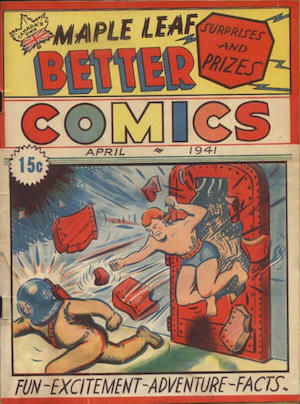 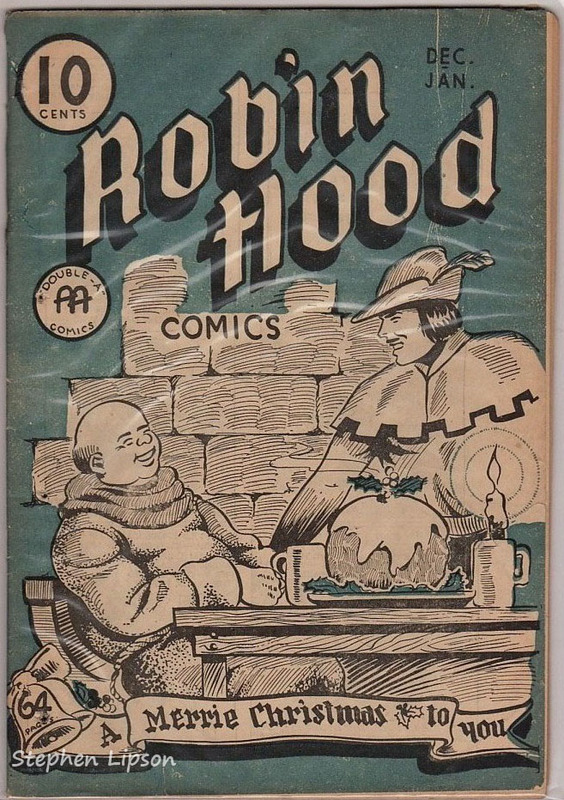 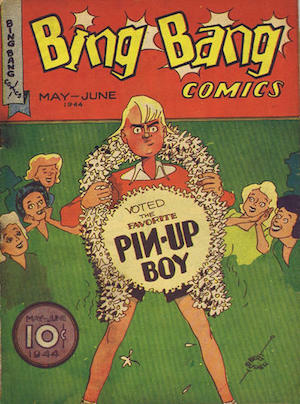 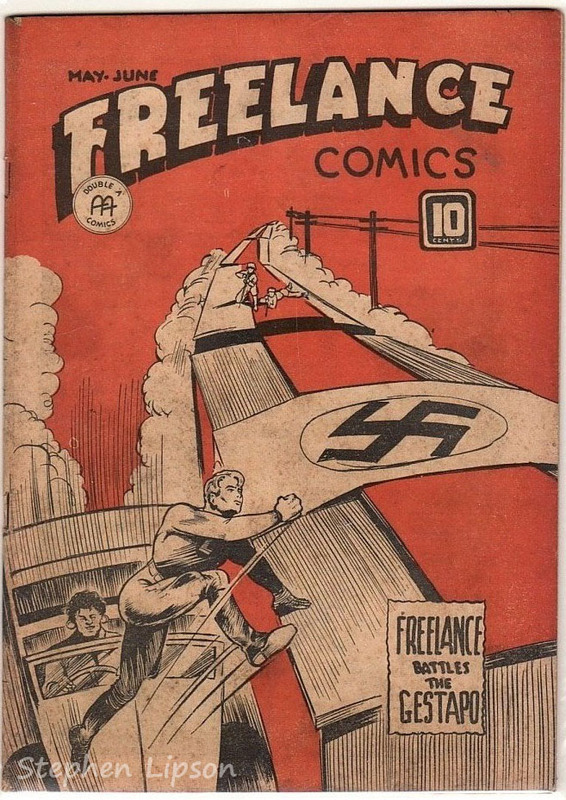 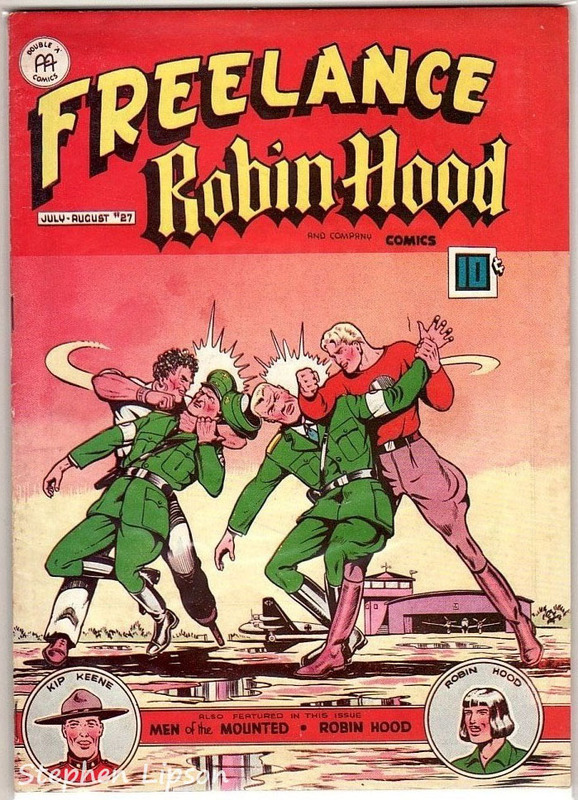 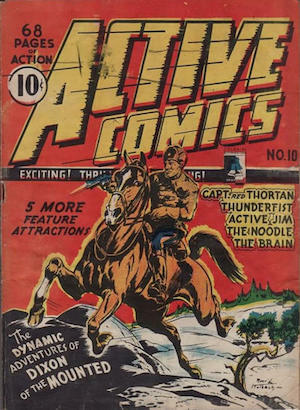 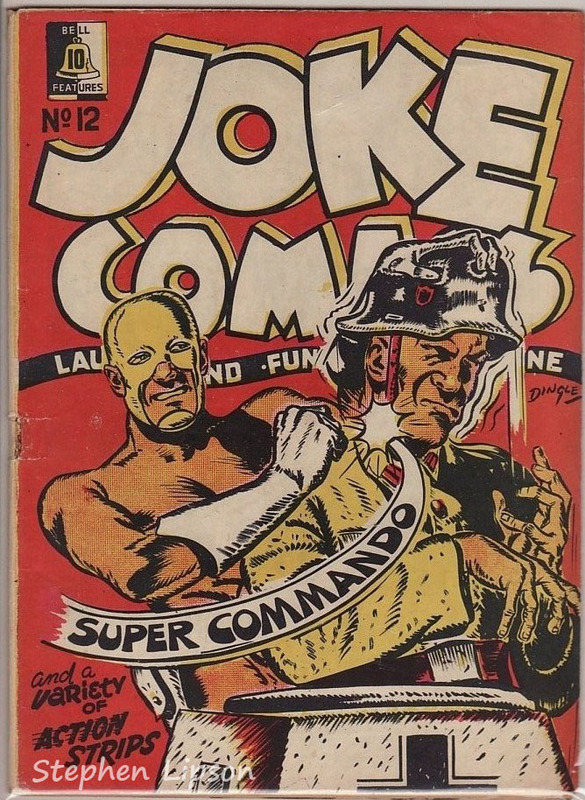 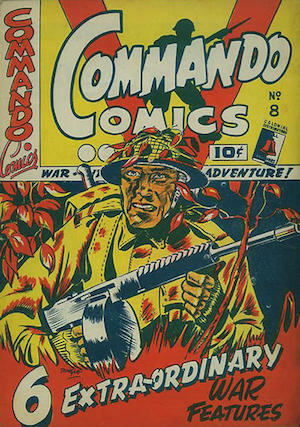 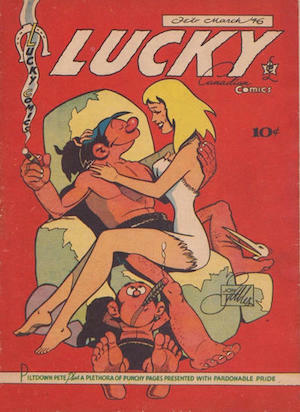 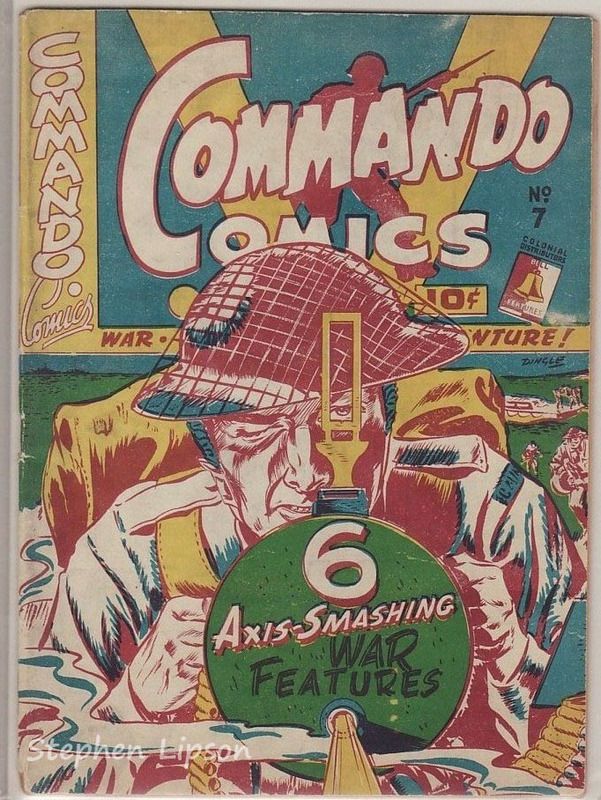 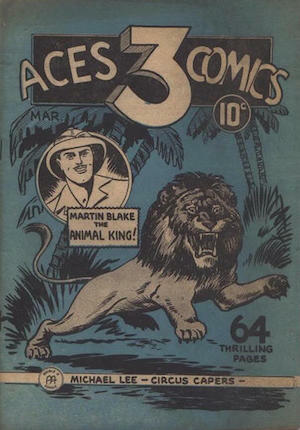 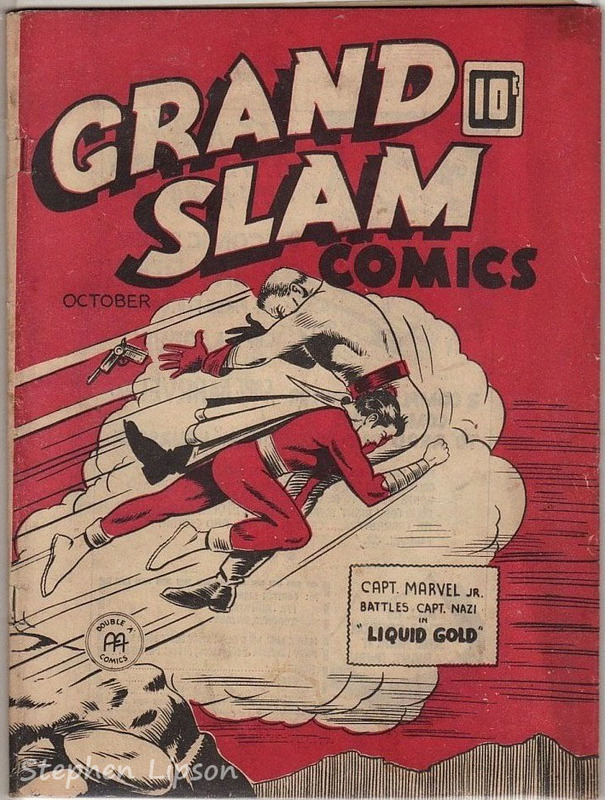 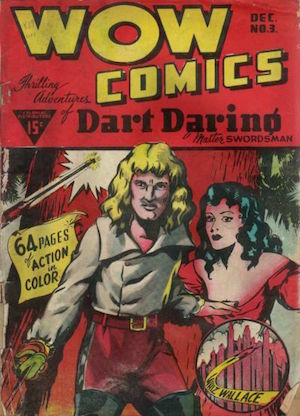 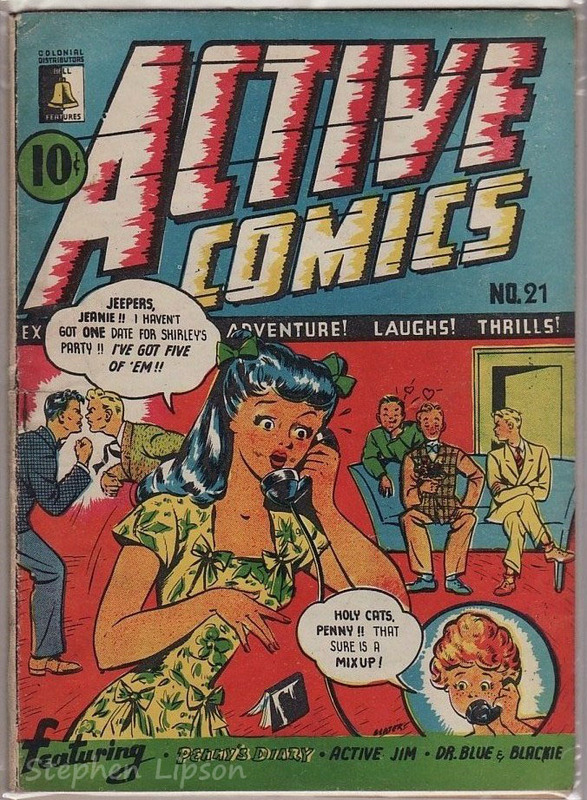 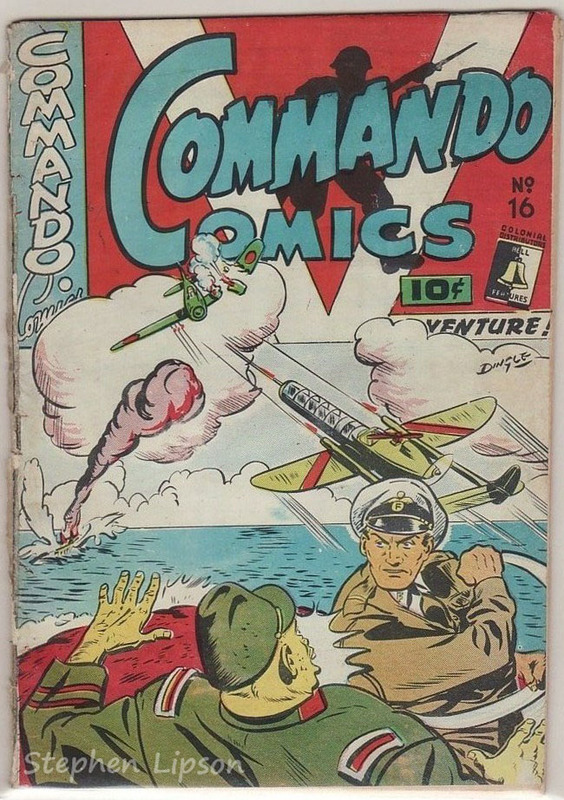 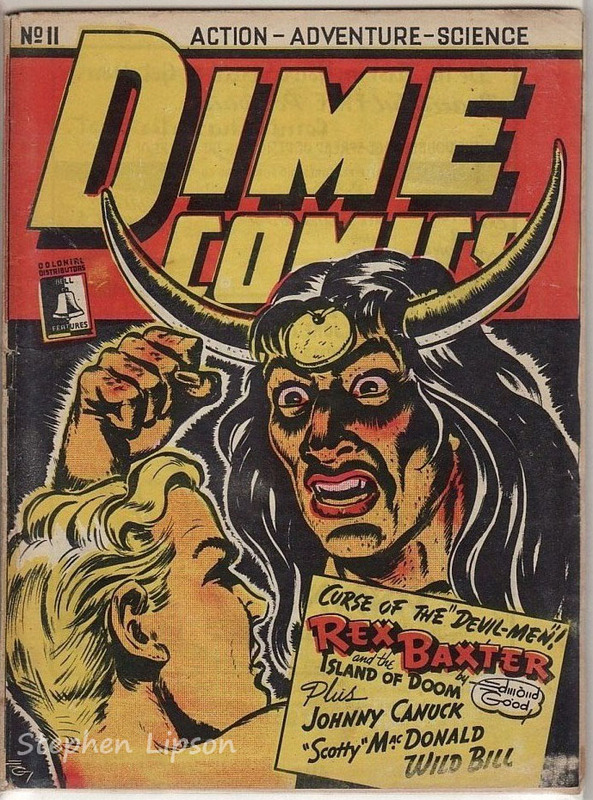 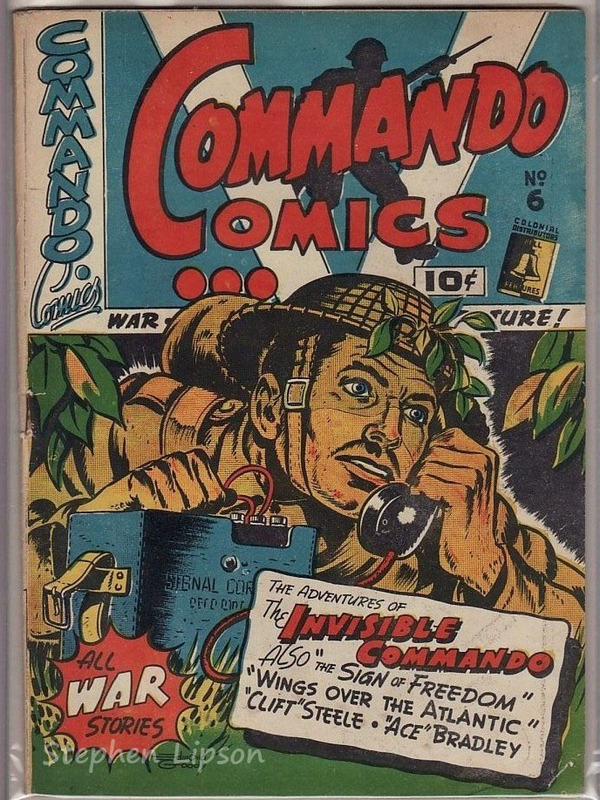 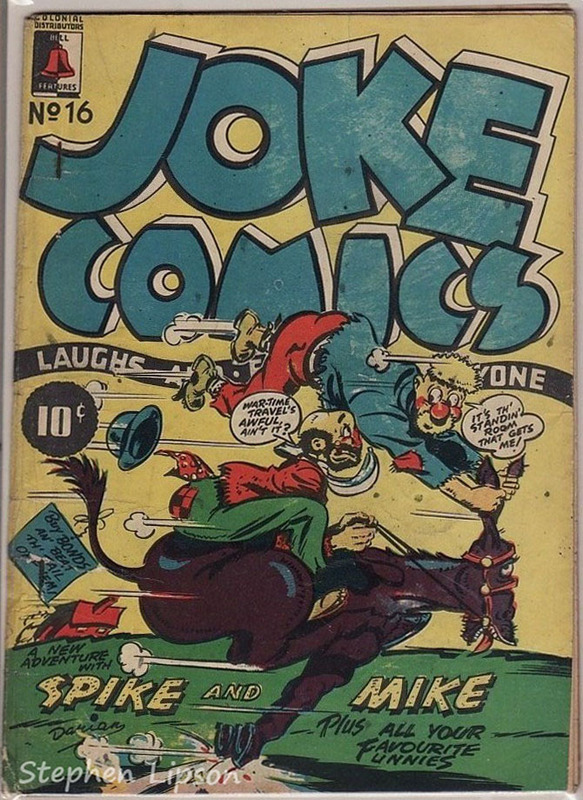 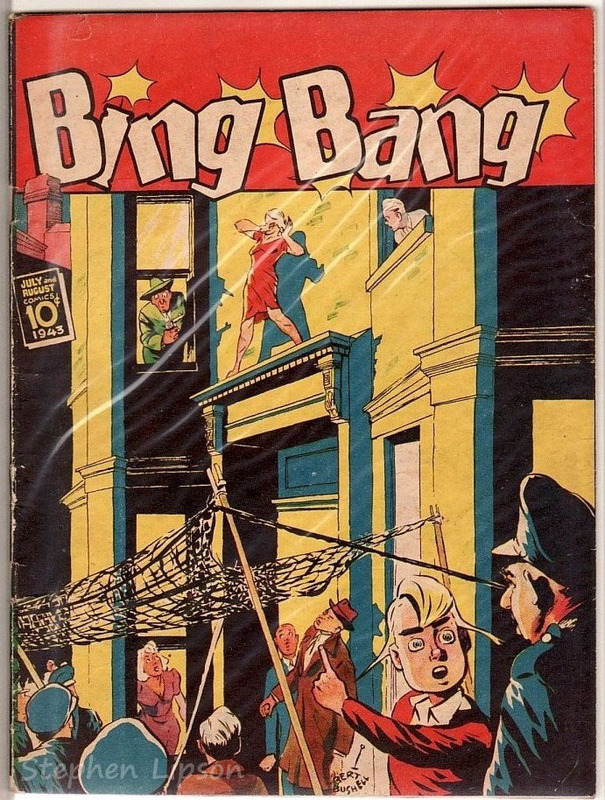 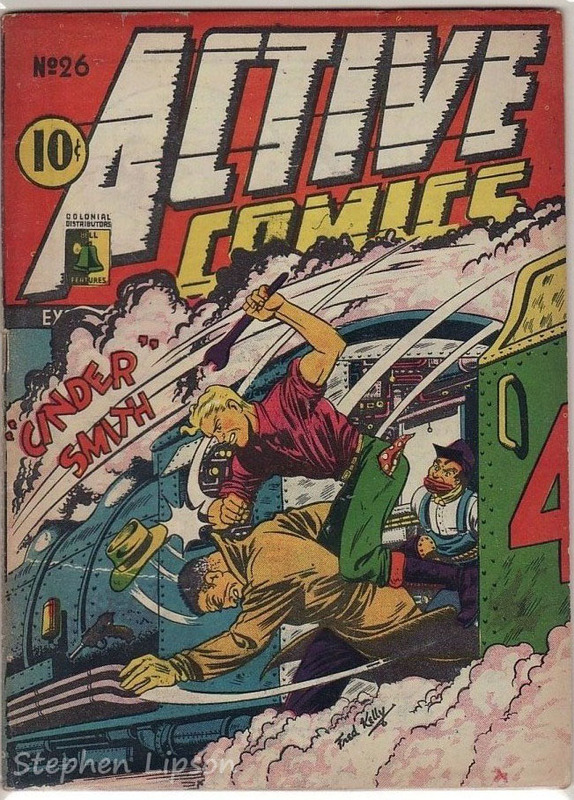 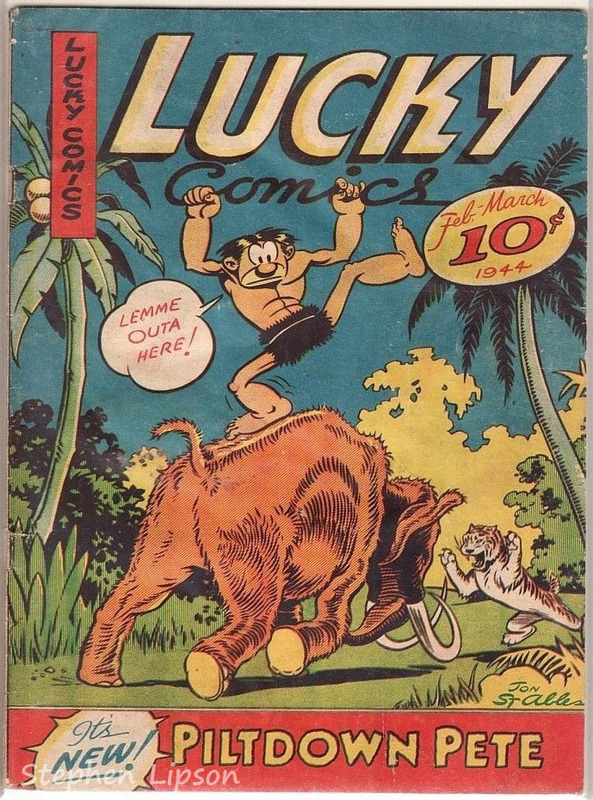 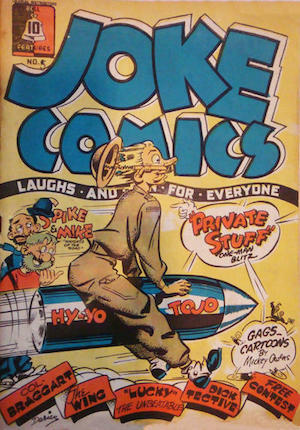 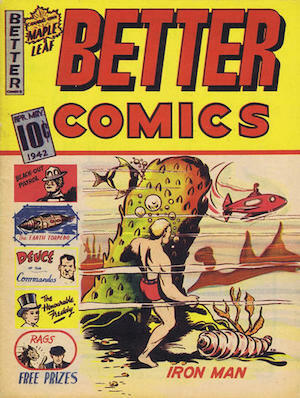 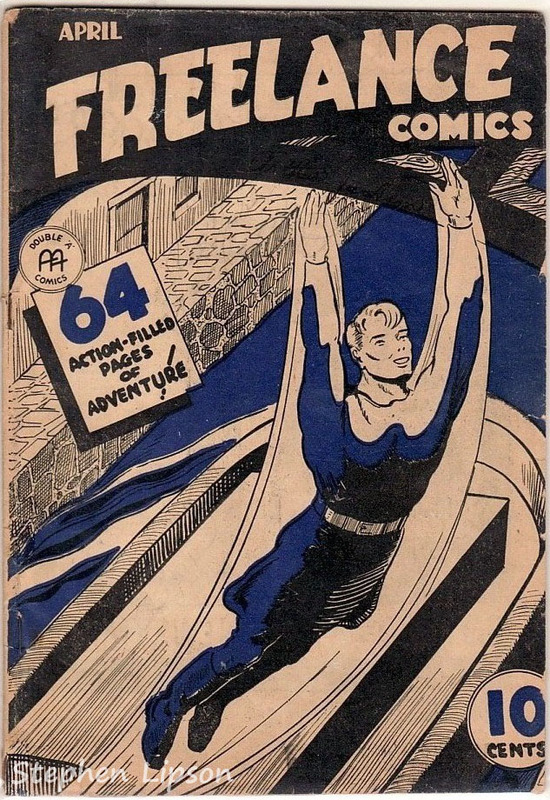 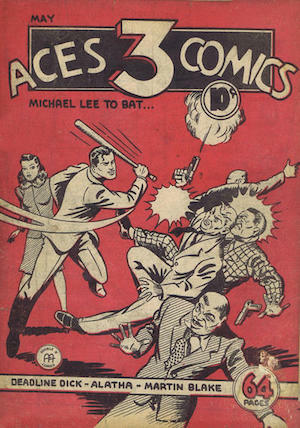 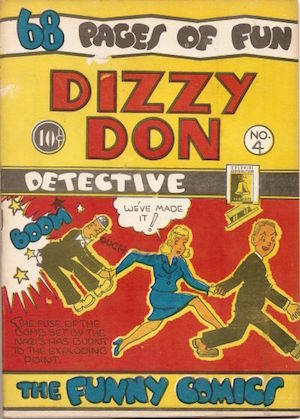 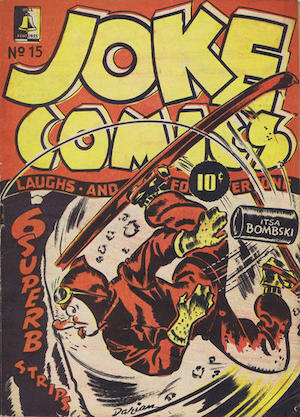 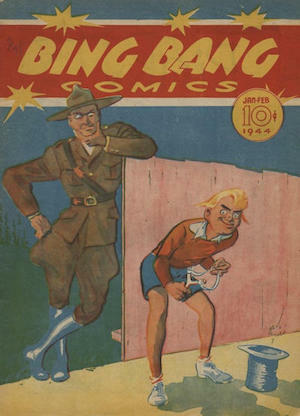 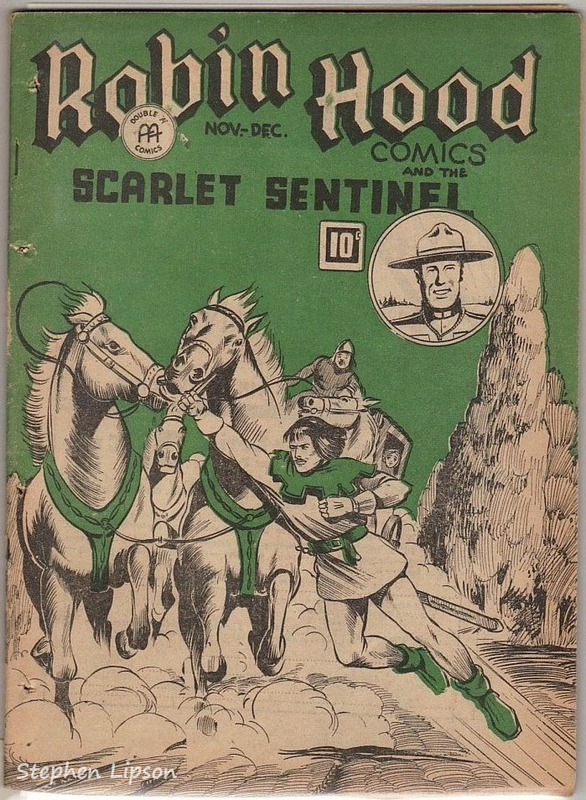 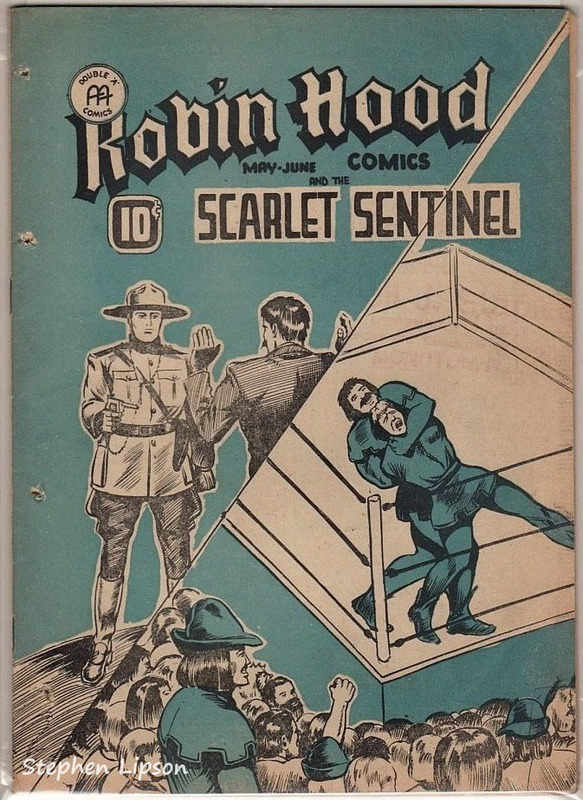 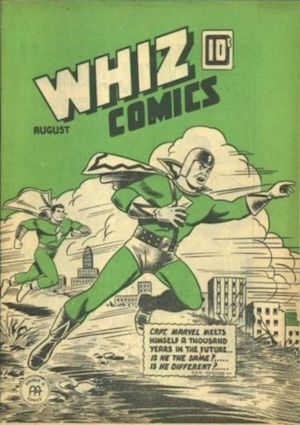 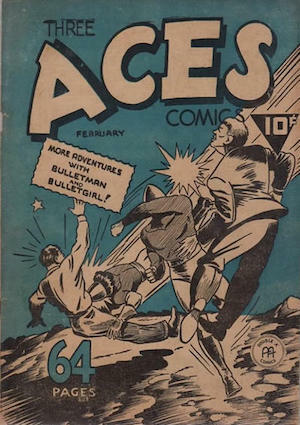 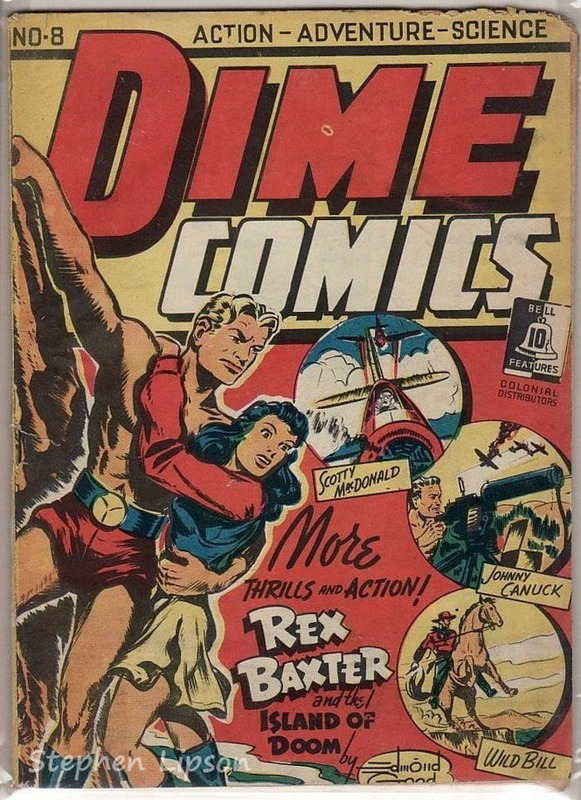 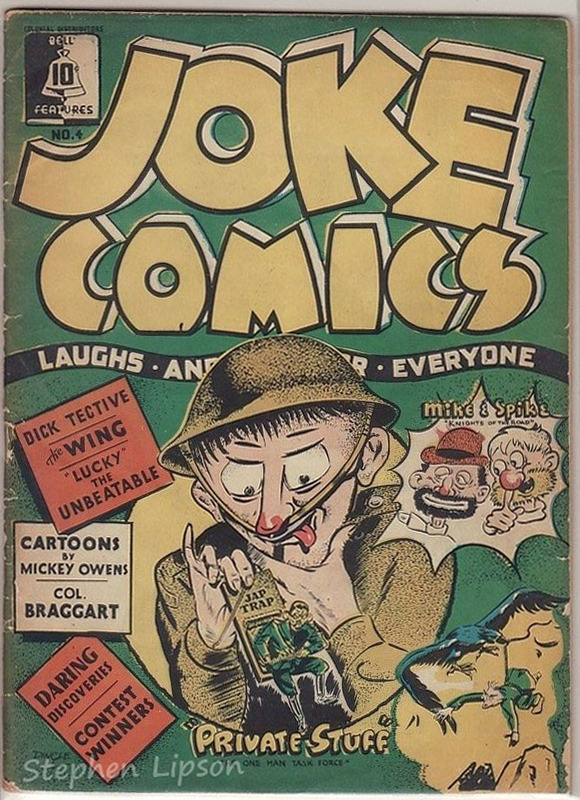 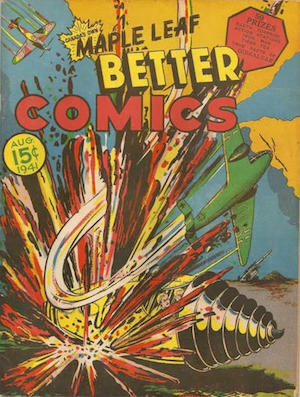 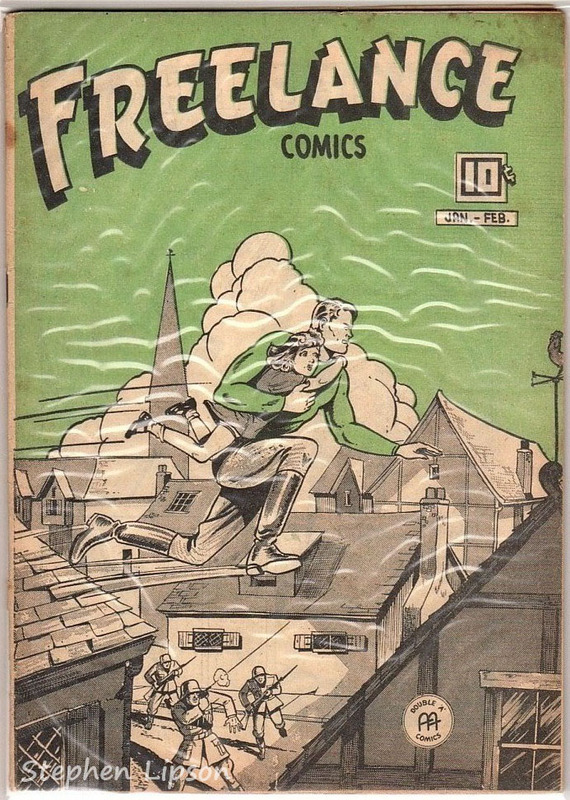 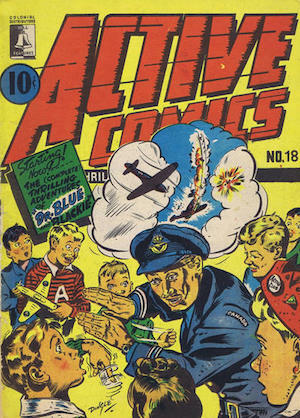 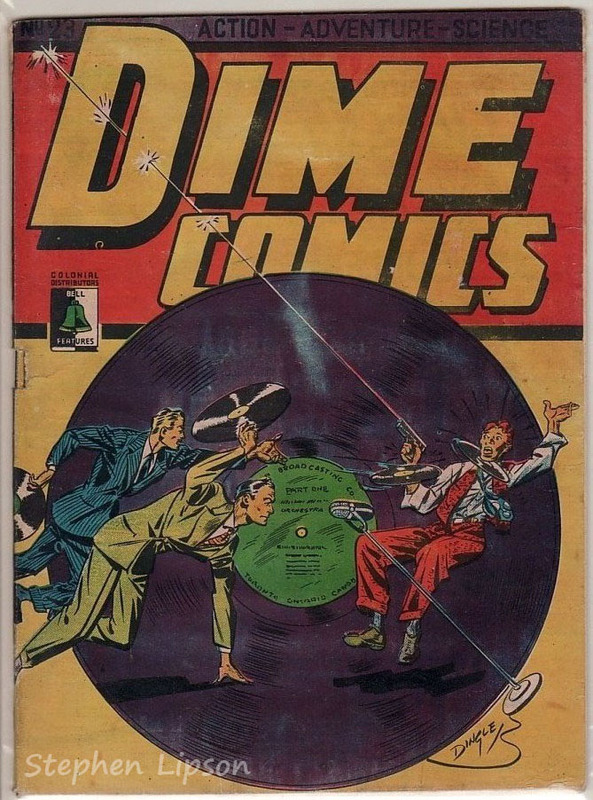 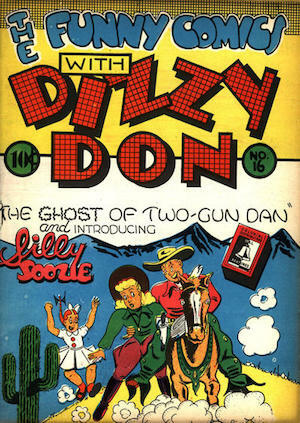 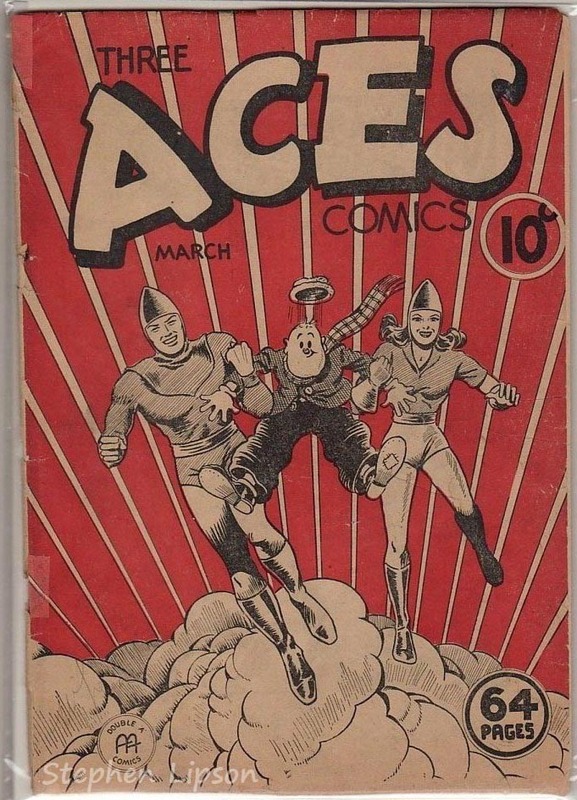 These comics were essentially published with colour covers, with interiors that were published in black and white, in order to defray costly publishing expenses. 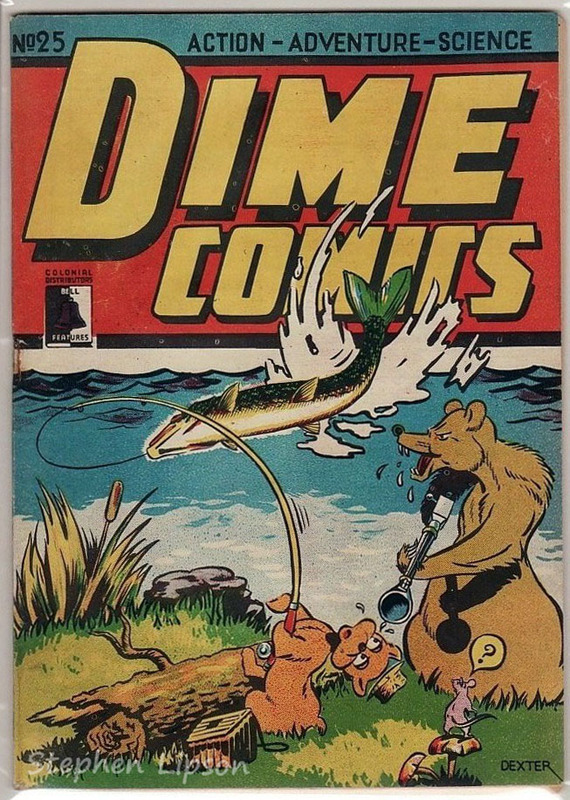 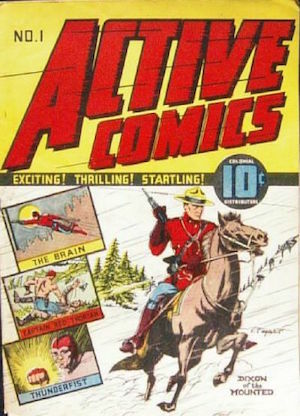 Hence, these comics are now referred to as Canadian Whites by both collectors and historians alike. 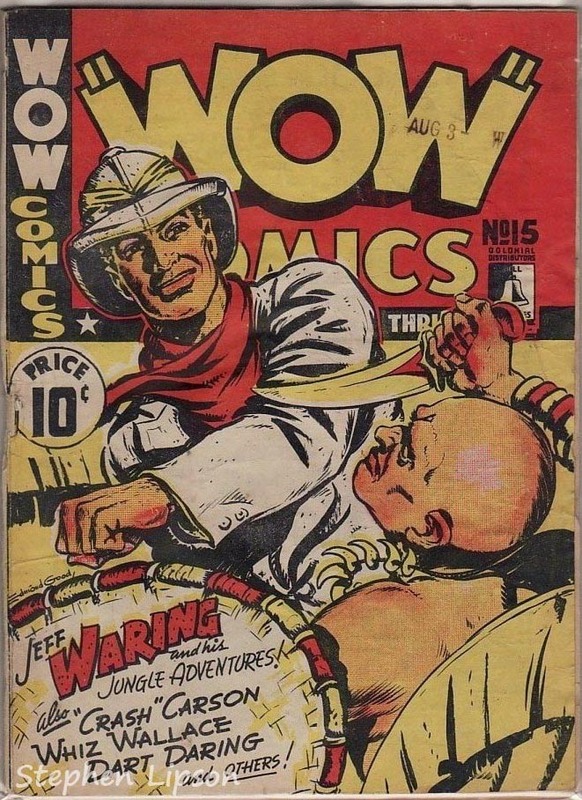 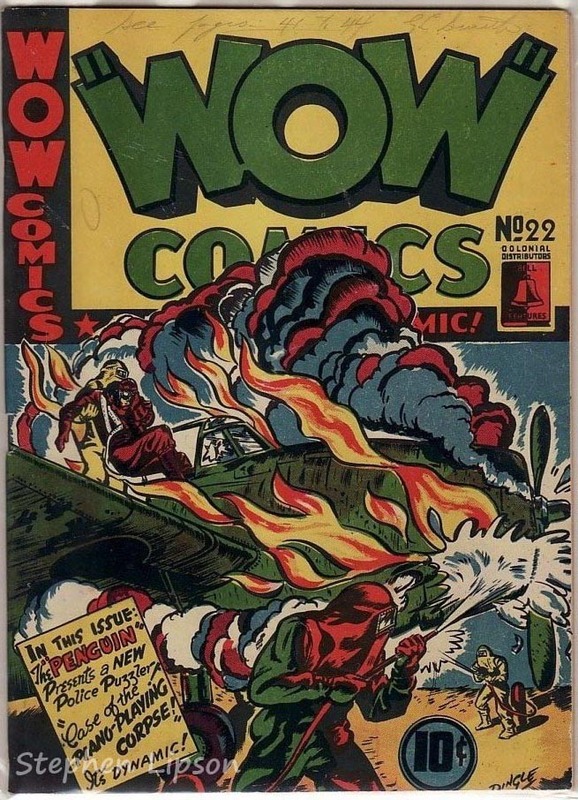 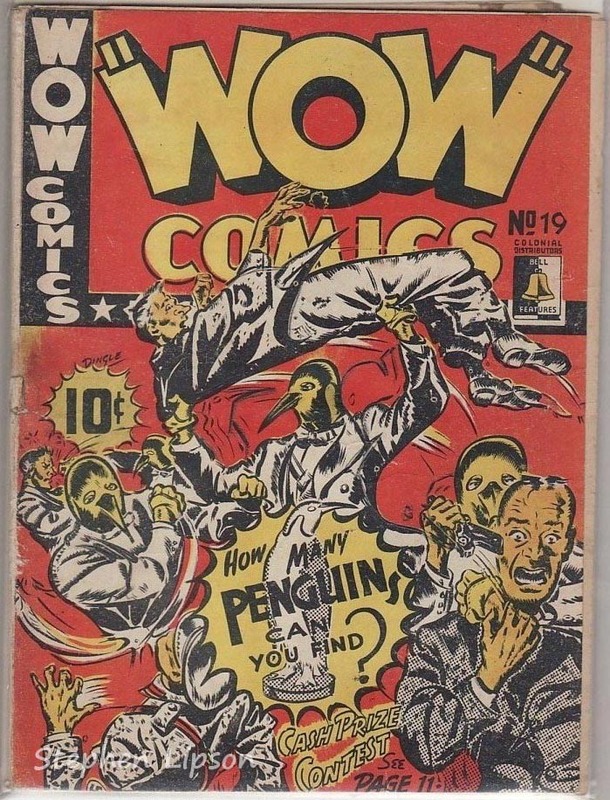 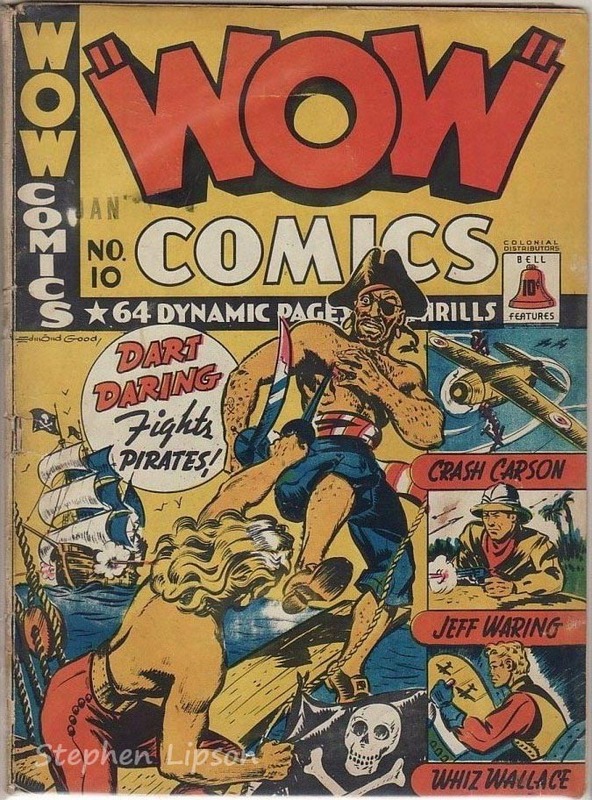 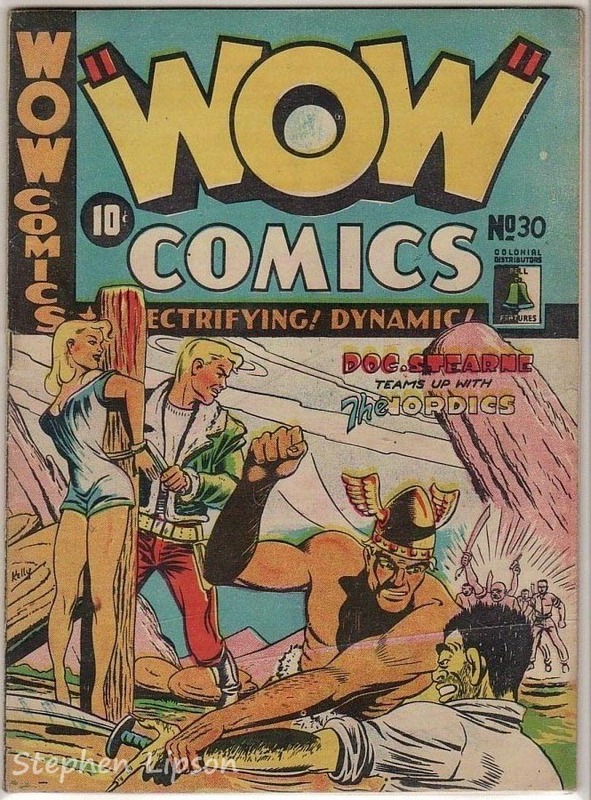 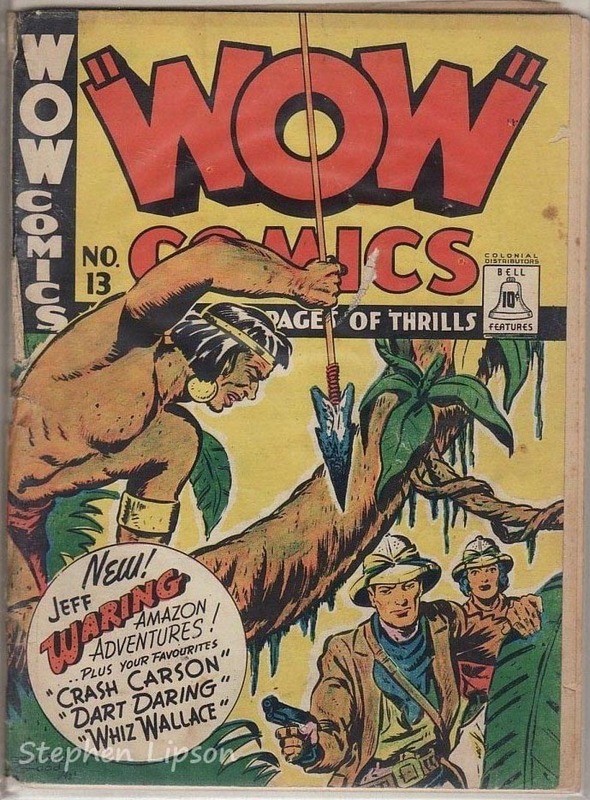 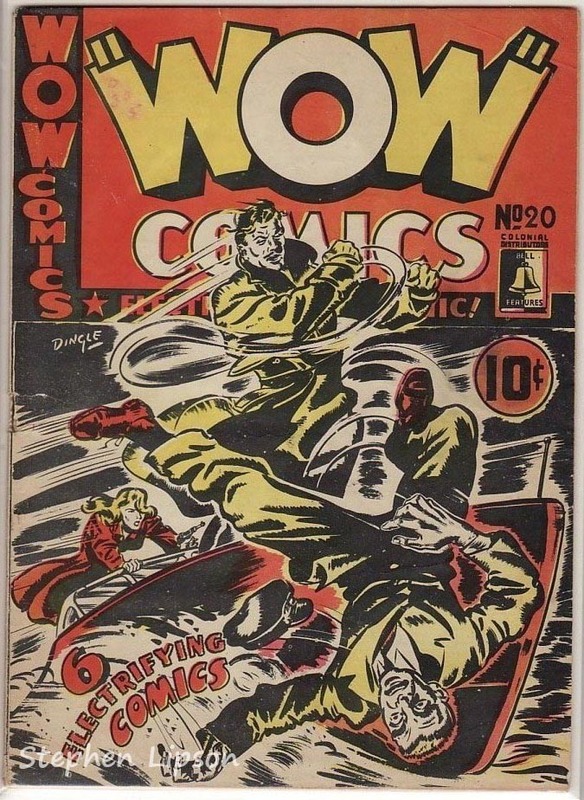 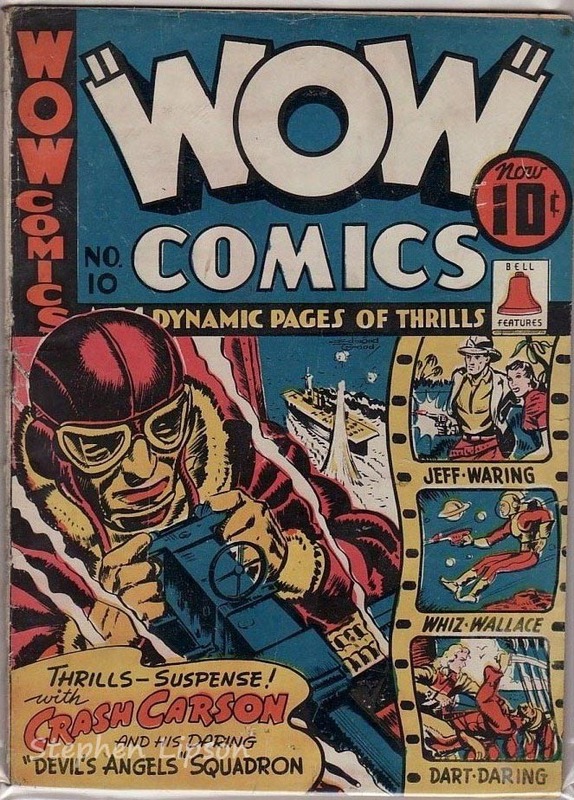 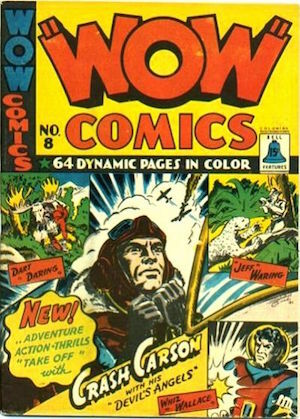 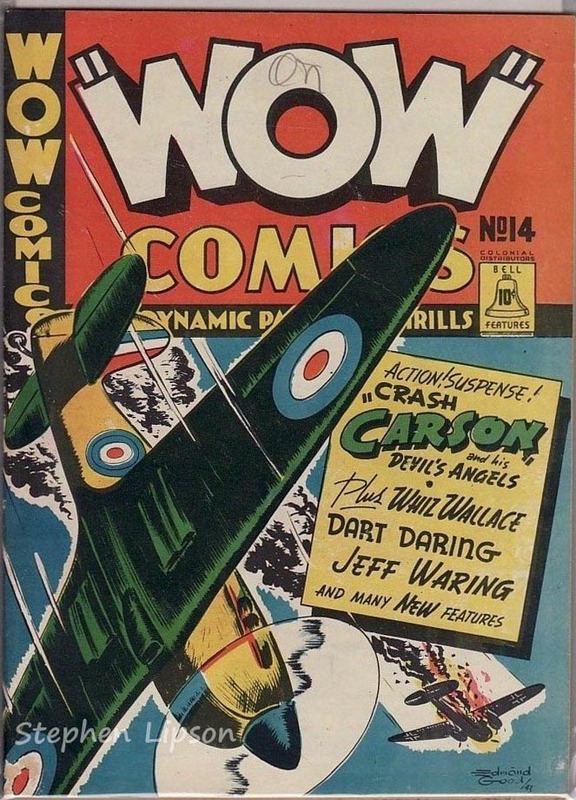 That said, the very early issues of Wow Comics published by Bell Features and the very early issues of Better Comics published by Maple Leaf sport colour interiors. 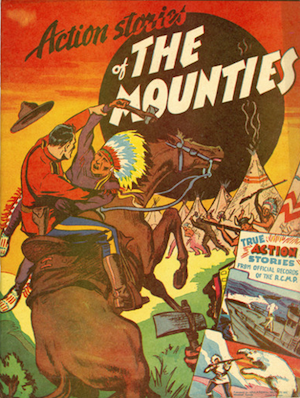 Found Any Canadian Whites? 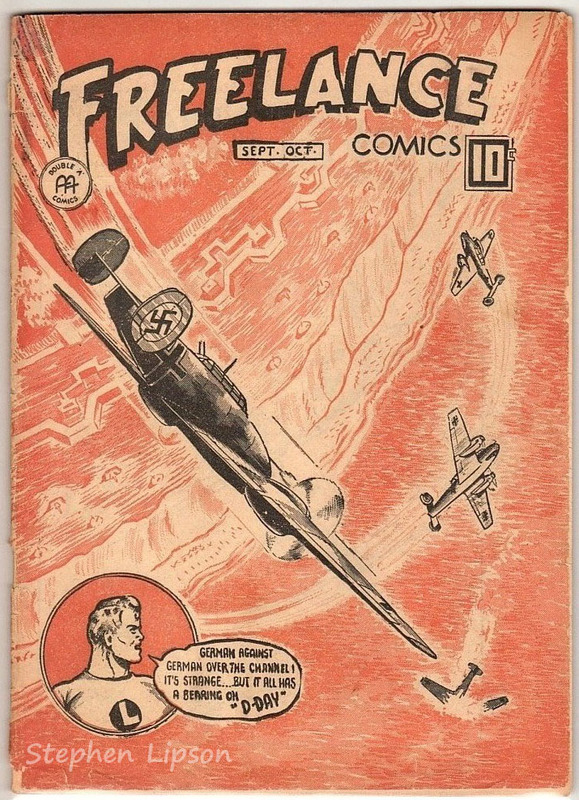 Sell Them To Us! 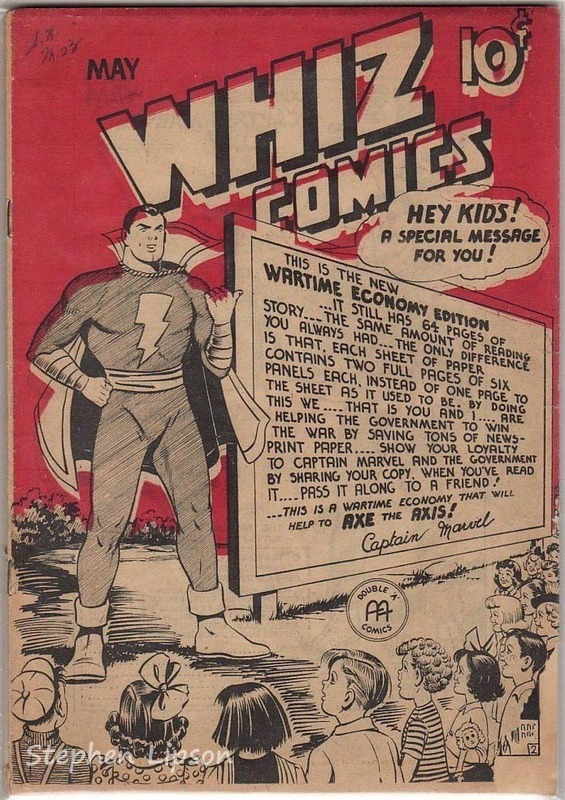 It doesn't matter how poor their condition, we're buying any and all Canadian Whites! 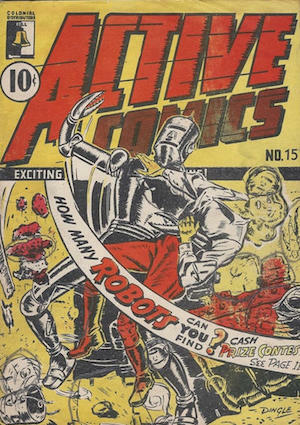 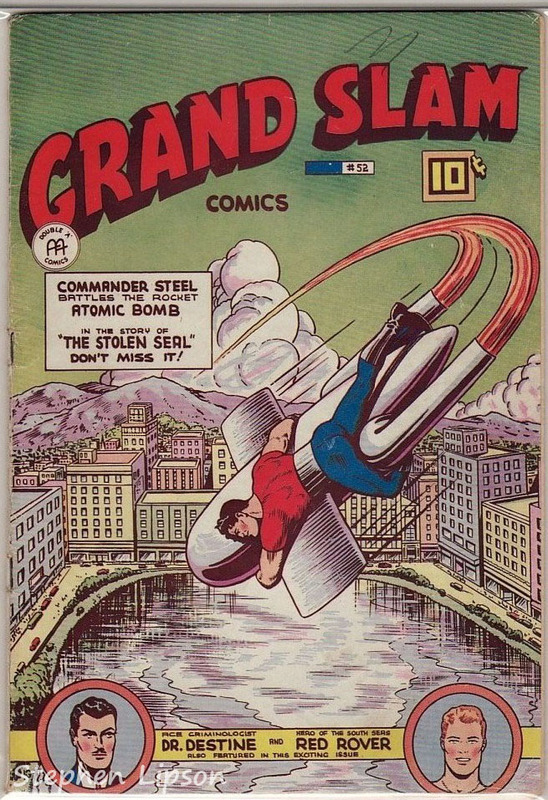 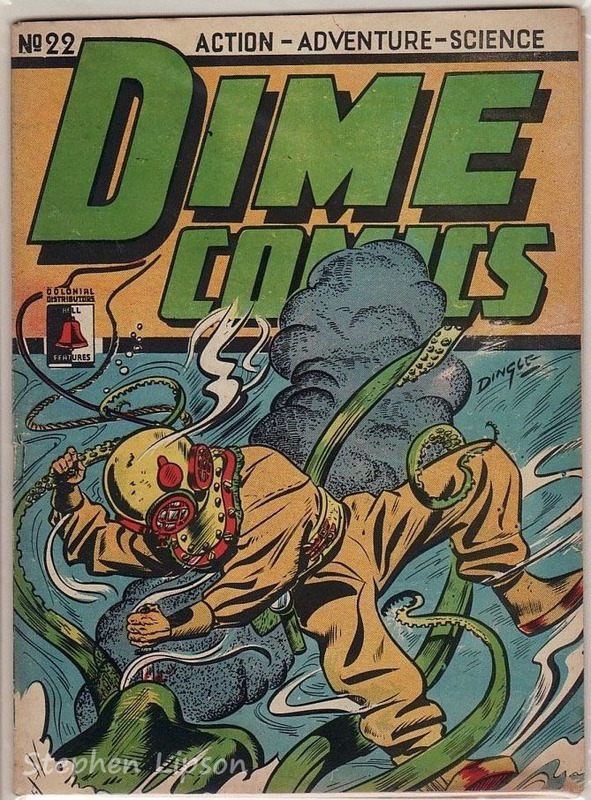 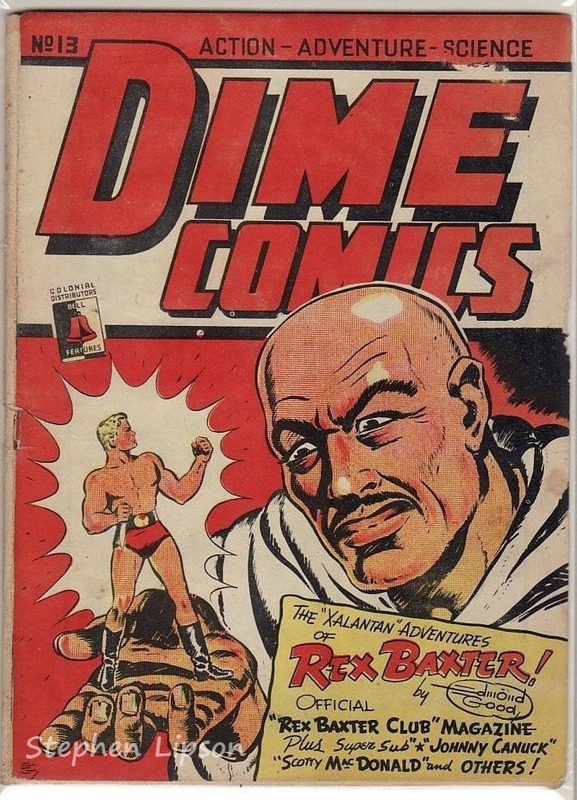 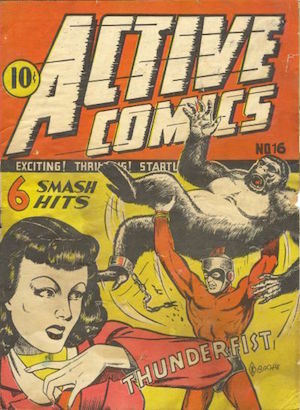 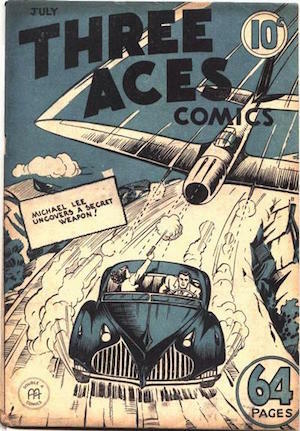 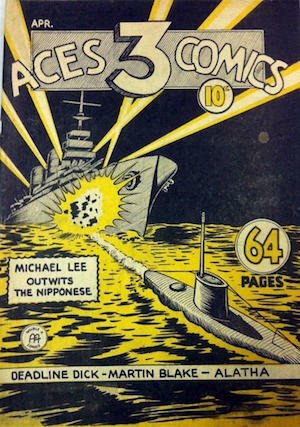 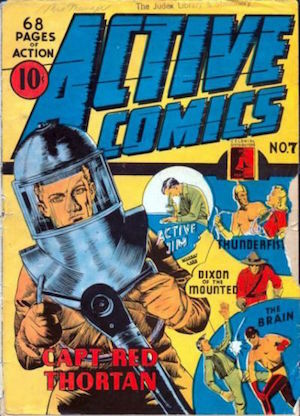 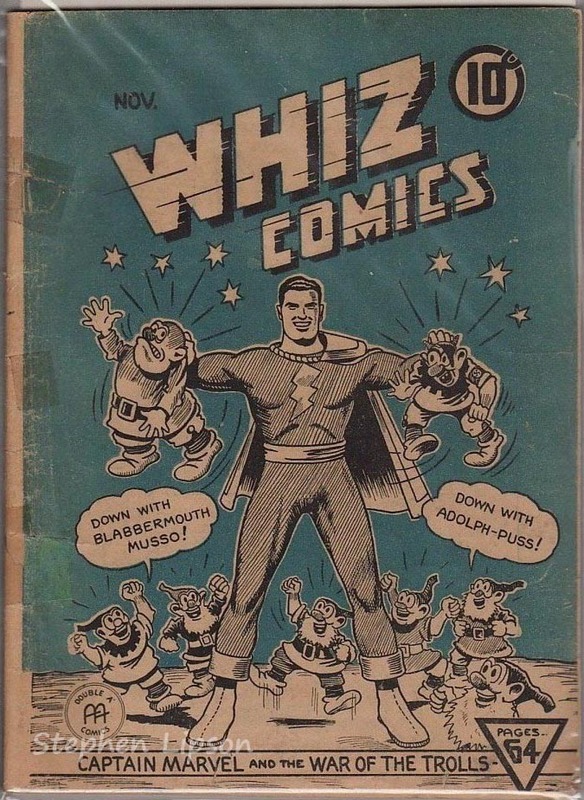 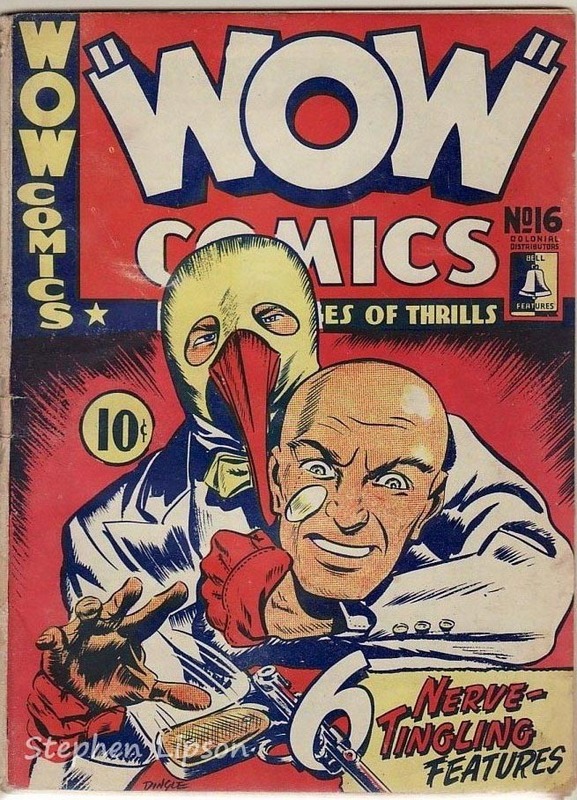 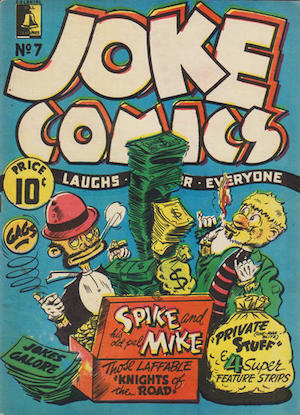 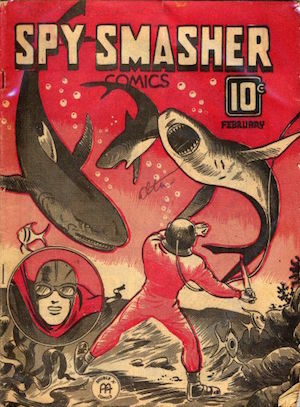 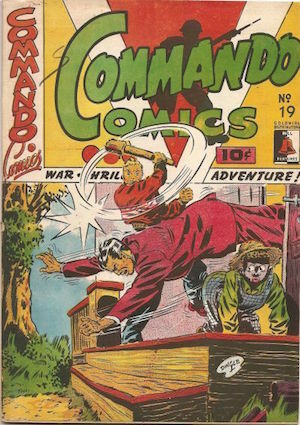 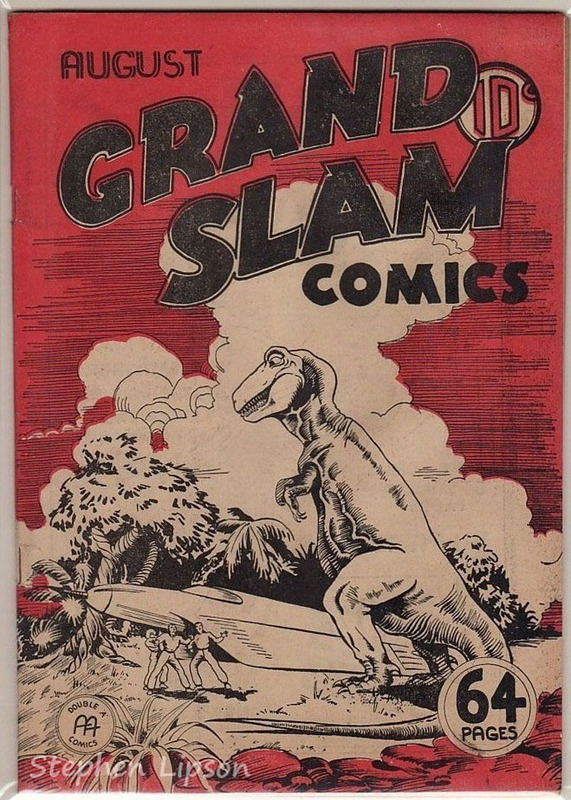 if you've found some of these great old comics, we want to buy them. 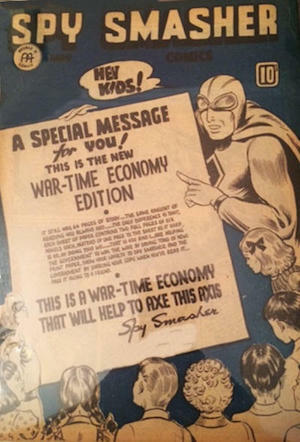 Please click here to contact us for a free appraisal. 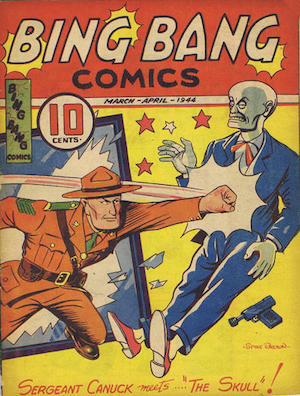 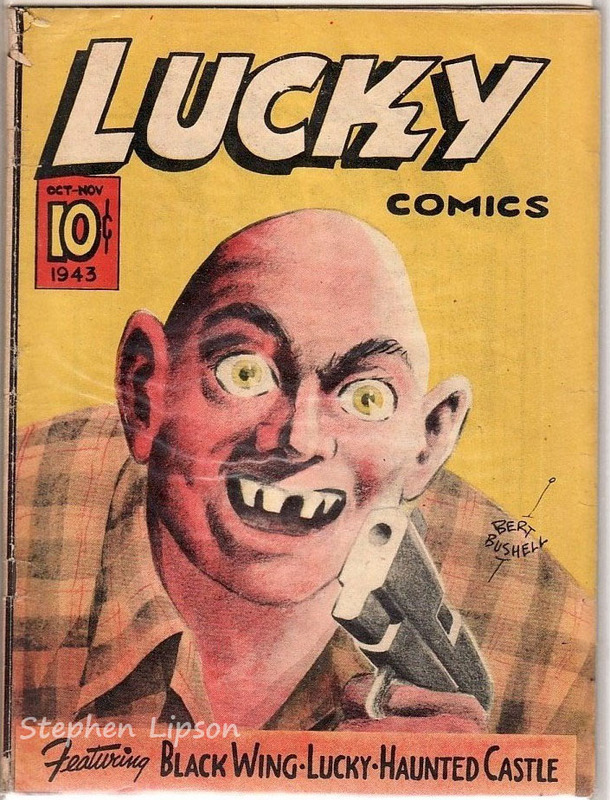 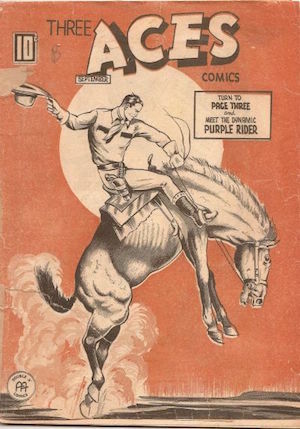 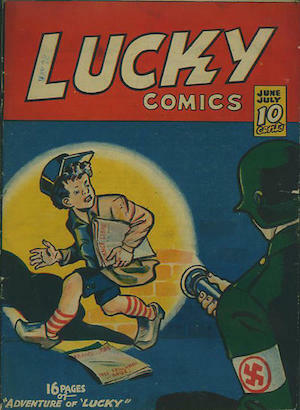 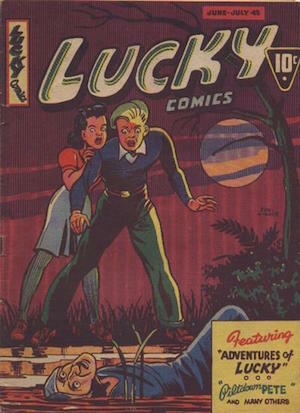 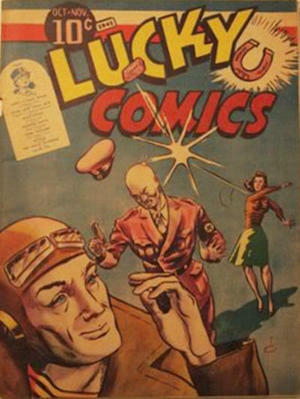 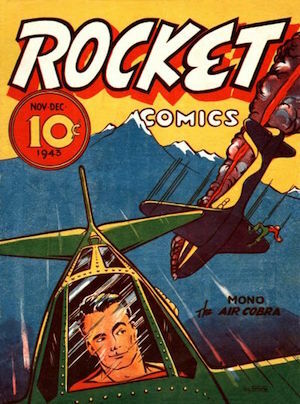 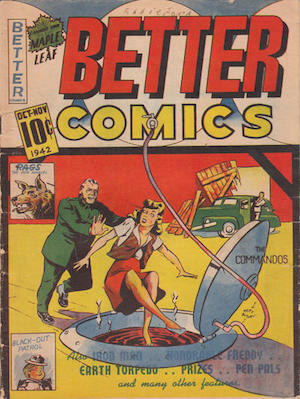 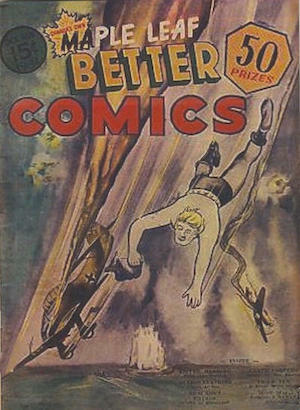 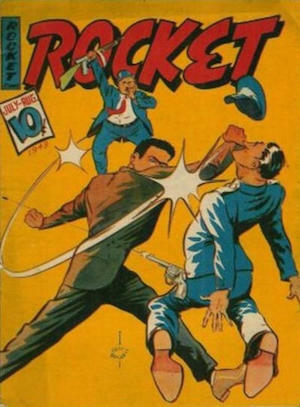 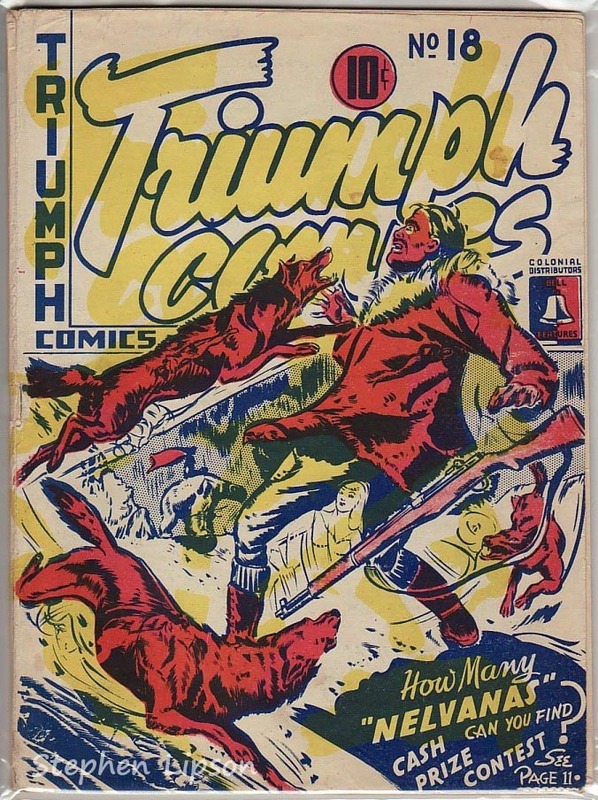 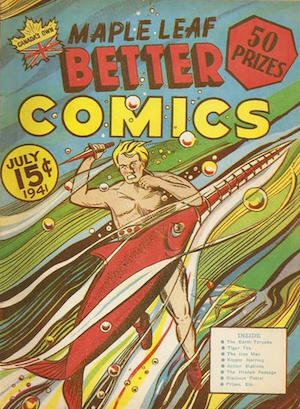 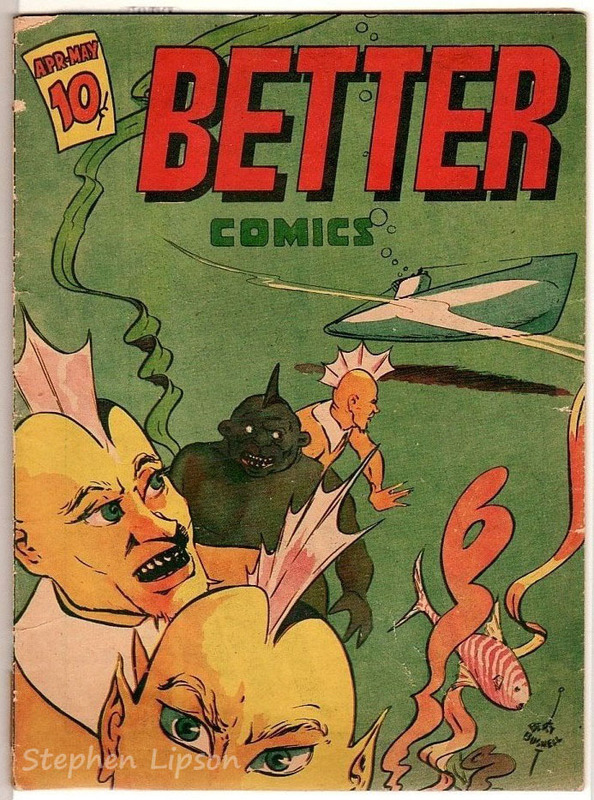 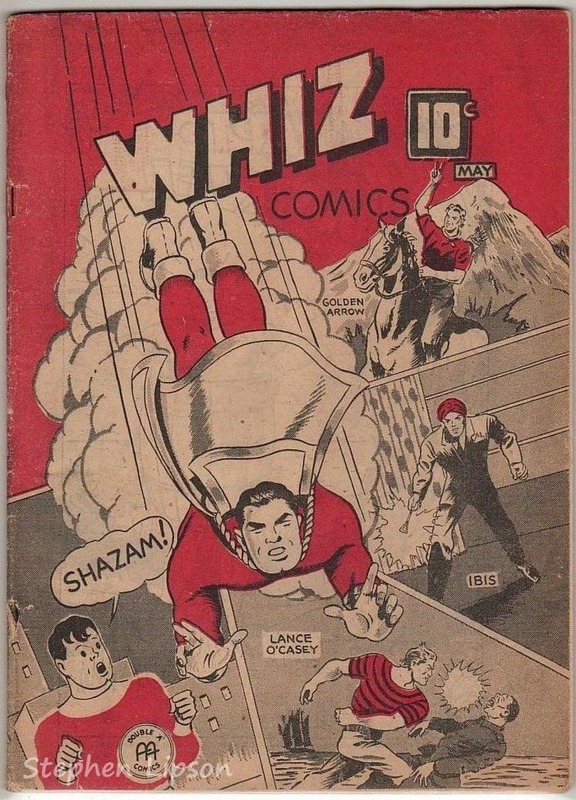 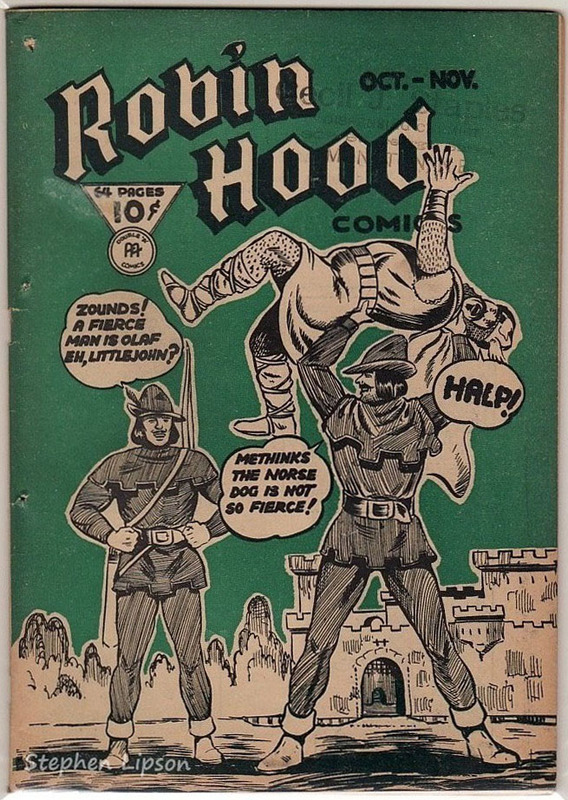 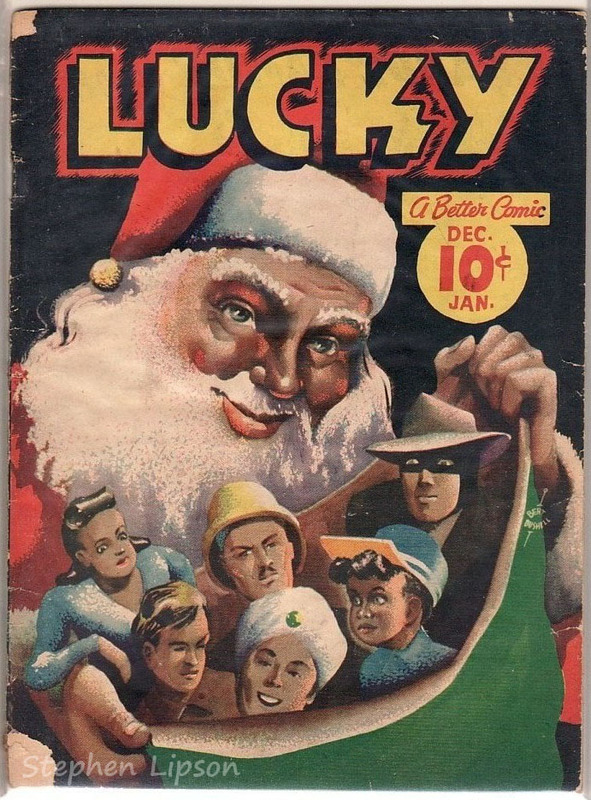 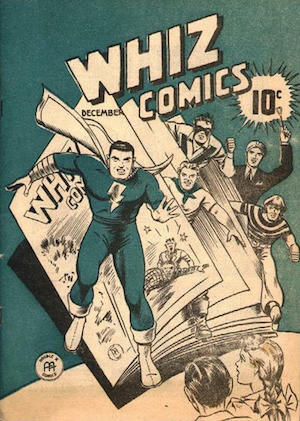 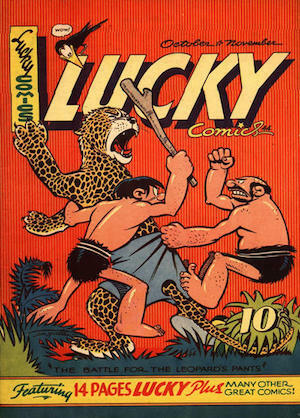 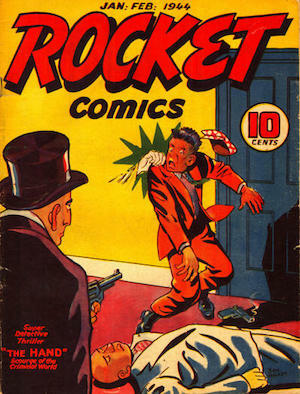 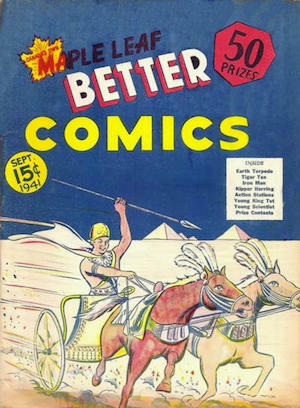 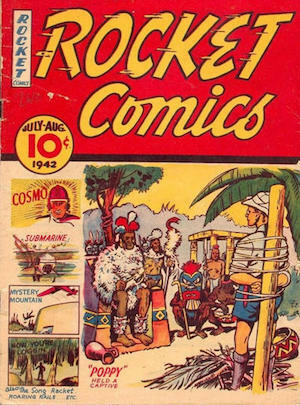 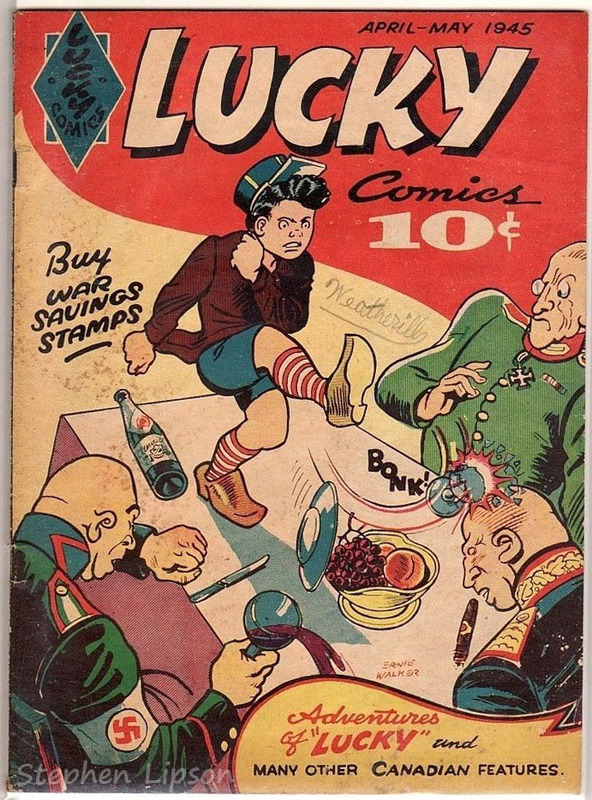 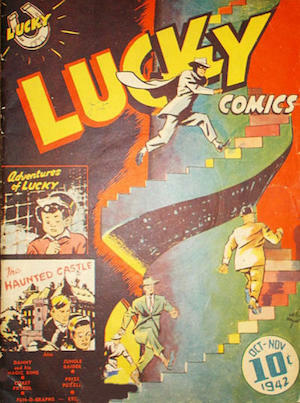 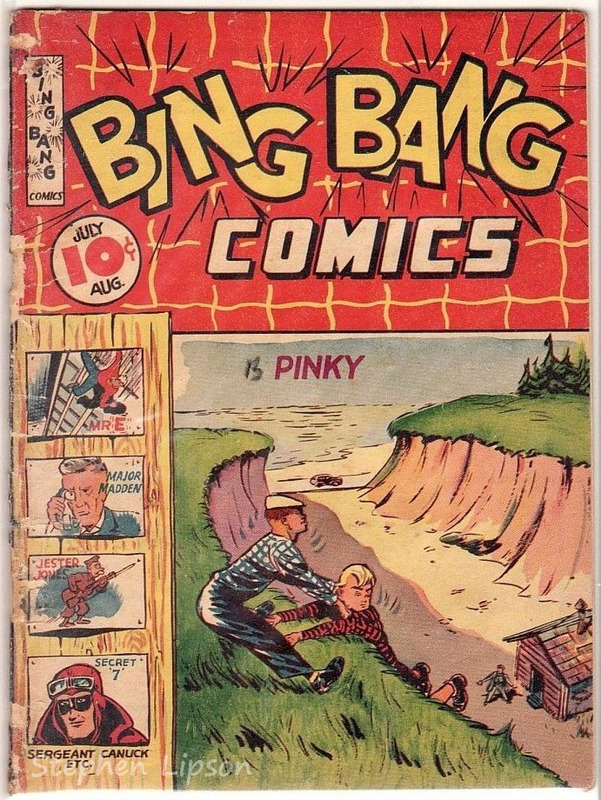 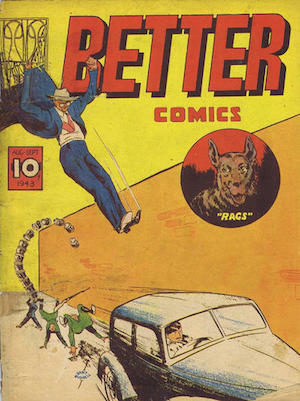 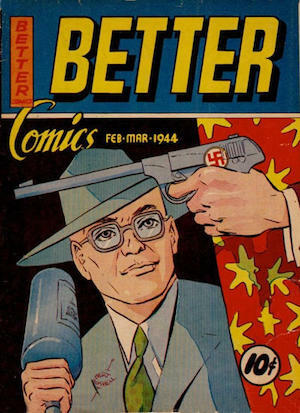 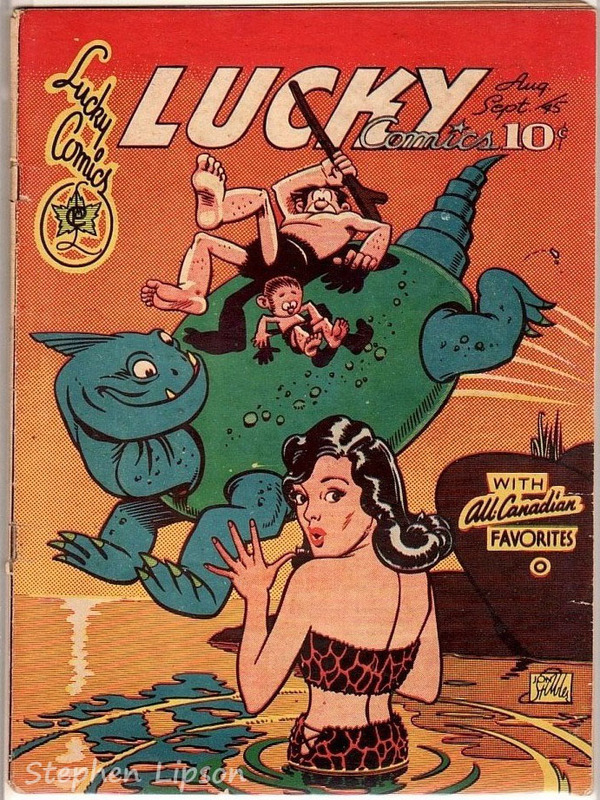 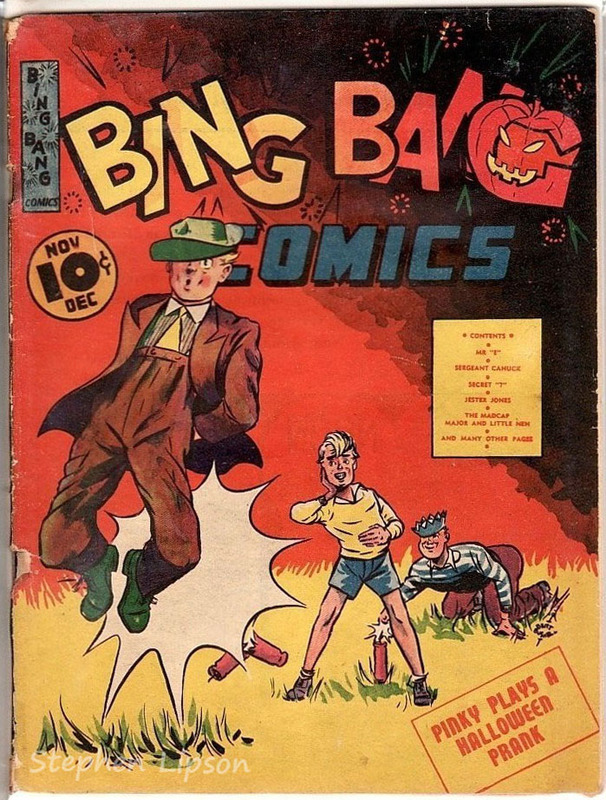 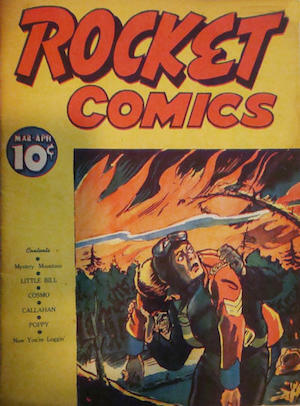 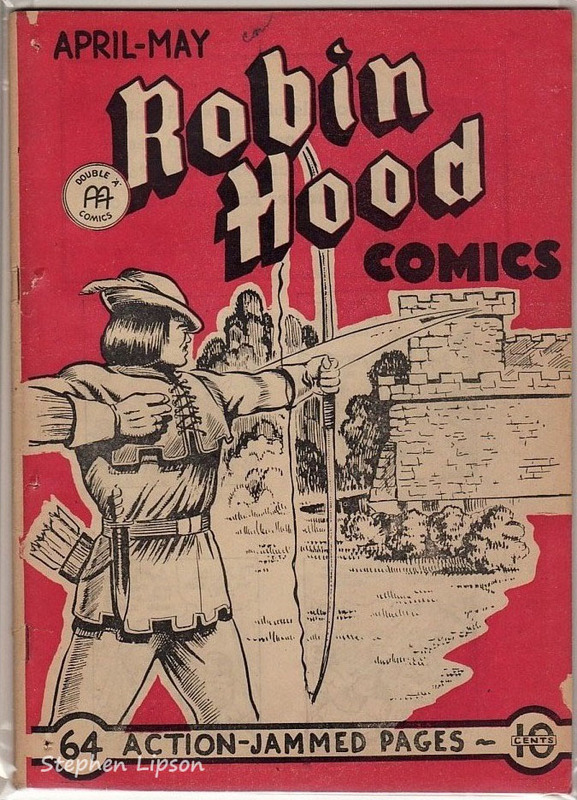 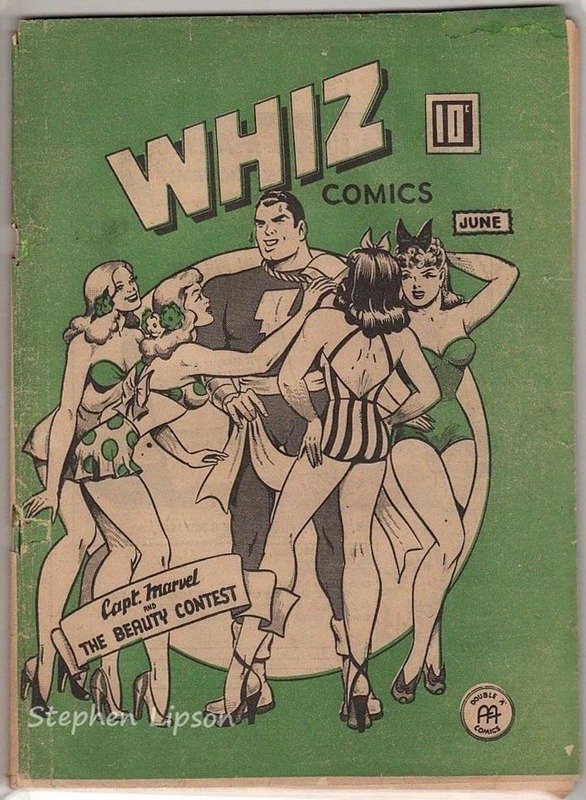 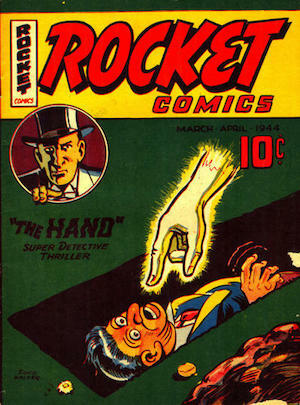 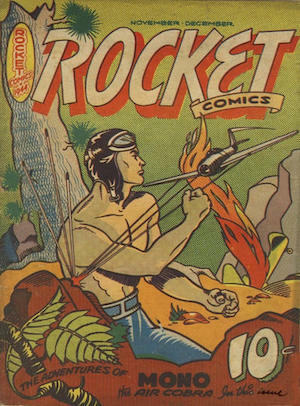 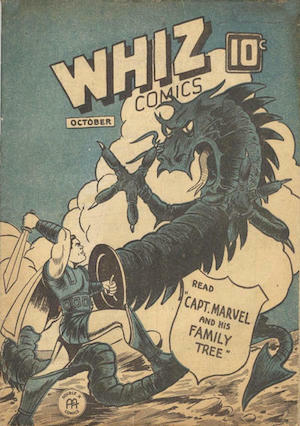 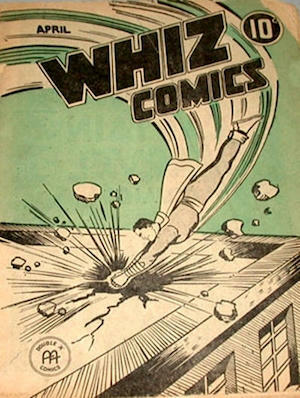 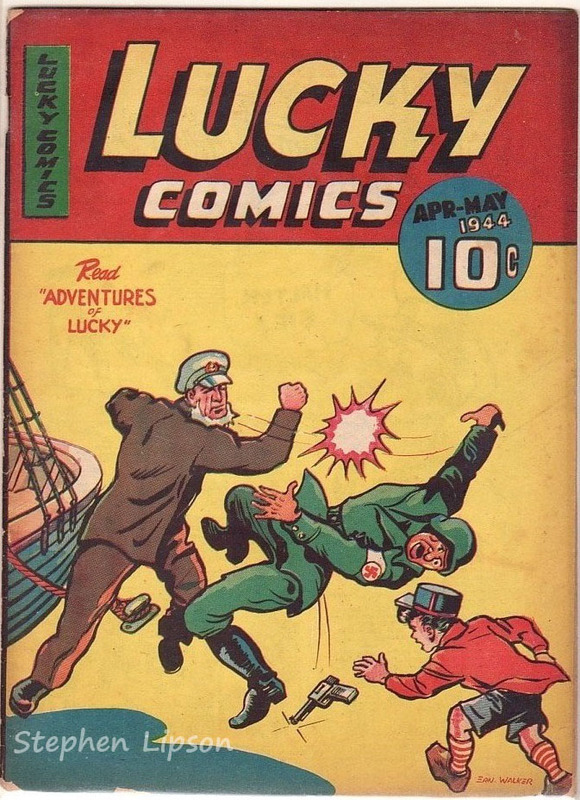 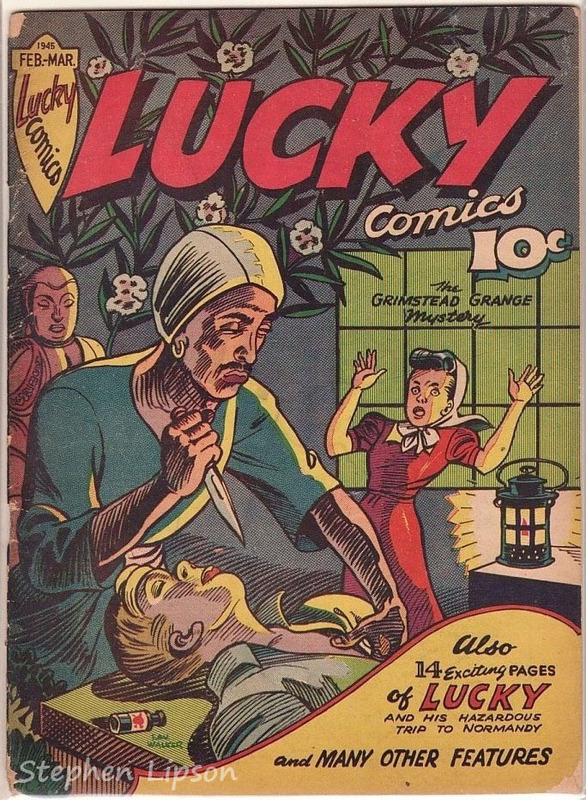 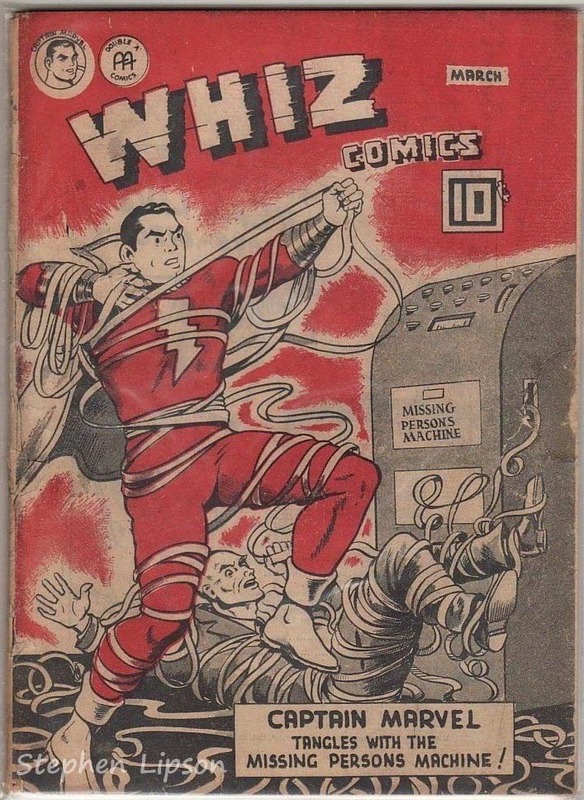 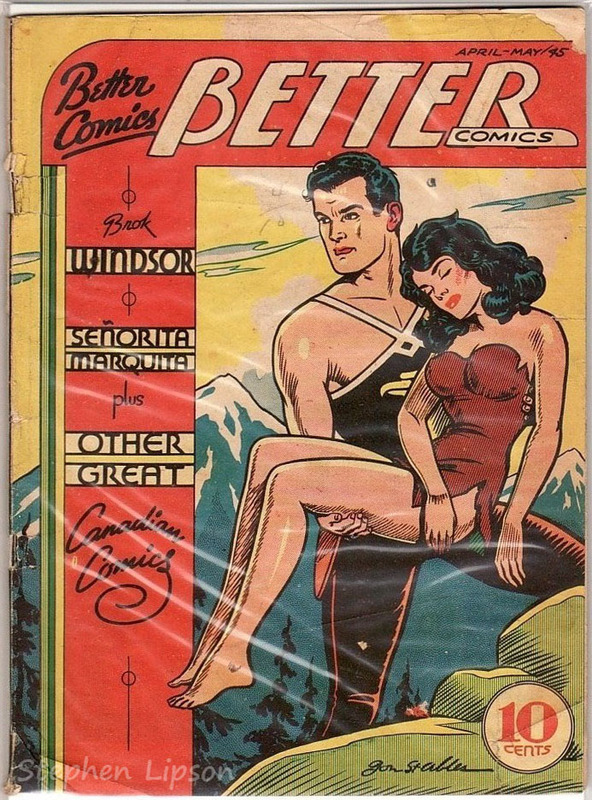 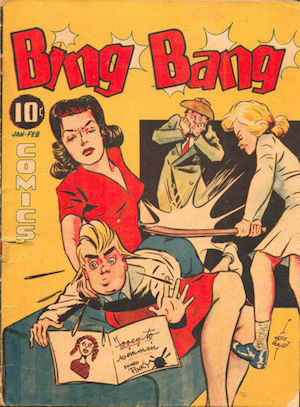 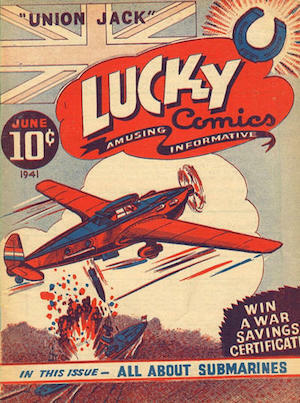 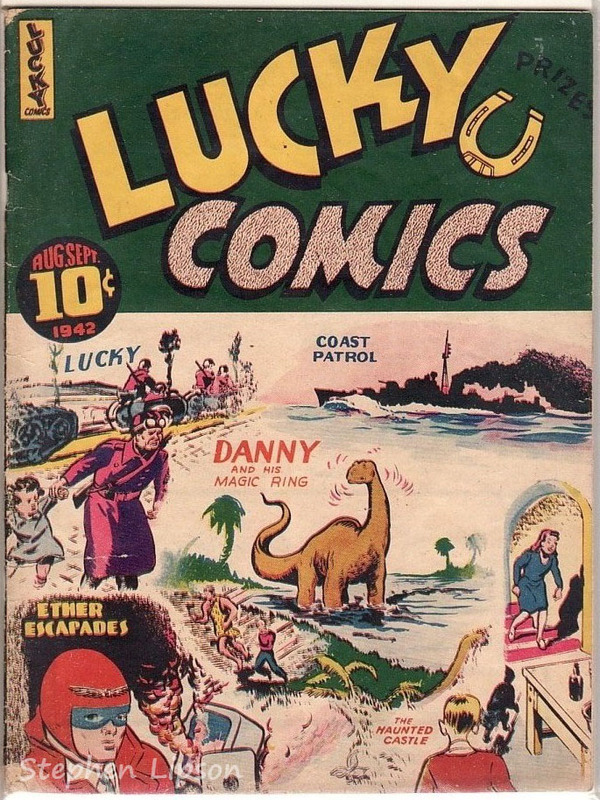 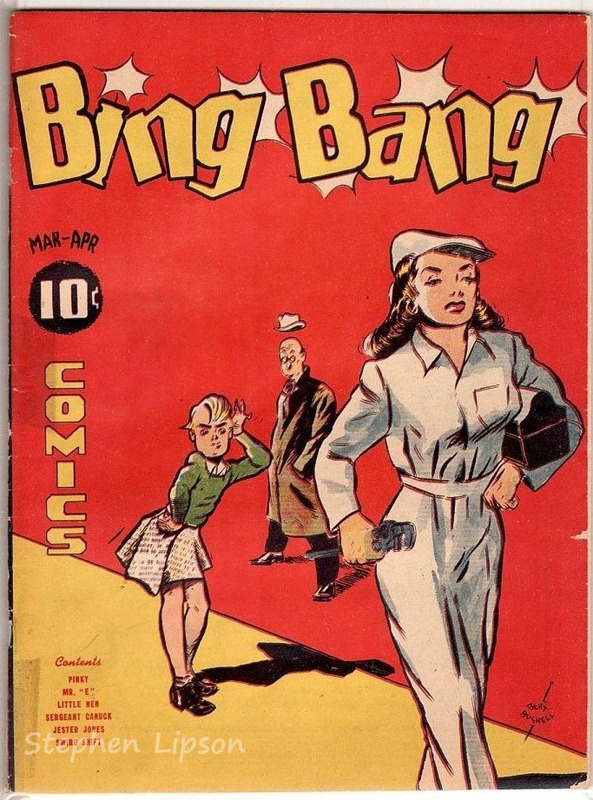 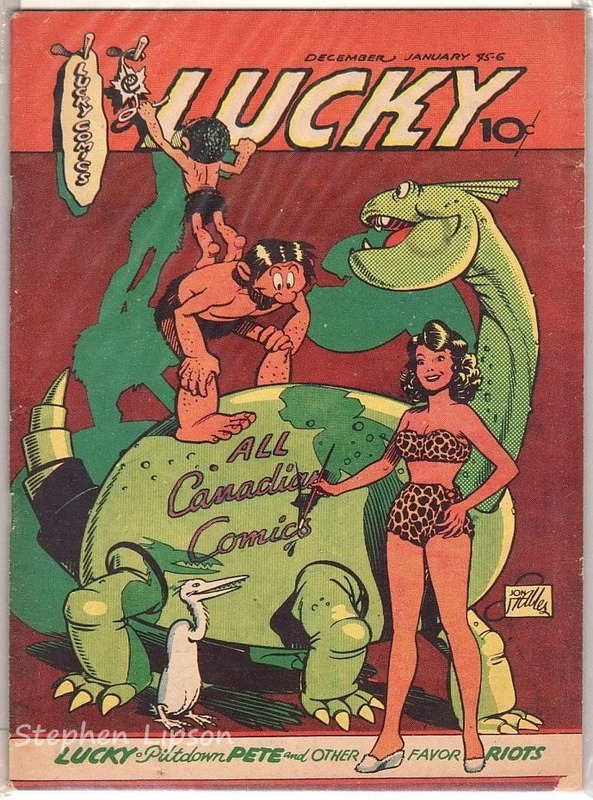 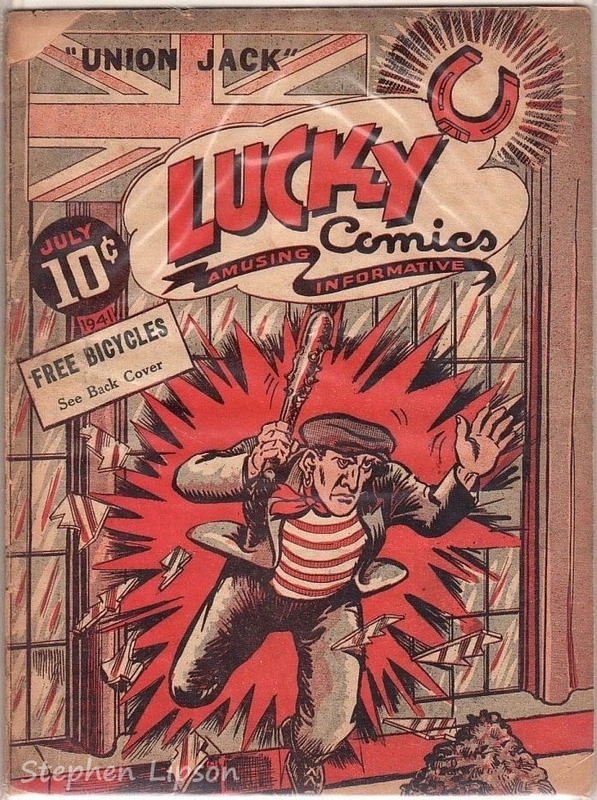 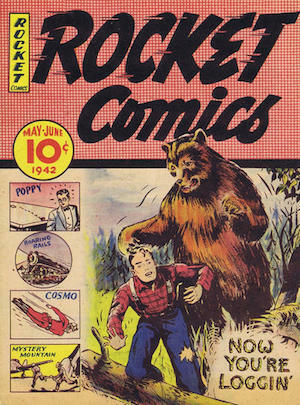 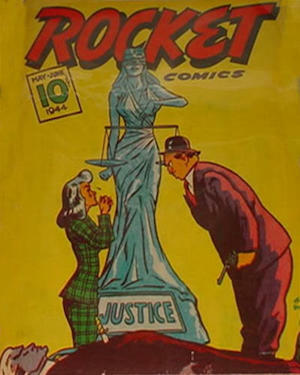 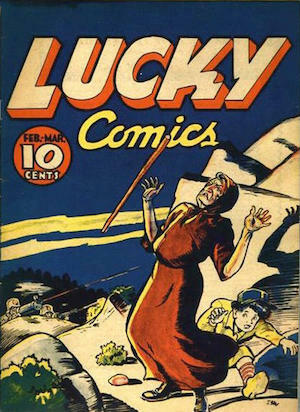 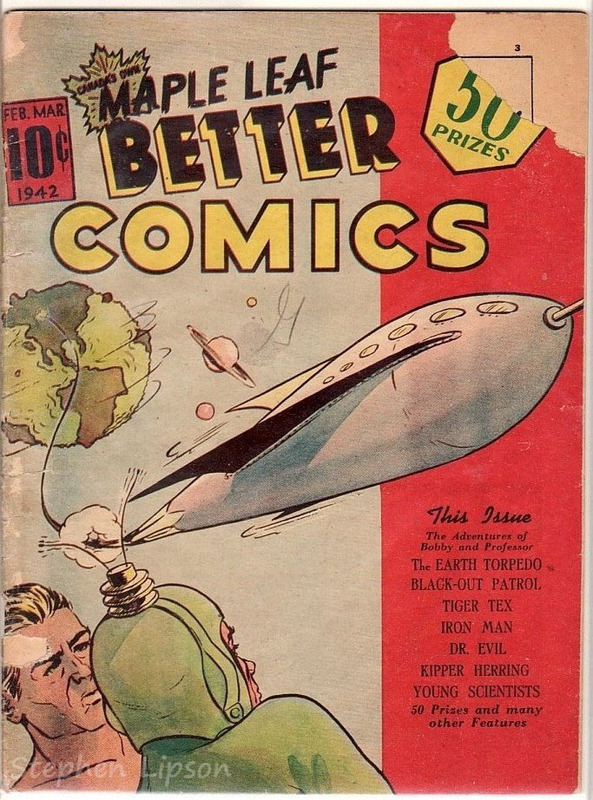 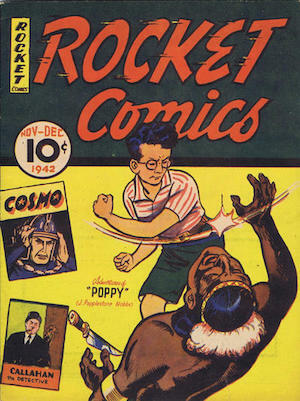 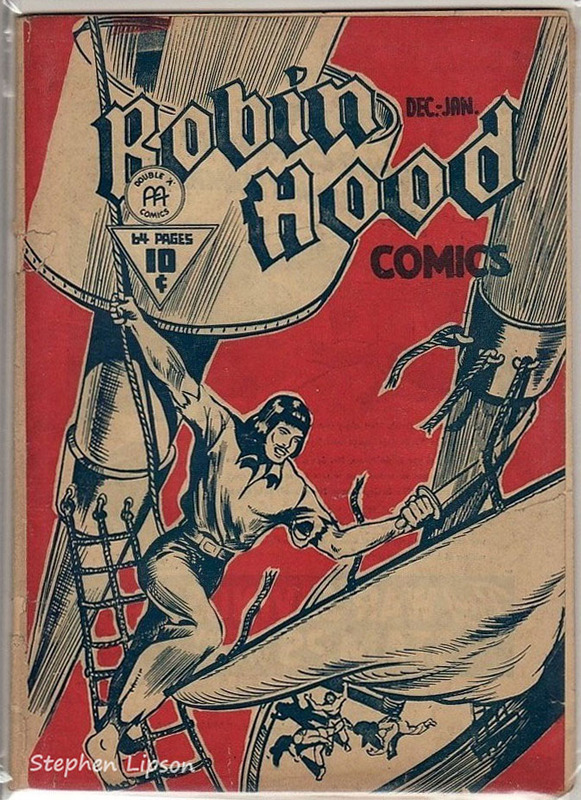 The first publisher of Canadian Whites was Maple Leaf Publishing books out of Vancouver, BC such as Better Comics, Rocket Comics, Bing Bang Comics and Lucky Comics. 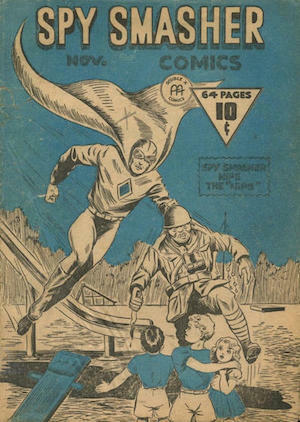 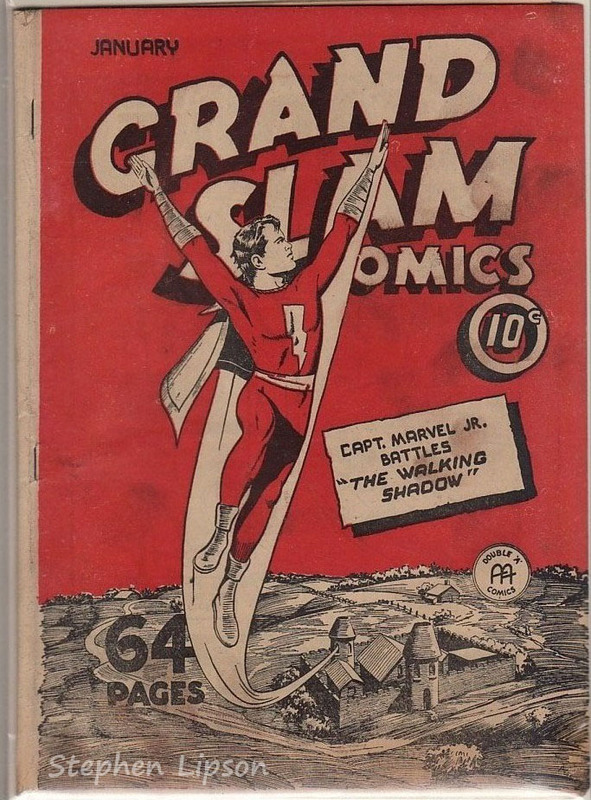 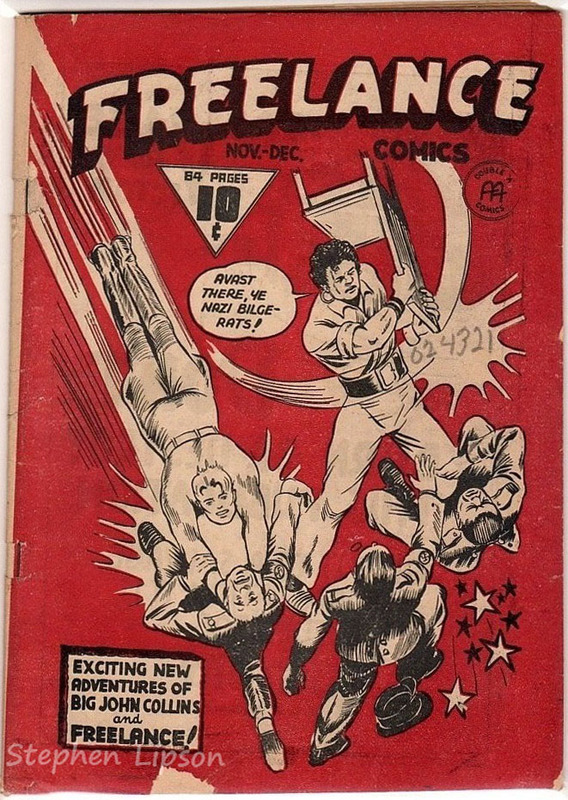 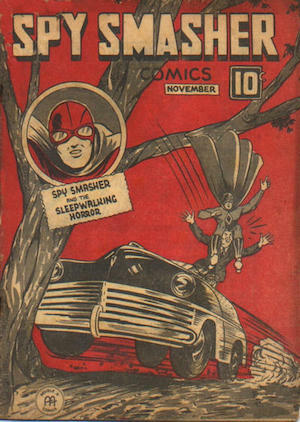 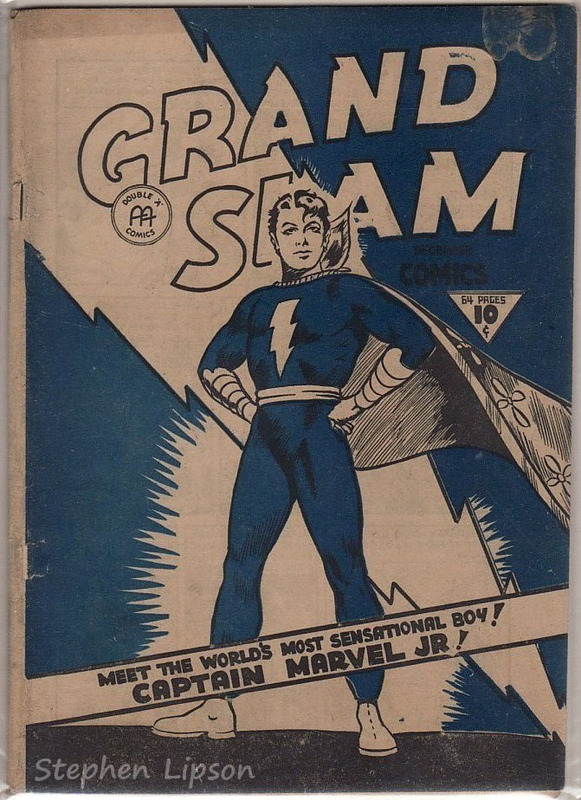 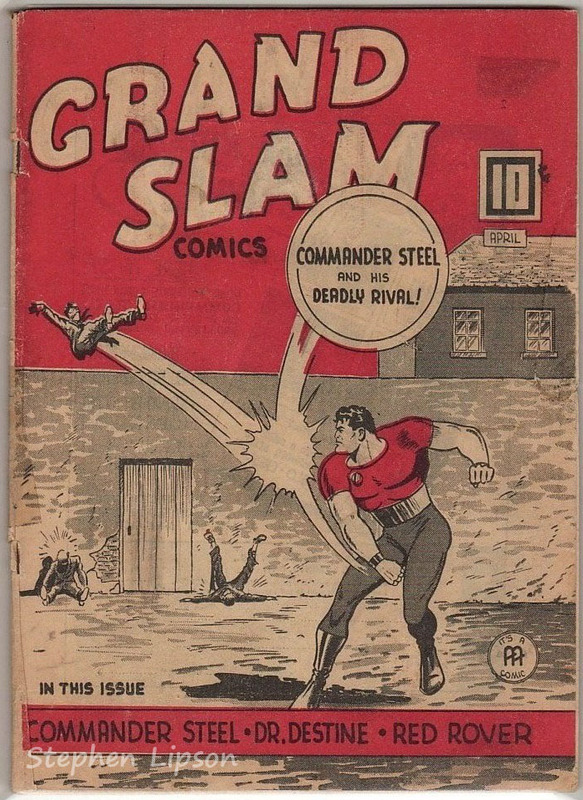 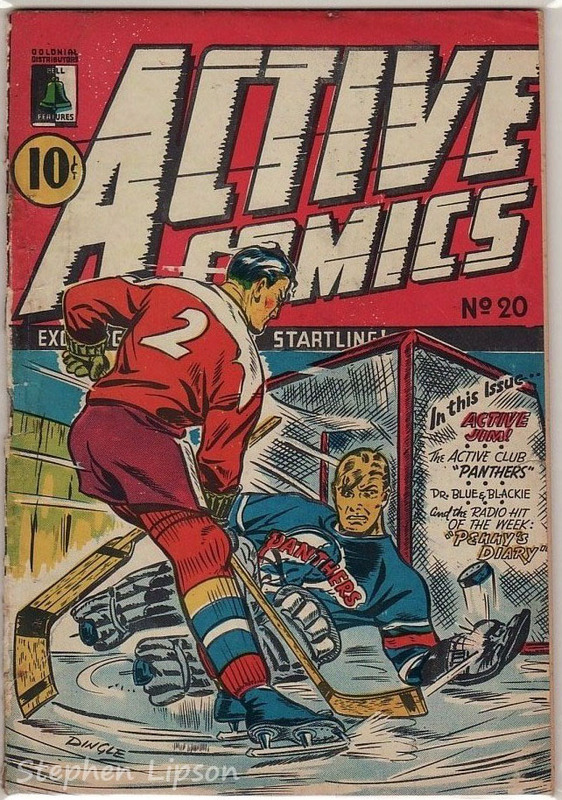 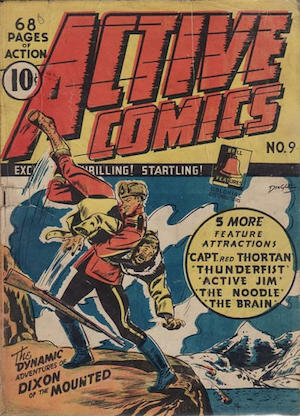 The aforementioned Maple Leaf comics introduced the first Canadian superhero in Better Comics # 1 in March of 1941 (The Iron Man -- no relation to Tony Stark!). 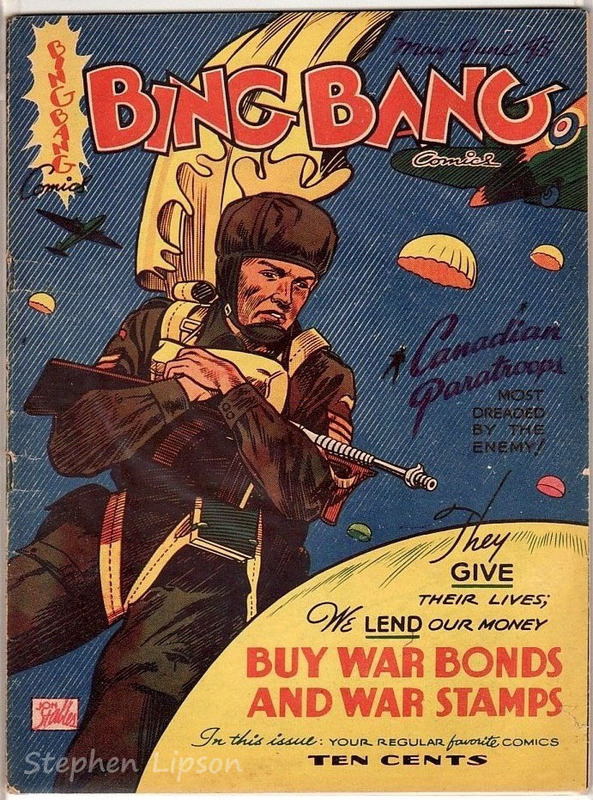 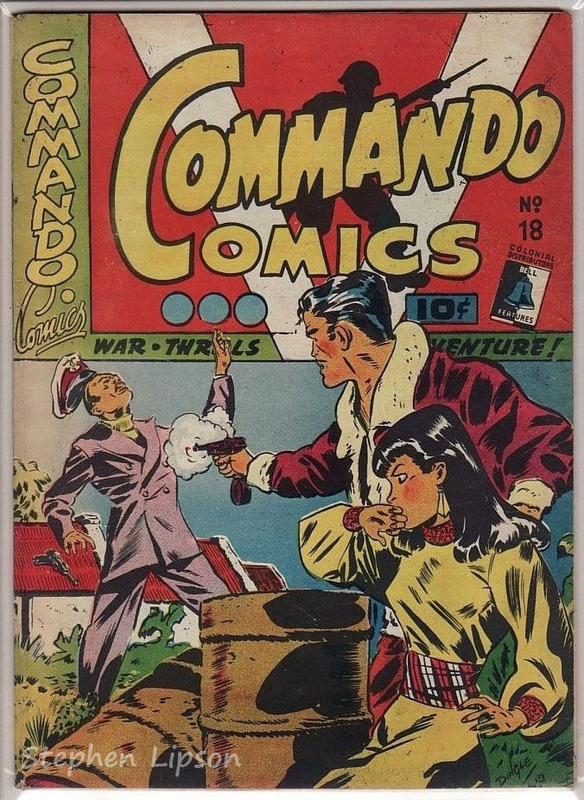 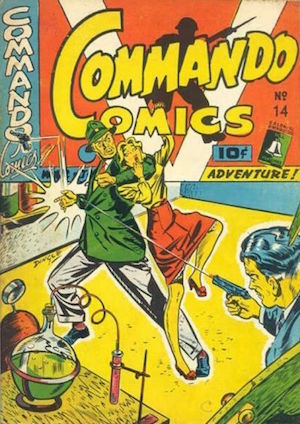 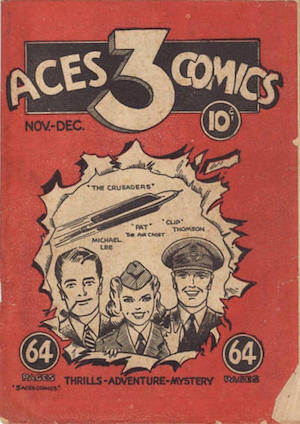 Maple Leaf comics are deemed to be the scarcest of all the Canadian whites wartime comic books, and command a premium when changing hands. 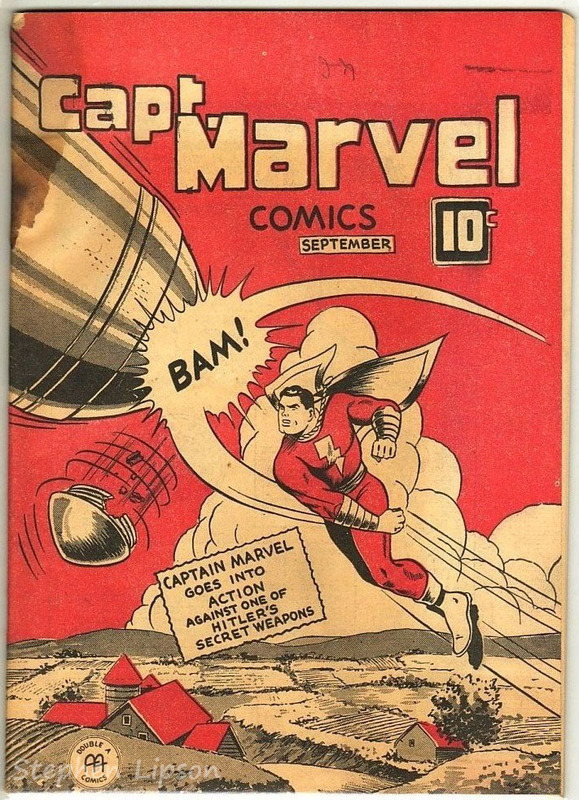 Gallery of cover images follows! 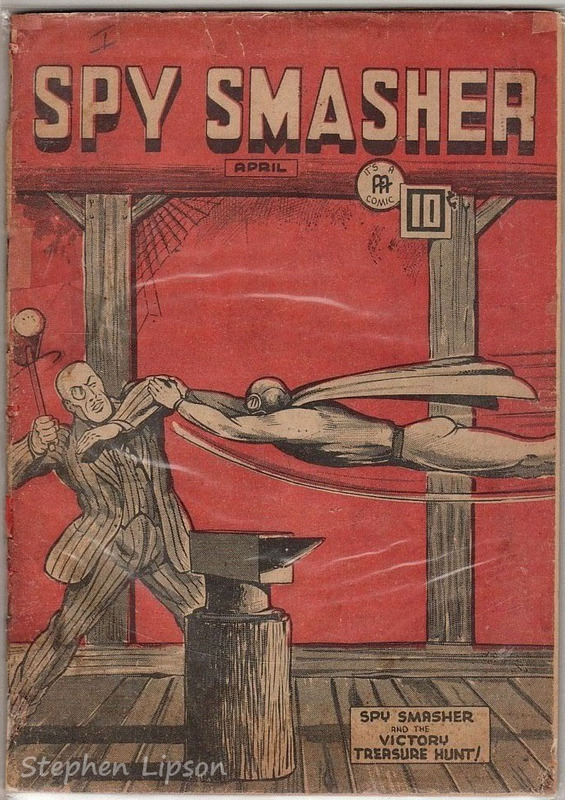 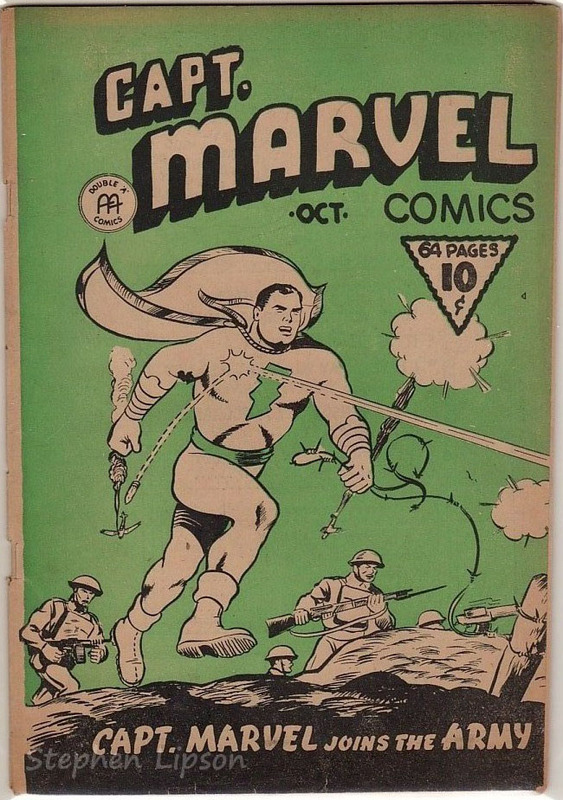 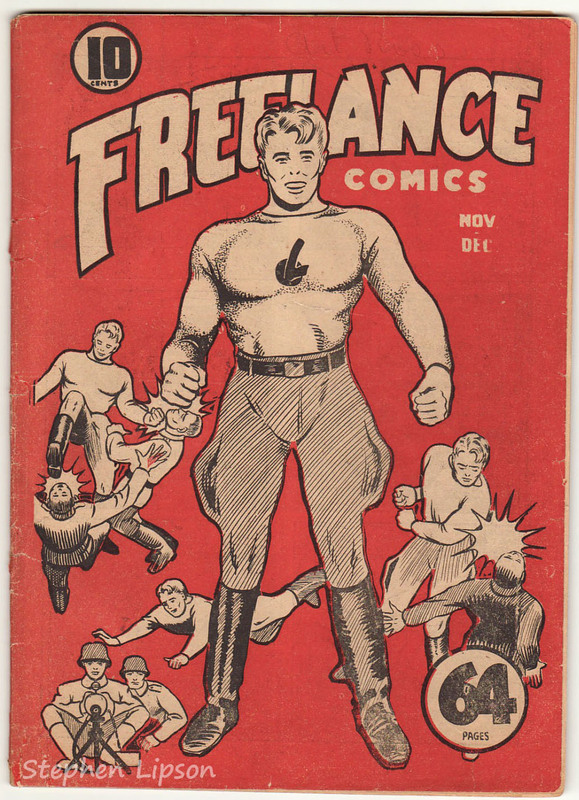 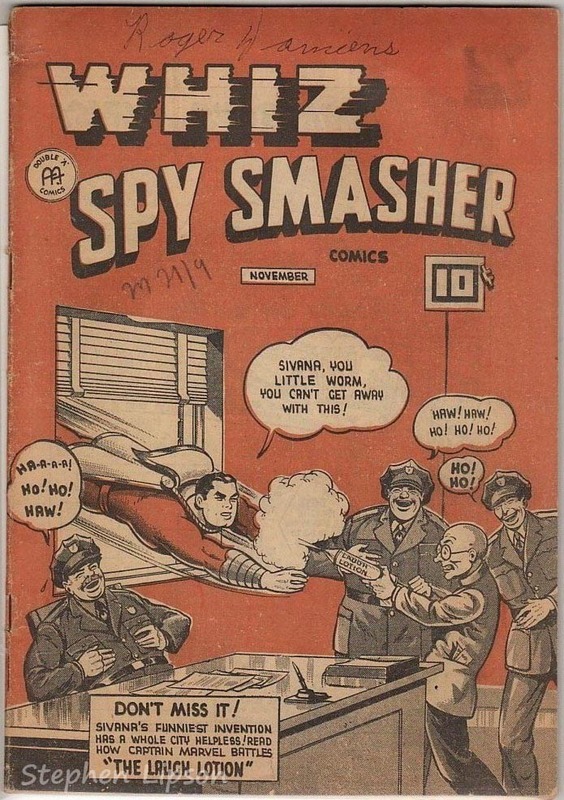 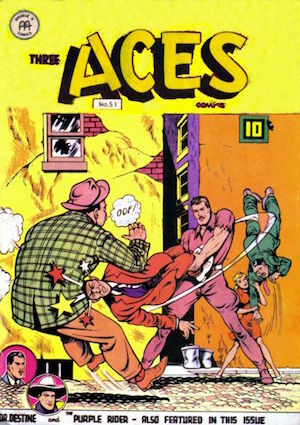 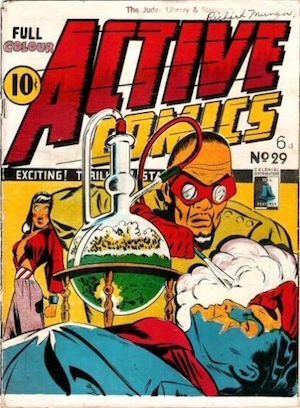 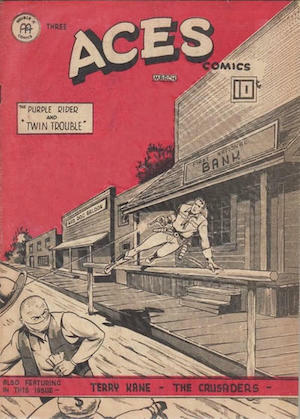 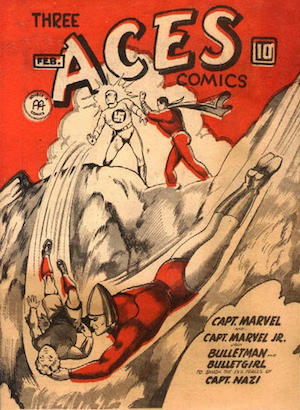 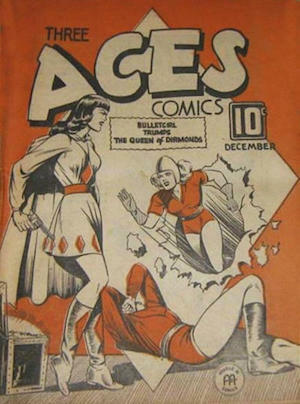 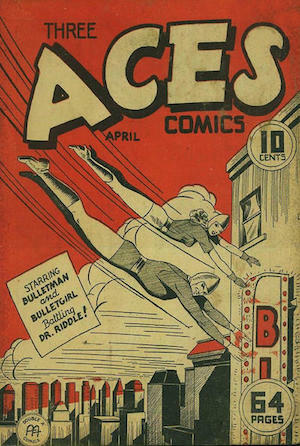 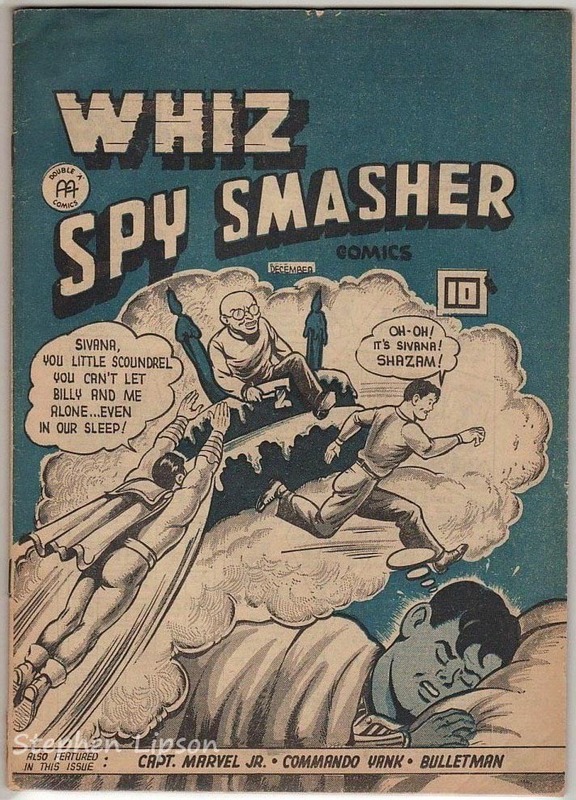 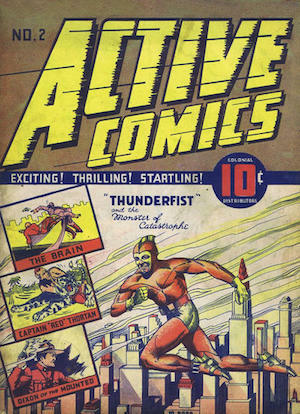 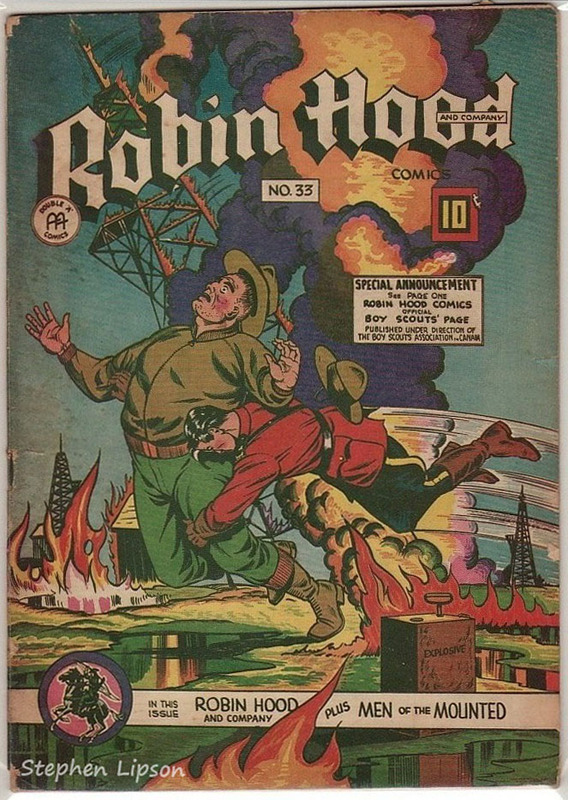 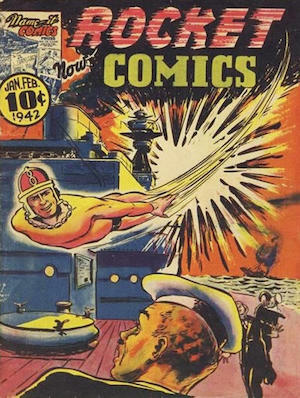 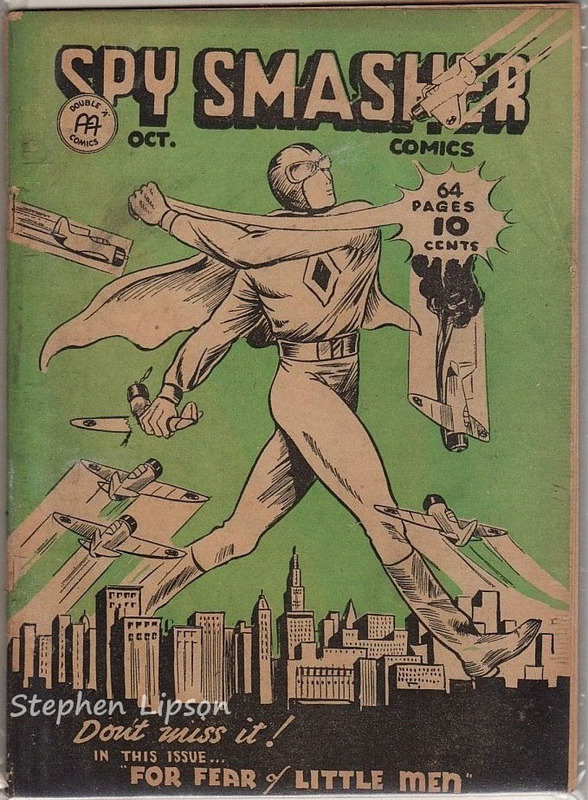 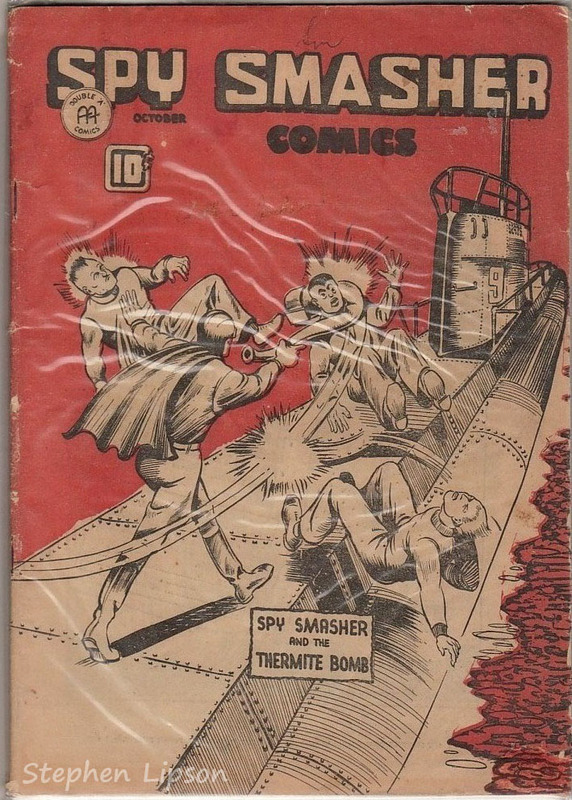 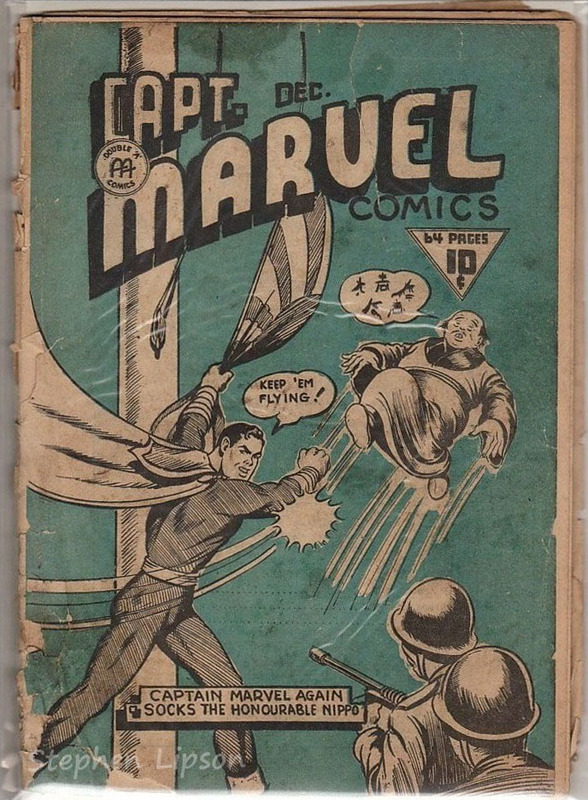 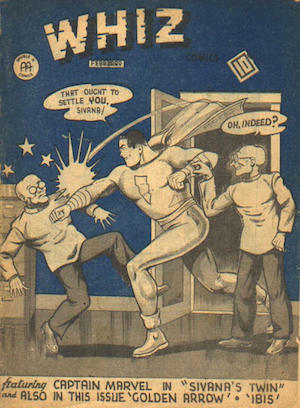 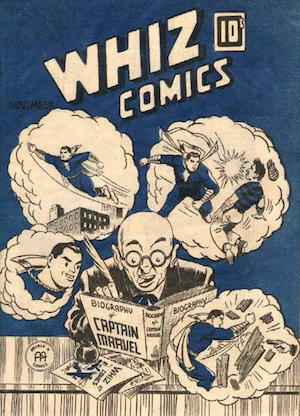 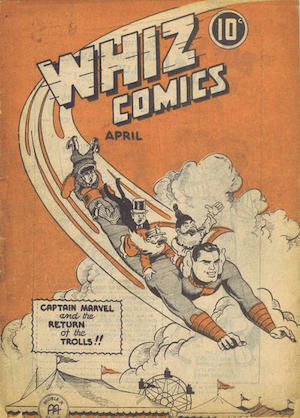 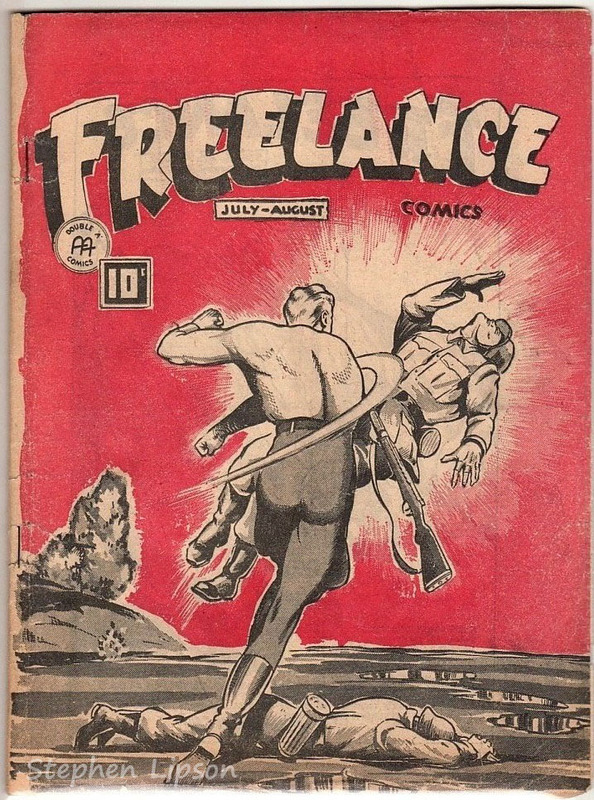 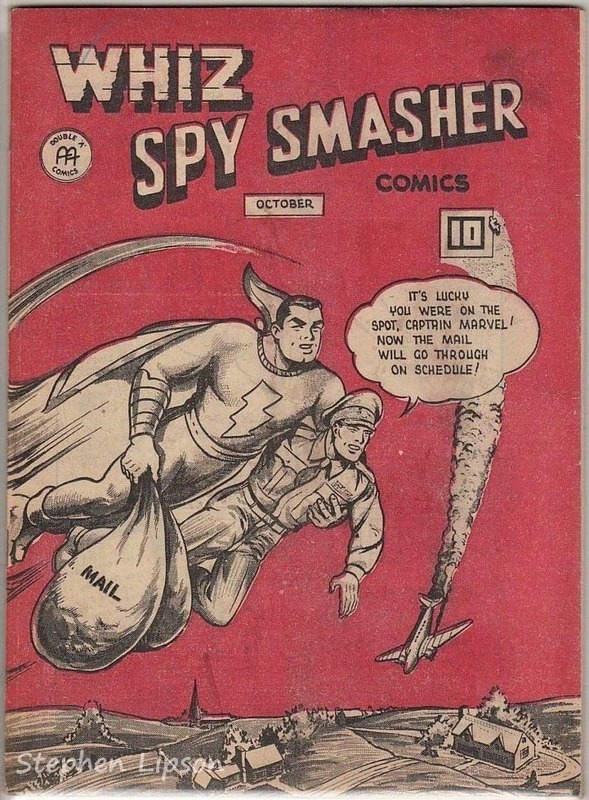 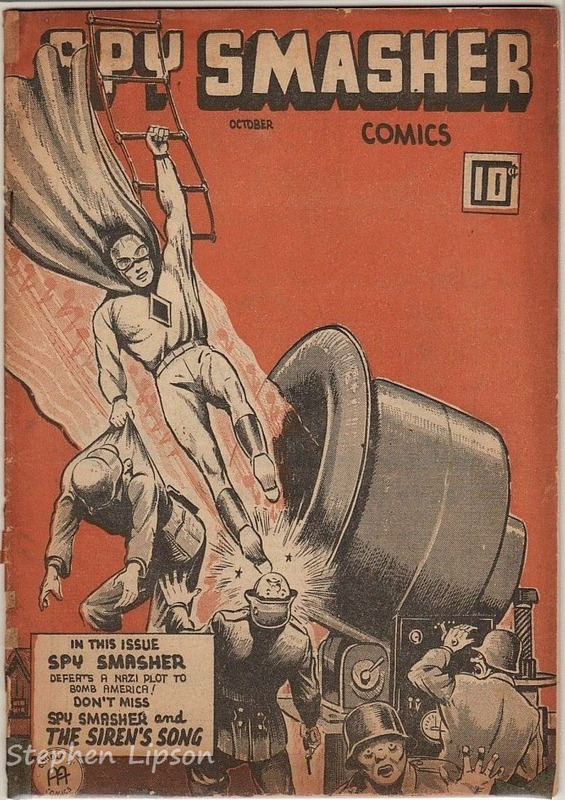 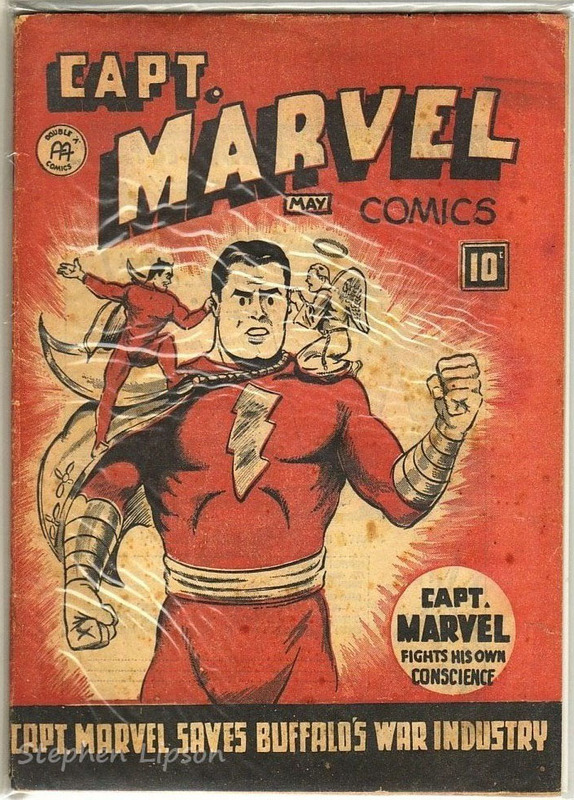 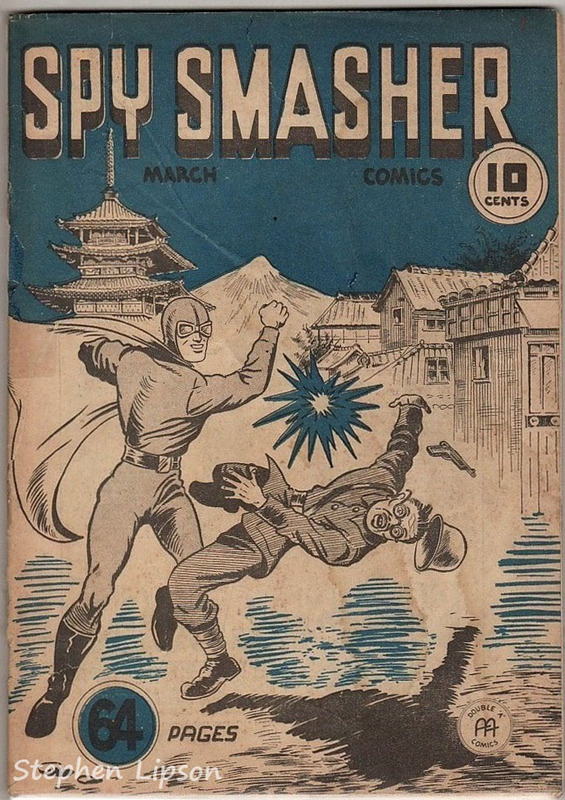 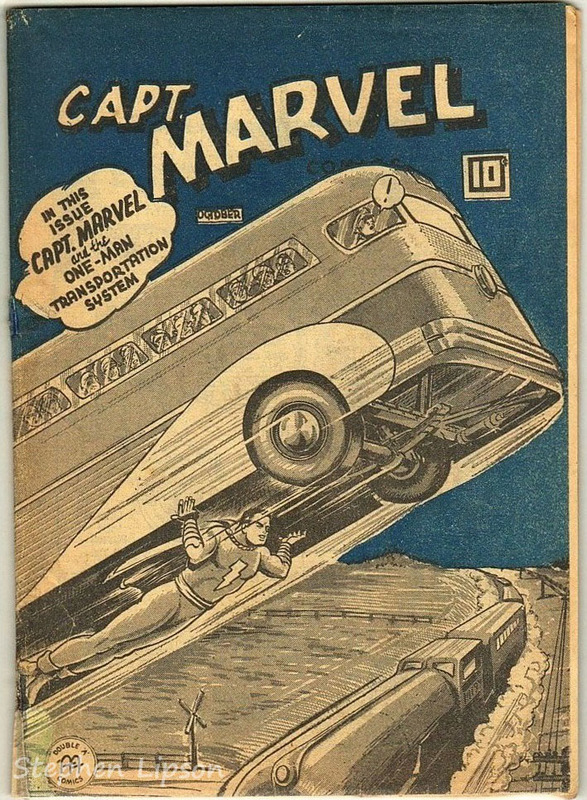 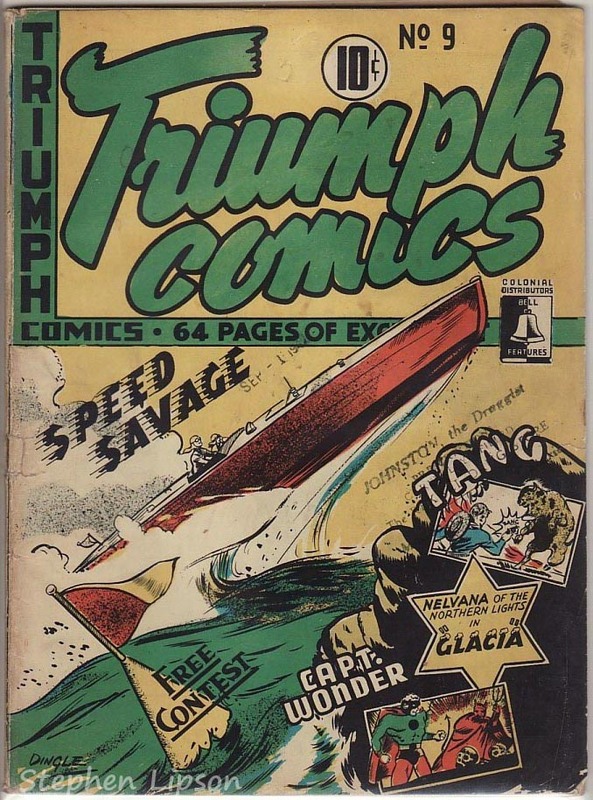 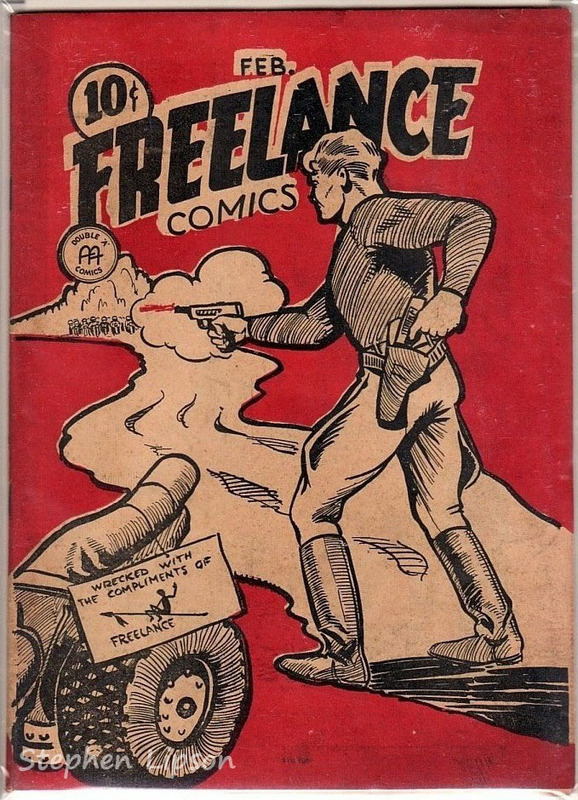 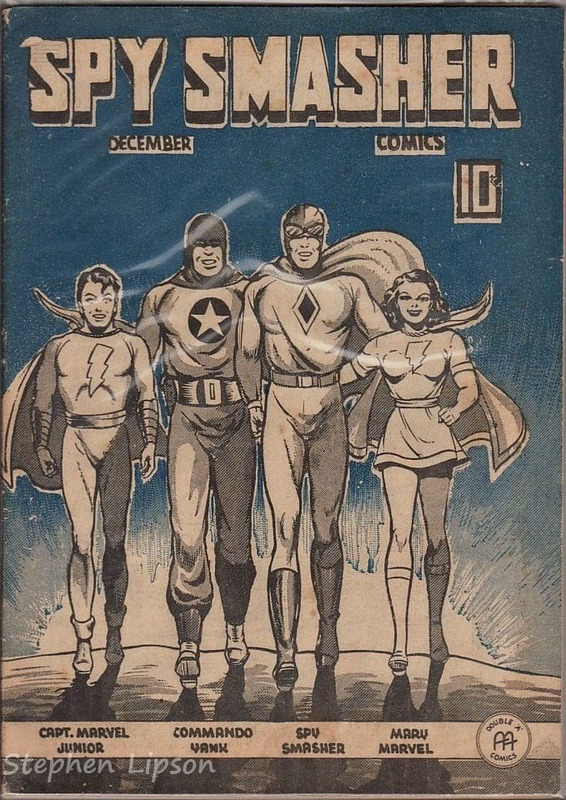 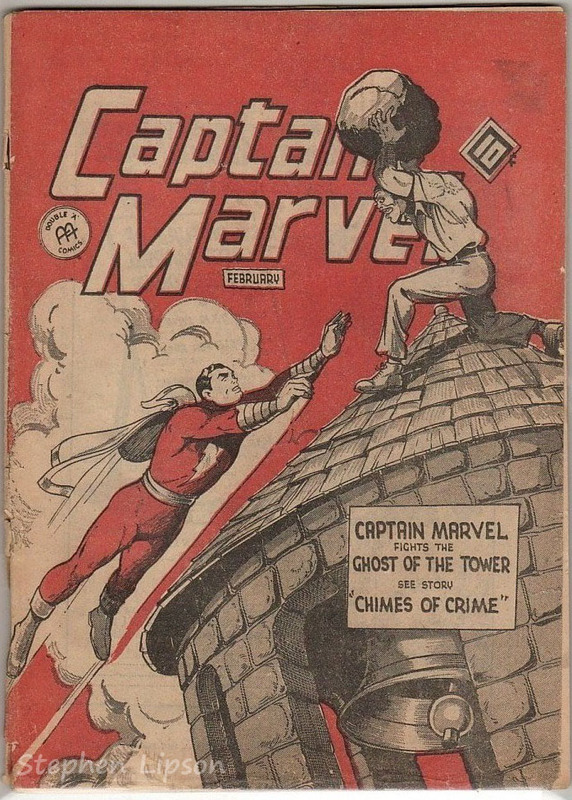 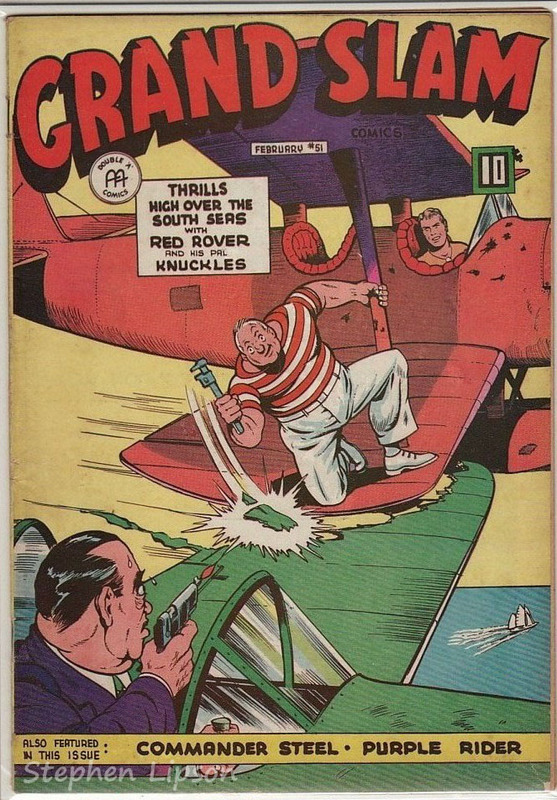 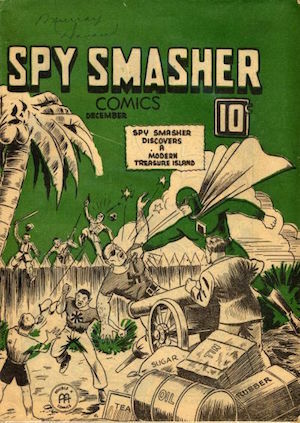 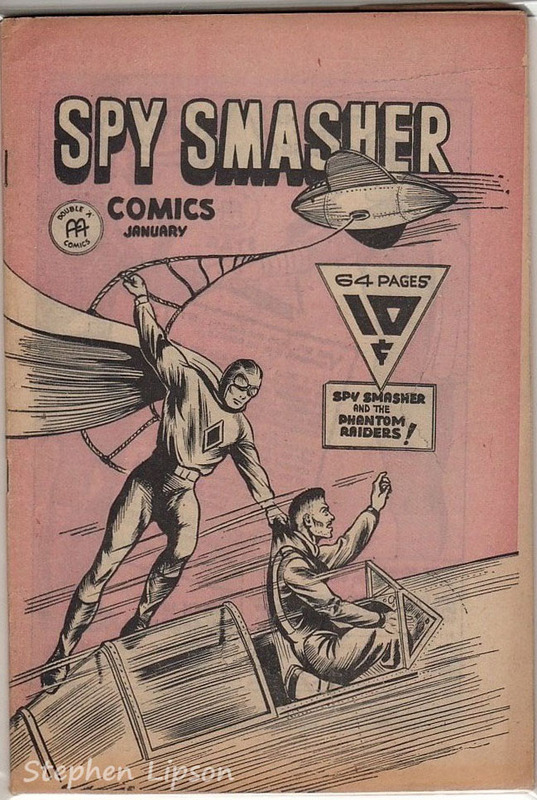 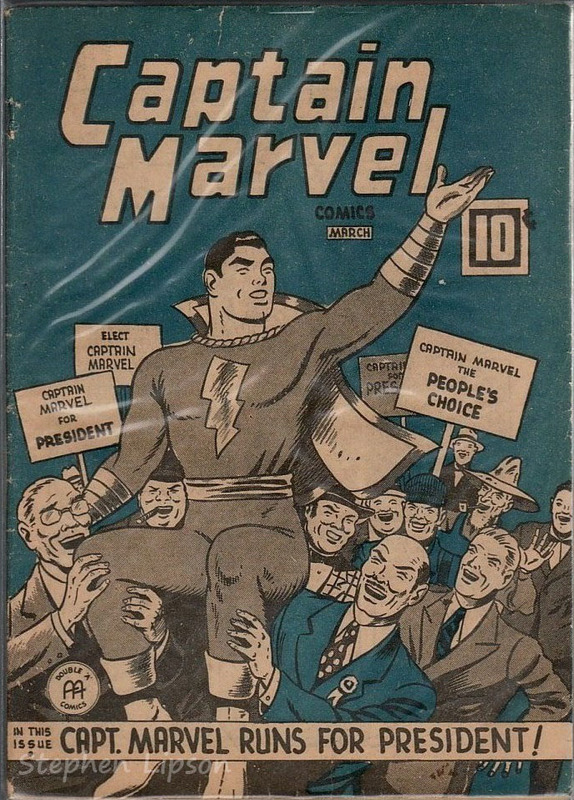 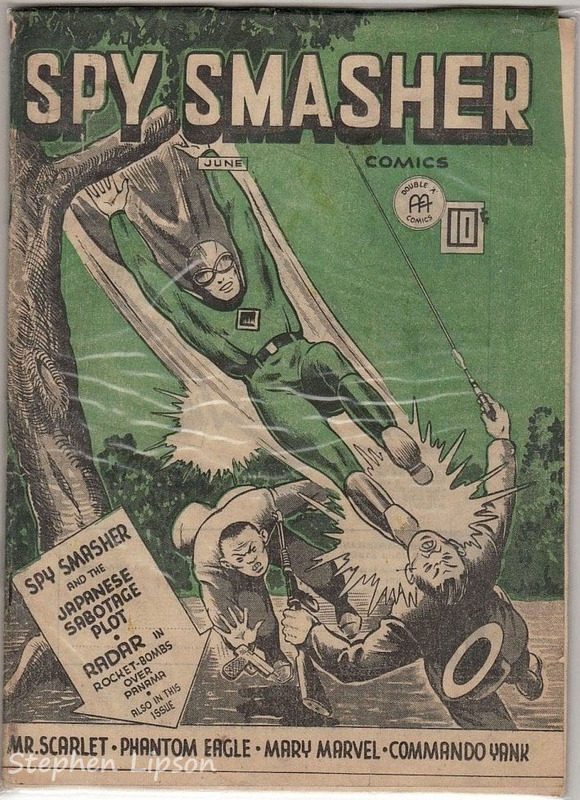 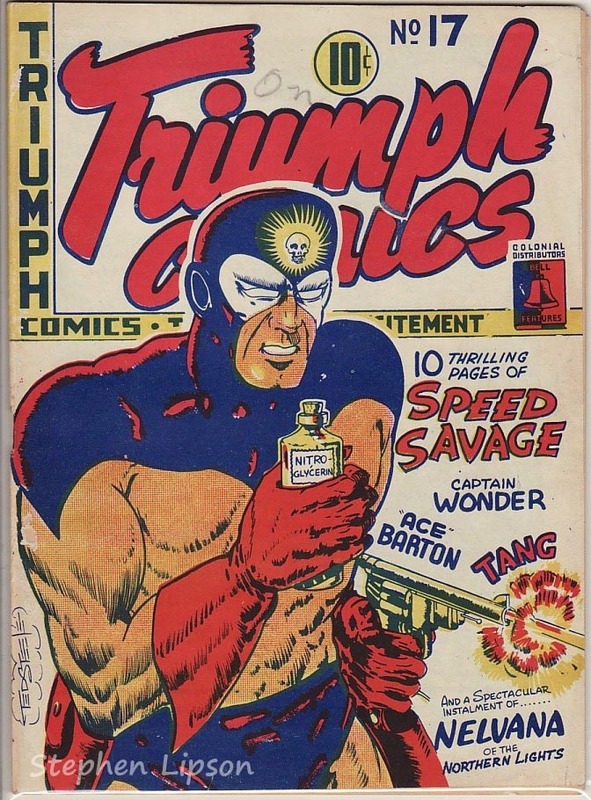 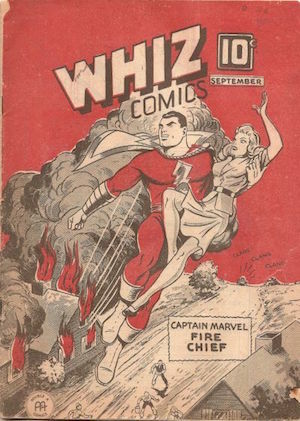 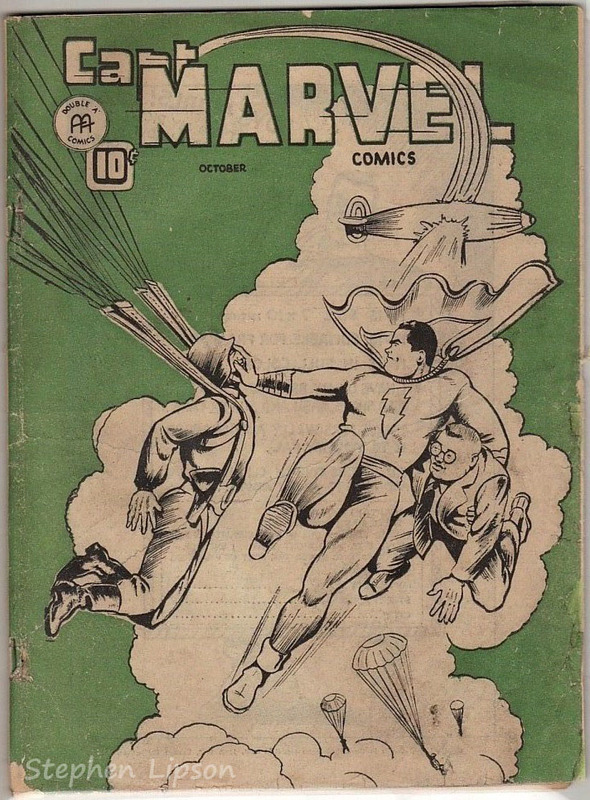 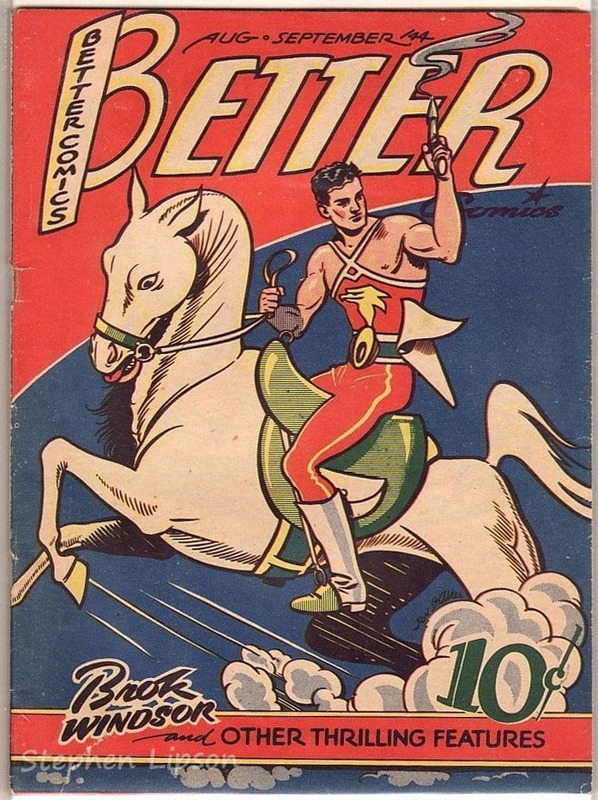 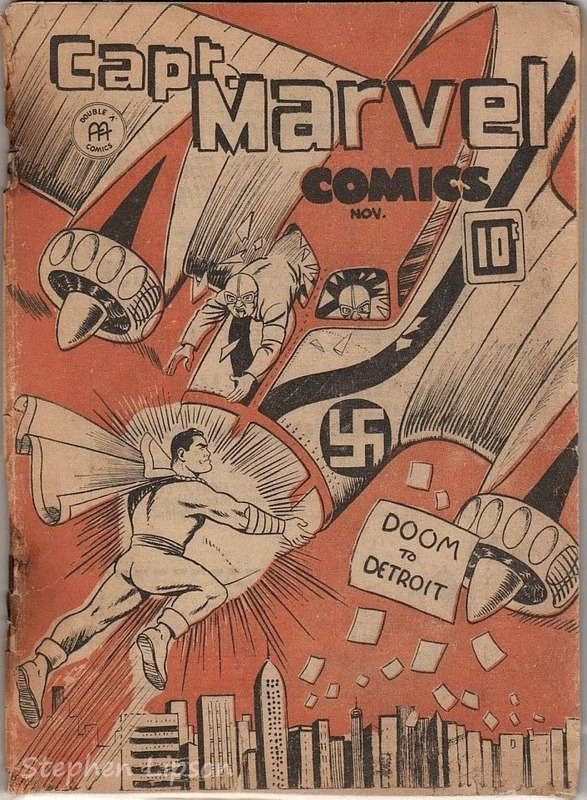 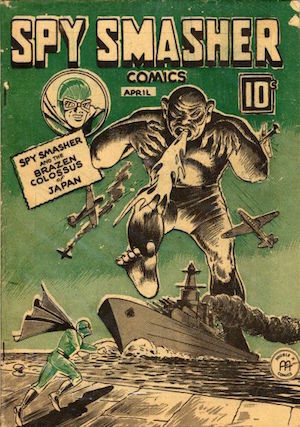 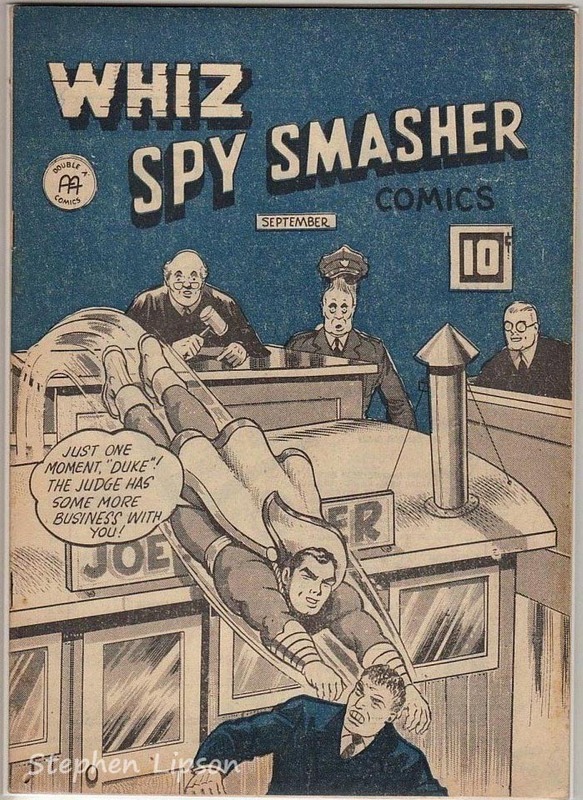 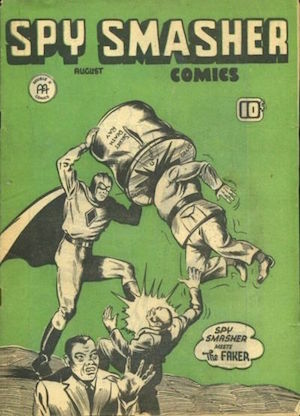 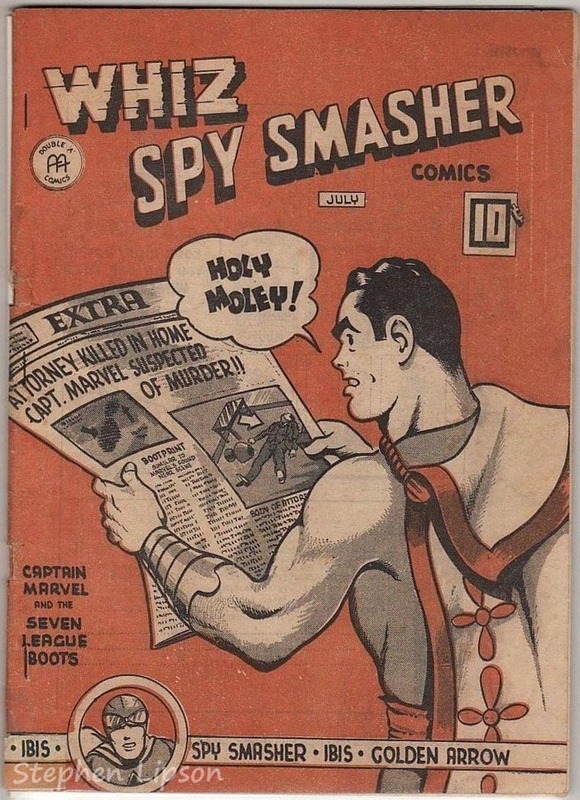 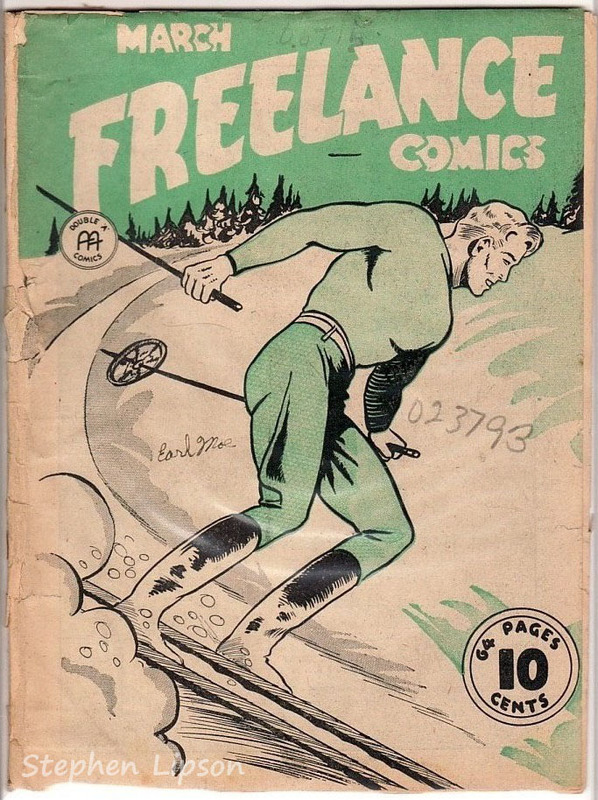 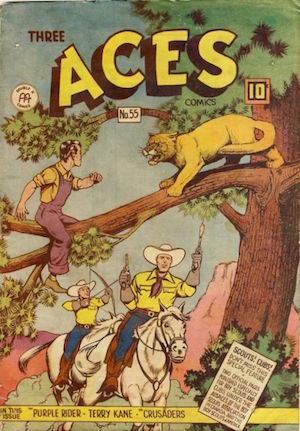 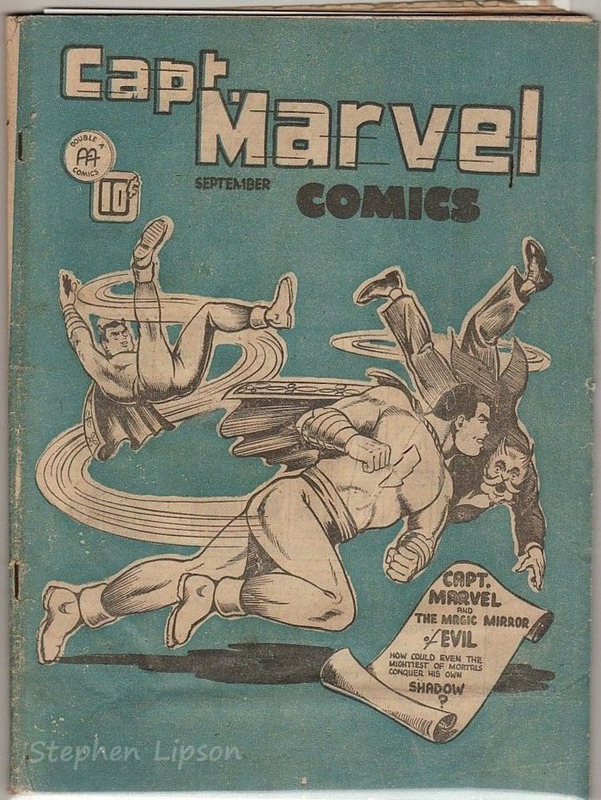 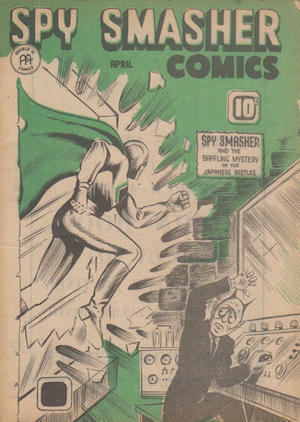 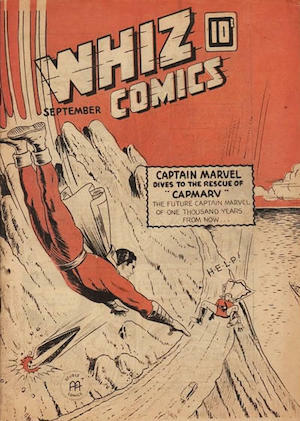 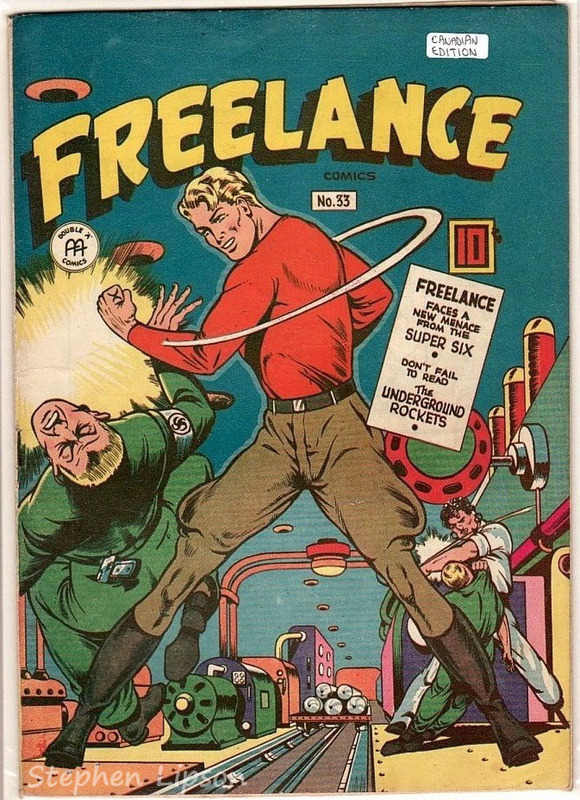 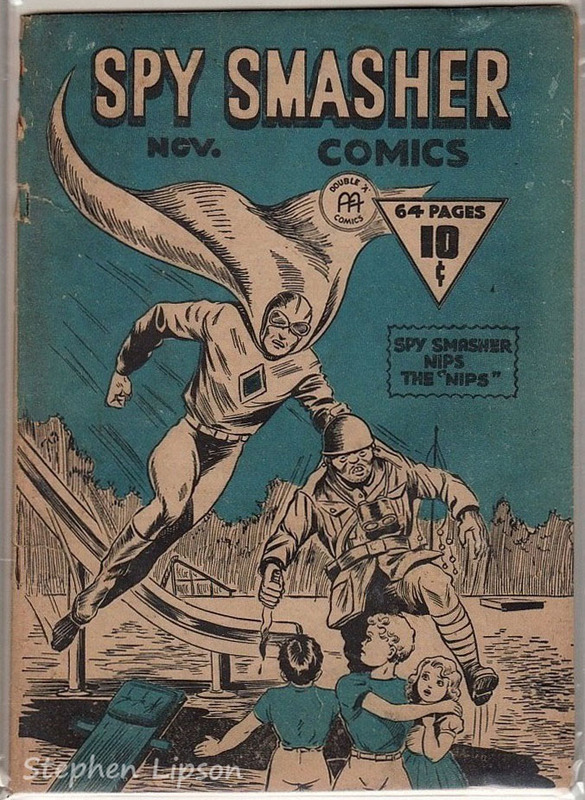 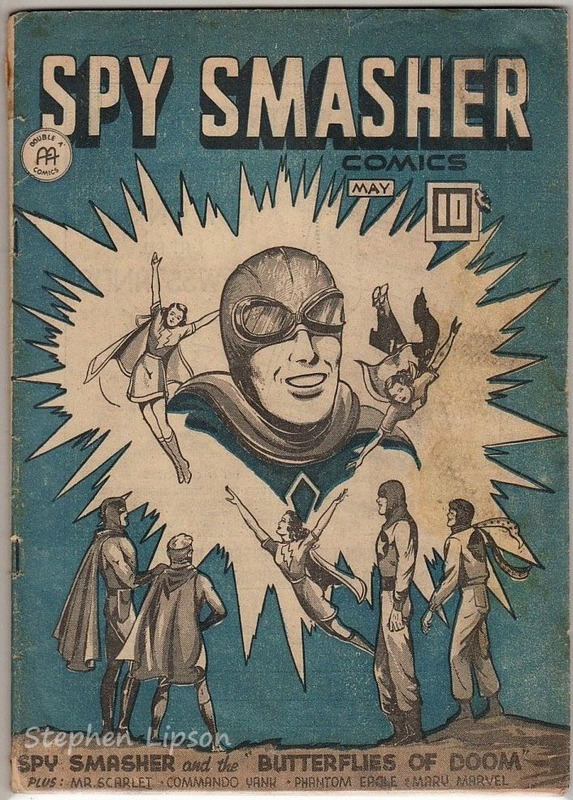 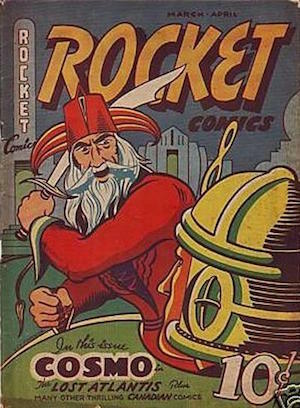 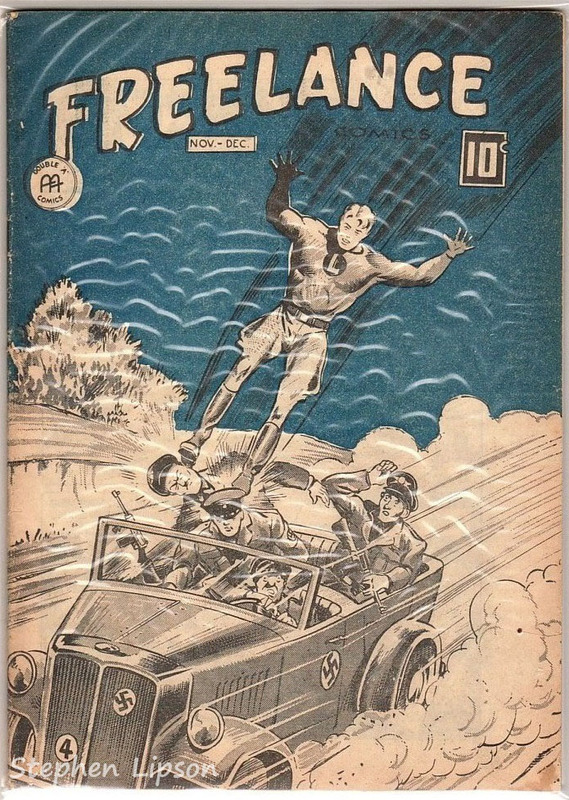 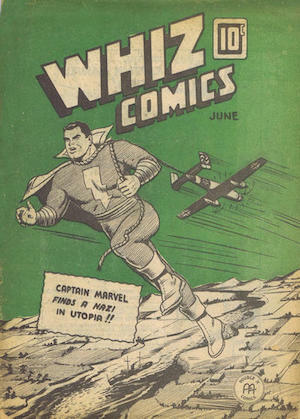 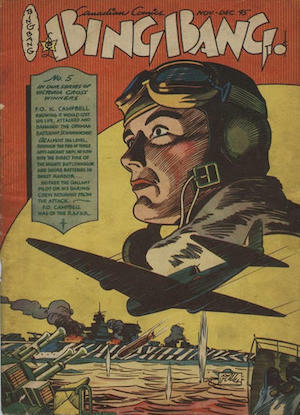 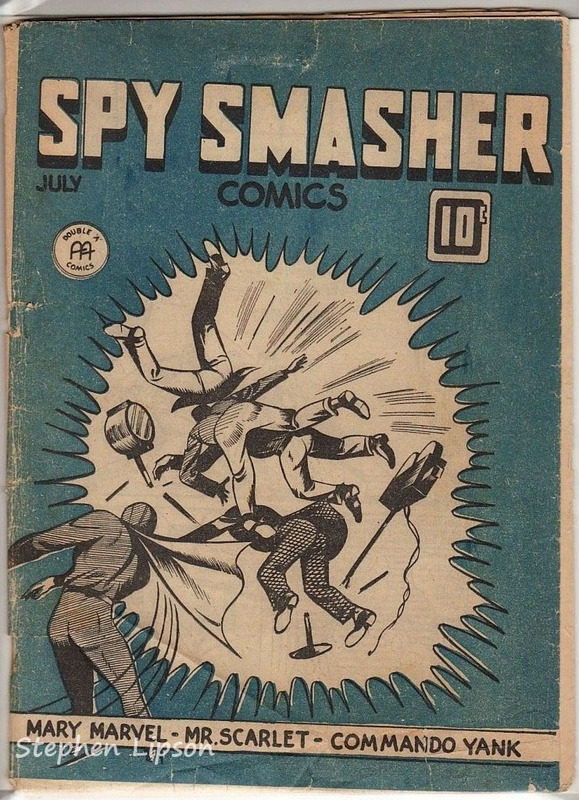 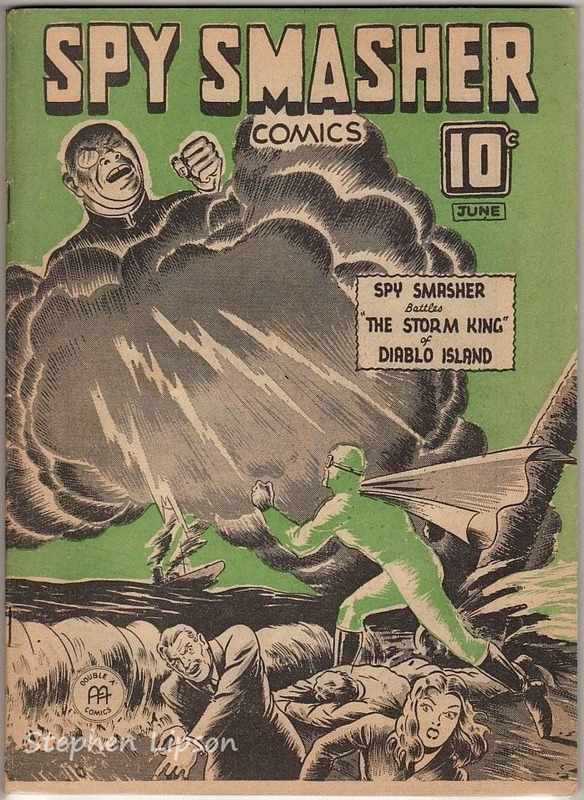 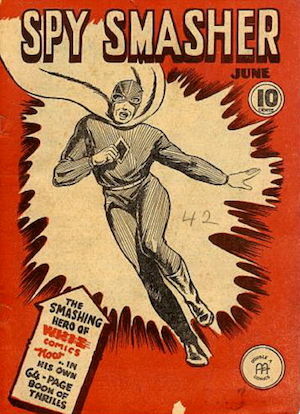 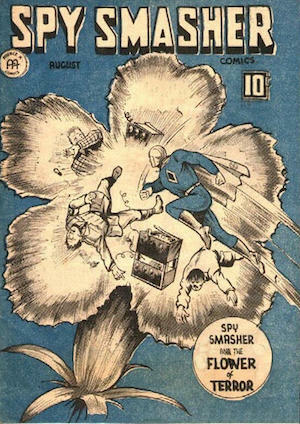 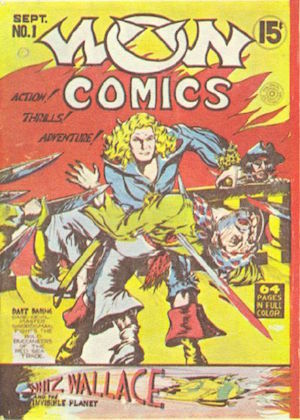 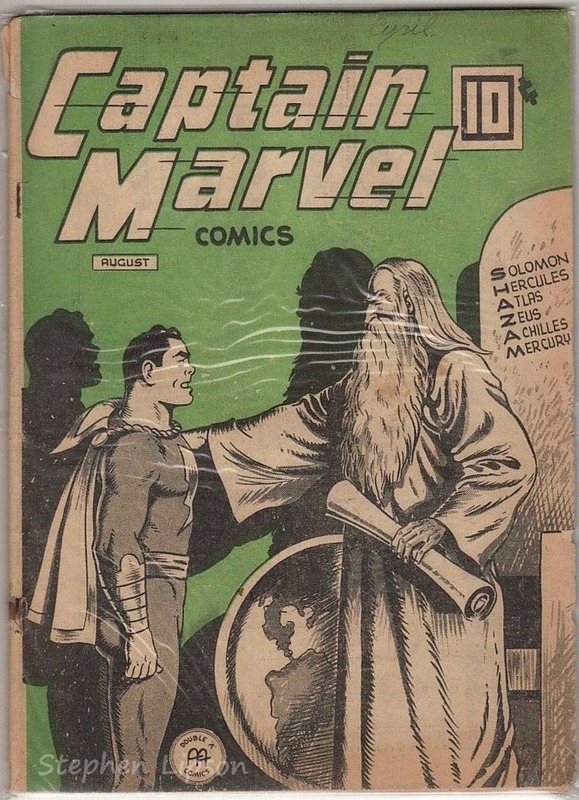 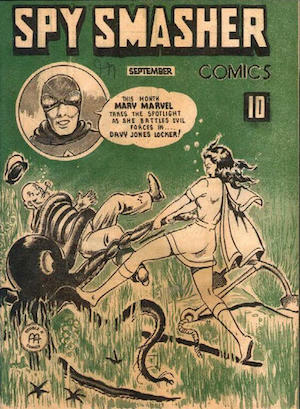 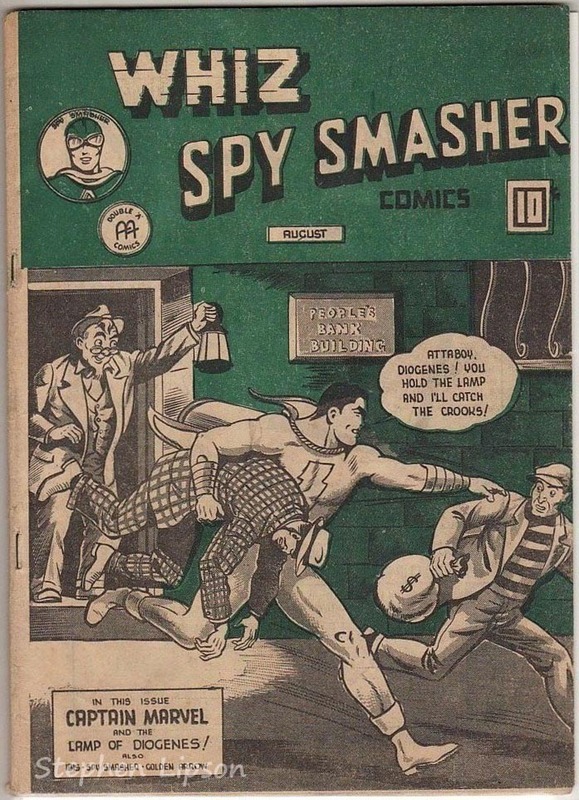 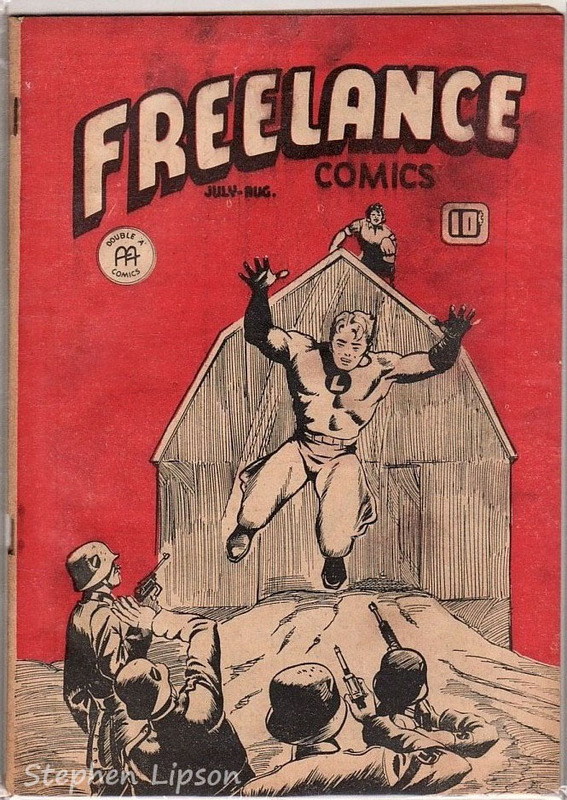 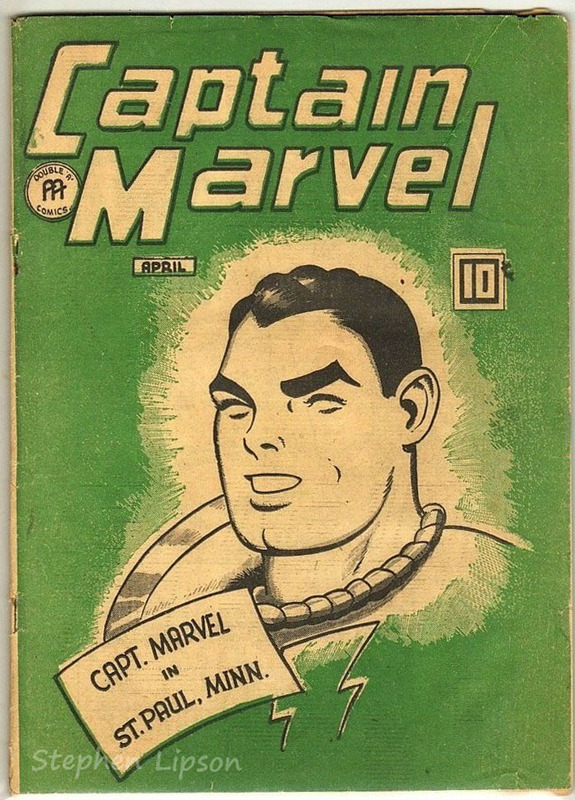 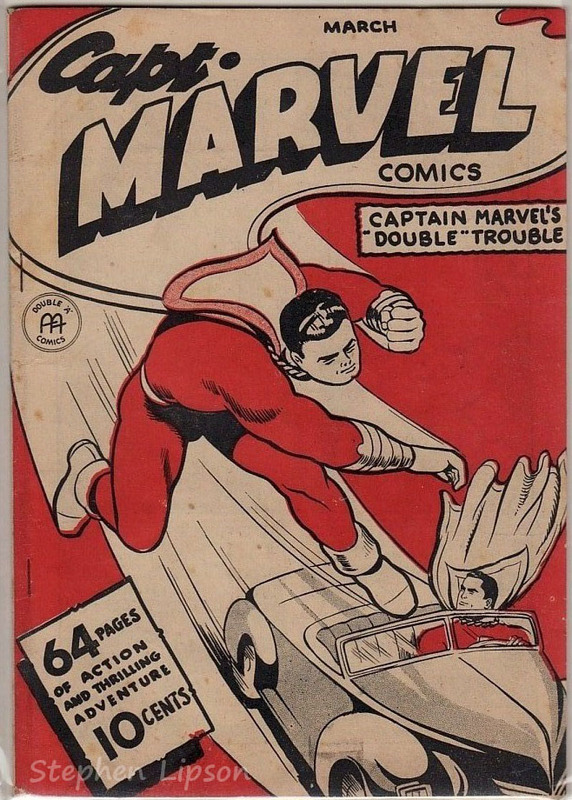 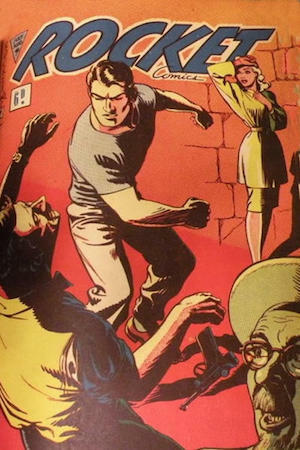 Anglo American (Double “A”) Publishing in Toronto introduced Freelance, and a host of Fawcett-derived characters, to Canadian whites, including Captain Marvel and Spy Smasher. 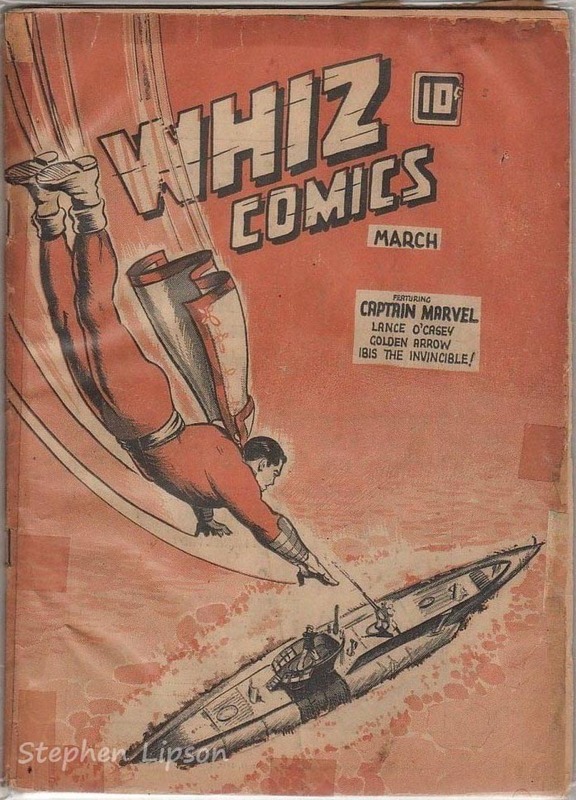 Gallery of Canadian whites cover images follows! 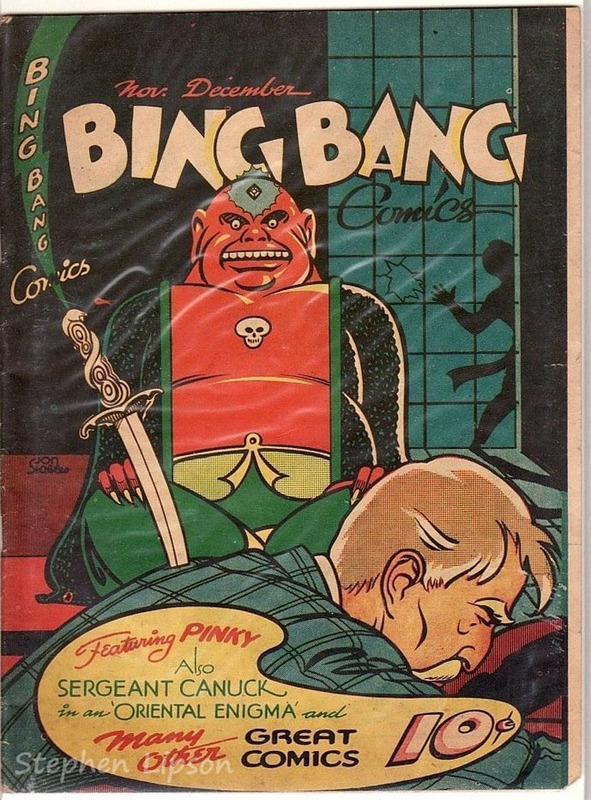 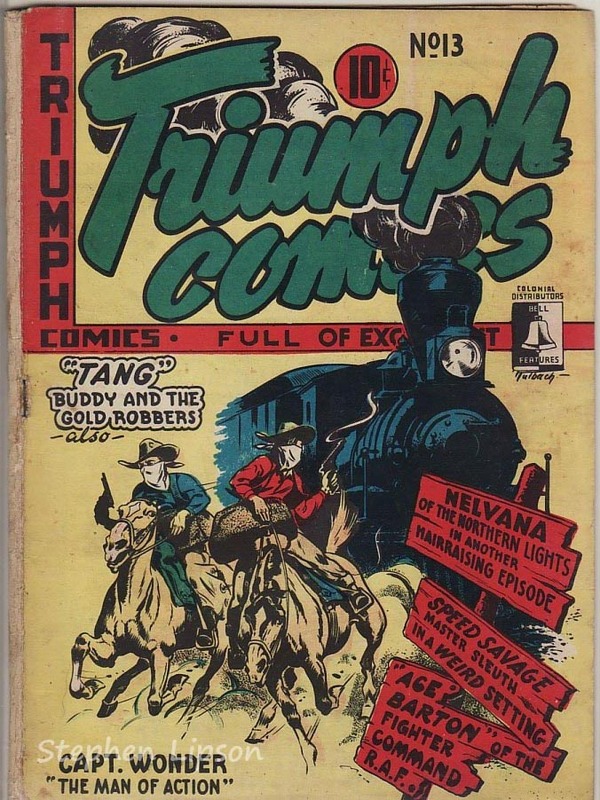 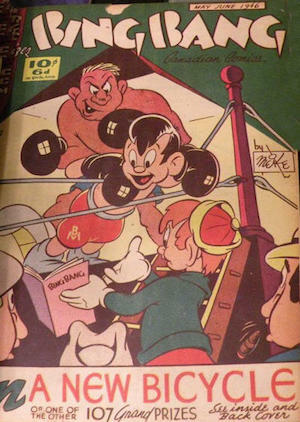 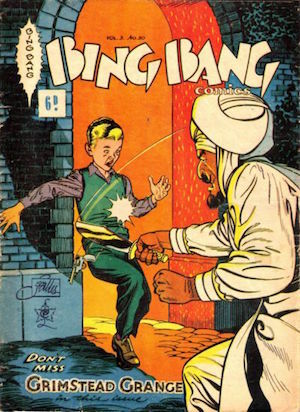 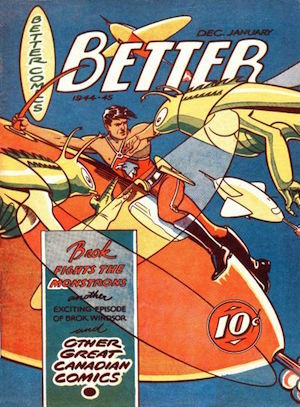 The next Canadian whites publisher was Bell Features in Toronto with Johnny Canuck, Nelvana, the Penguin and Thunderfist, etc. 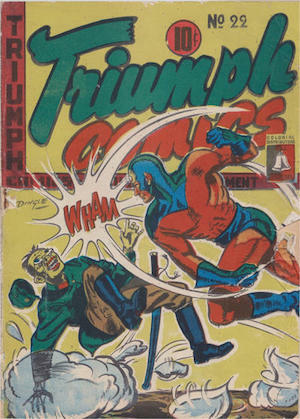 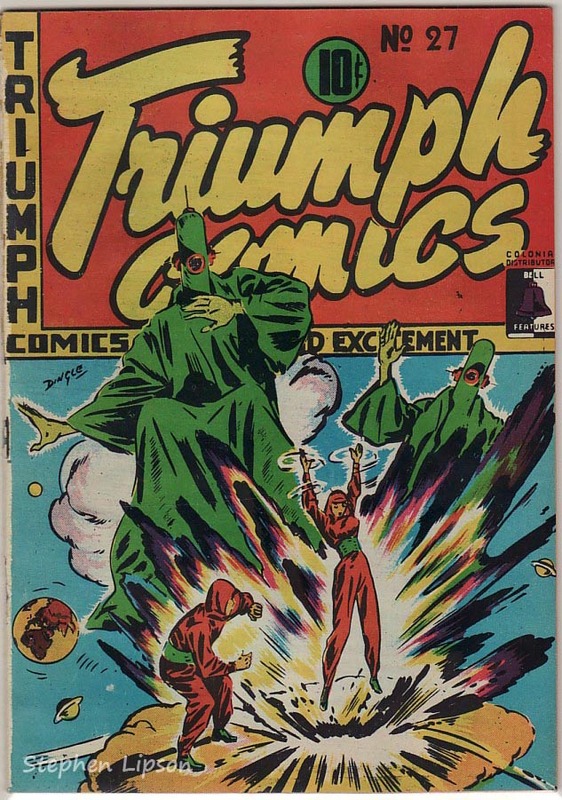 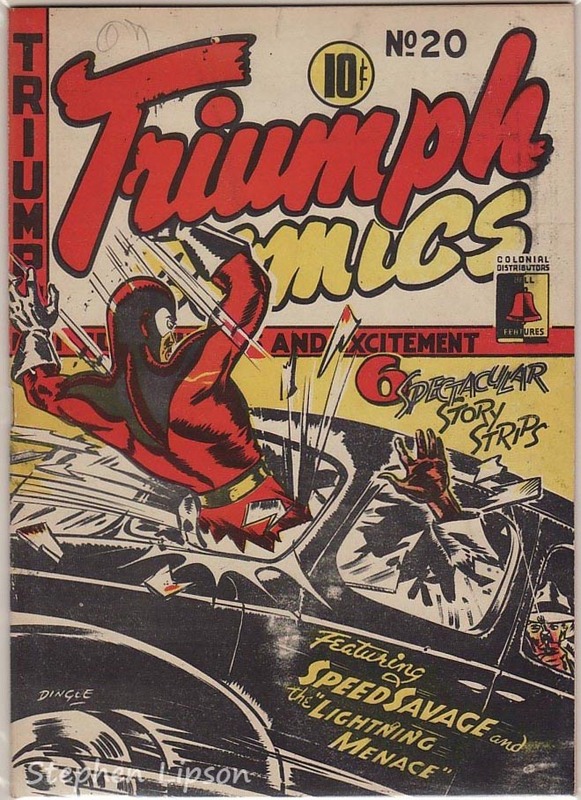 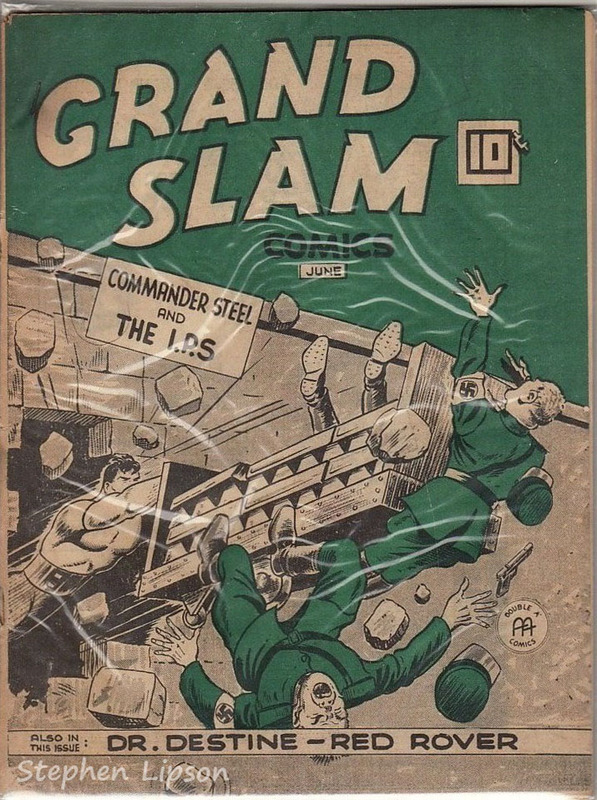 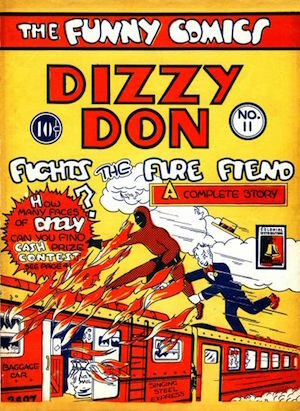 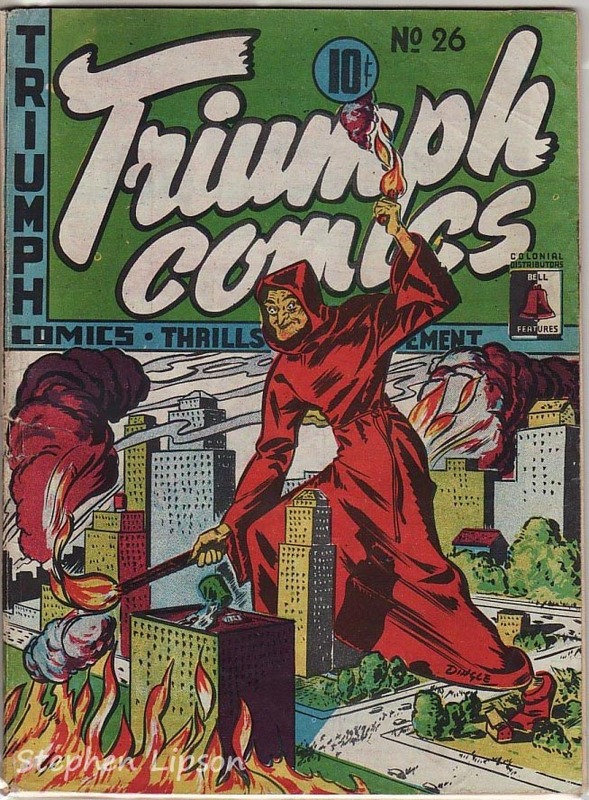 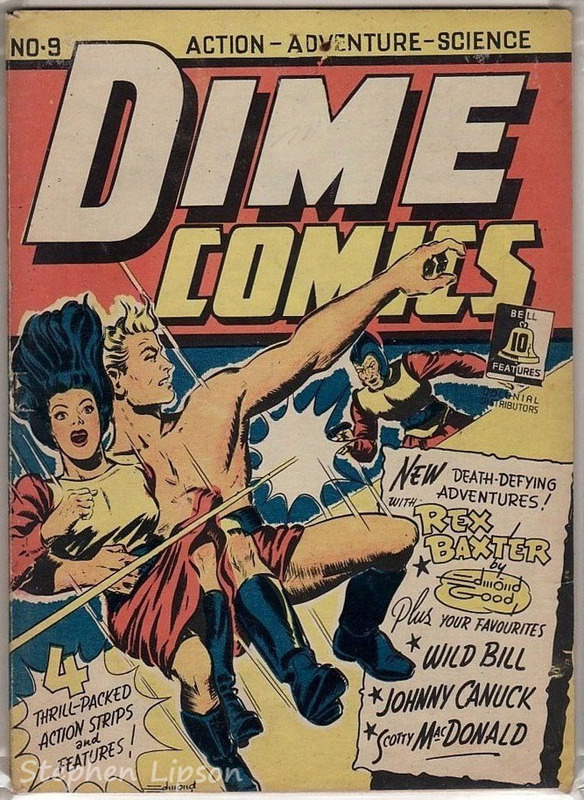 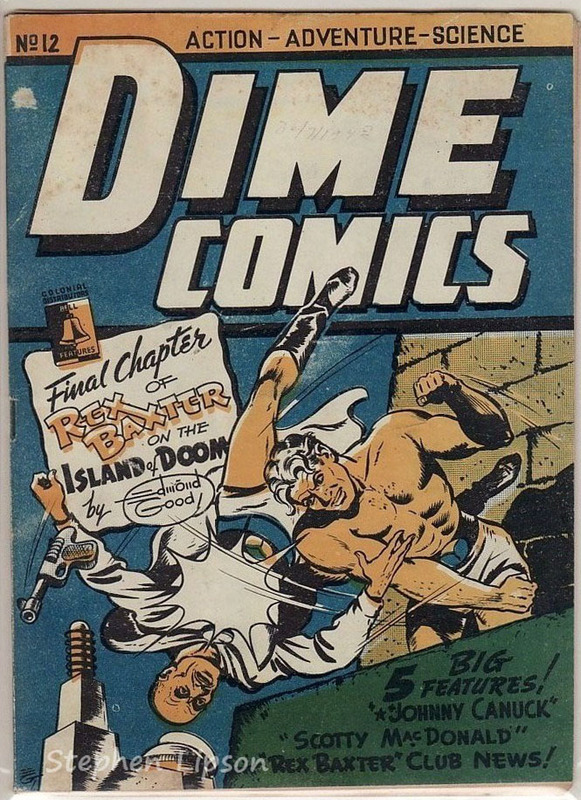 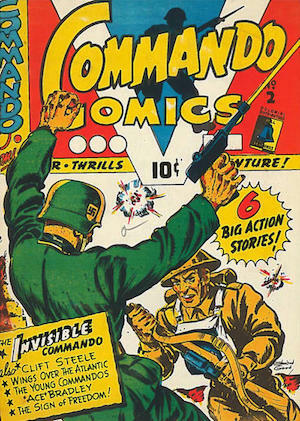 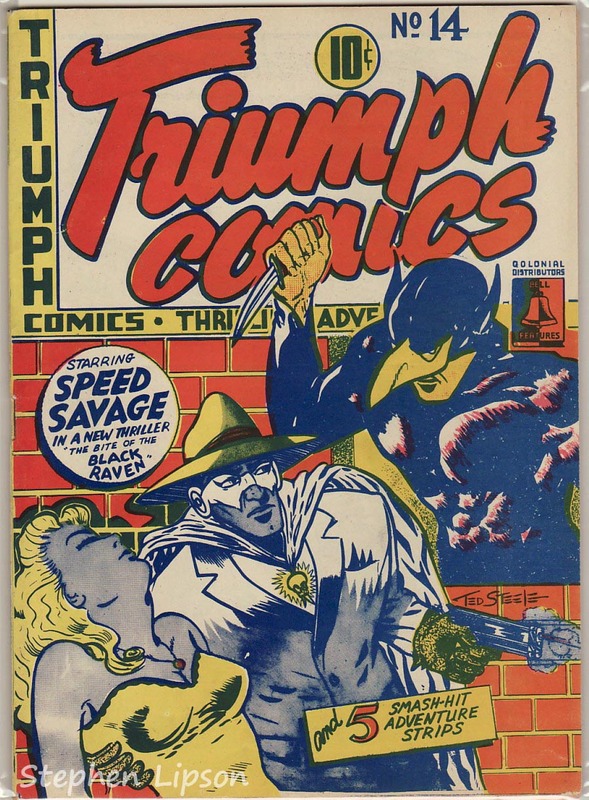 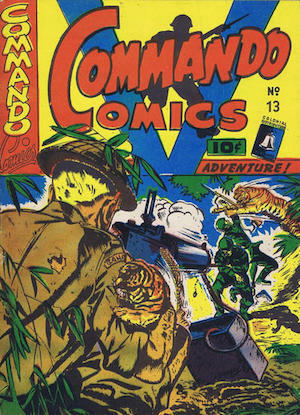 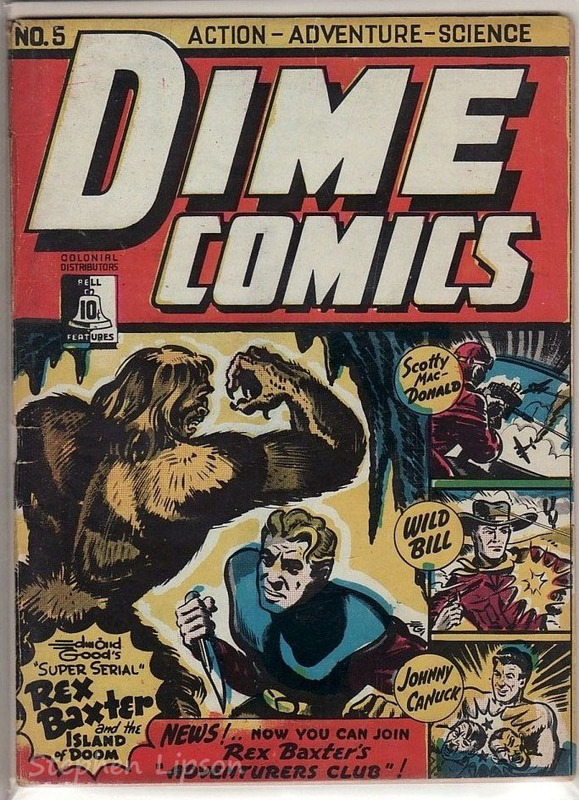 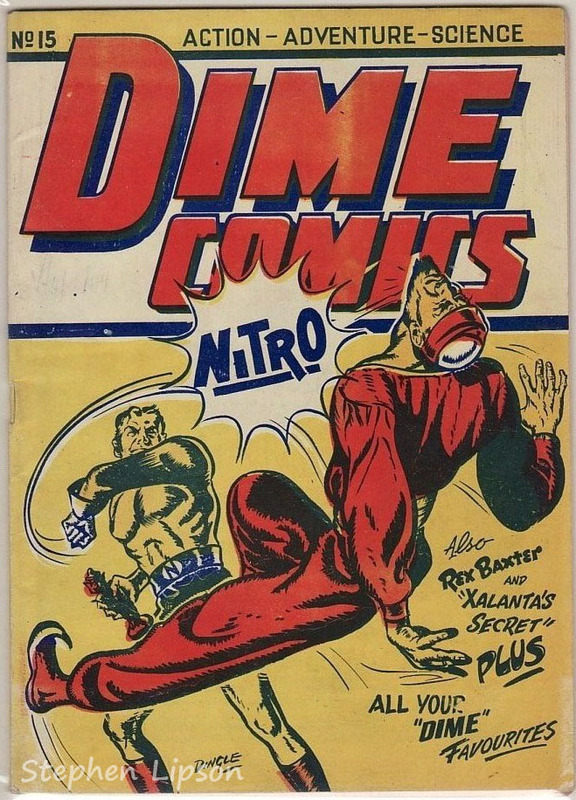 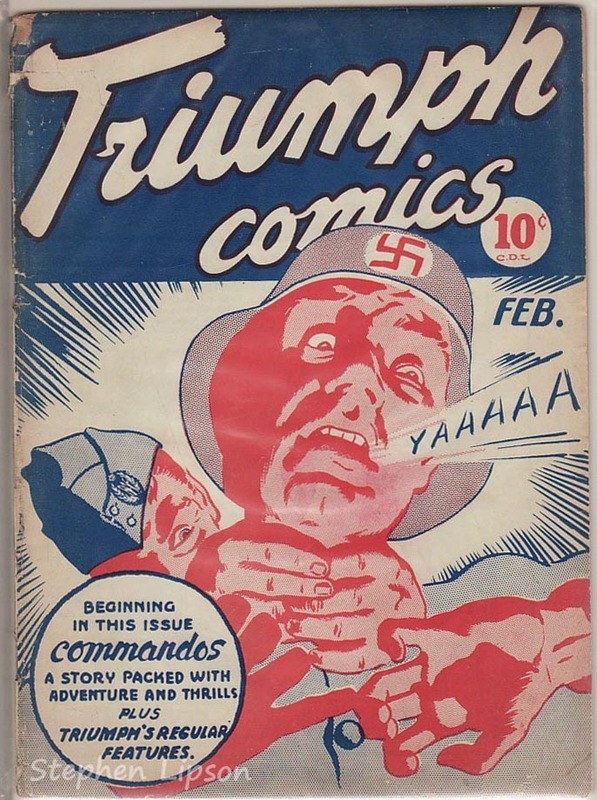 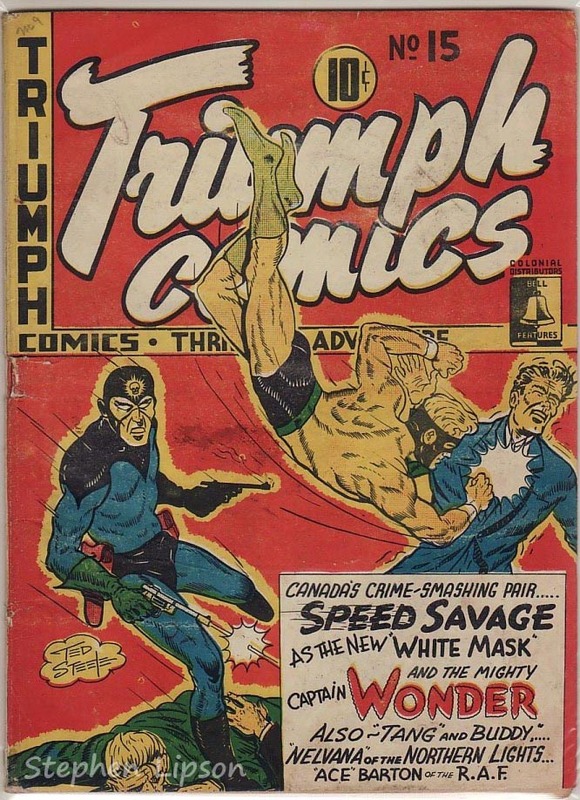 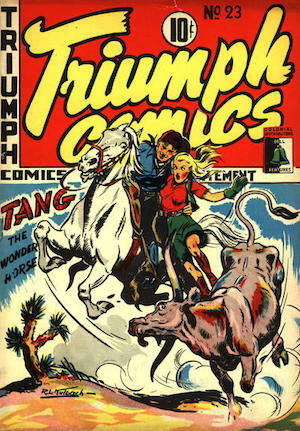 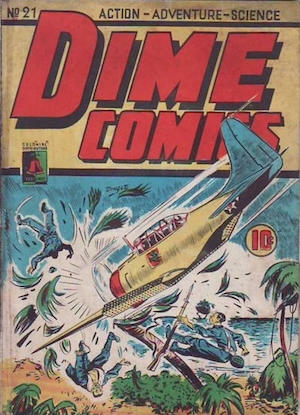 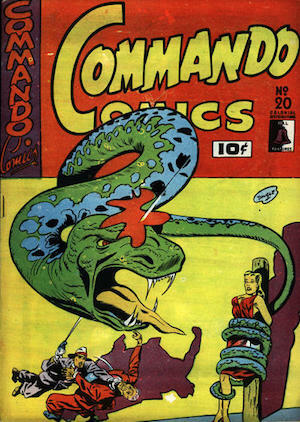 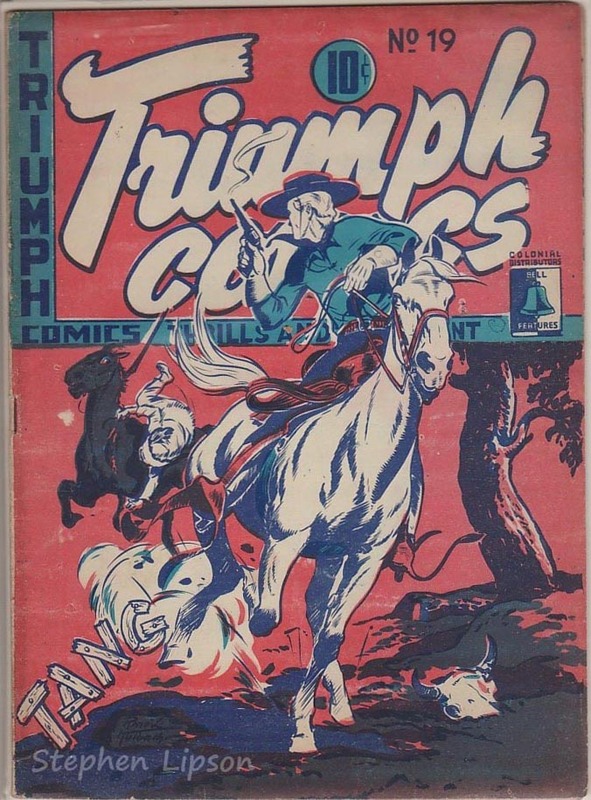 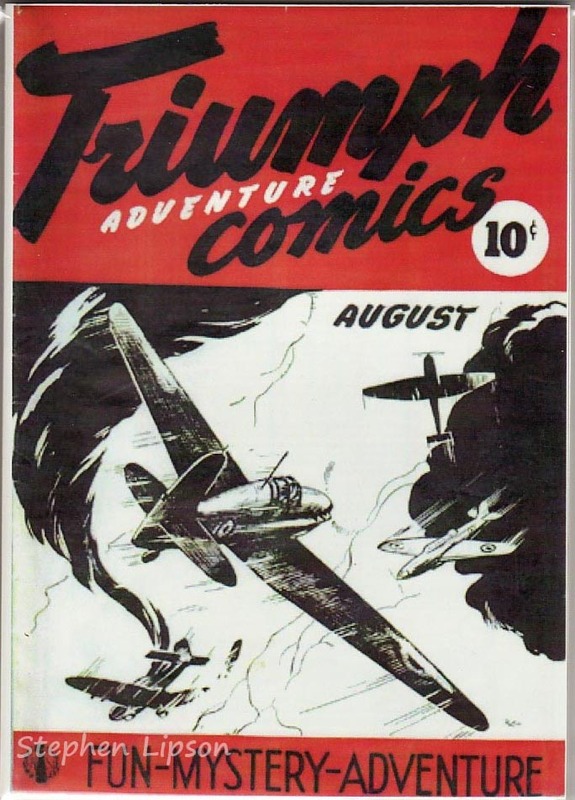 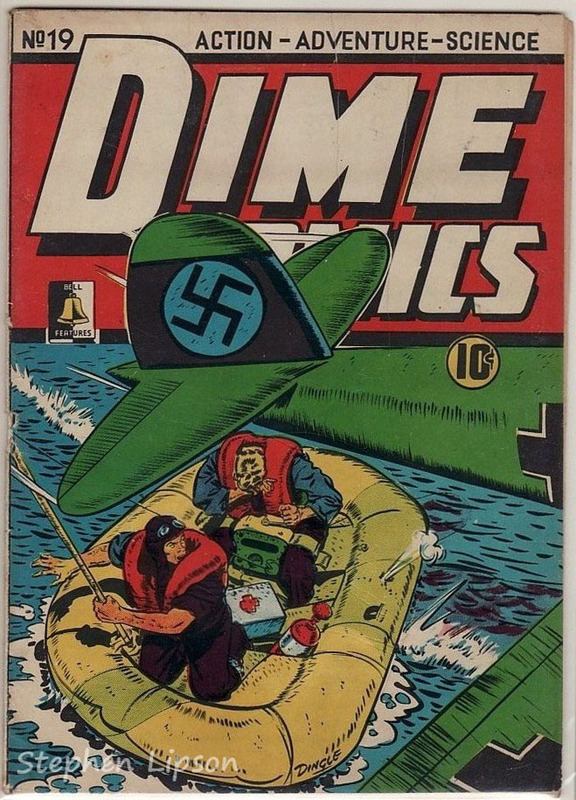 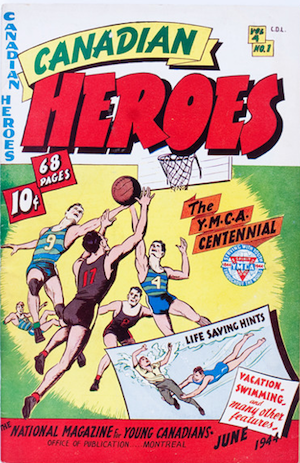 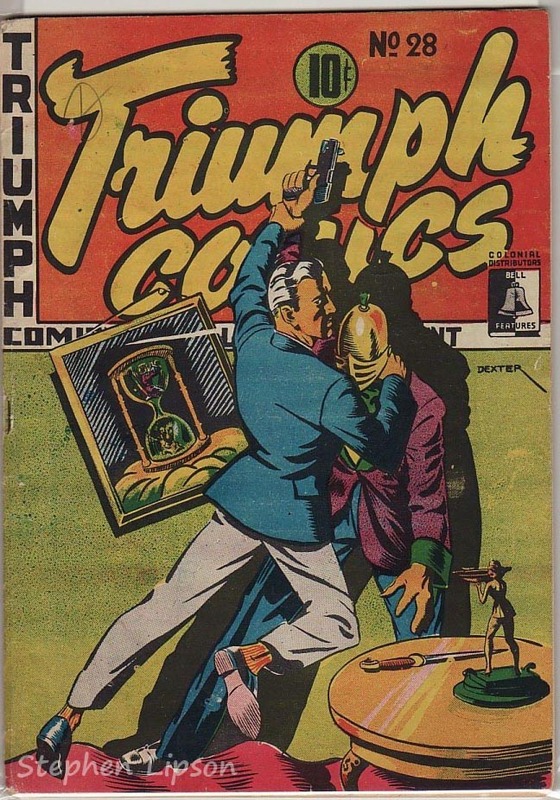 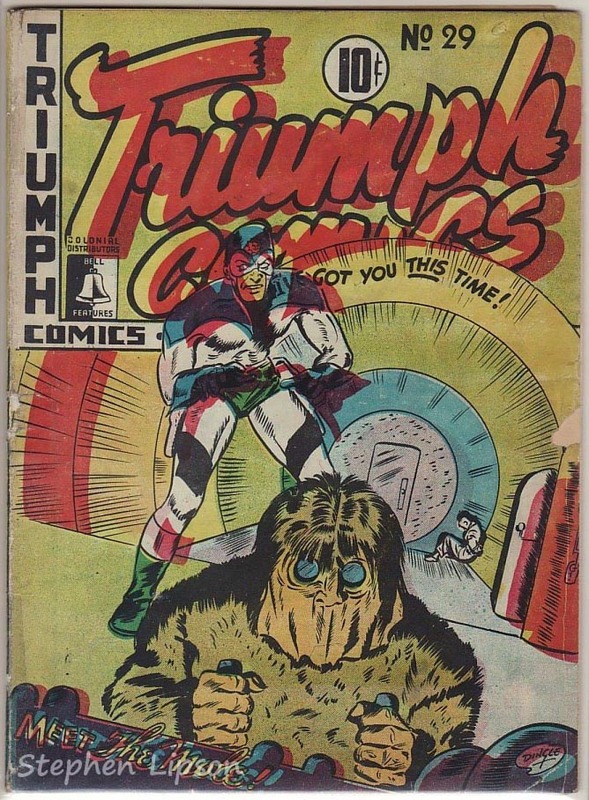 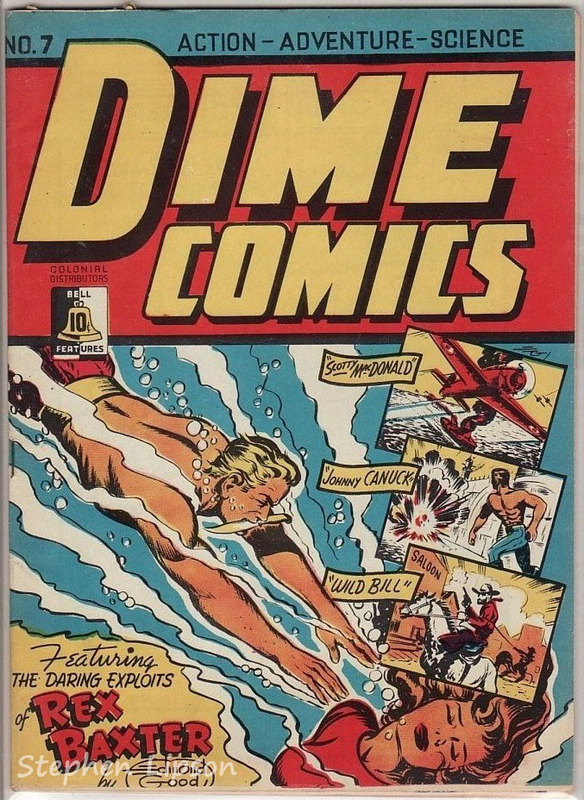 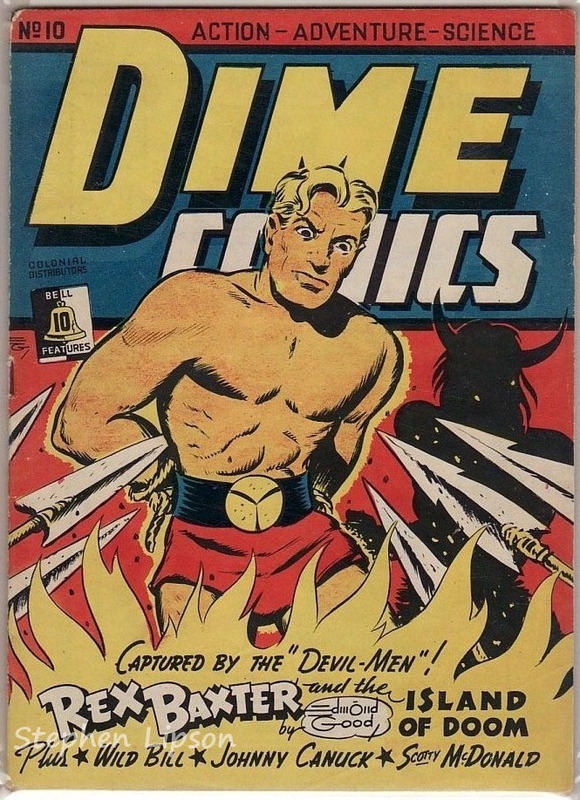 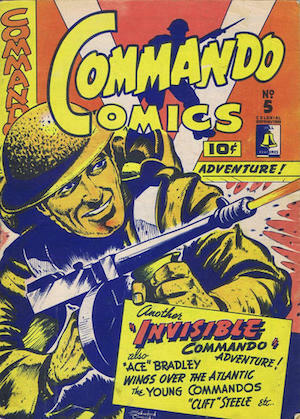 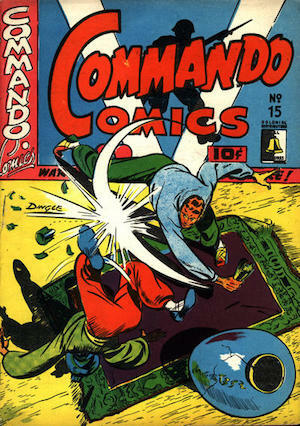 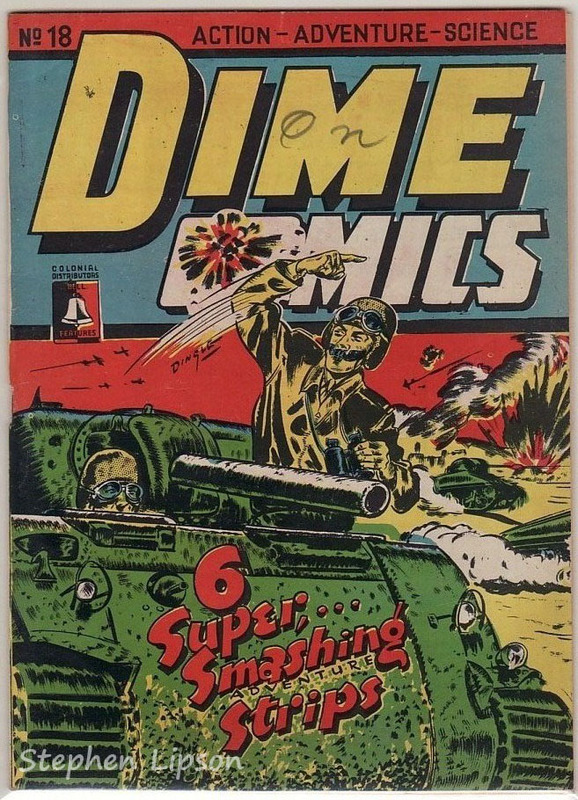 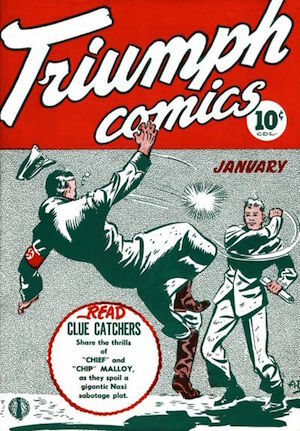 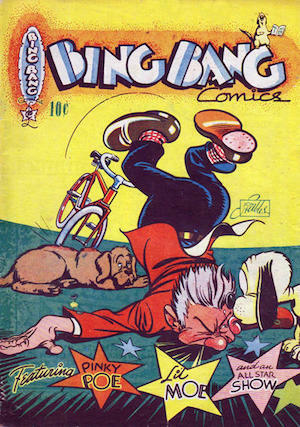 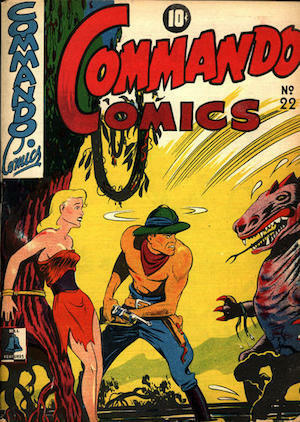 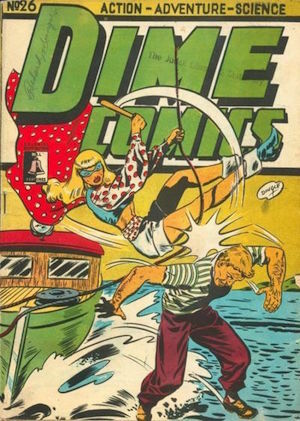 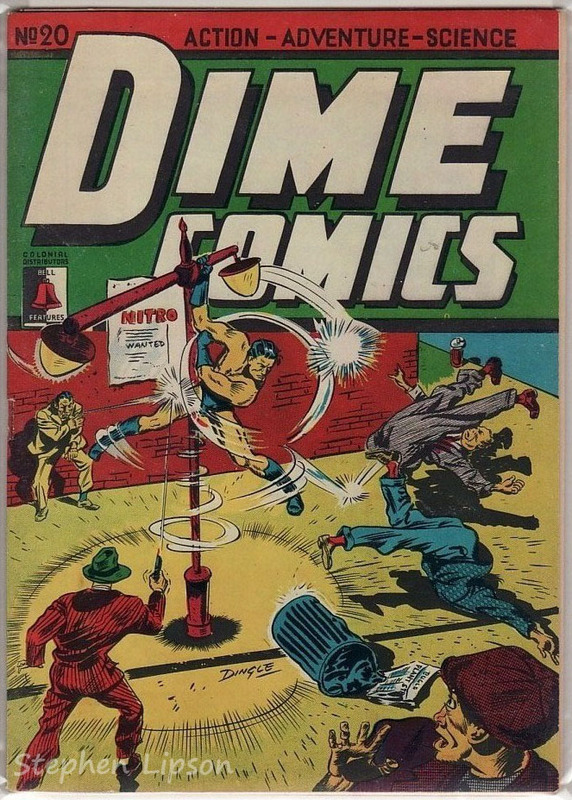 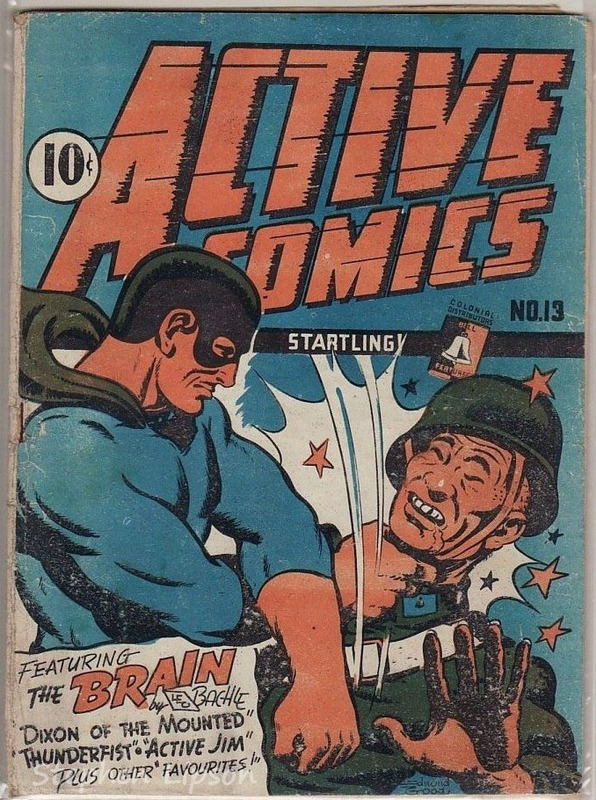 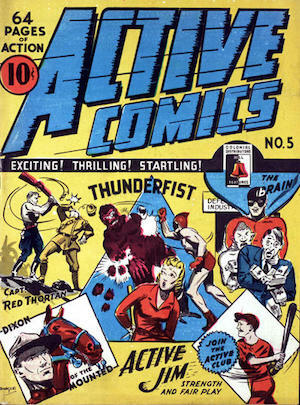 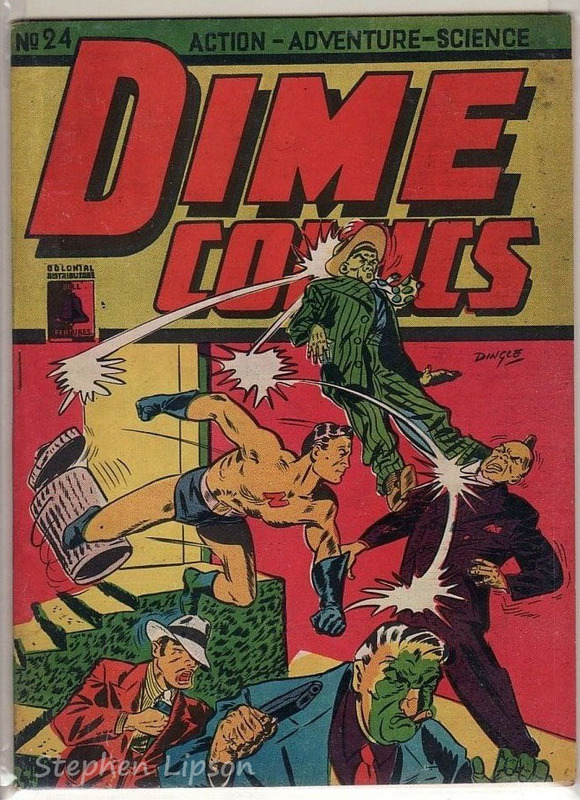 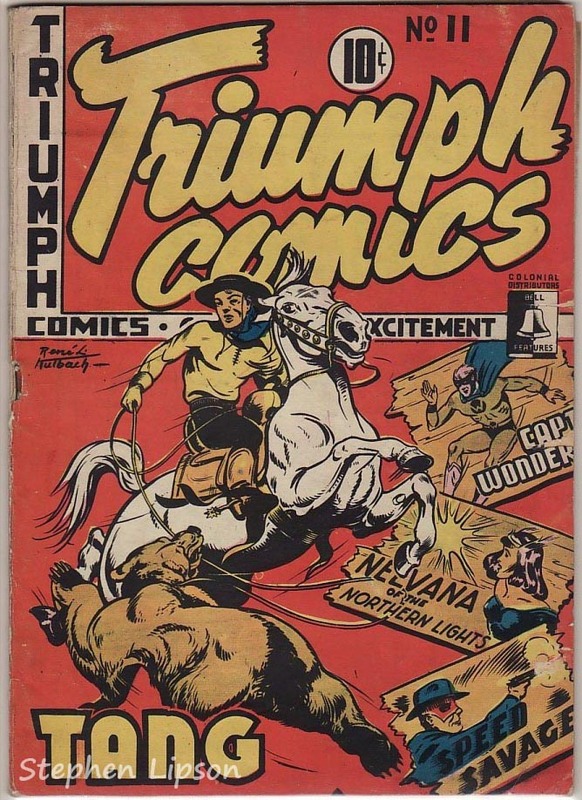 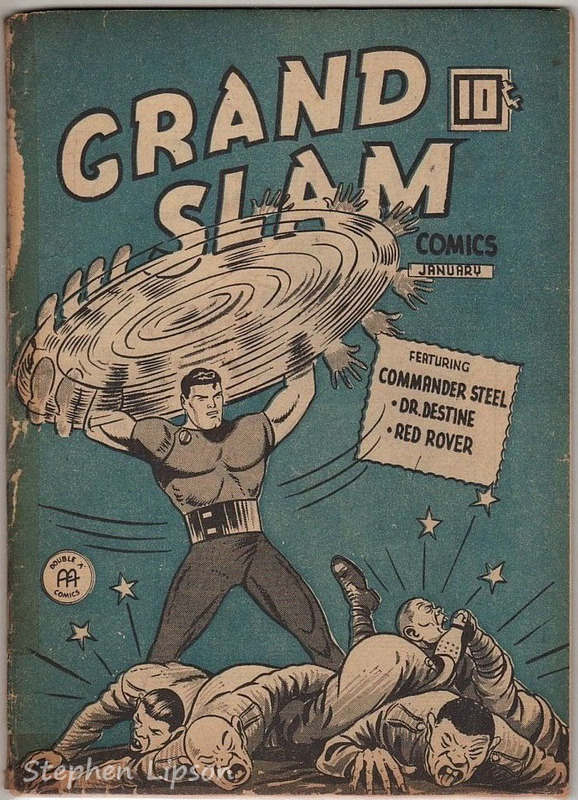 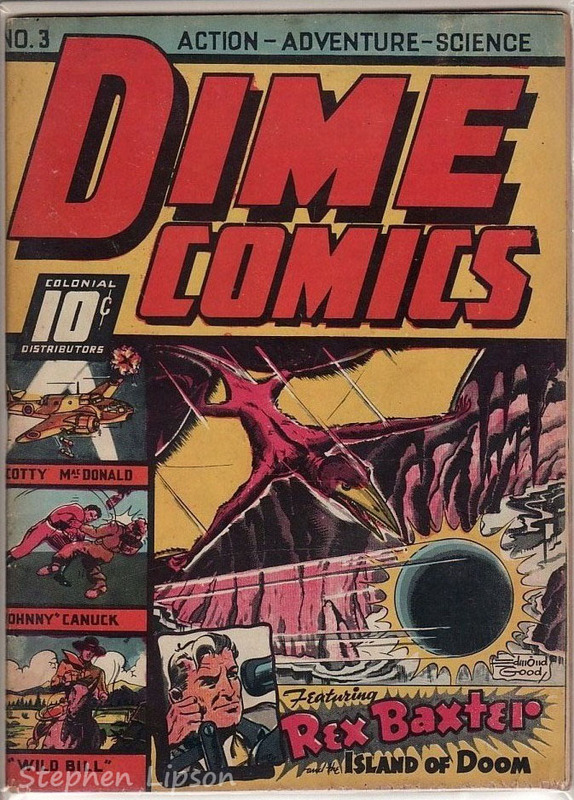 Their flagship titles included Dime Comics, Triumph Comics, Active Comics, and Commando Comics. 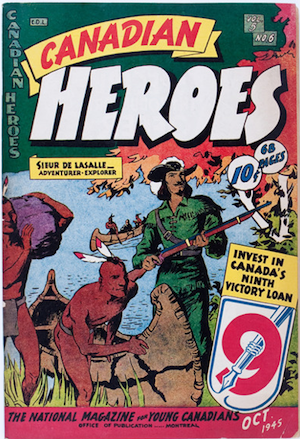 Finally, Educational Projects out of Montreal, Quebec introduced Canada Jack in its flagship title, Canadian Heroes. 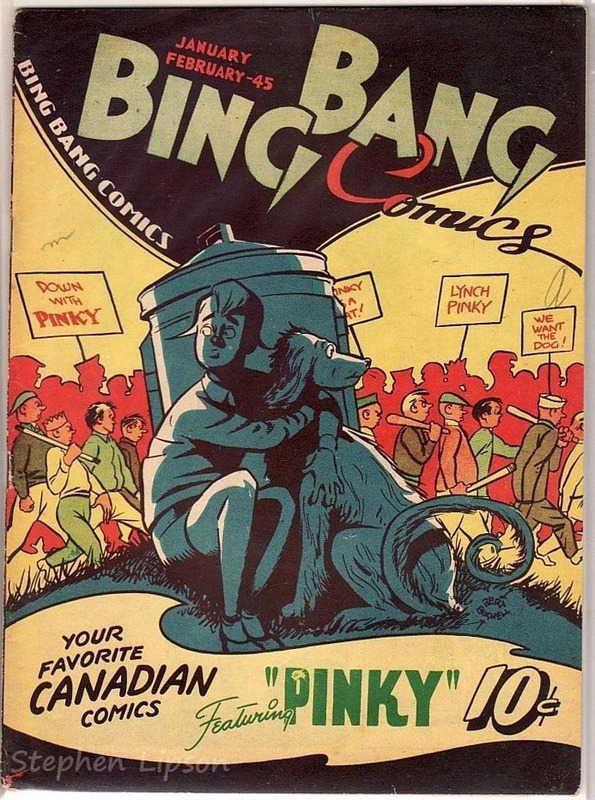 It is important to note that Canadian whites, these vestiges of Canadian pop culture, helped create a Canadian identity within their pages. 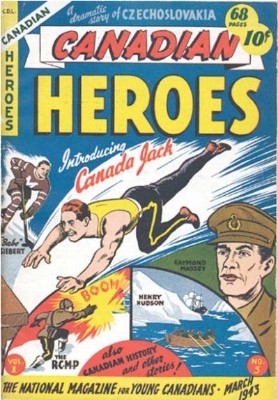 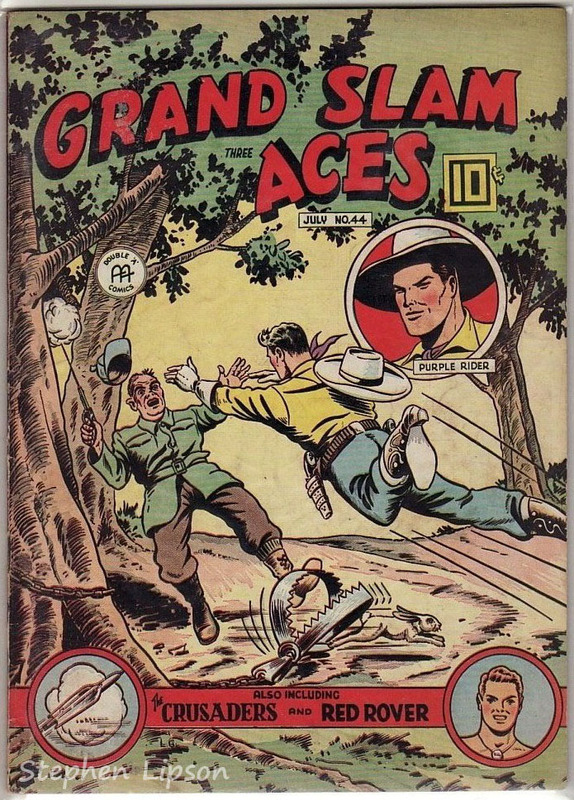 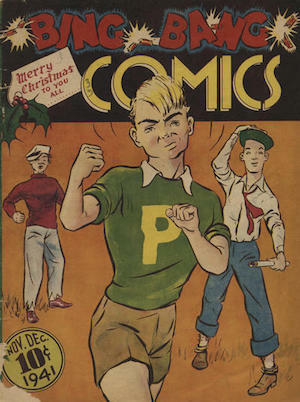 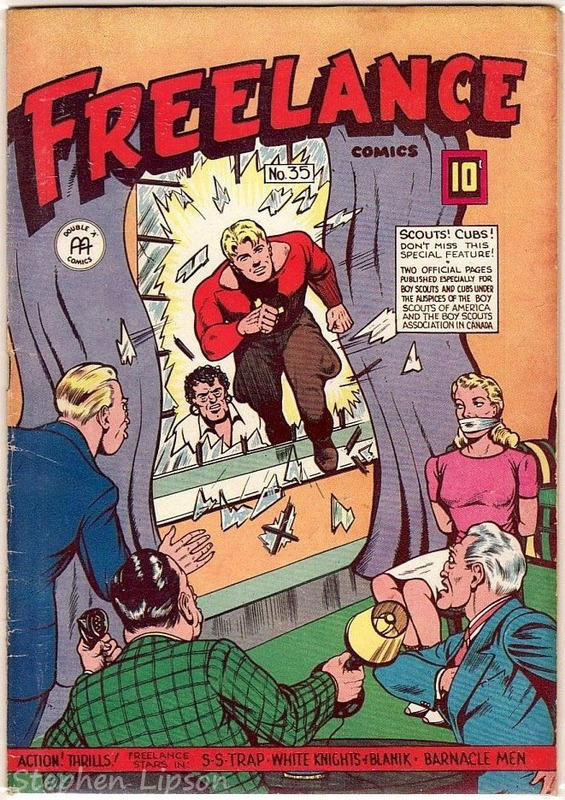 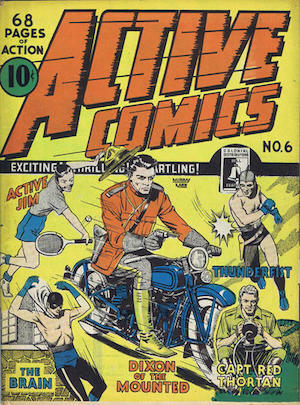 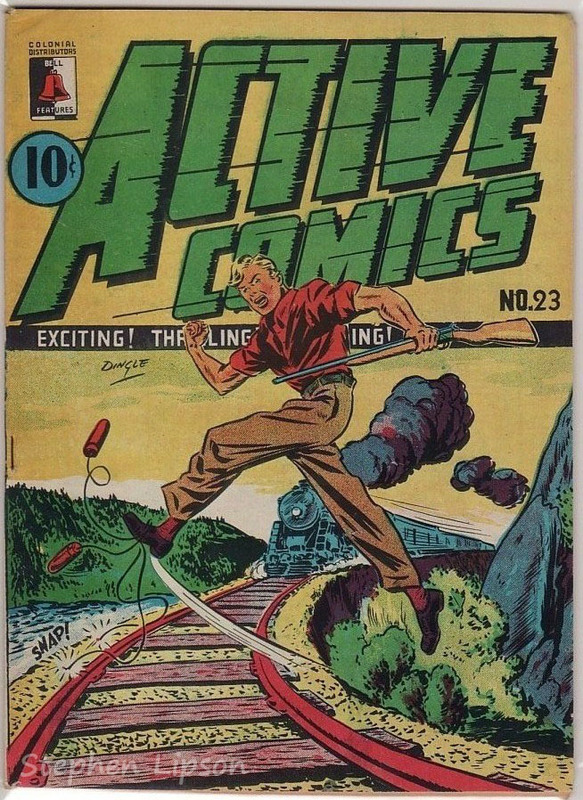 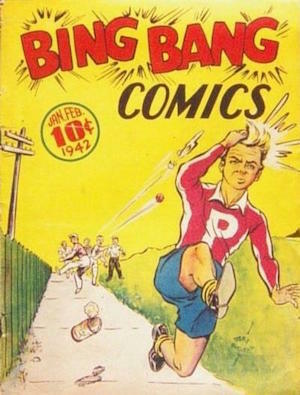 Canada Jack was an athlete that battled the 5th column saboteurs on the Canadian home front in Canadian Heroes comic books. 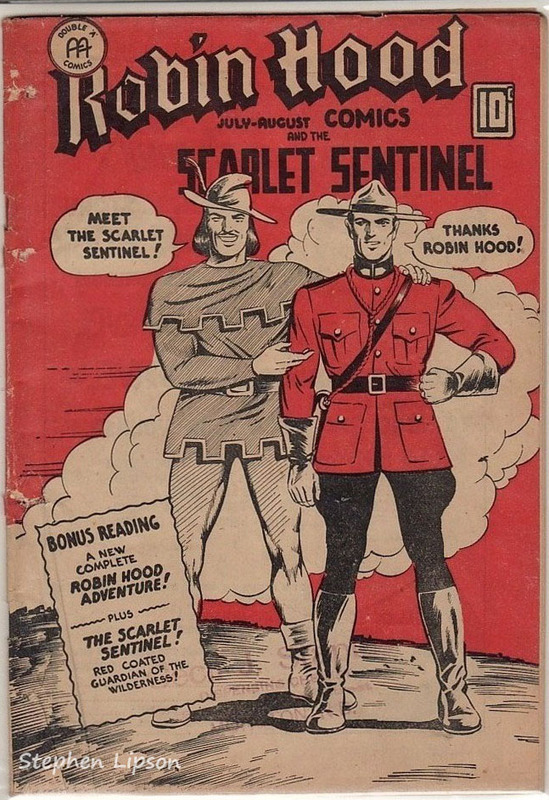 While he was not larger than life and not endowed with super powers, the Canadian youth of the Second World War at home could emulate and subsequently identify with Canada Jack in the Canadian whites he appeared in. 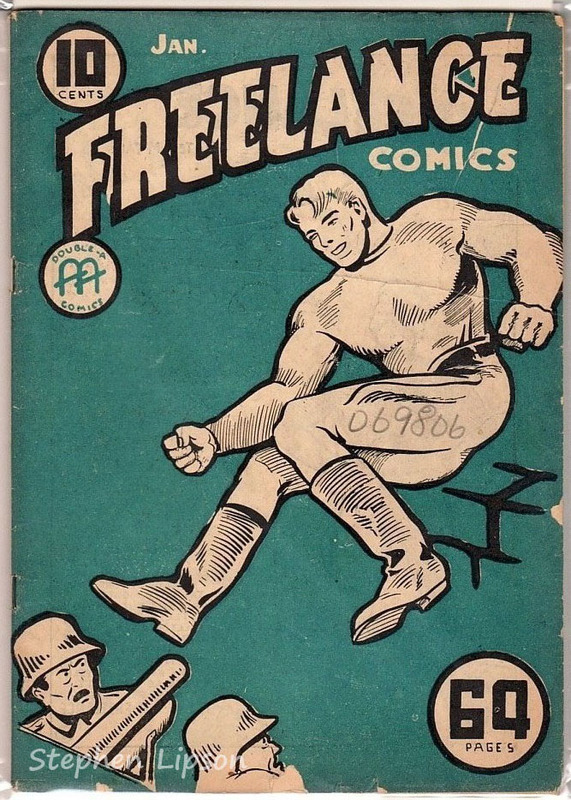 This sort of homegrown sentiment could also be likened to Johnny Canuck, who while also was not larger than life, helped smash the Axis abroad, including Hitler. 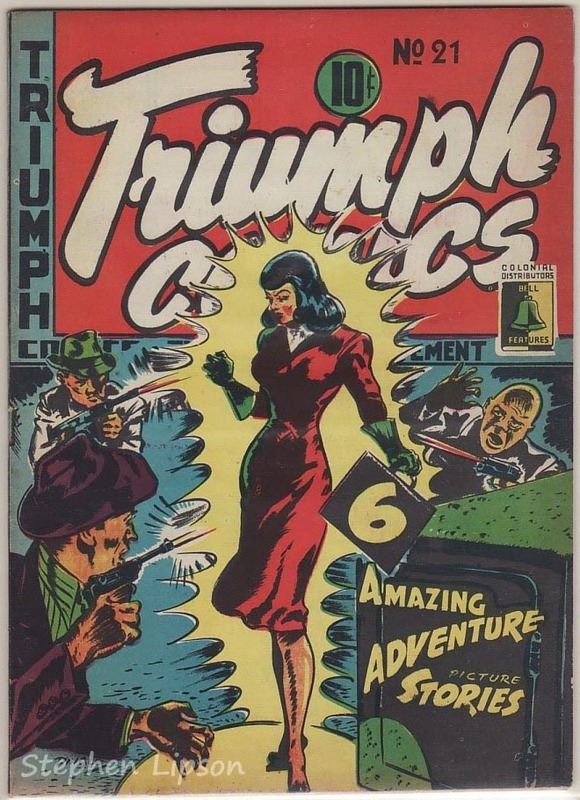 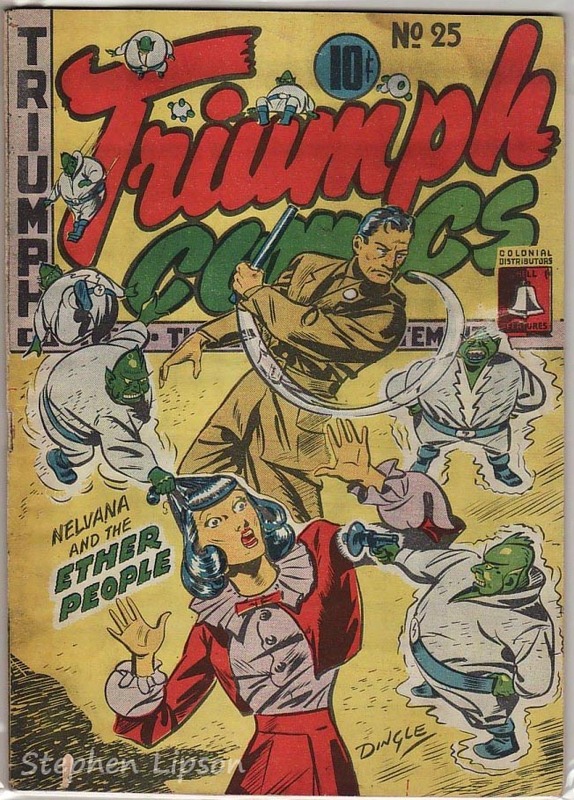 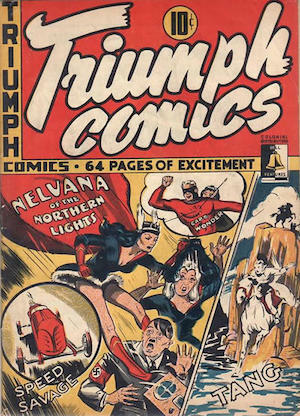 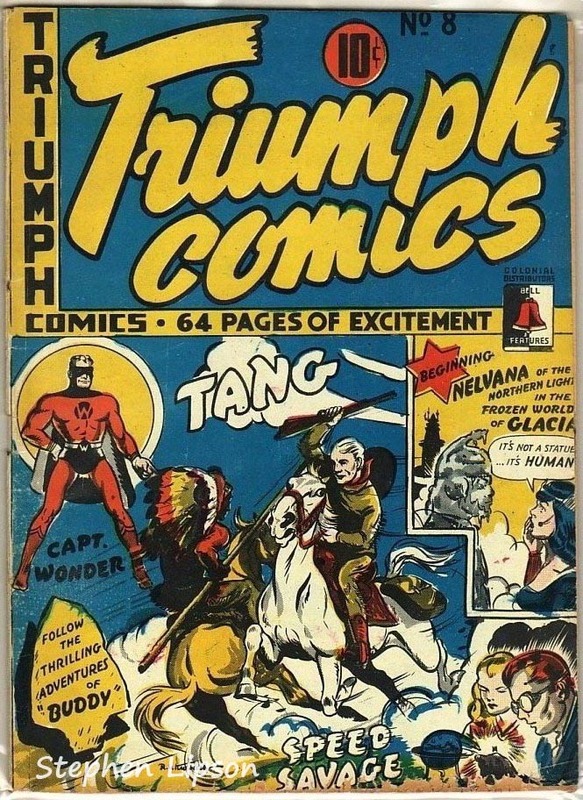 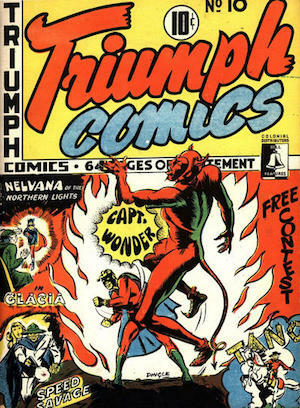 Nelvana was the first superhero with a Canadian national identity, and graced the pages of Triumph Comics. 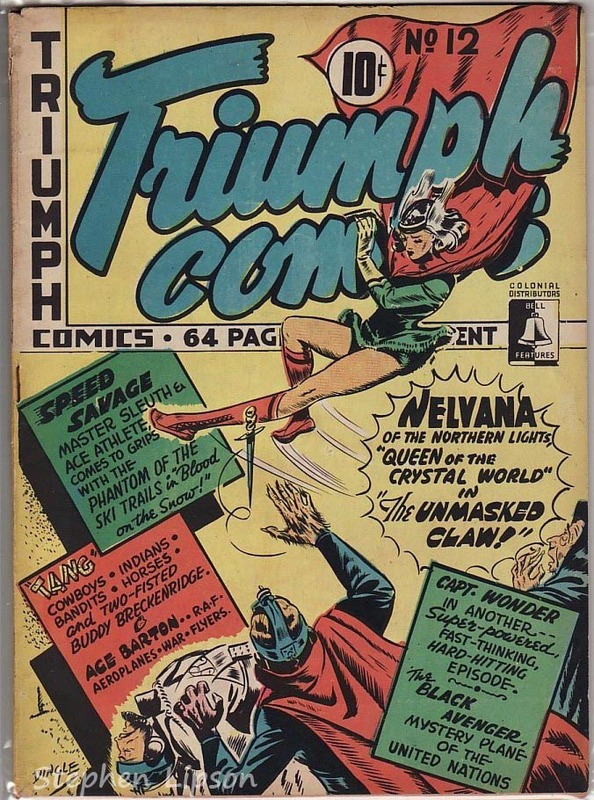 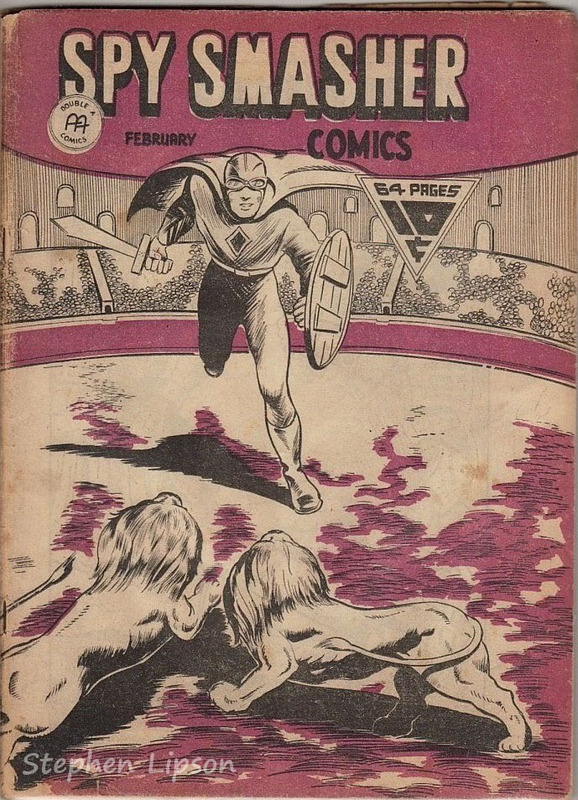 In fact, Nelvana pre-dated Wonder Woman by almost four months! 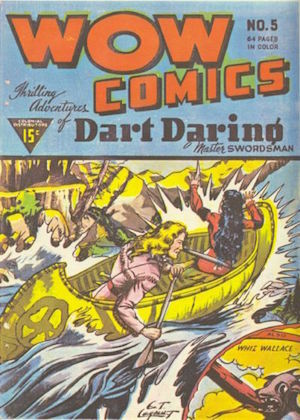 She came to aid of the indigenous peoples of the North West Territories in her early appearances, and could fly along the Aurora Borealis. 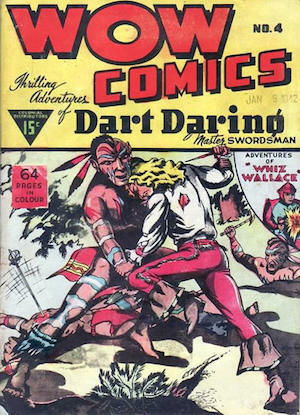 Sadly, the War Exchange Conservation Act was repealed in 1946, spelling the end of the Canadian whites era. 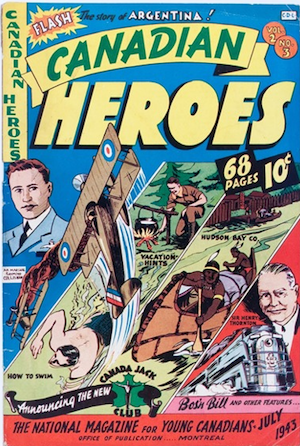 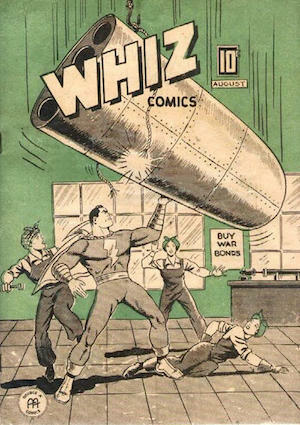 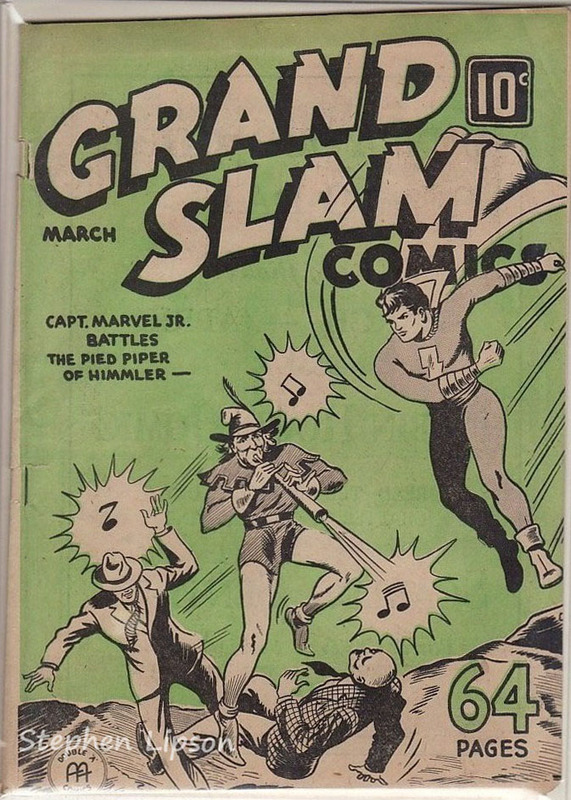 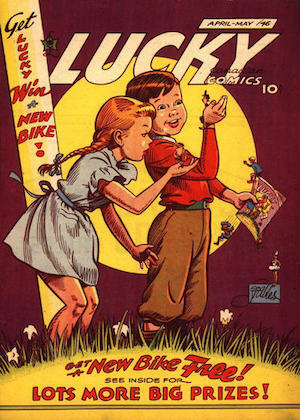 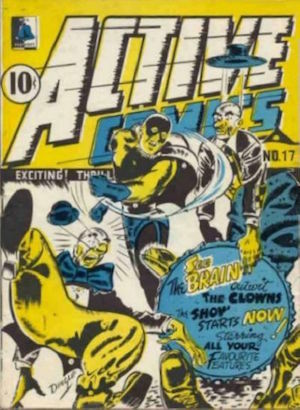 Subsequently, American comic books were allowed to be imported into Canada. 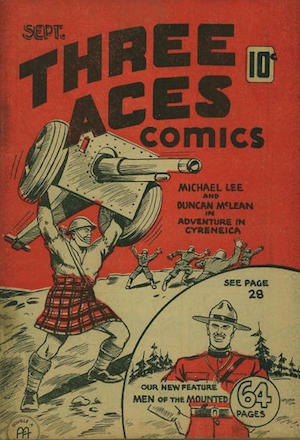 Captain America, Superman and their brethren replaced their Canadian counterparts in full colour for only a dime. 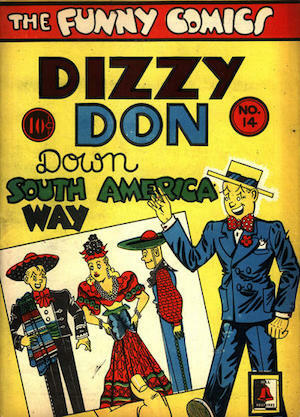 This ushered in the demise of the Canadian Whites, as the floundering industry could no longer complete. 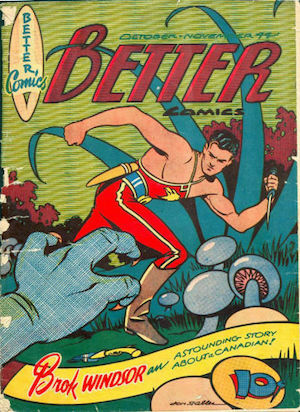 The last ditch efforts to produce Canadian homegrown comics in full color just did not stand up against their American predecessors. 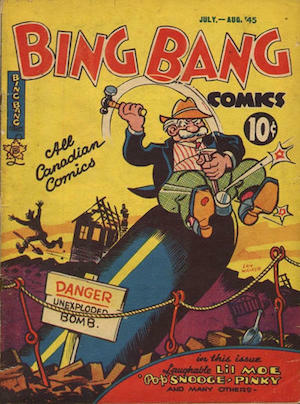 Subsequently, many of the publishing houses in Canada folded, including Anglo-American publishing, Maple Leaf Publishing, and eventually Bell Features. 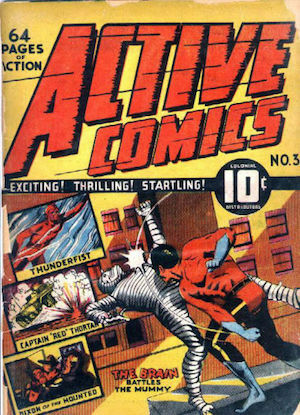 Value, Appraise, Insure or Sell Comic Books Here!